 taken from my other artists' resp. 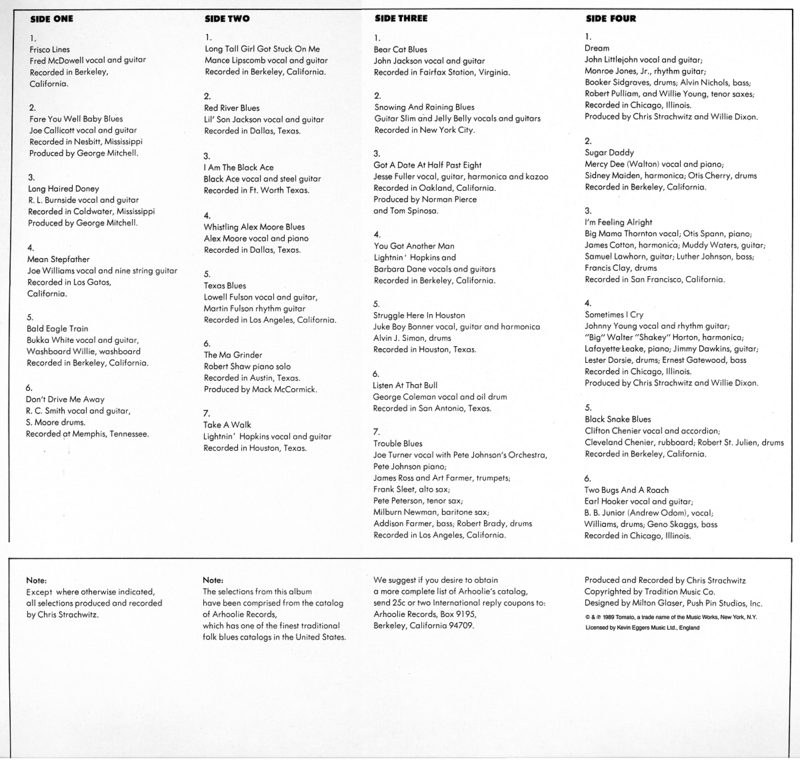 labels' discographies !!! 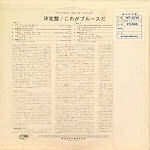 rec. 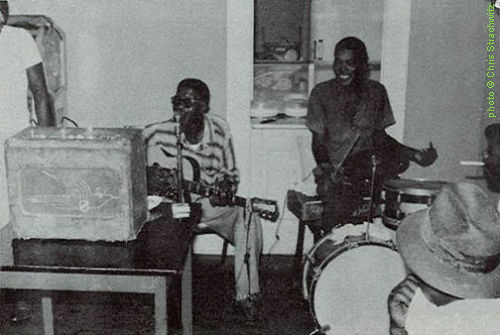 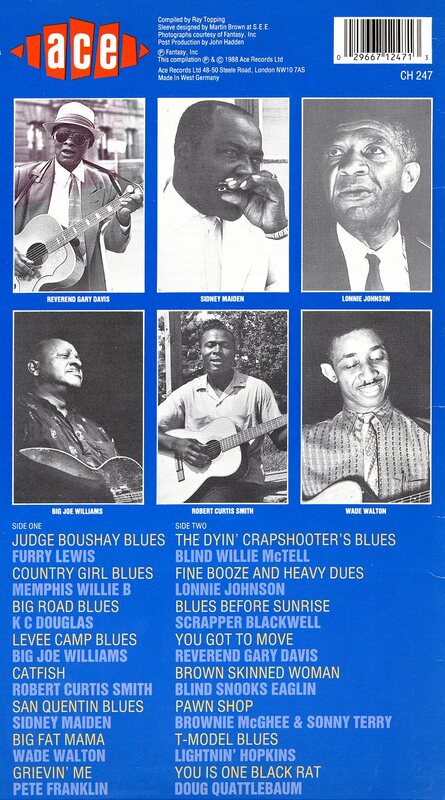 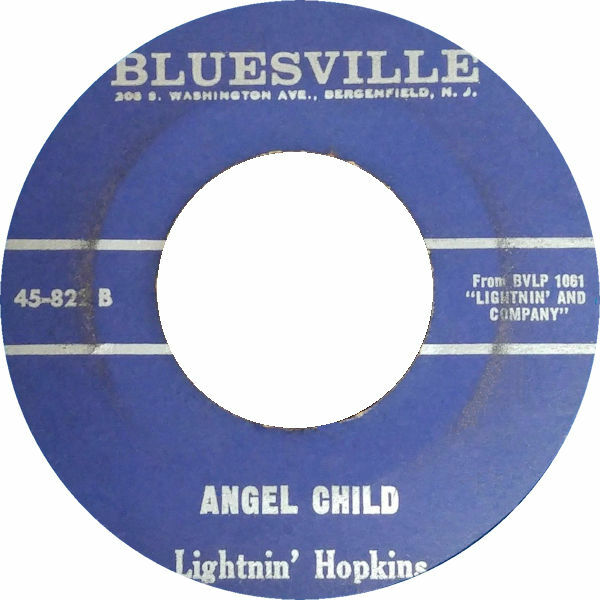 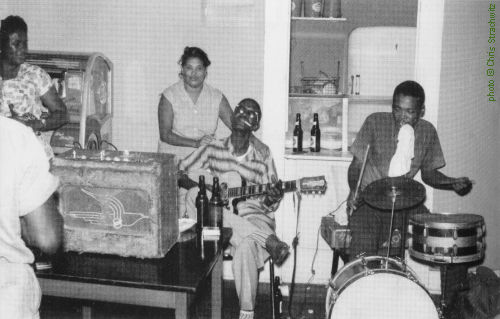 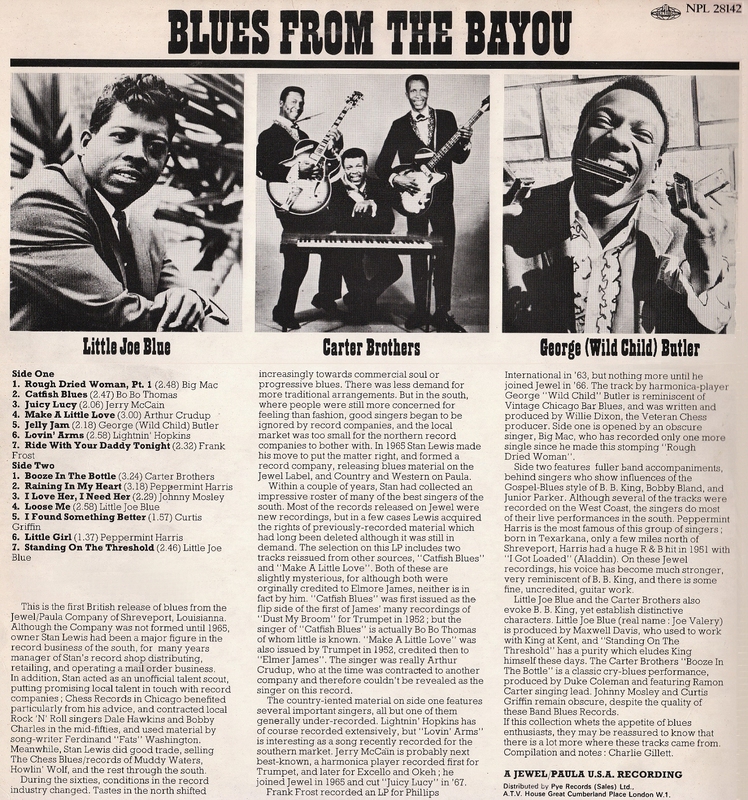 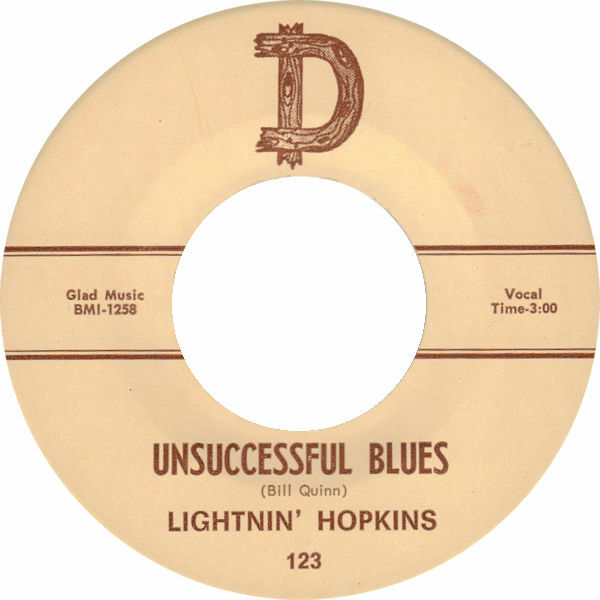 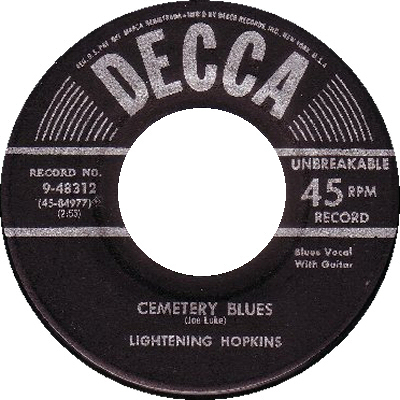 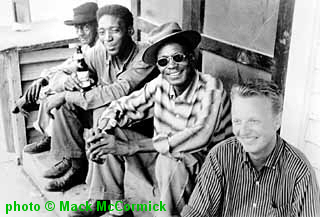 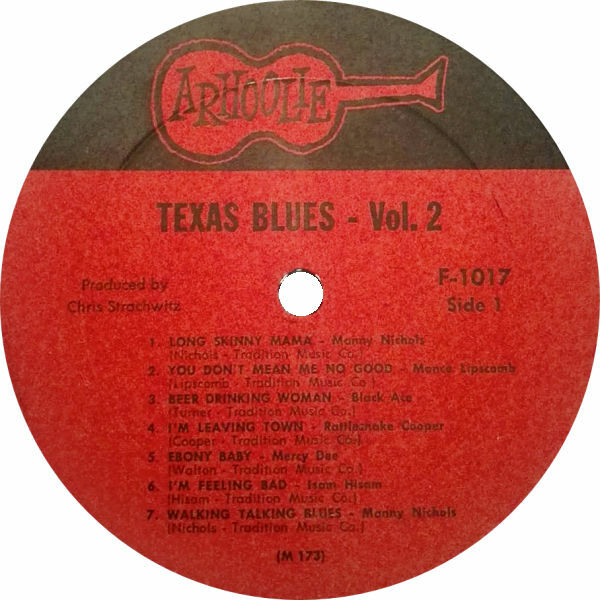 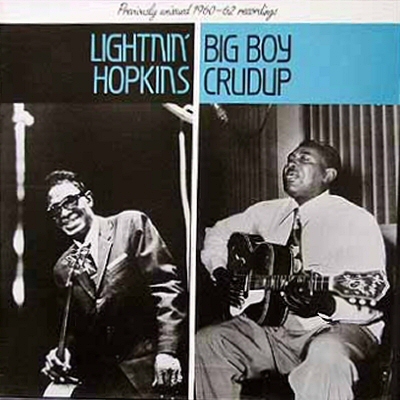 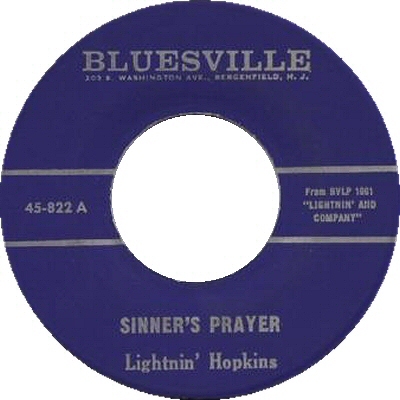 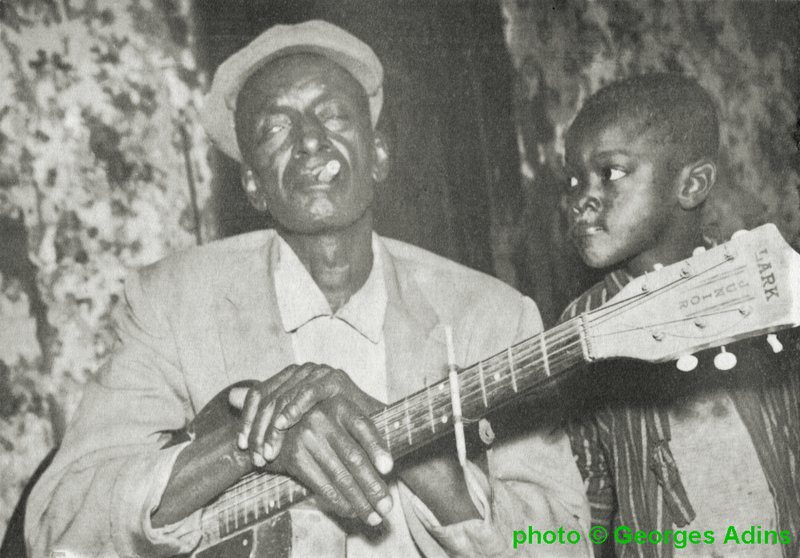 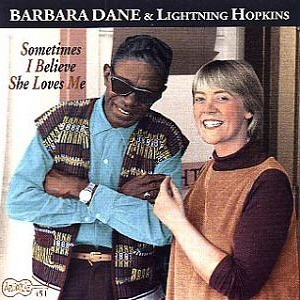 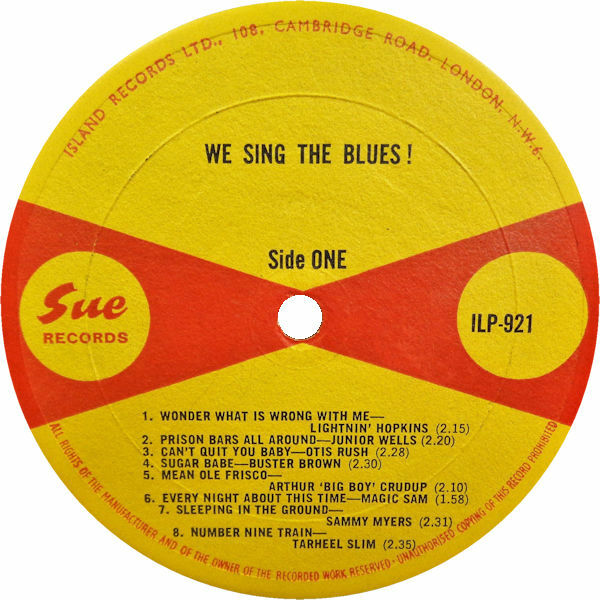 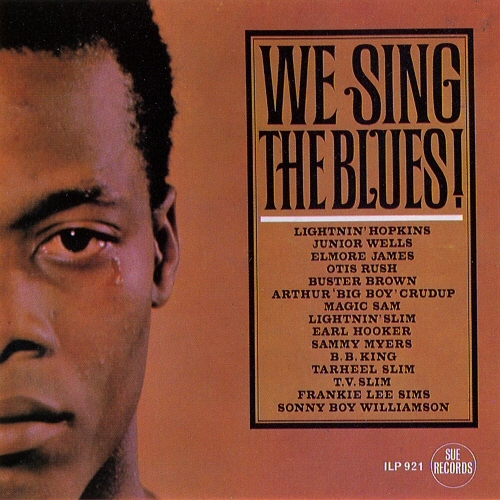 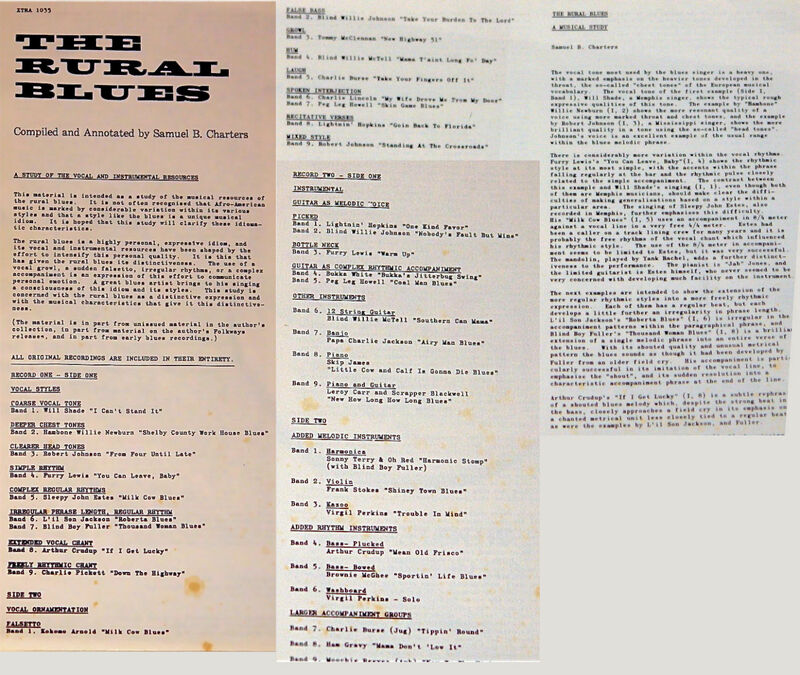 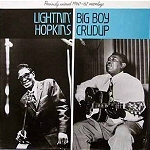 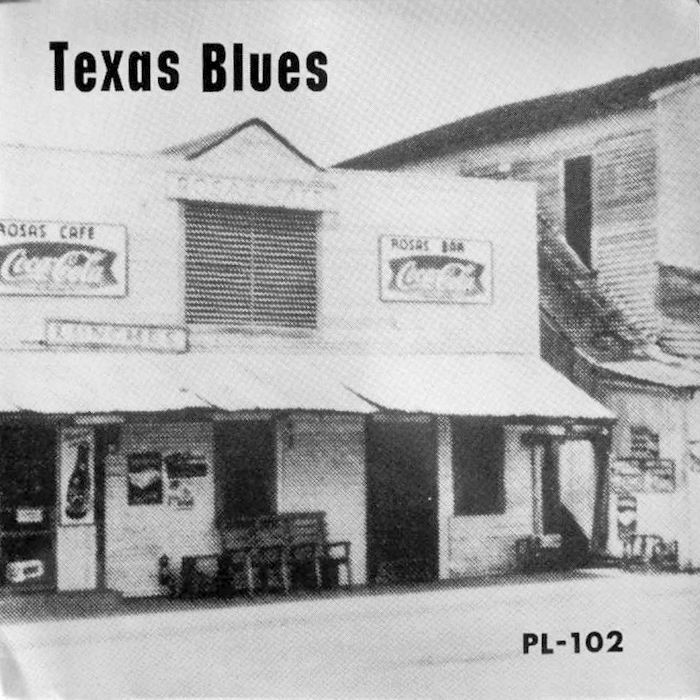 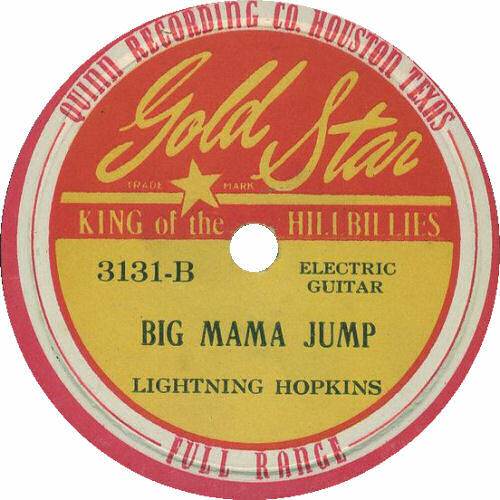 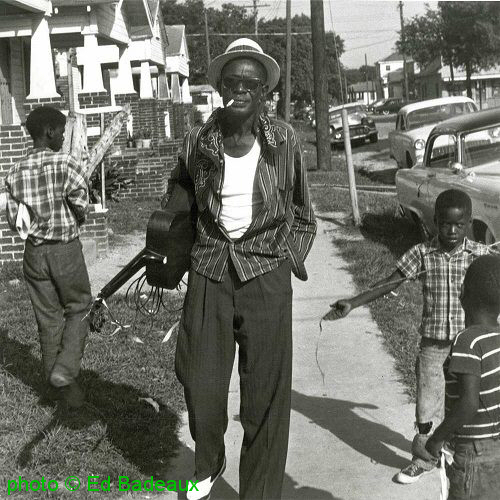 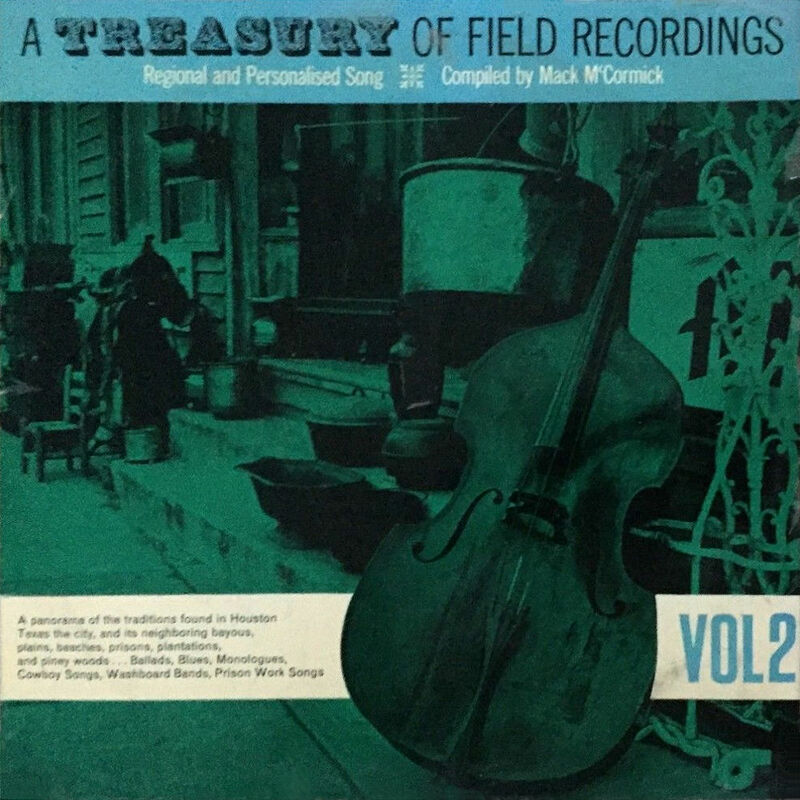 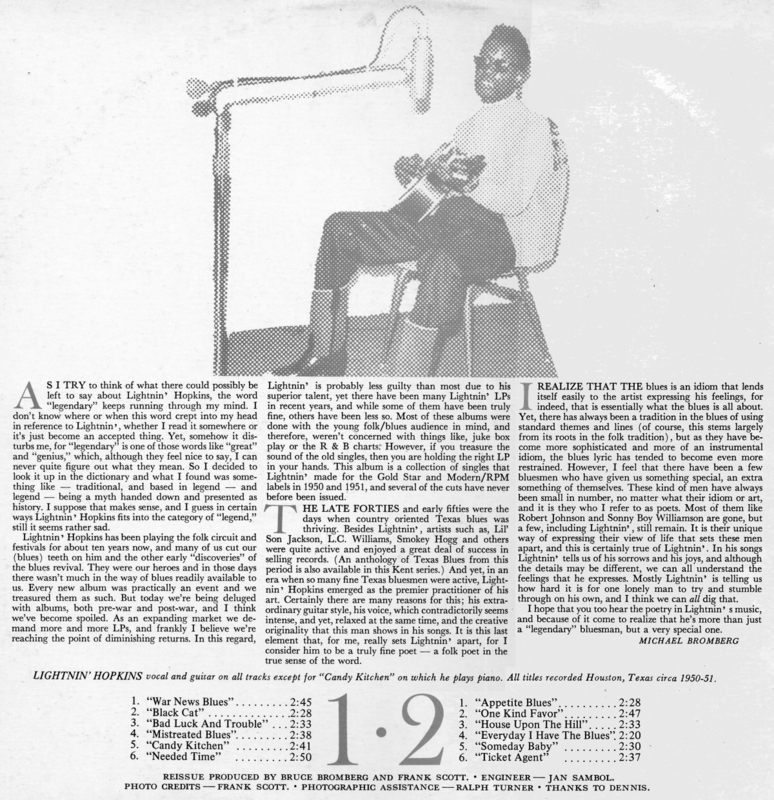 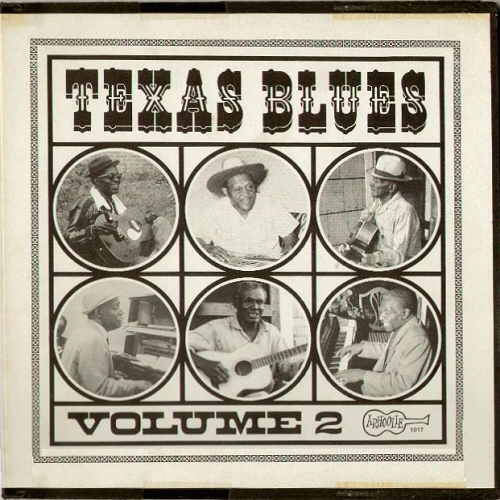 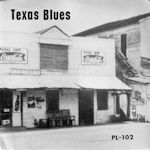 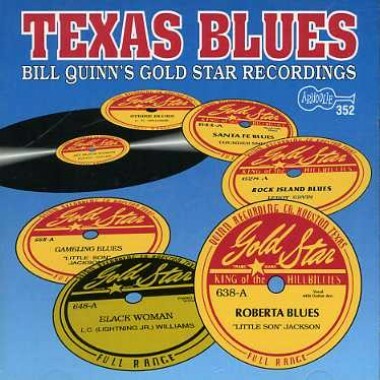 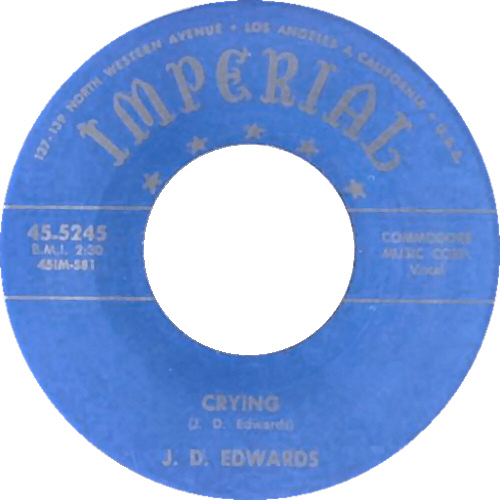 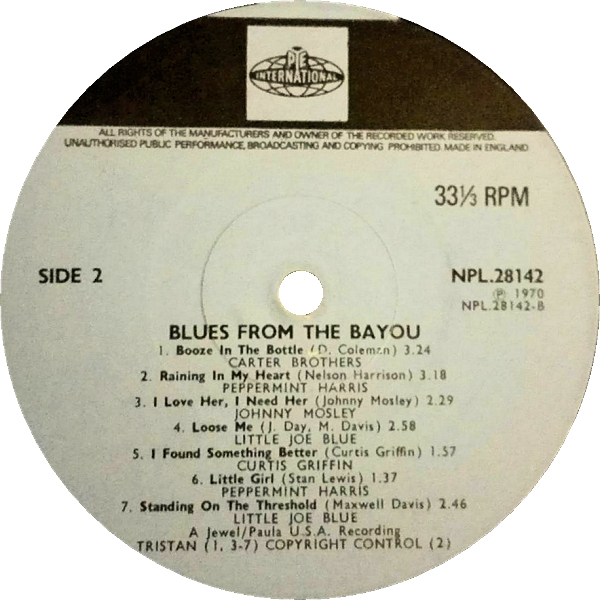 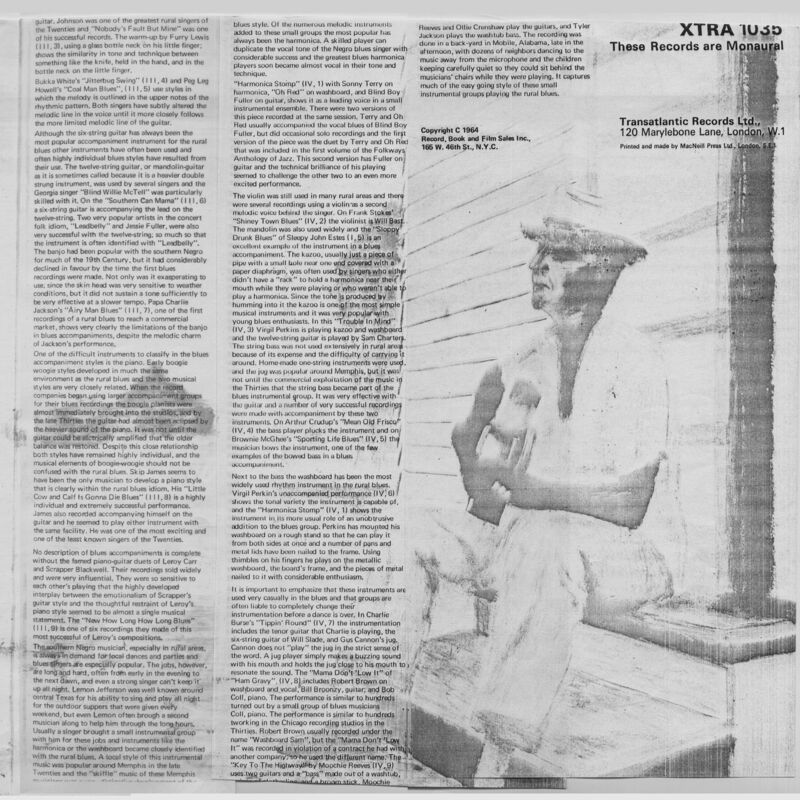 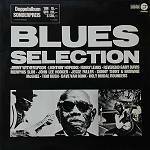 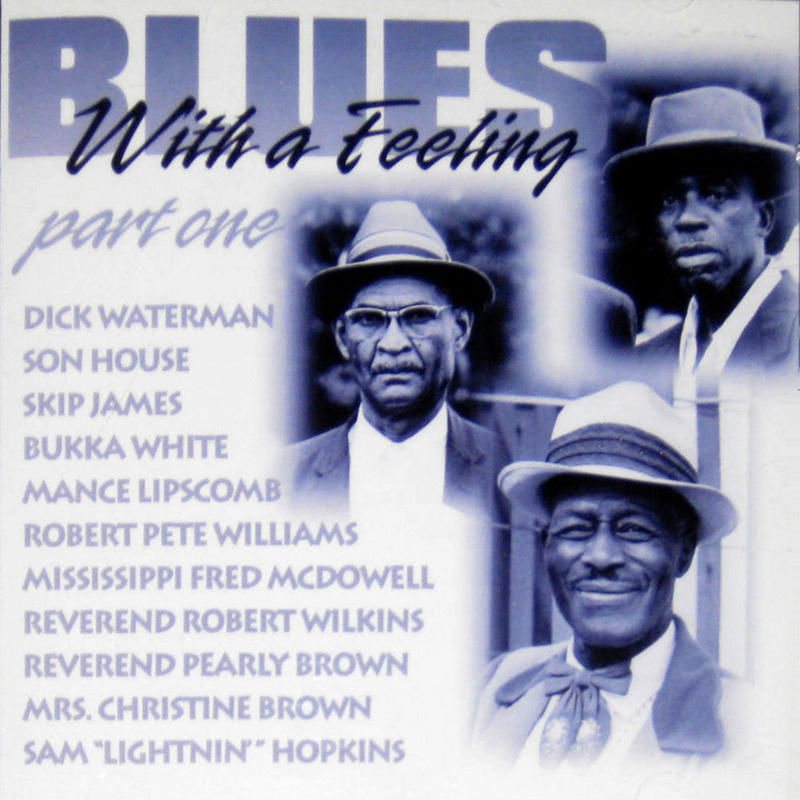 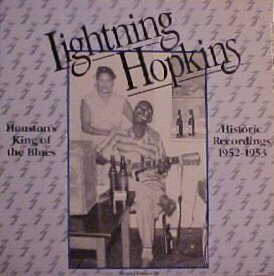 July 29, 1953 in Houston, TX; Lightnin' Hopkins, voc, g; Donald Cooks, b; Connie Kroll, dr; # dubbed "sobbing"
1 1955 Lightnin' Hopkins: Lightnin' And The Bluesresp. 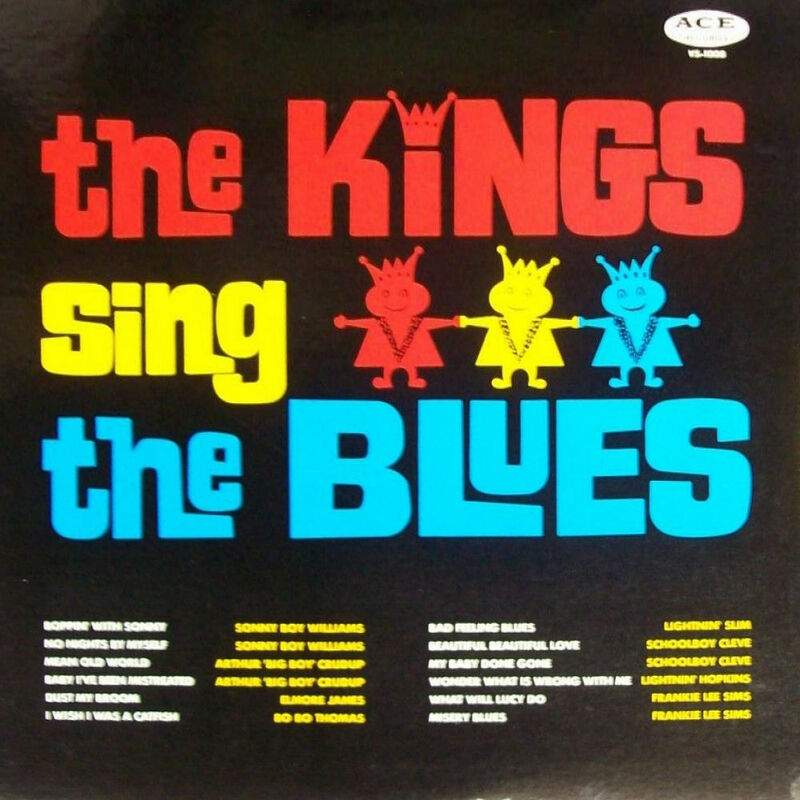 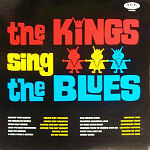 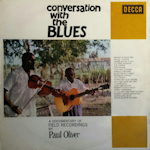 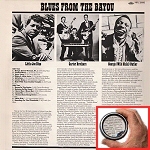 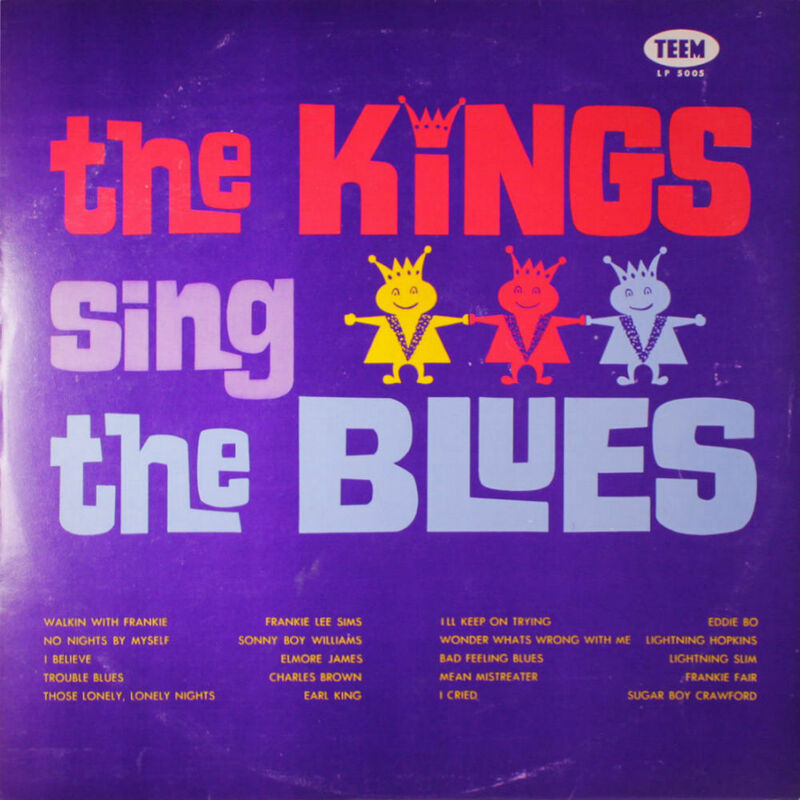 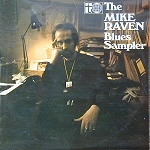 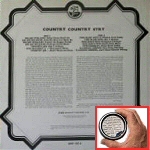 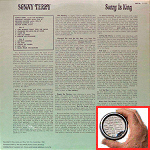 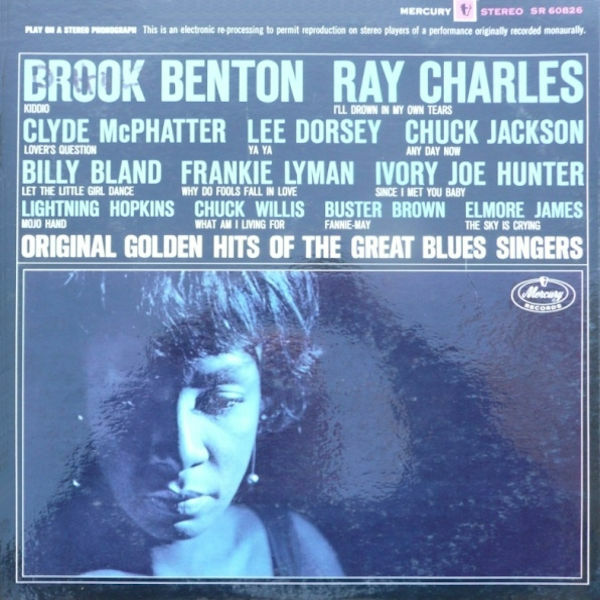 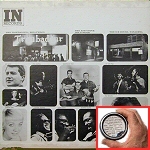 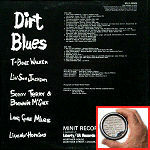 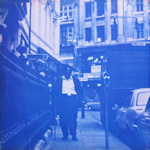 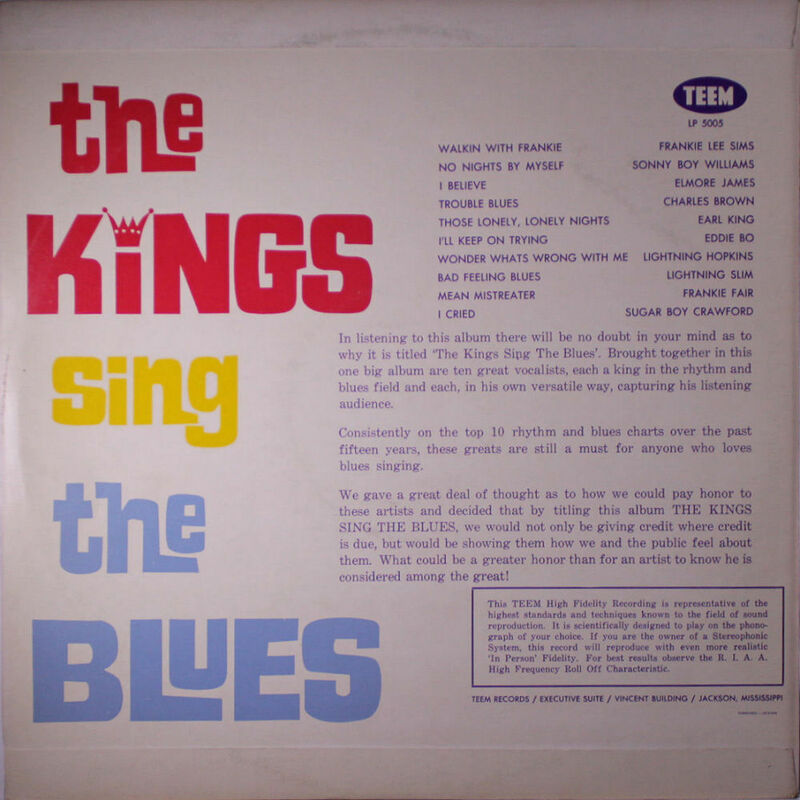 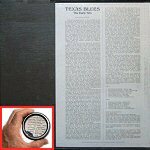 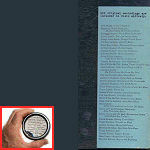 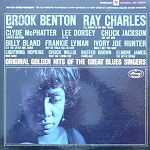 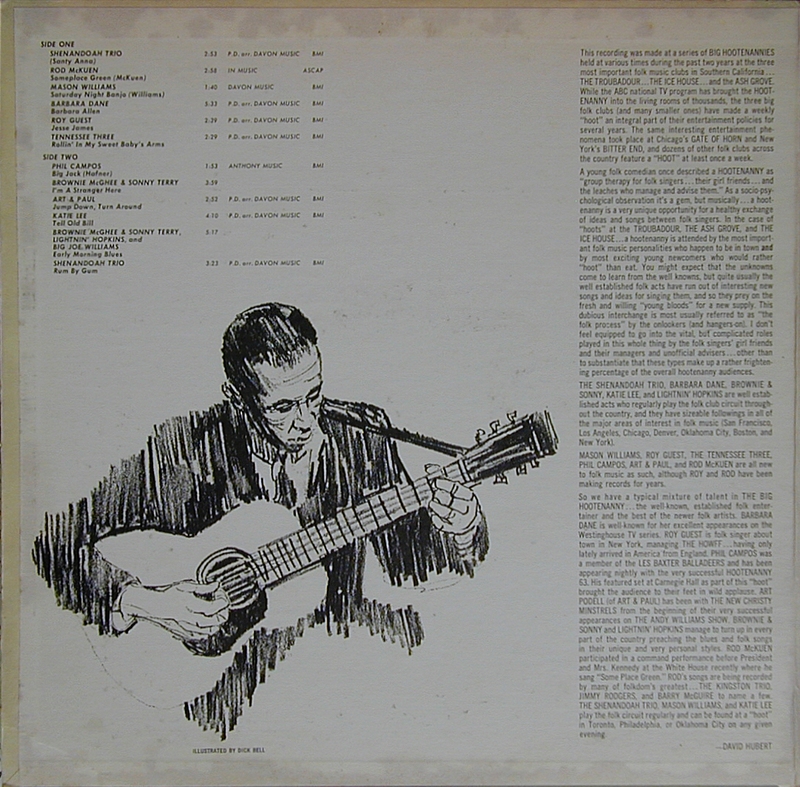 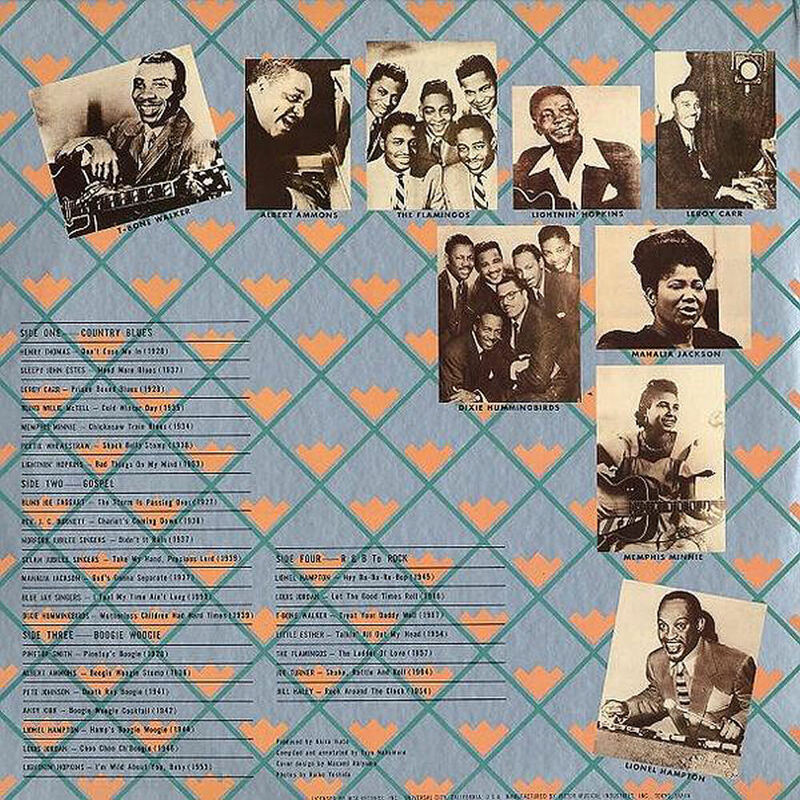 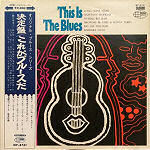 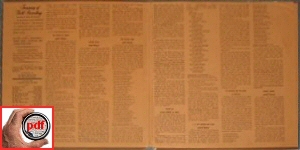 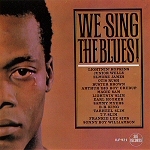 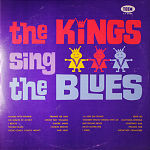 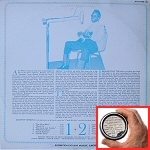 = Mount Vernon Music MVM 104 (US 1962) "Nothin' But The Blues!" 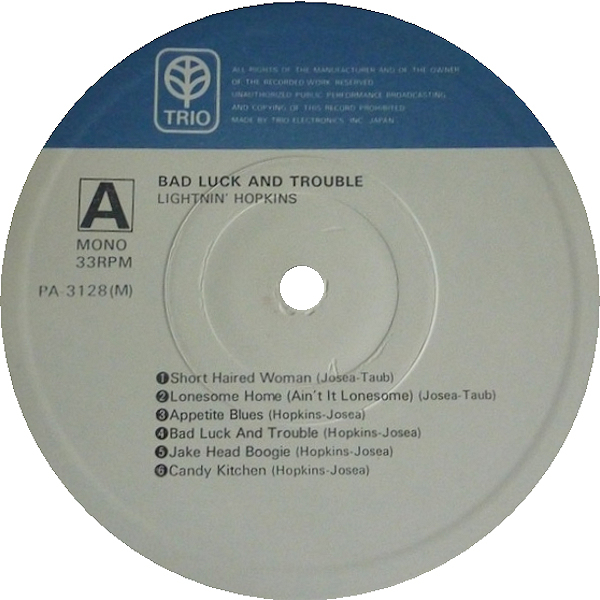 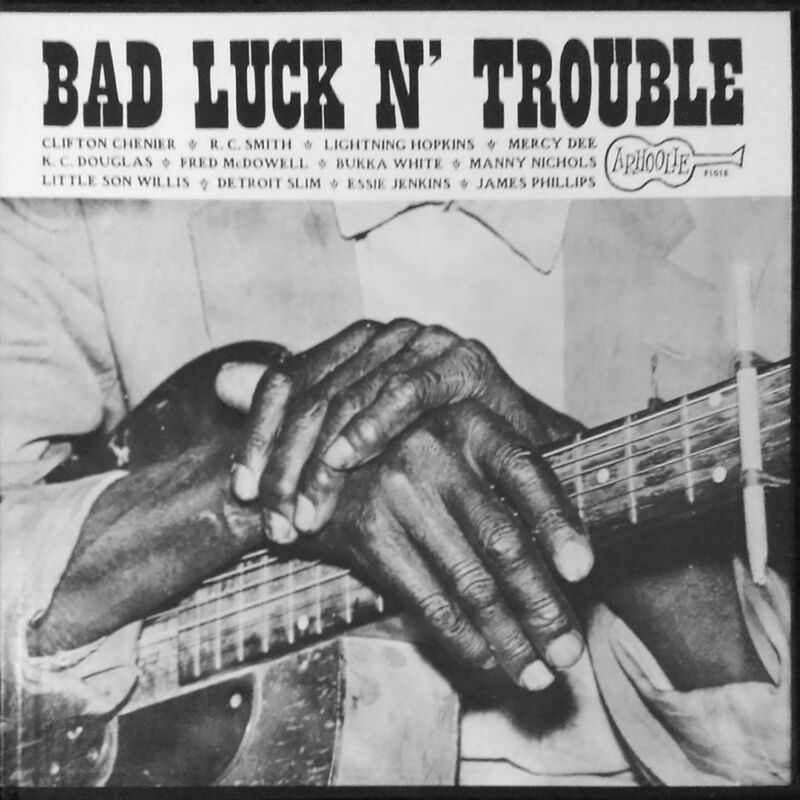 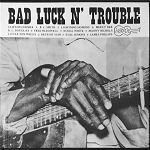 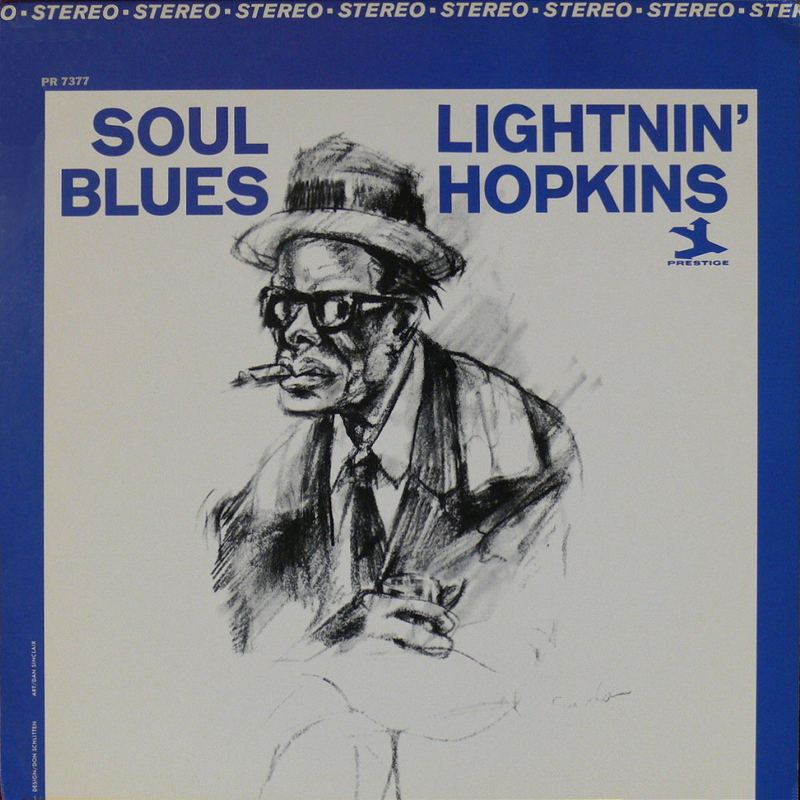 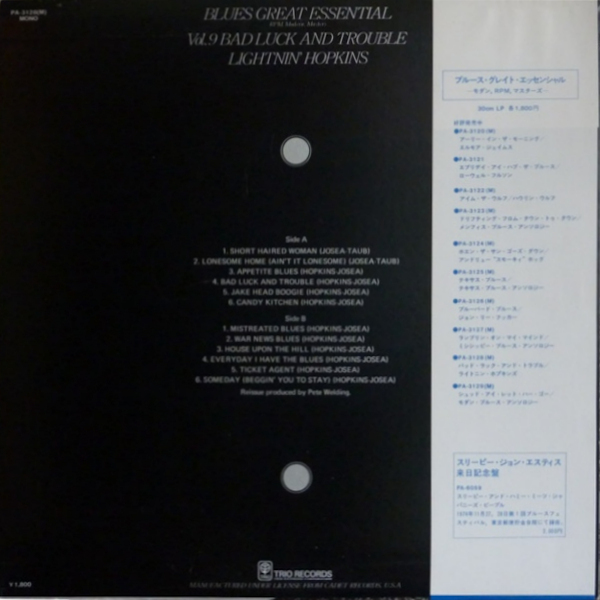 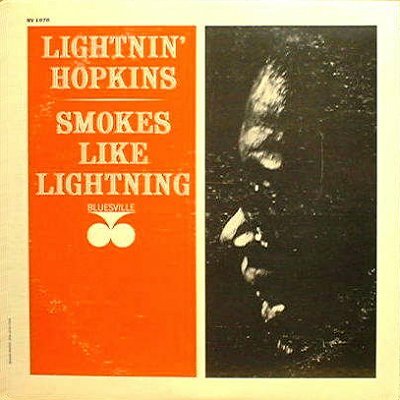 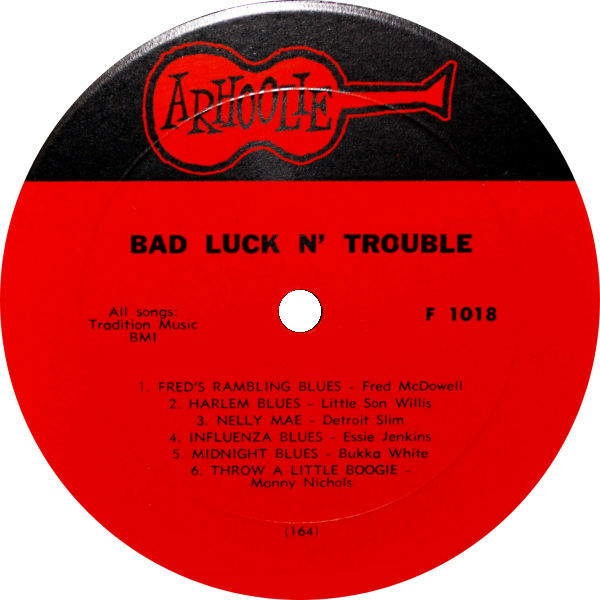 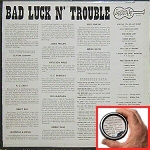 Imperial LP 12180-A (stereo) (US 1962) "Lightnin' Hopkins On Stage"
= Polydor 46 859 (Fr 1964) "Bad Luck Blues - Volume II"
(=) Toshiba/EMI LLR-8189 (Jp 197?) 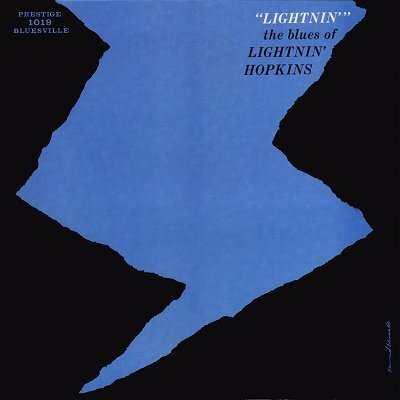 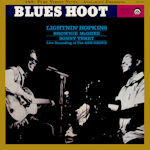 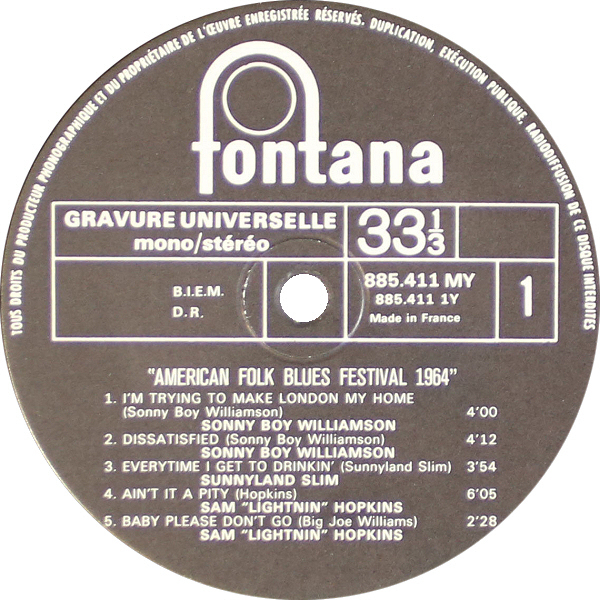 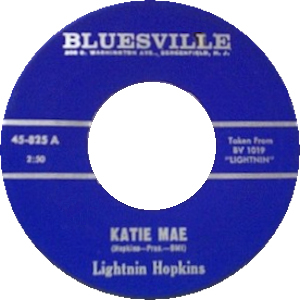 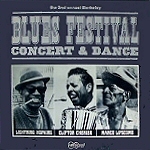 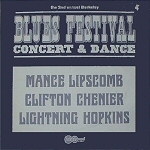 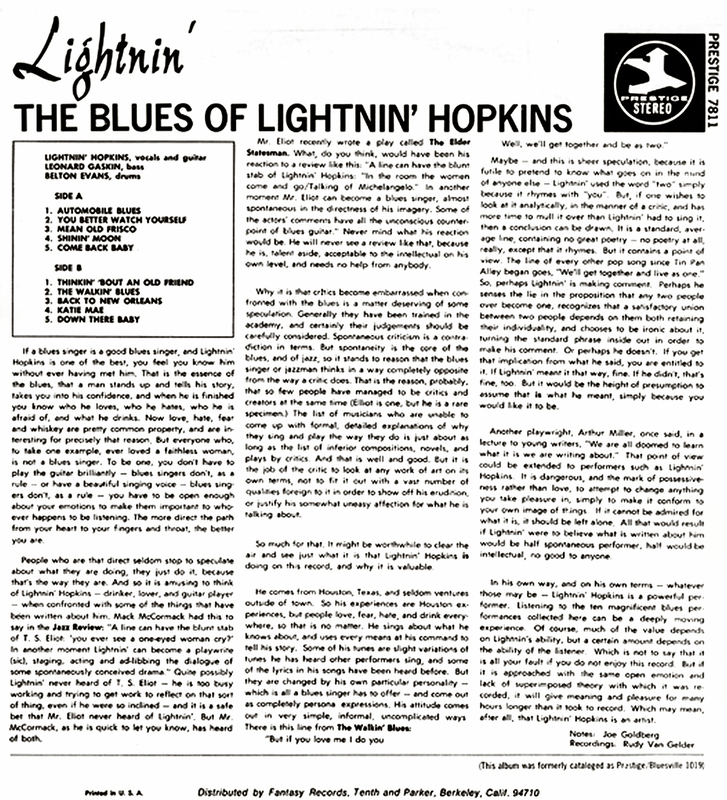 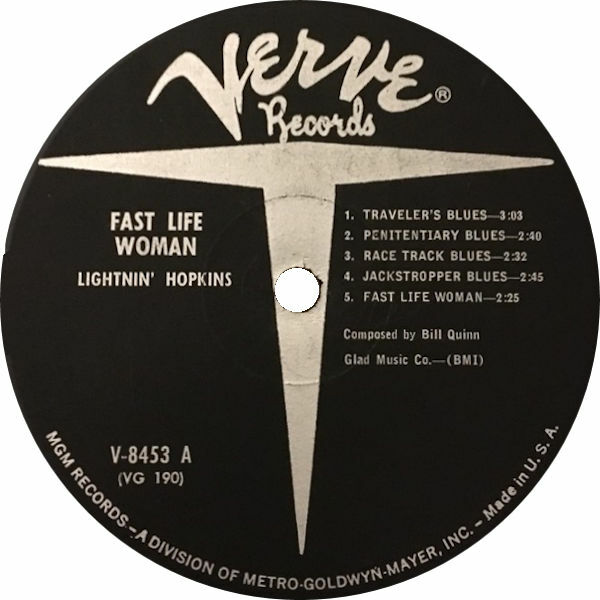 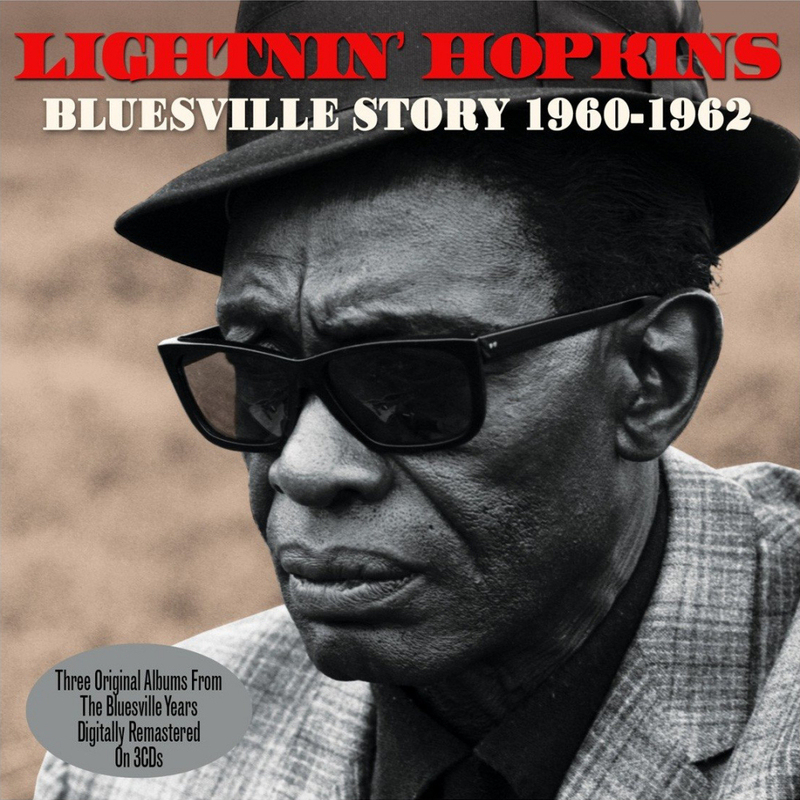 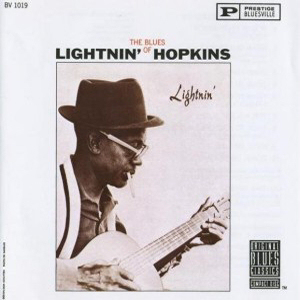 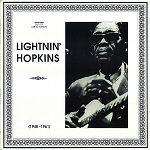 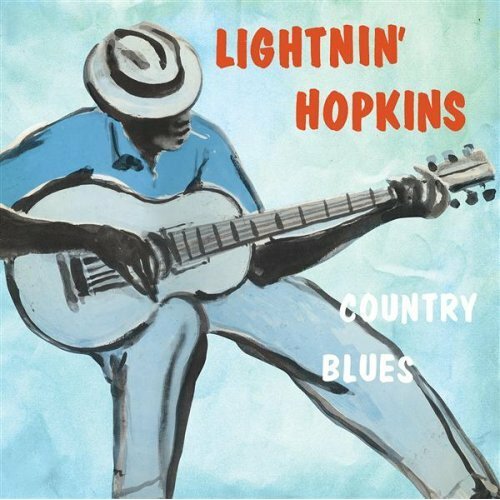 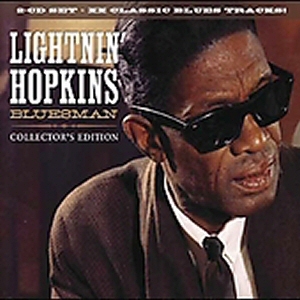 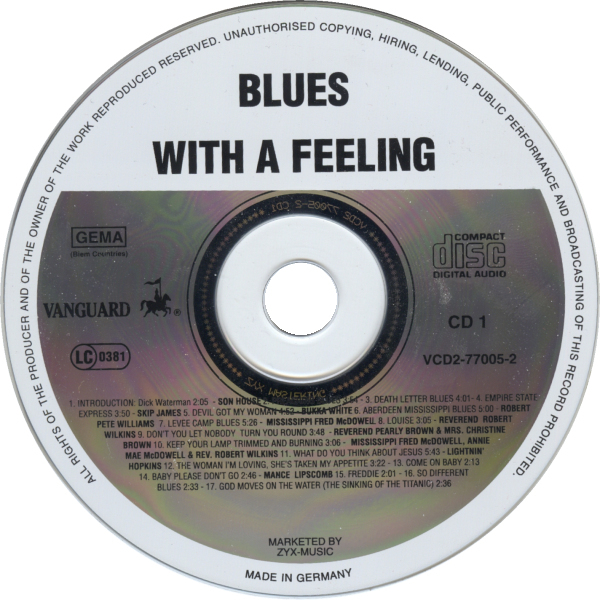 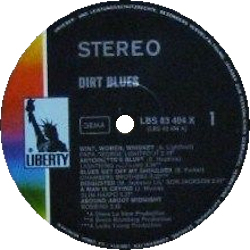 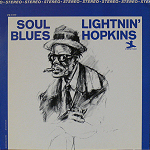 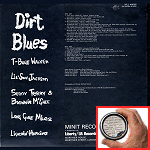 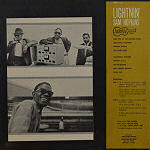 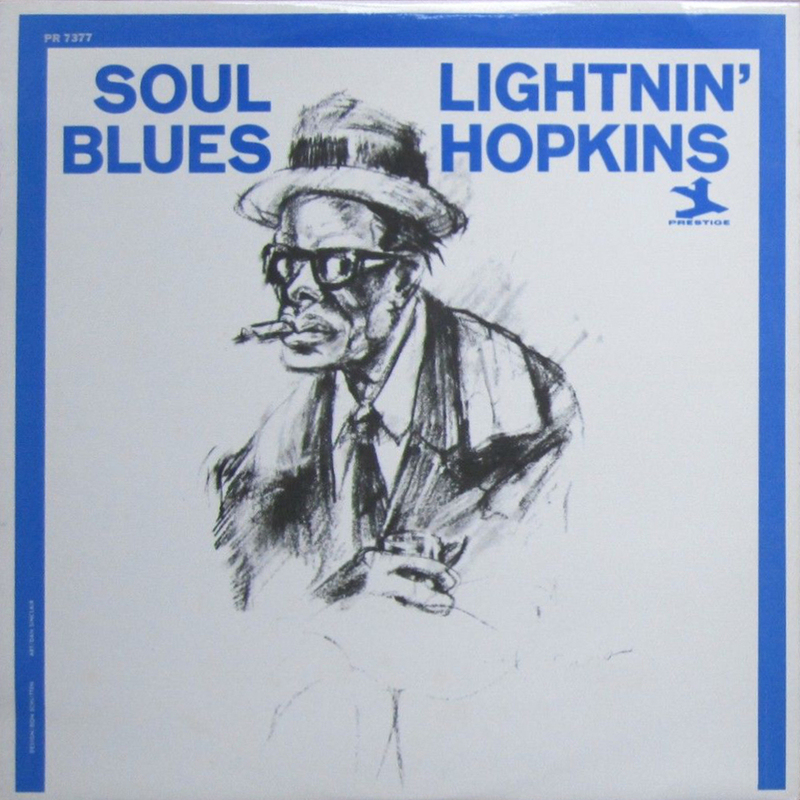 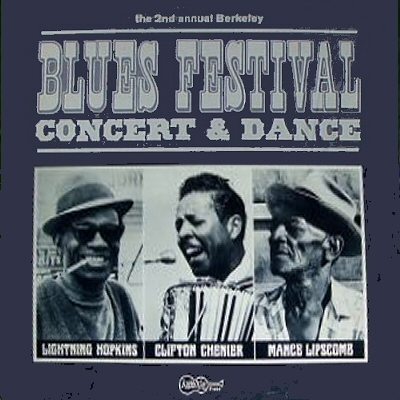 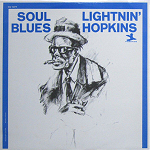 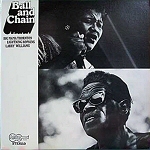 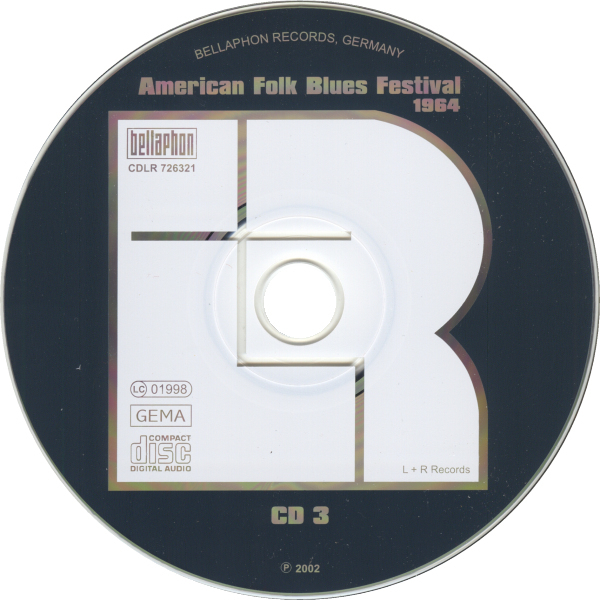 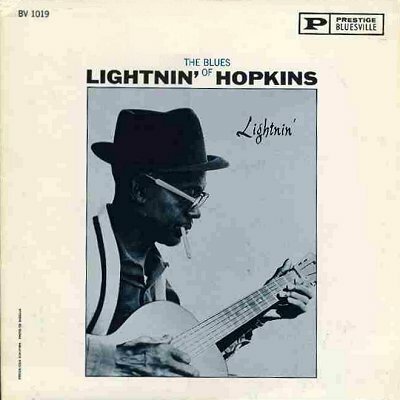 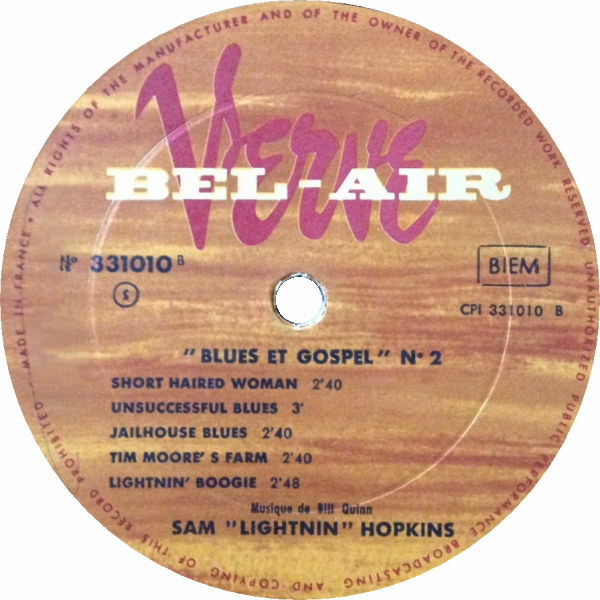 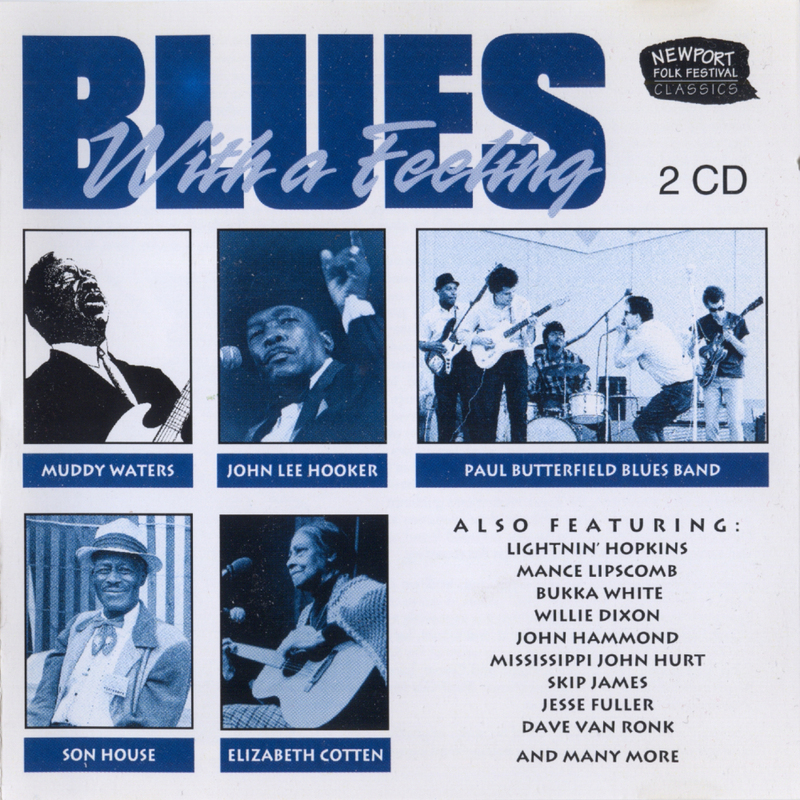 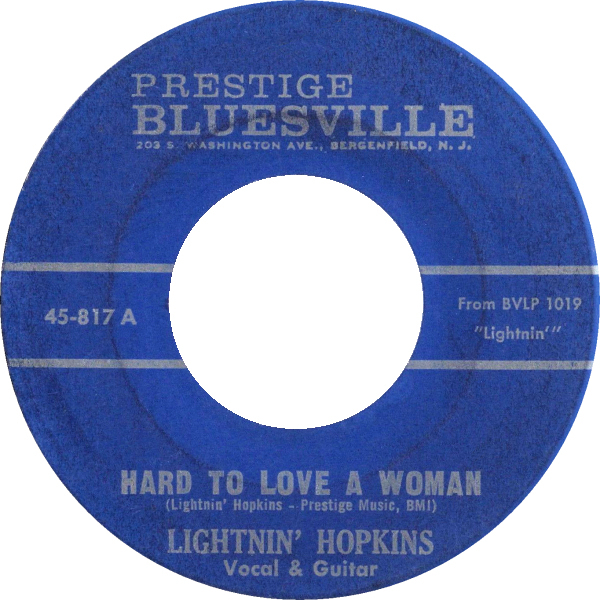 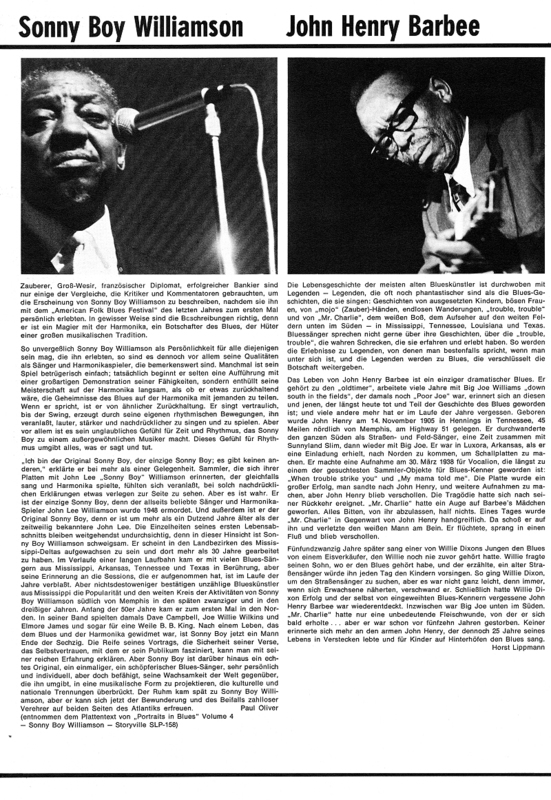 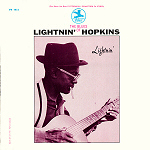 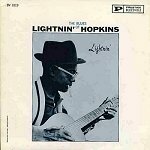 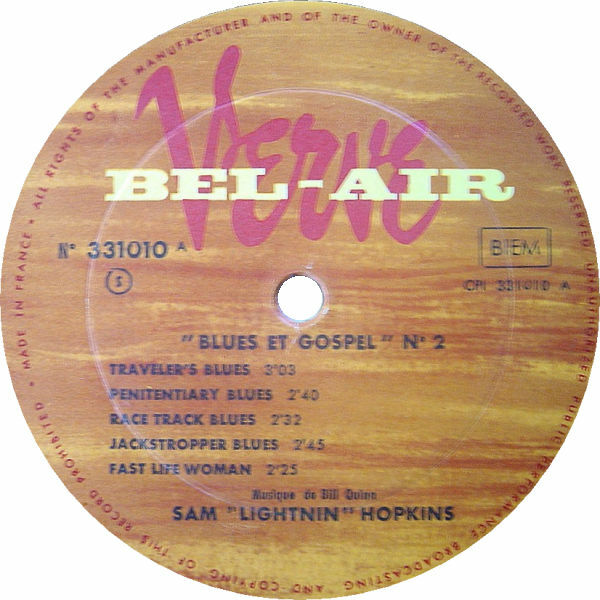 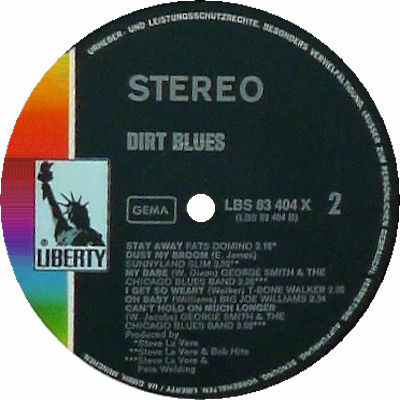 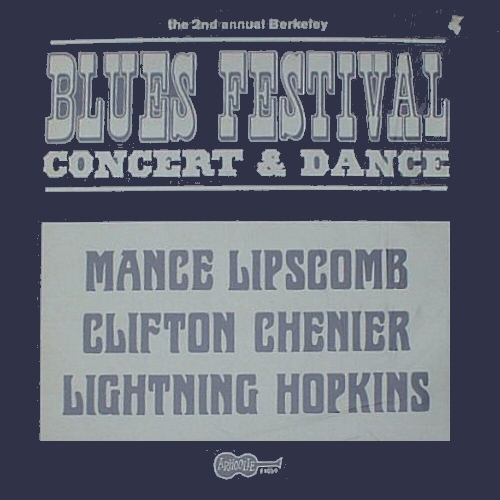 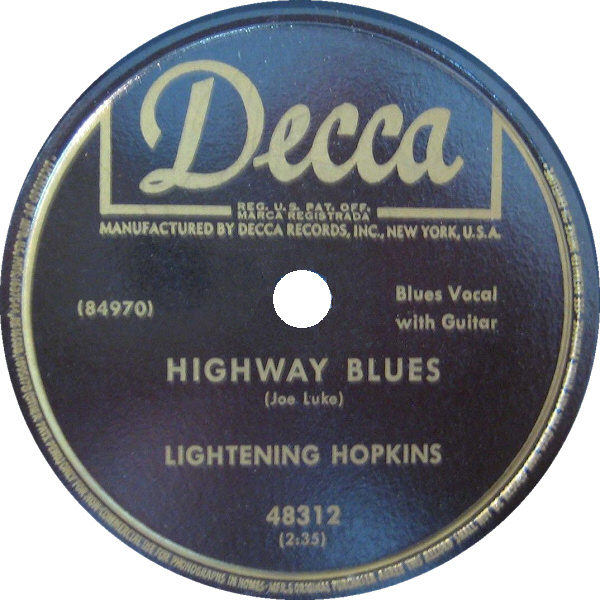 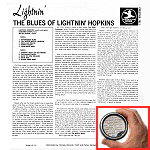 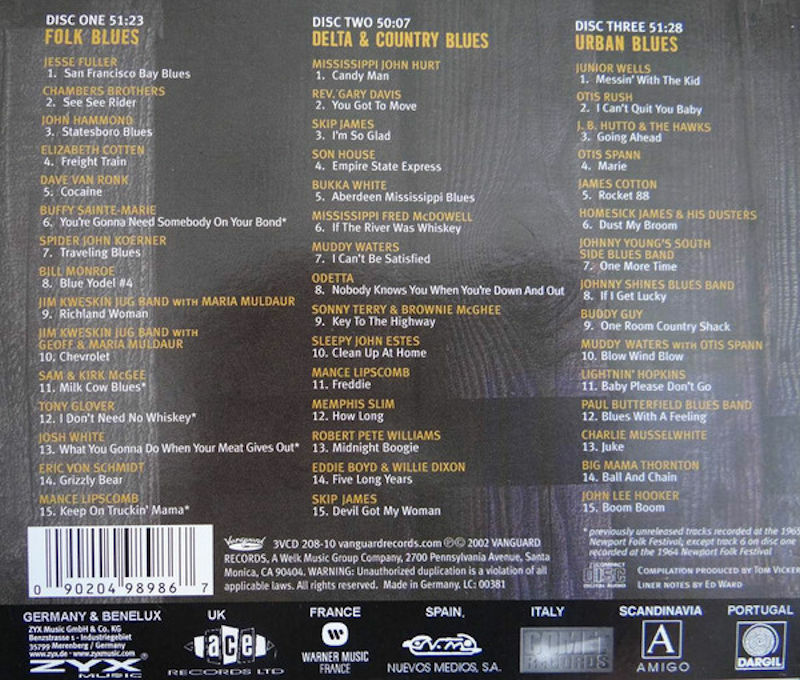 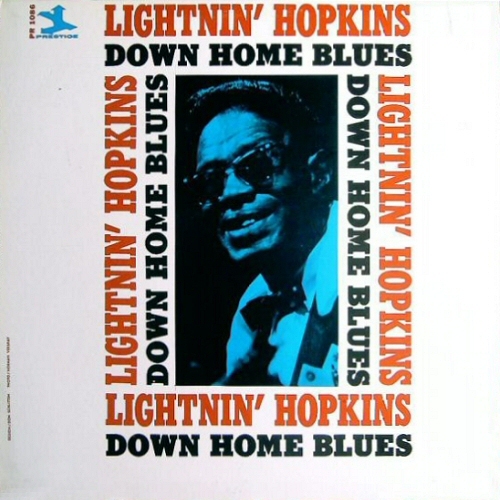 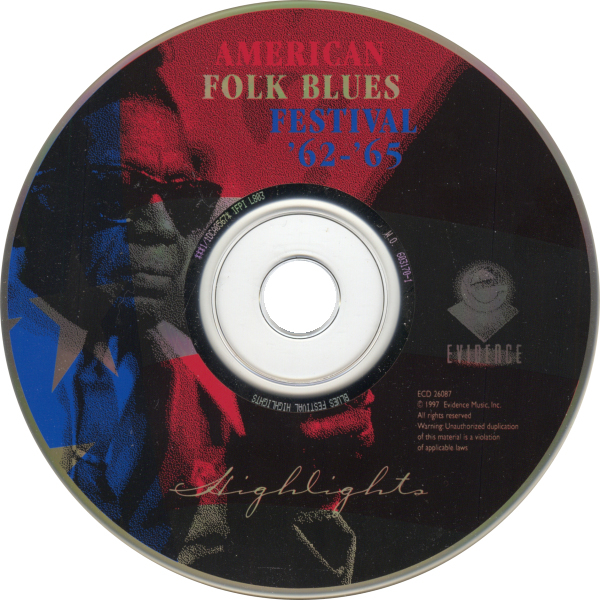 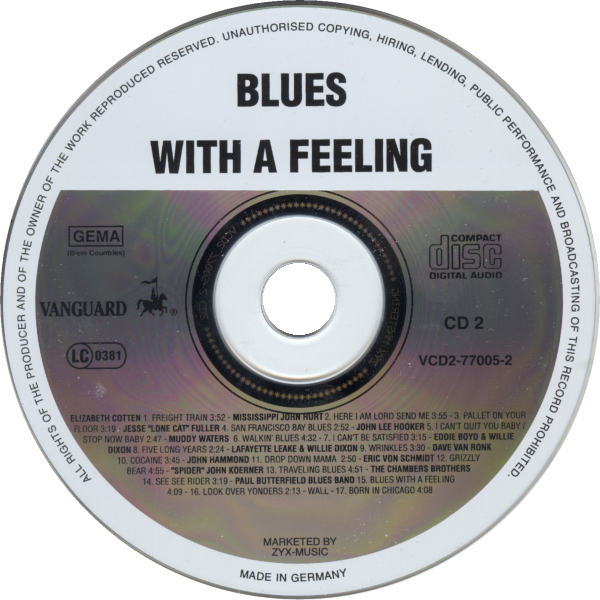 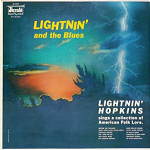 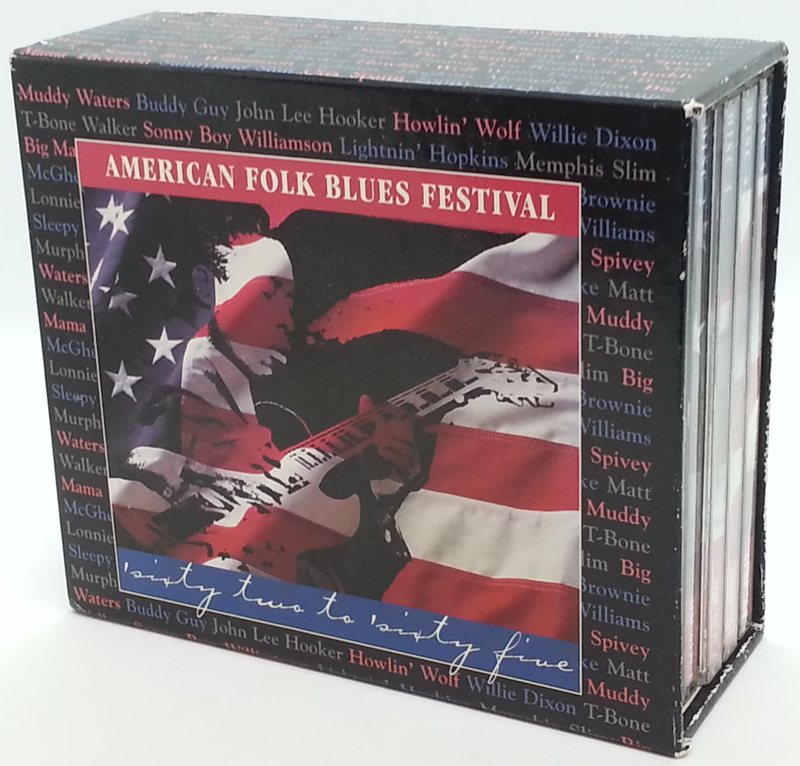 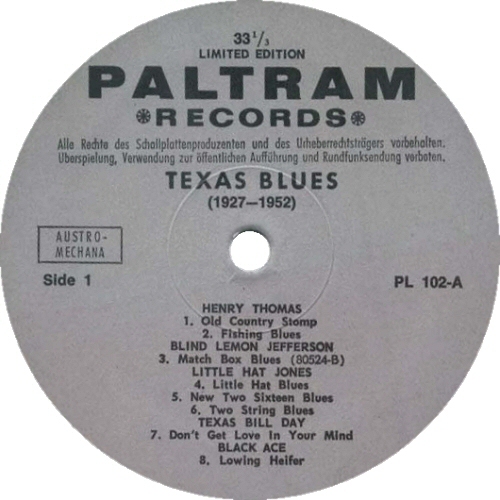 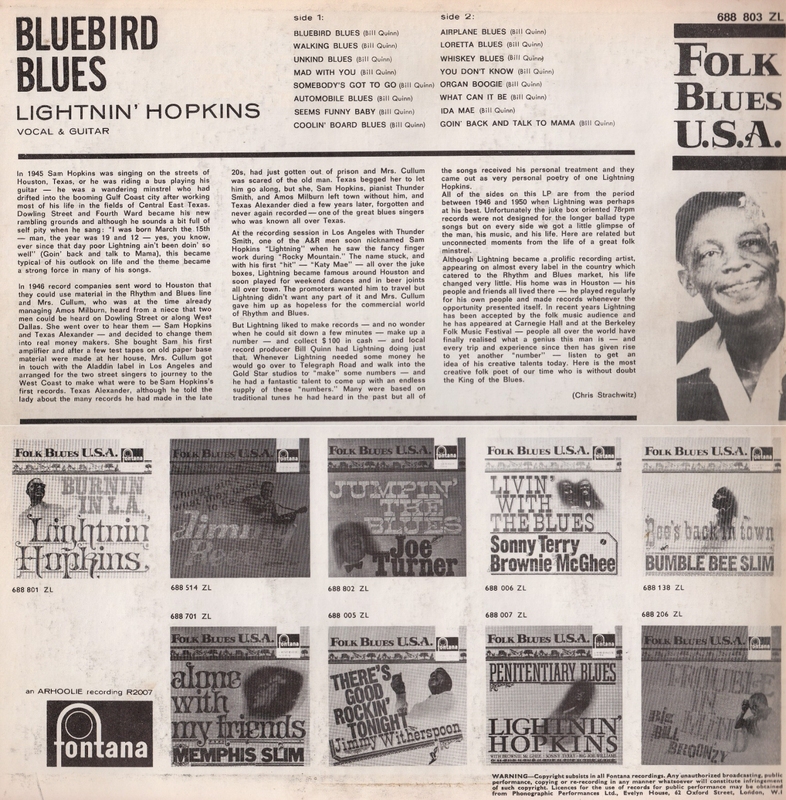 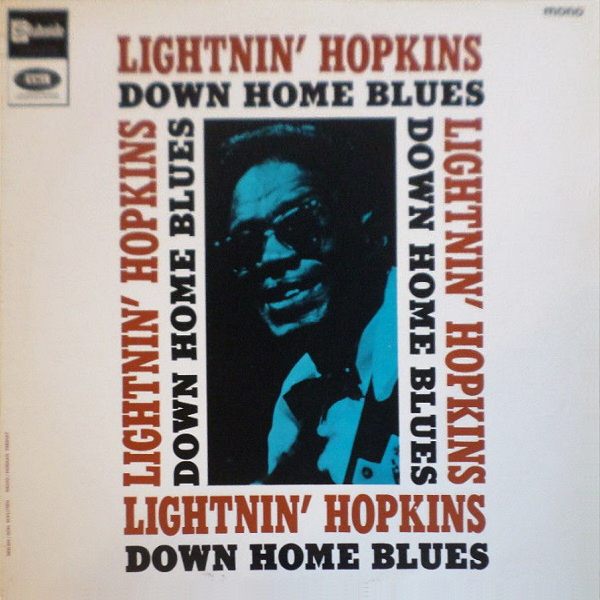 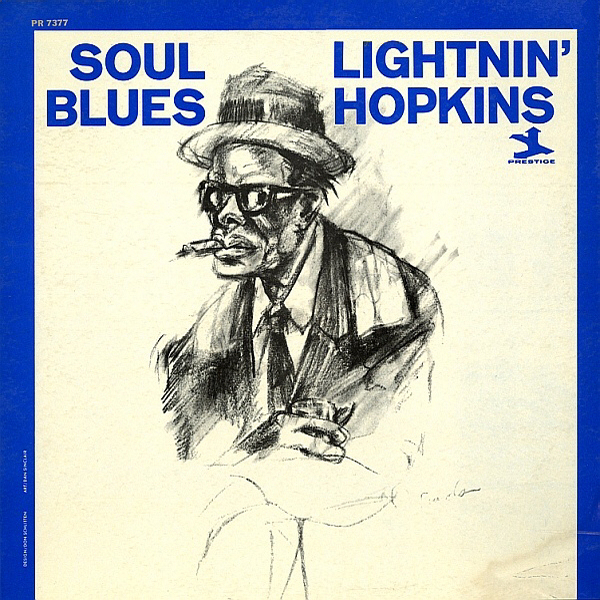 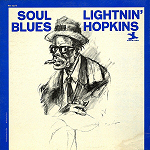 "Lightnin' Hopkins Strums The Blues"
(=) Score / Liberty / Pathé Marconi 2C 068-83.076 (Fr 1982) "Lightnin' Hopkins Strums The Blues"
= DOL DOL1122 (EU 2013) "Lightnin' Hopkins On Stage"
Oldays CD ODR6045 (Jp 2015) "Lightnin' Hopkins Strums The Blues"
(=)Third Man TMR554 (US 2019) "Lightnin' Hopkins Strums The Blues"
1aa 1958 Hootenanny Saturday Night! 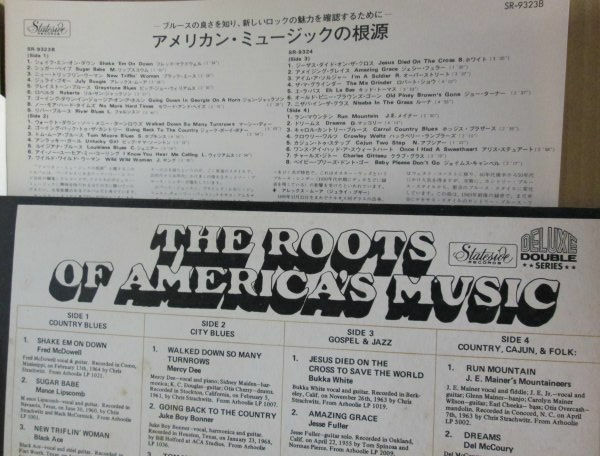 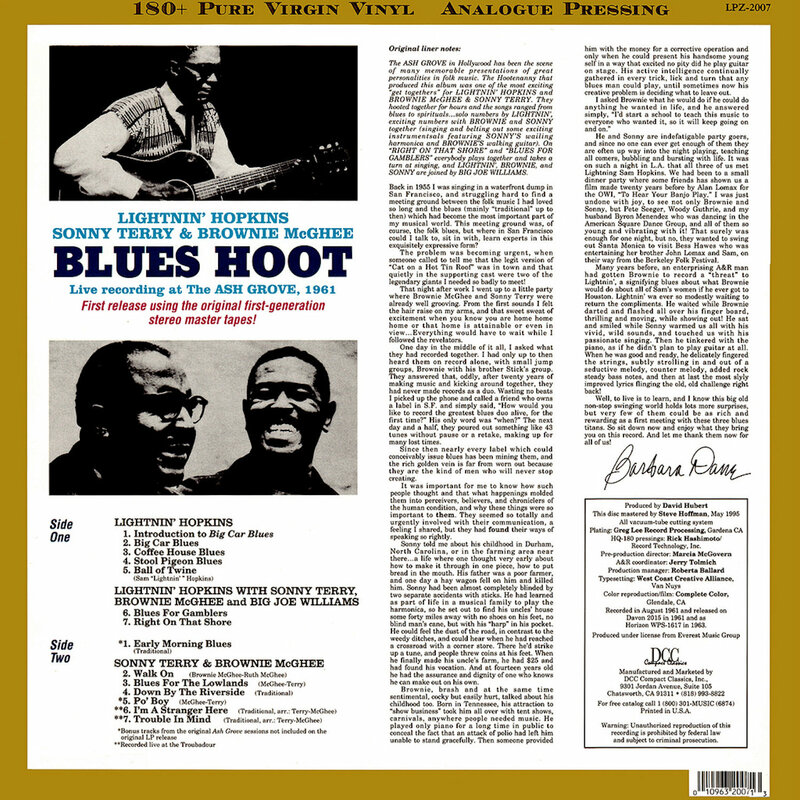 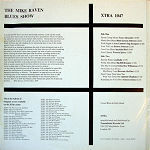 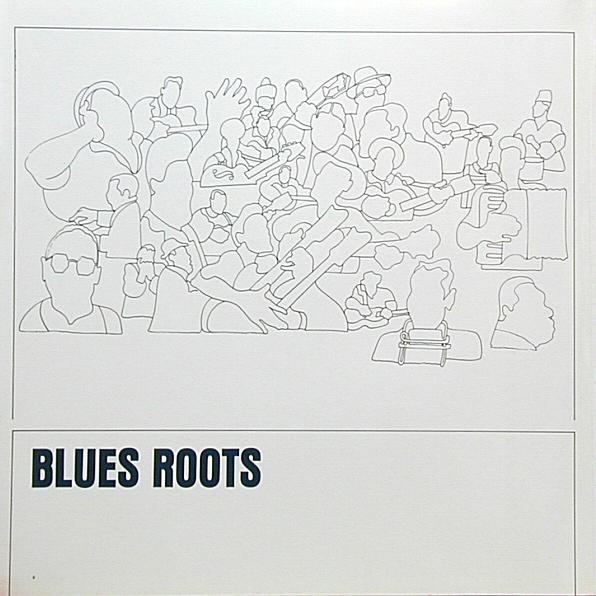 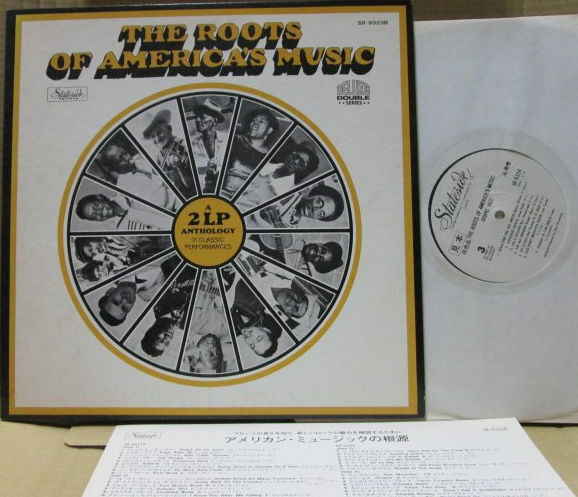 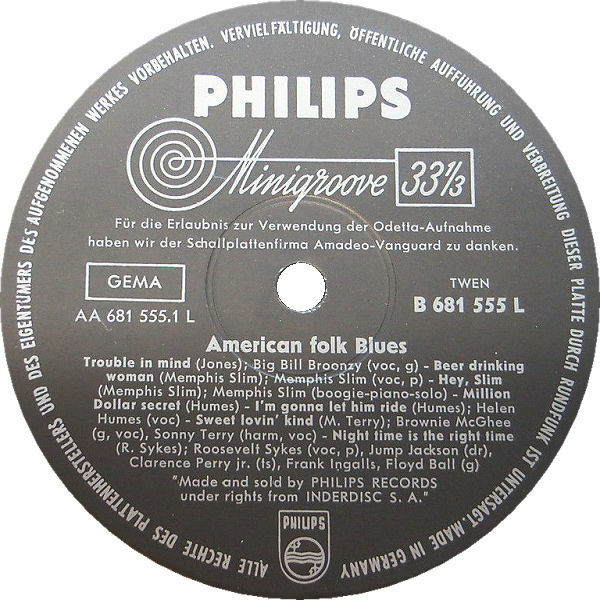 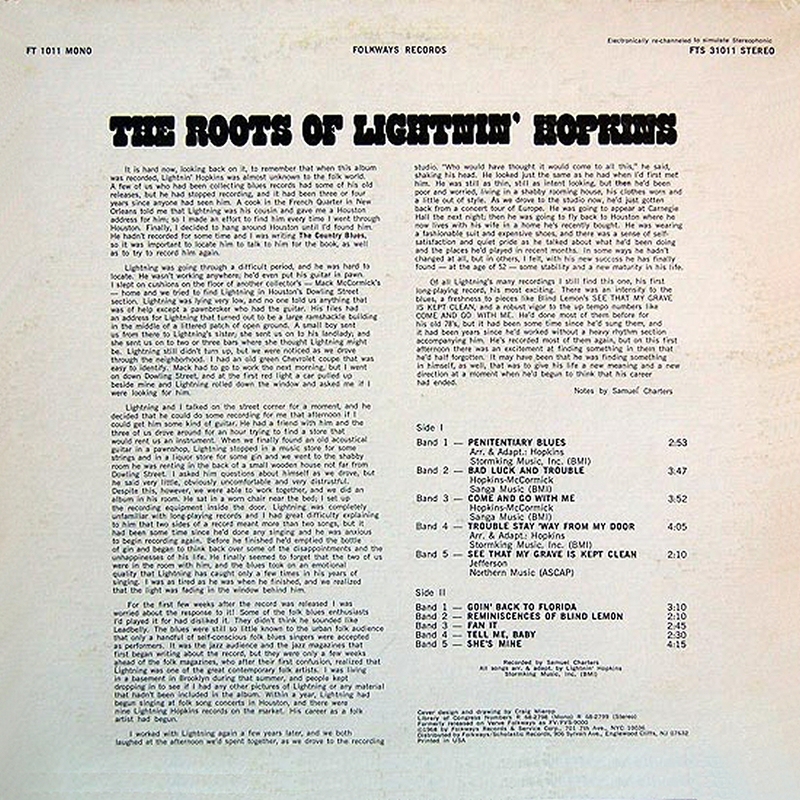 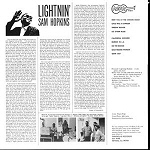 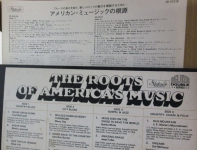 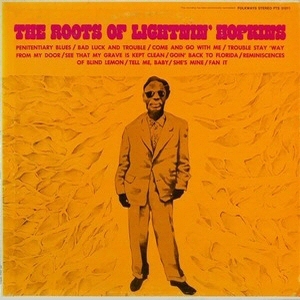 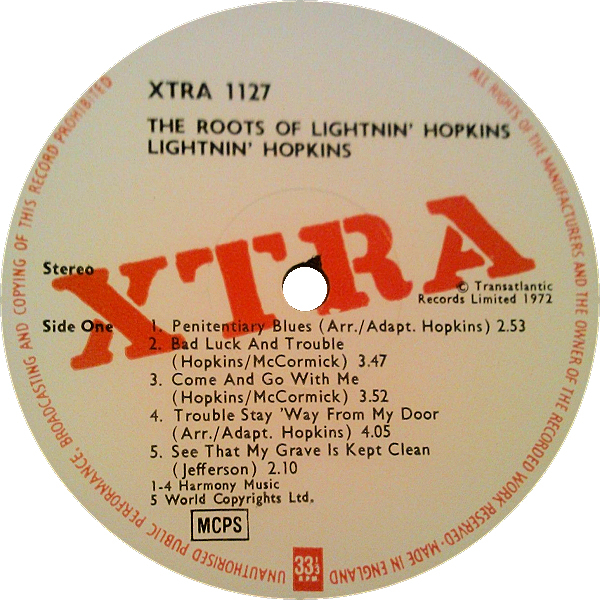 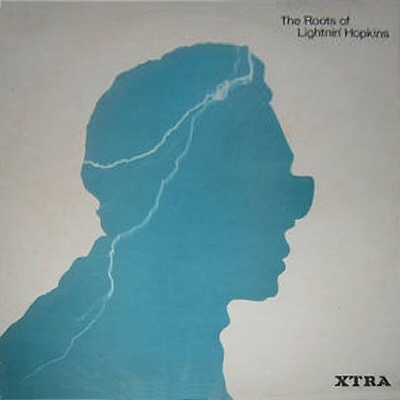 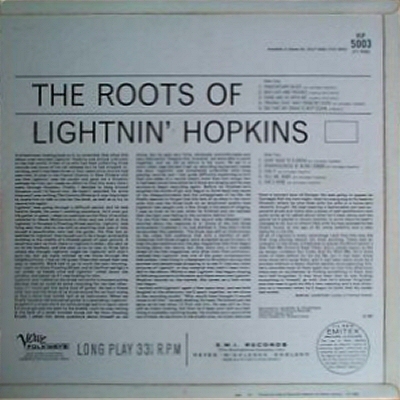 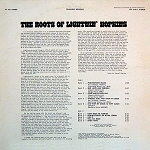 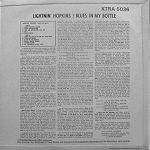 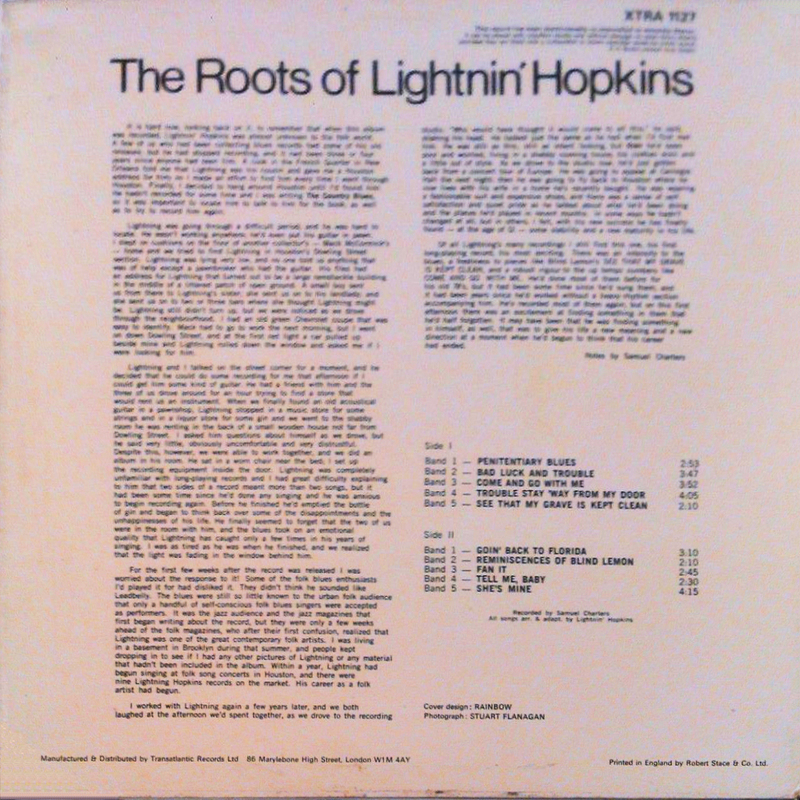 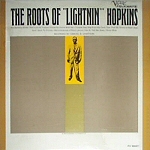 = Verve Folkways VLP/SVLP 5003 (UK 1965) "The Roots of Lightnin' Hopkins"
= XTRA 1127 (UK 1972) "The Roots of Lightnin' Hopkins"
= Blue Angel BA-20008 (Germany) "The Roots of Lightnin' Hopkins"
= Smithsonian Folkways SF 40019 (US 1990) "Lightnin' Hopkins"
= Smithsonian Folkways CD SF 40019 (US 1990) "Lightnin' Hopkins"
§ actually Hopkins sings "Soldiers dyin' in Germany, Red Cross on my arm"
= Collector's Issue C-5530 (Austria 1990?) 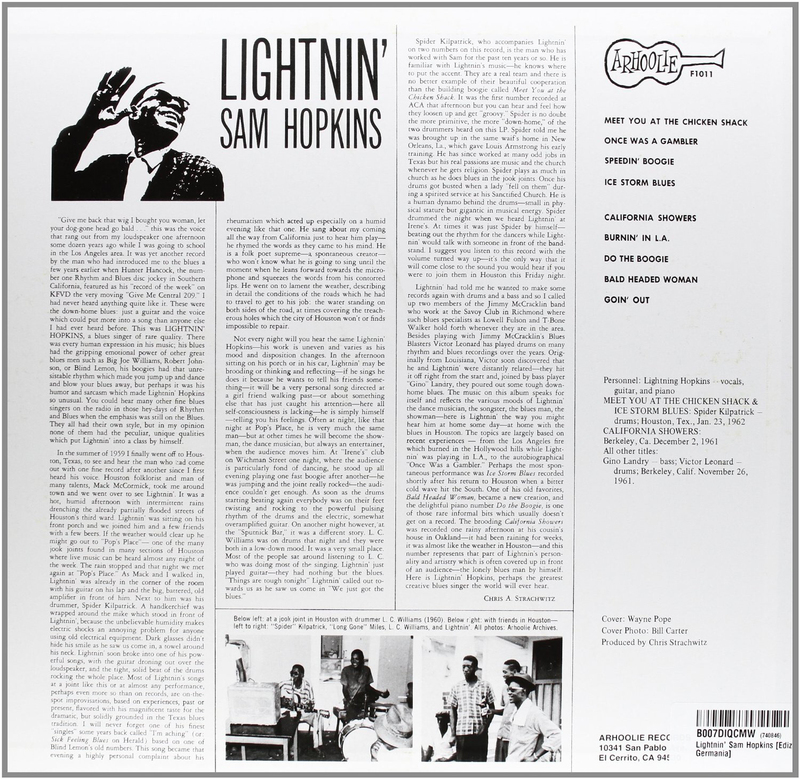 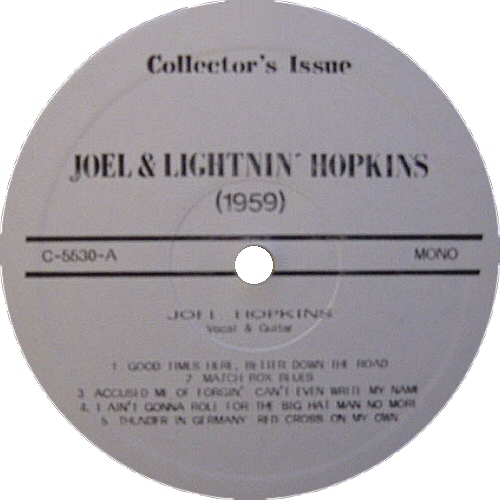 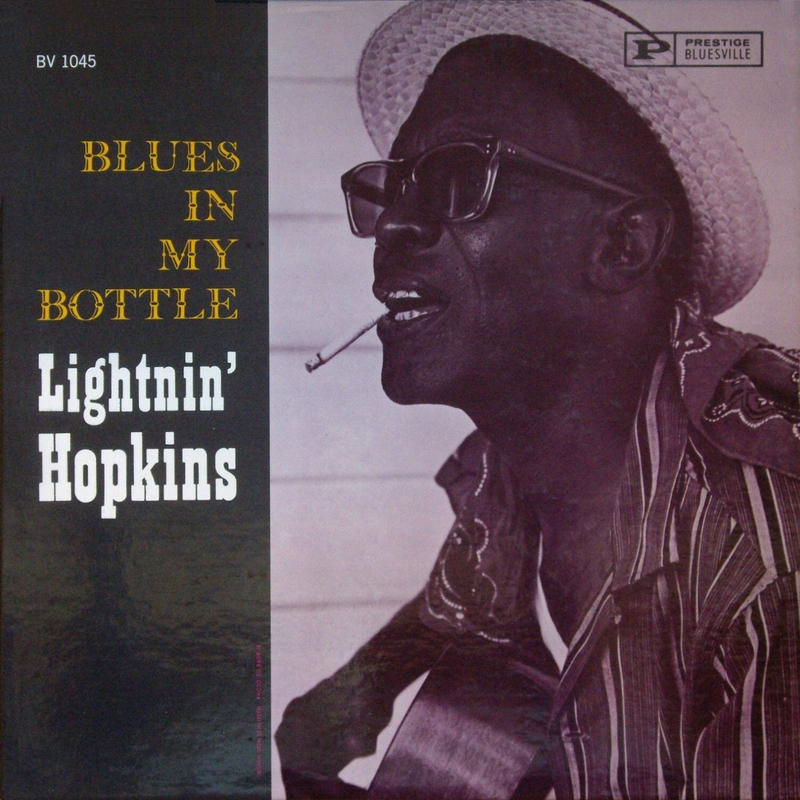 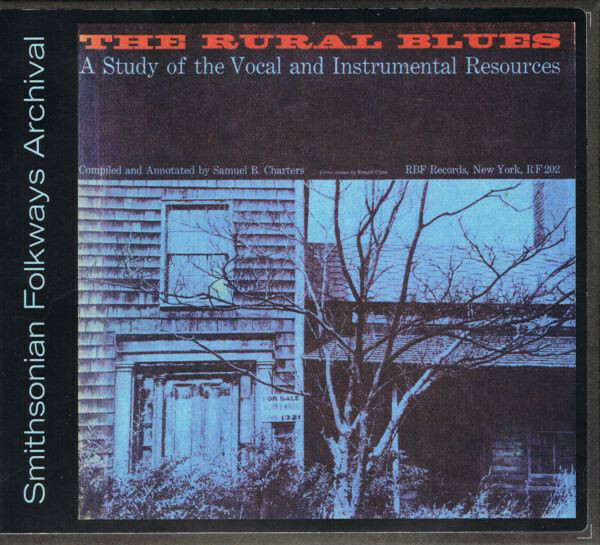 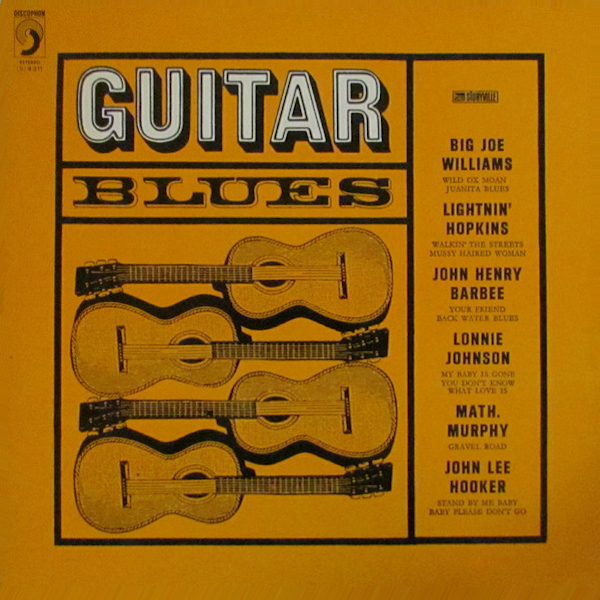 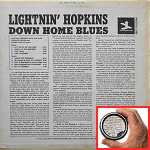 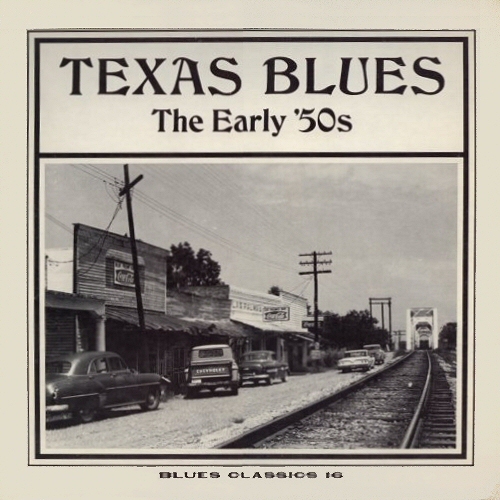 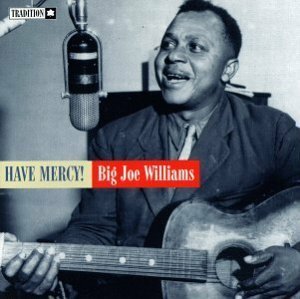 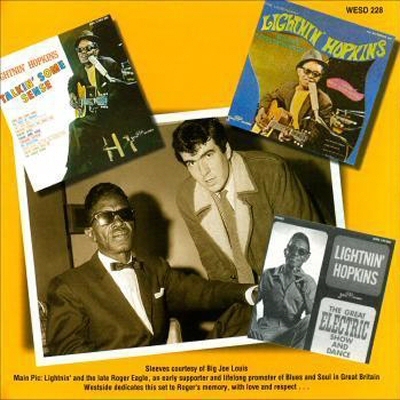 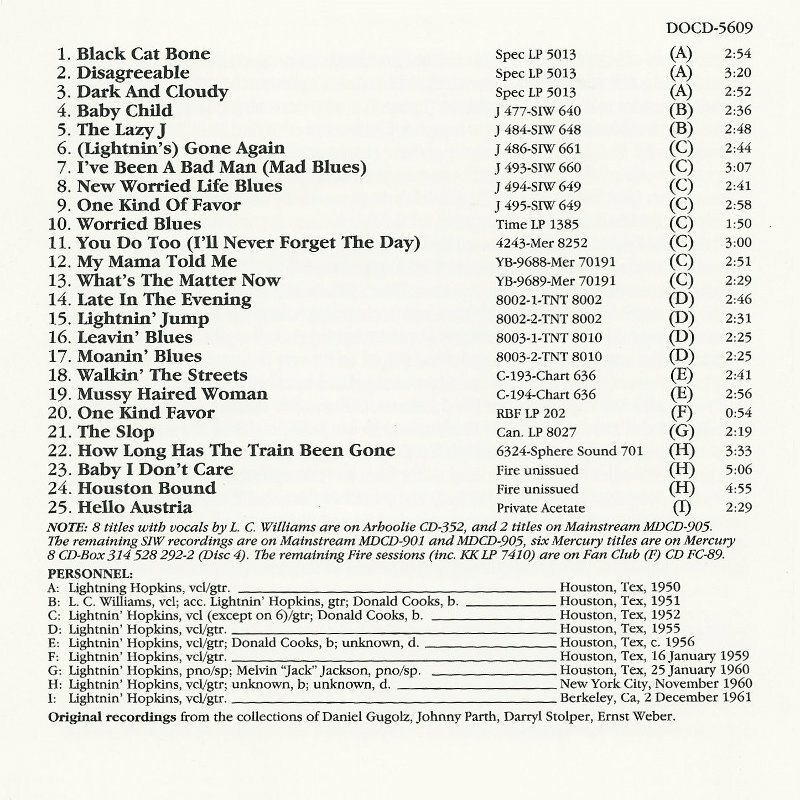 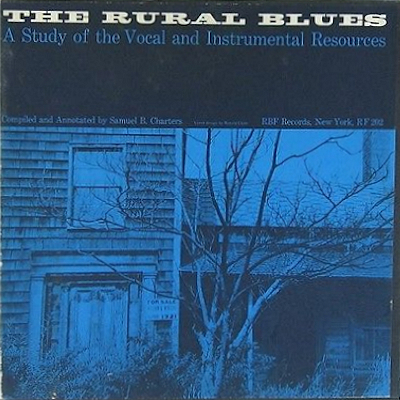 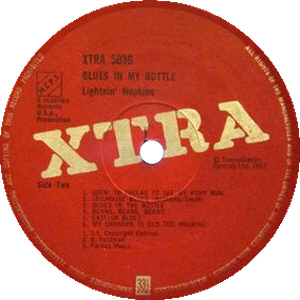 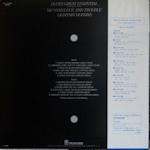 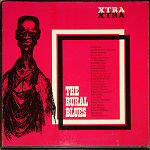 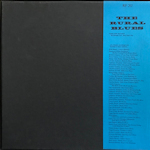 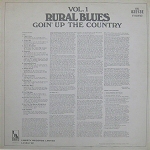 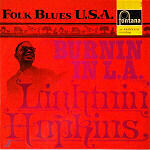 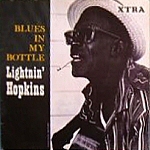 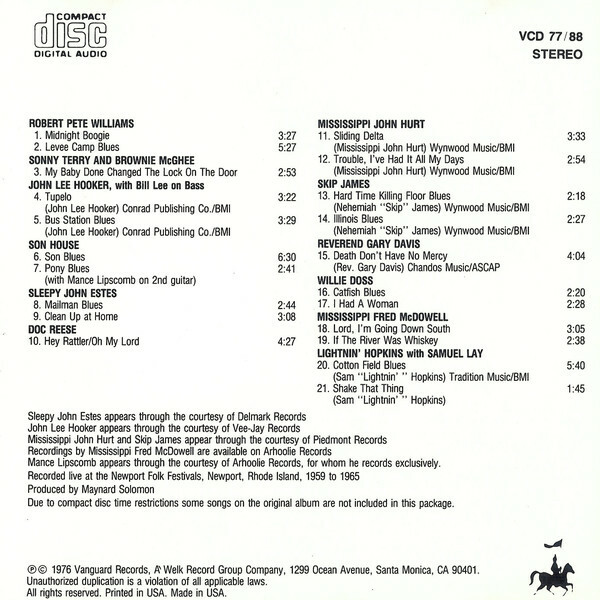 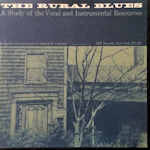 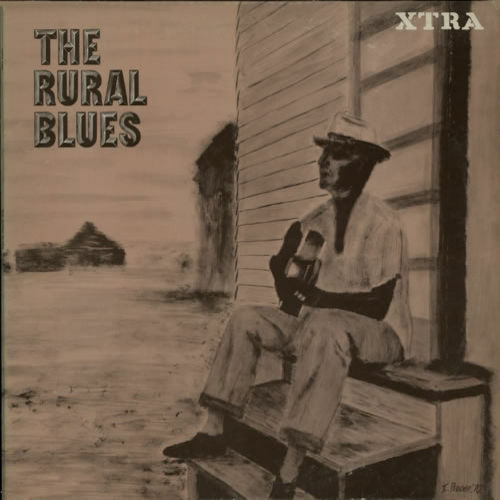 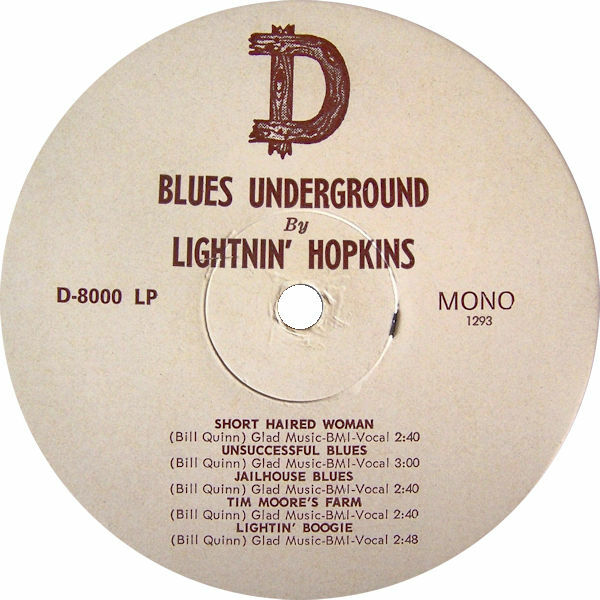 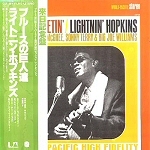 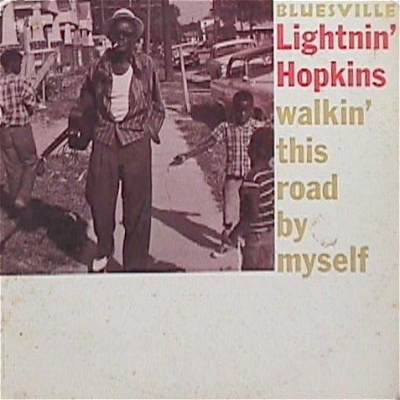 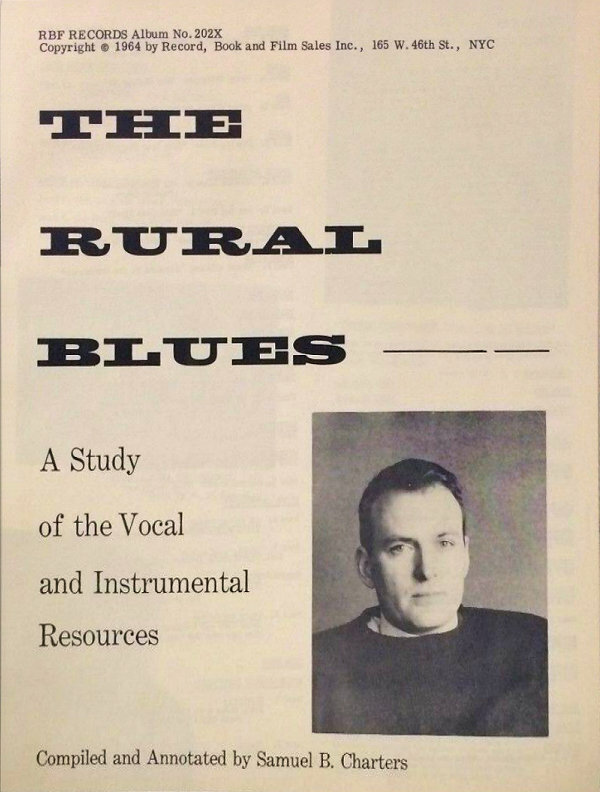 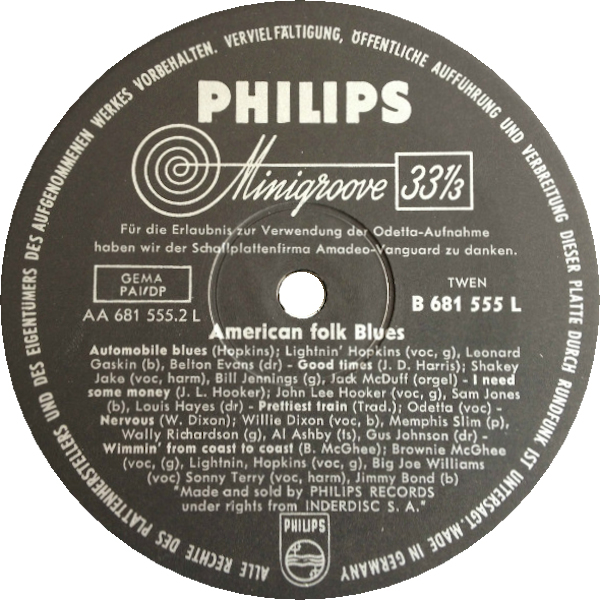 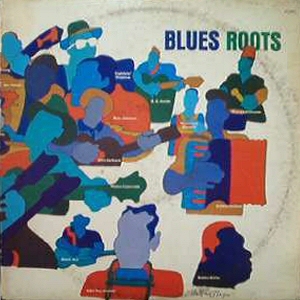 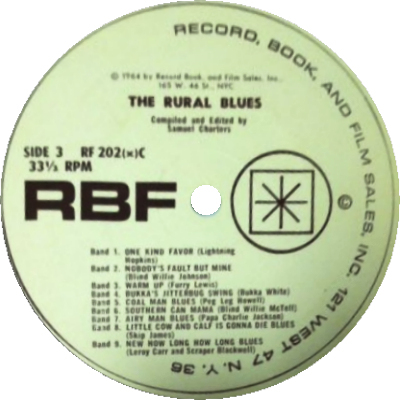 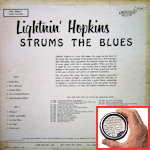 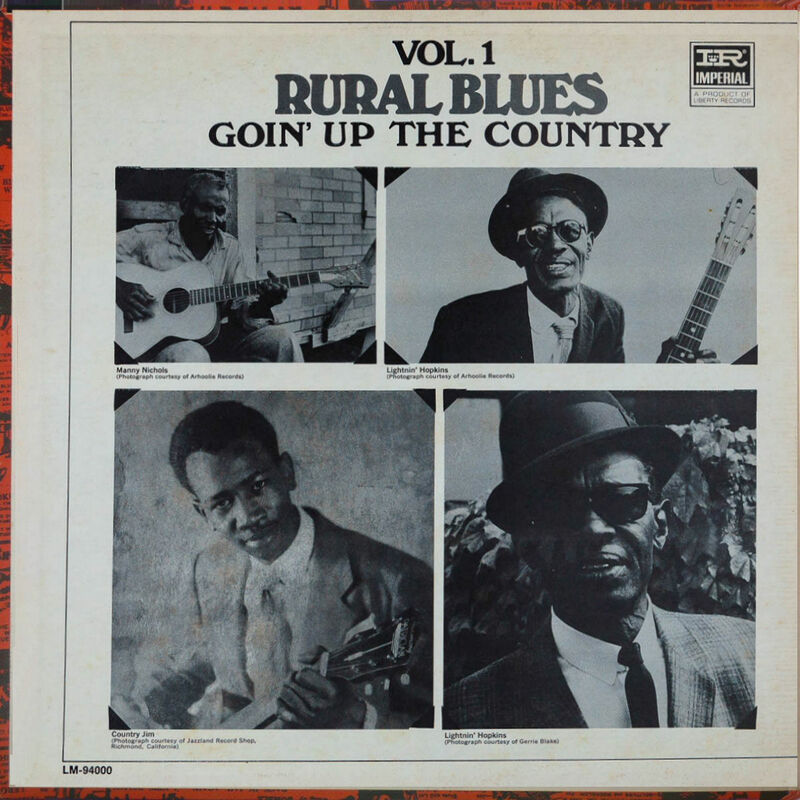 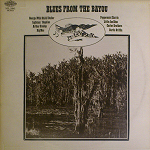 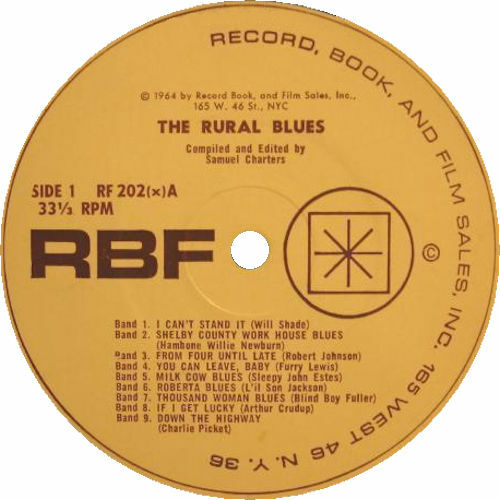 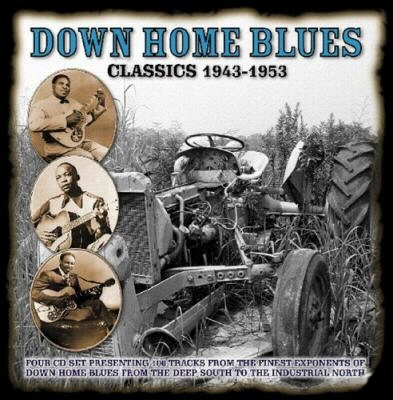 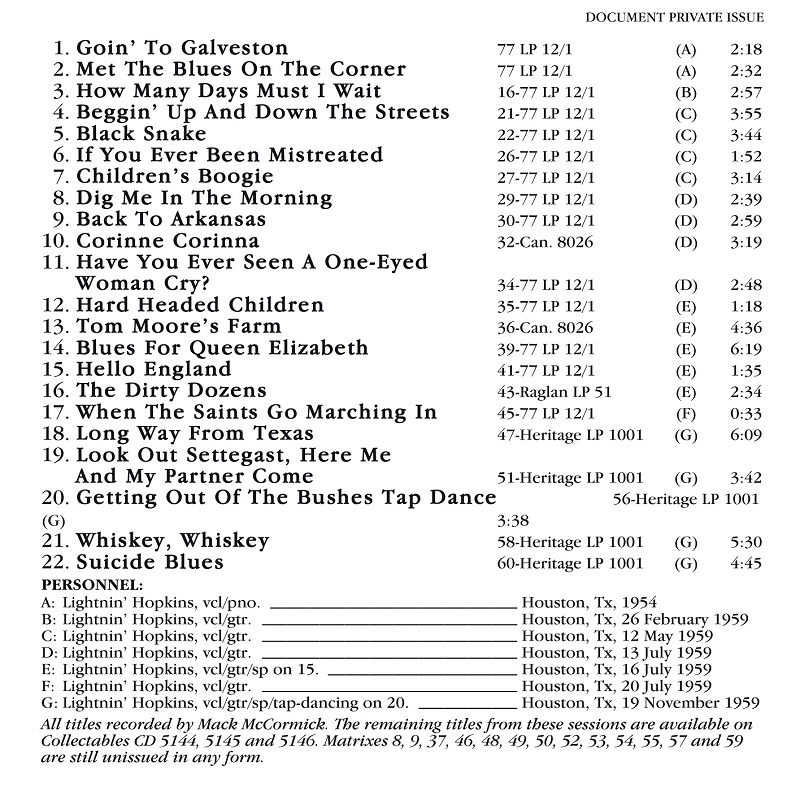 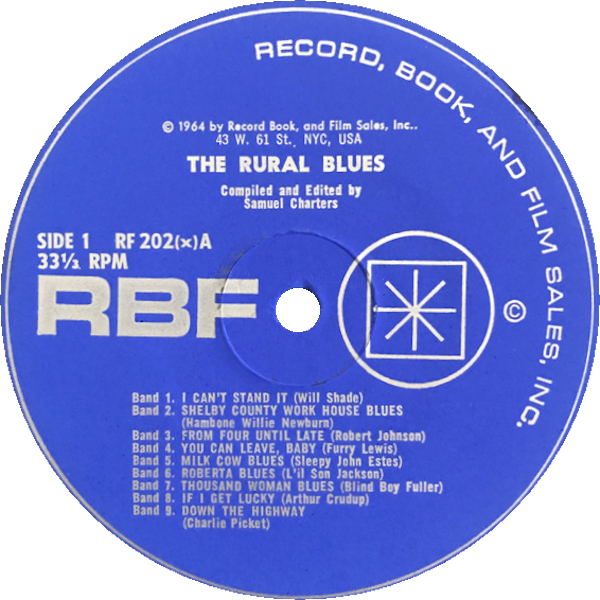 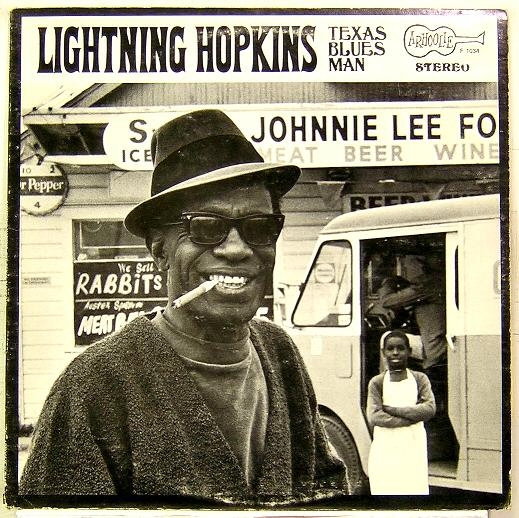 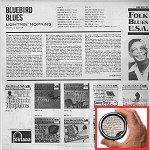 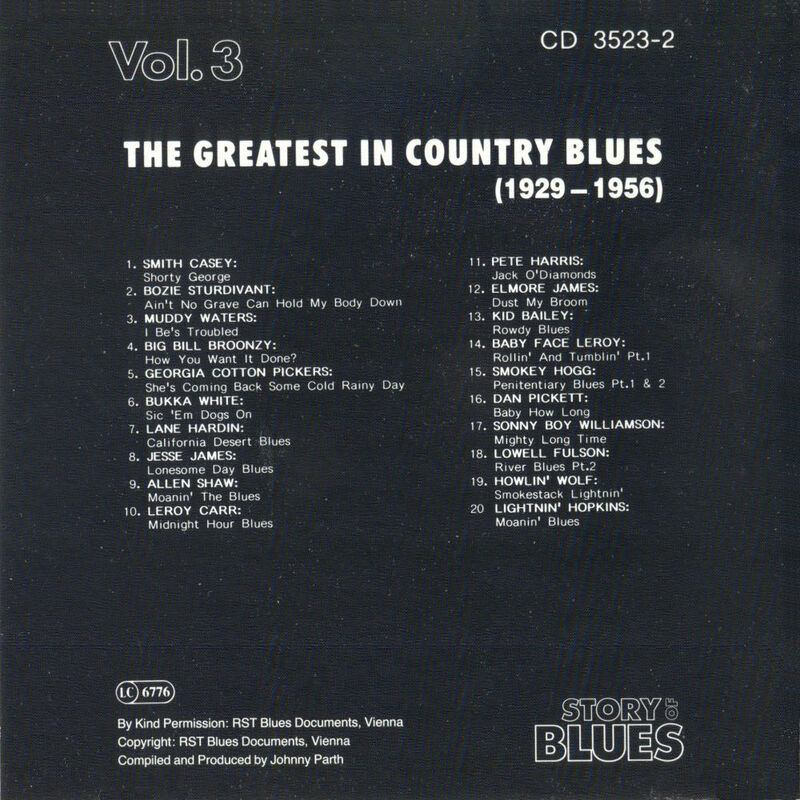 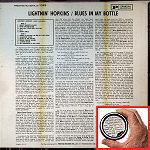 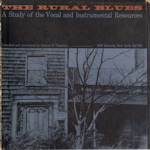 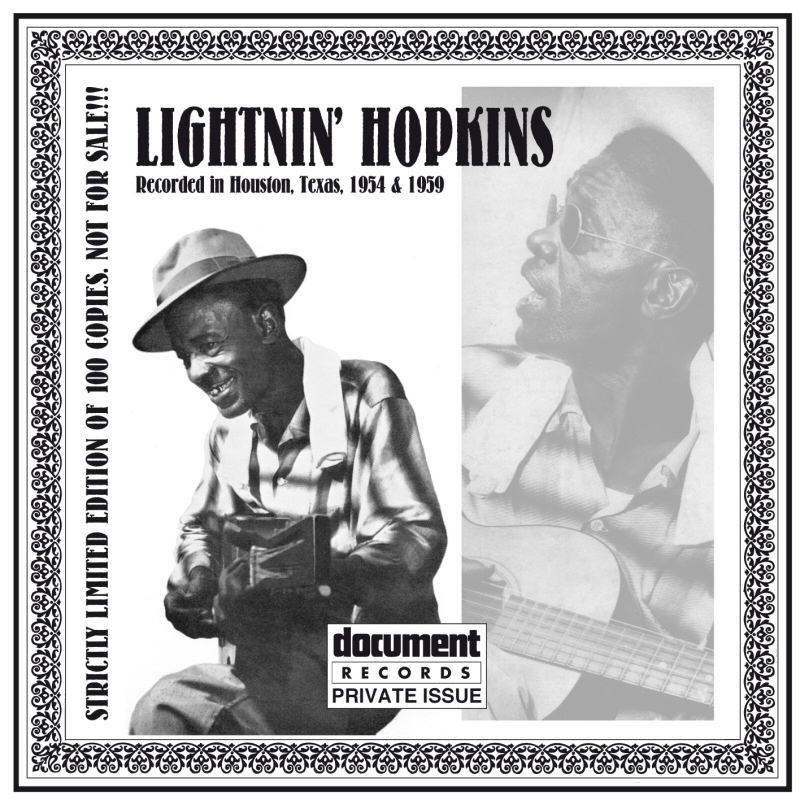 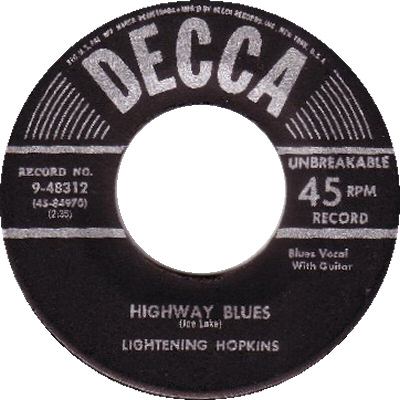 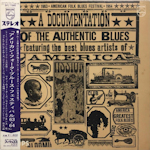 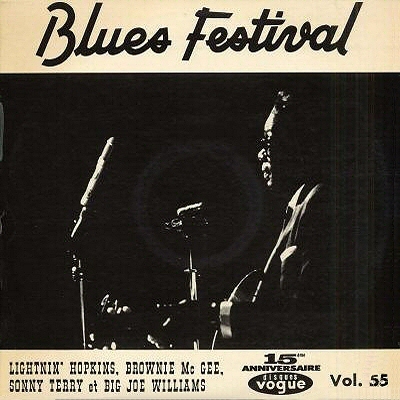 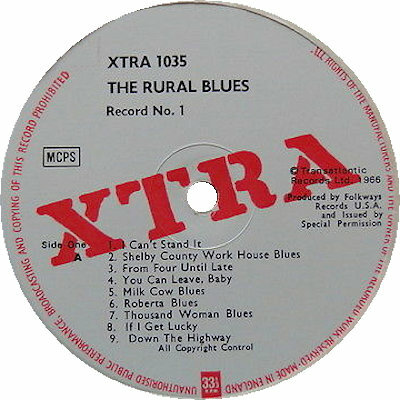 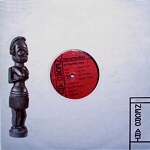 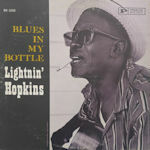 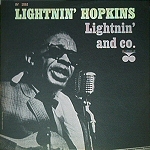 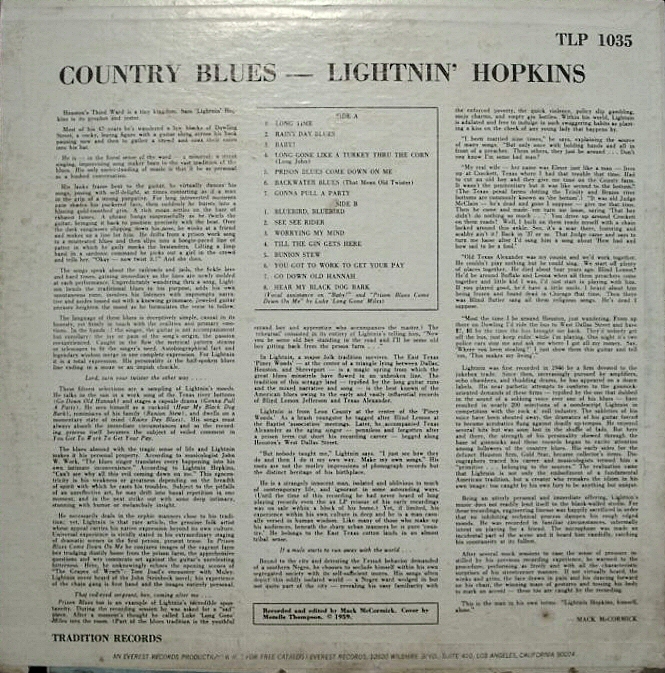 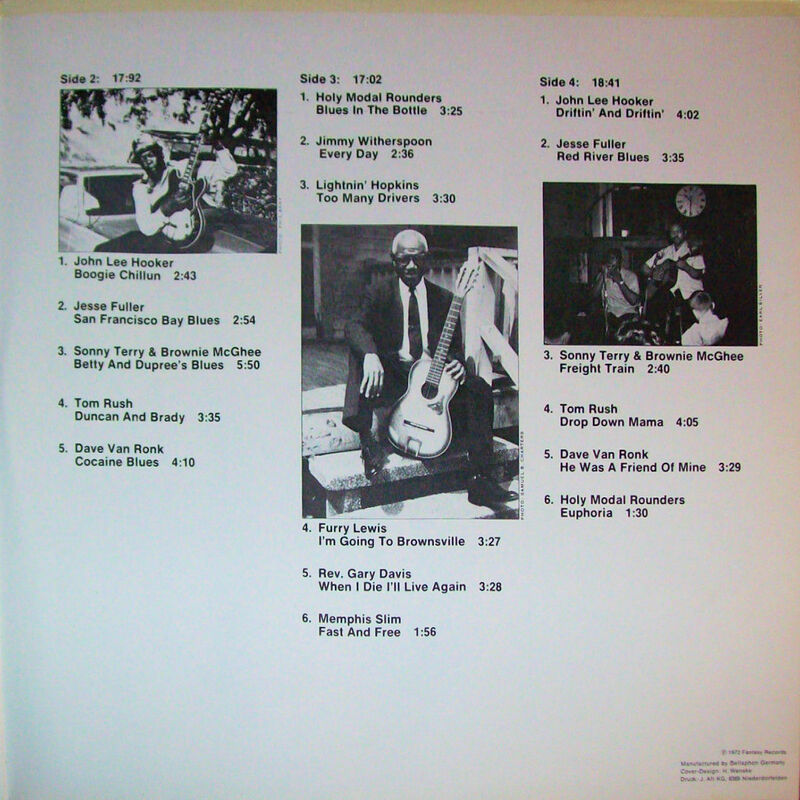 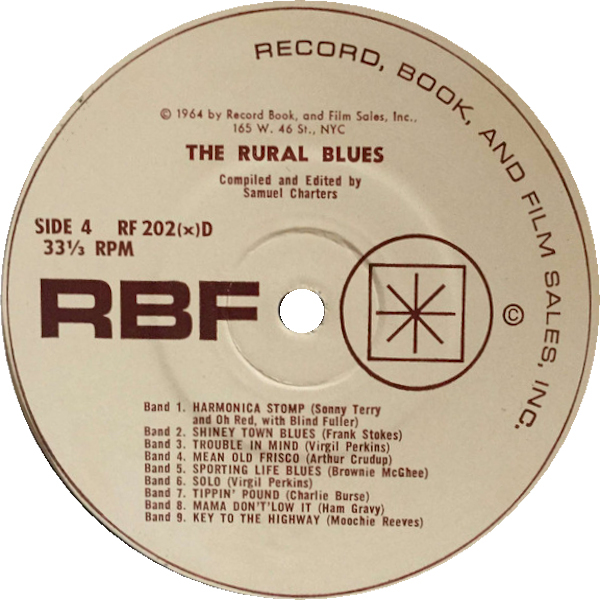 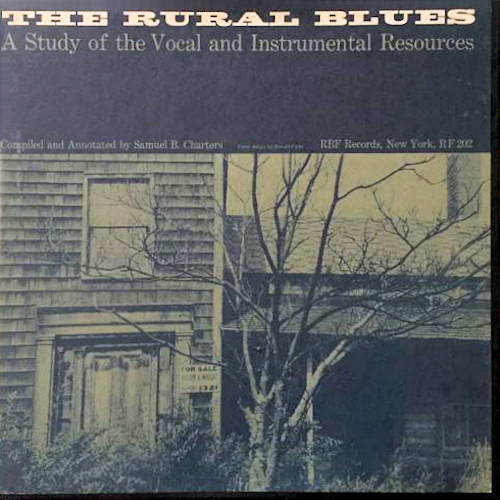 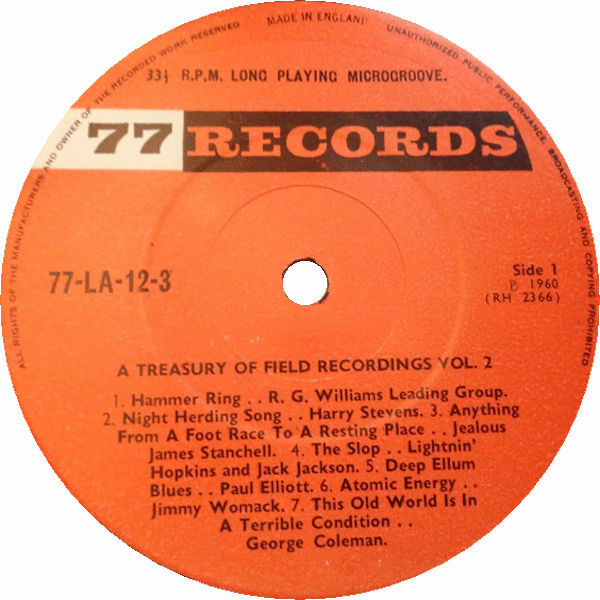 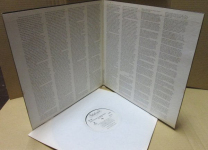 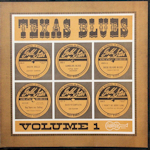 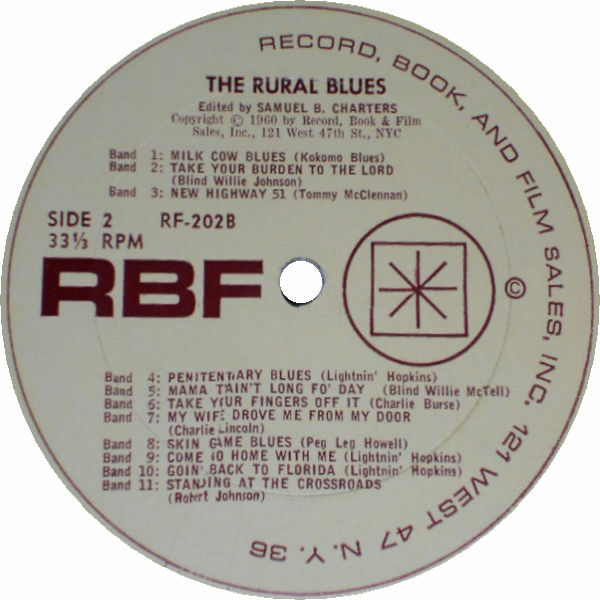 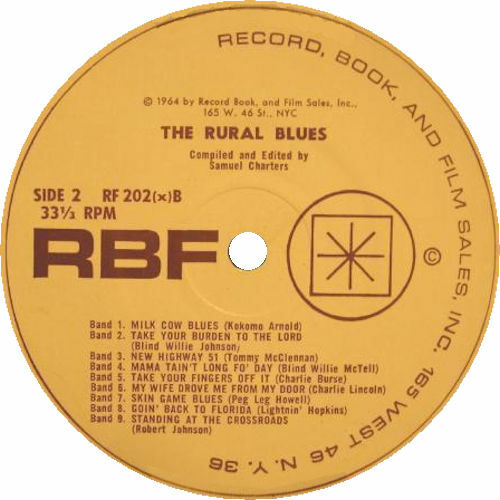 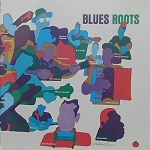 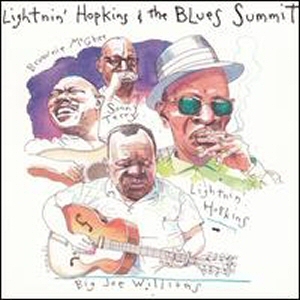 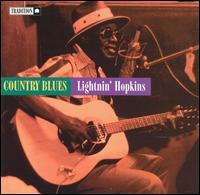 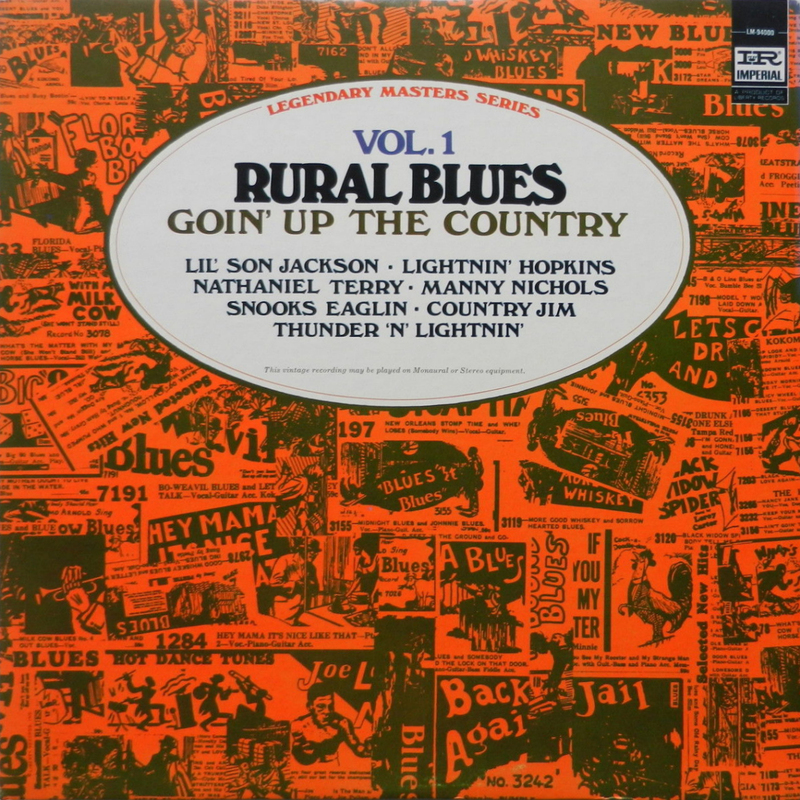 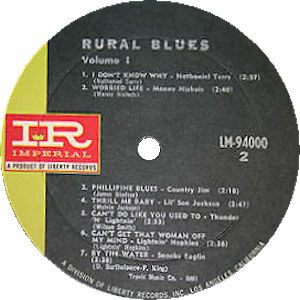 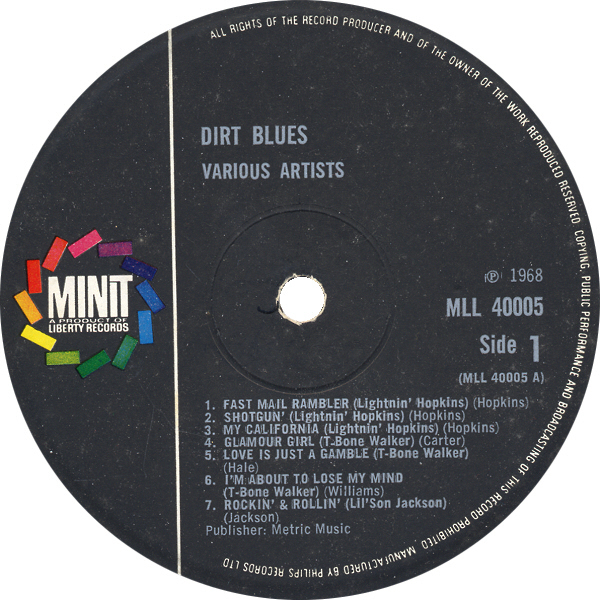 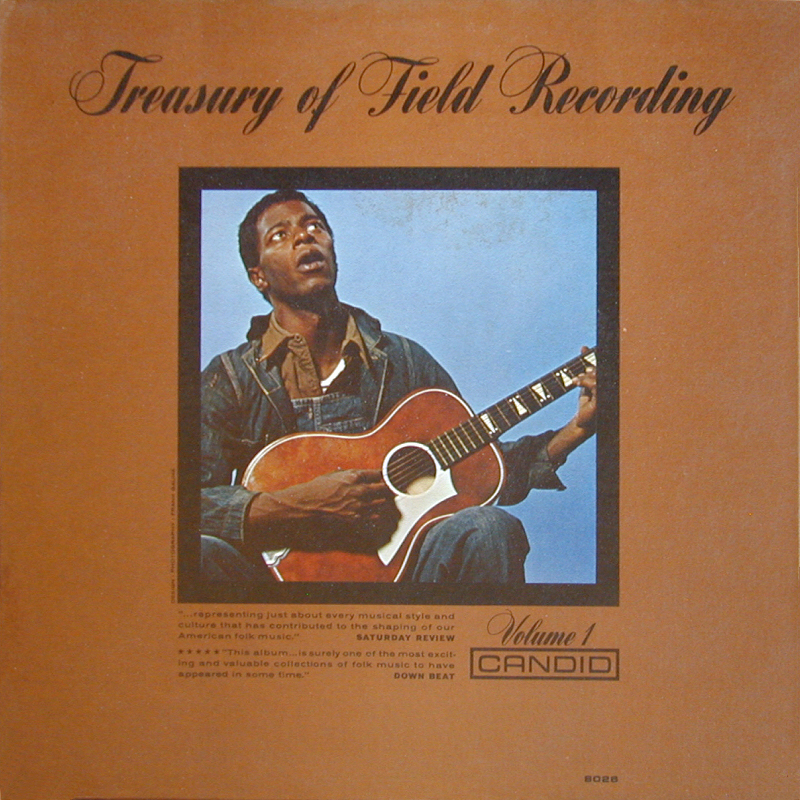 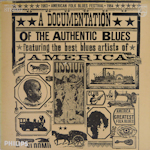 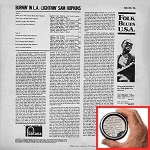 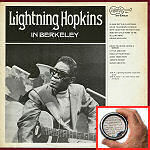 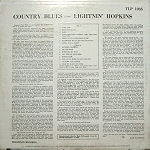 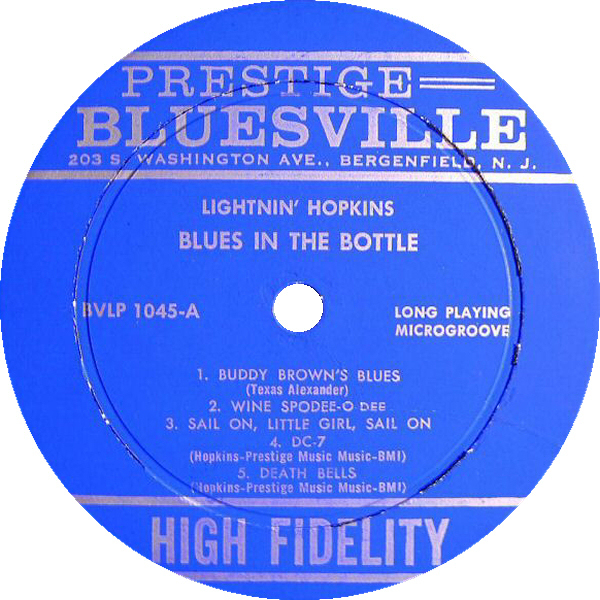 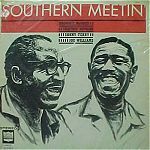 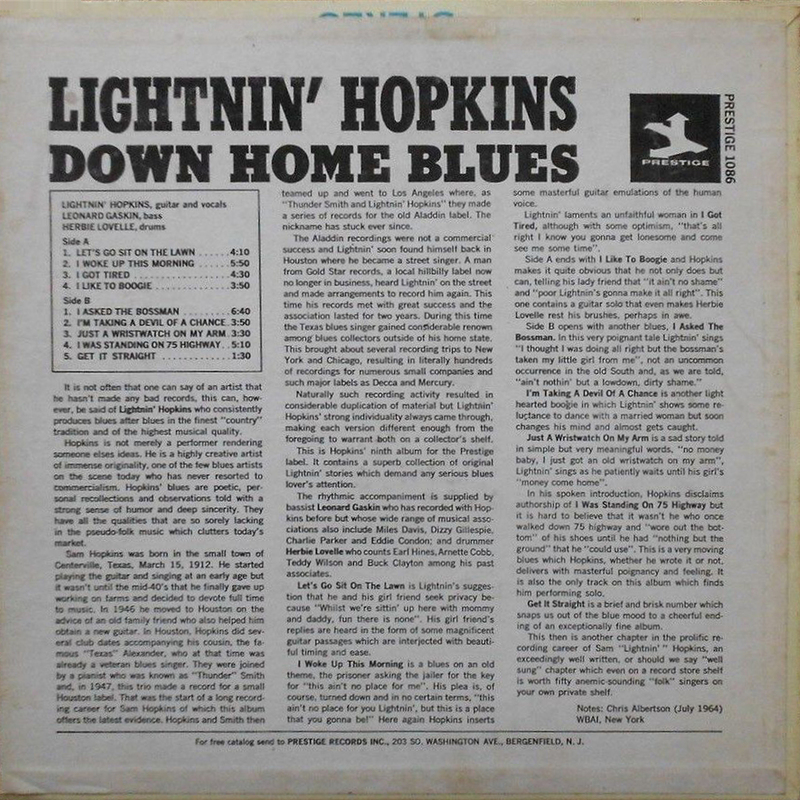 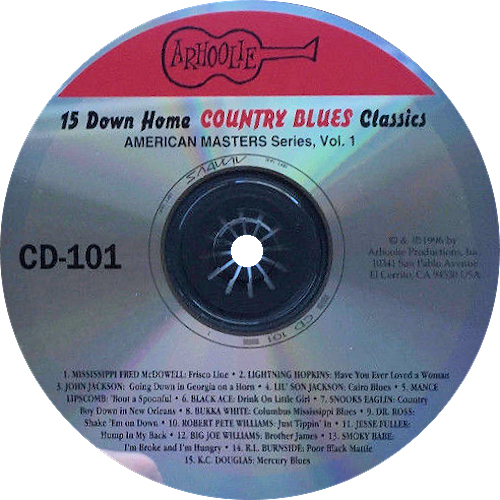 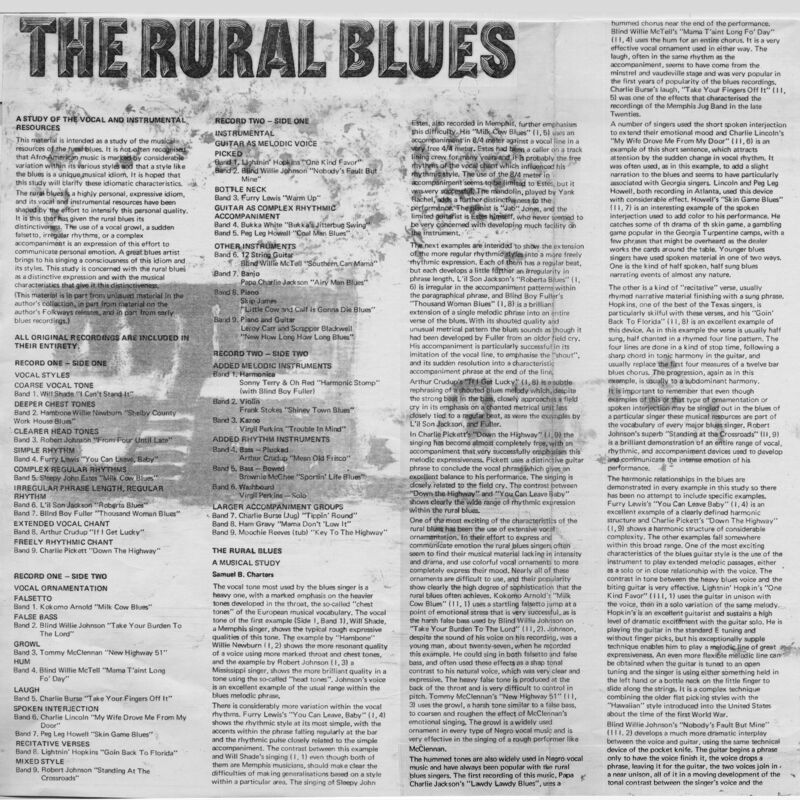 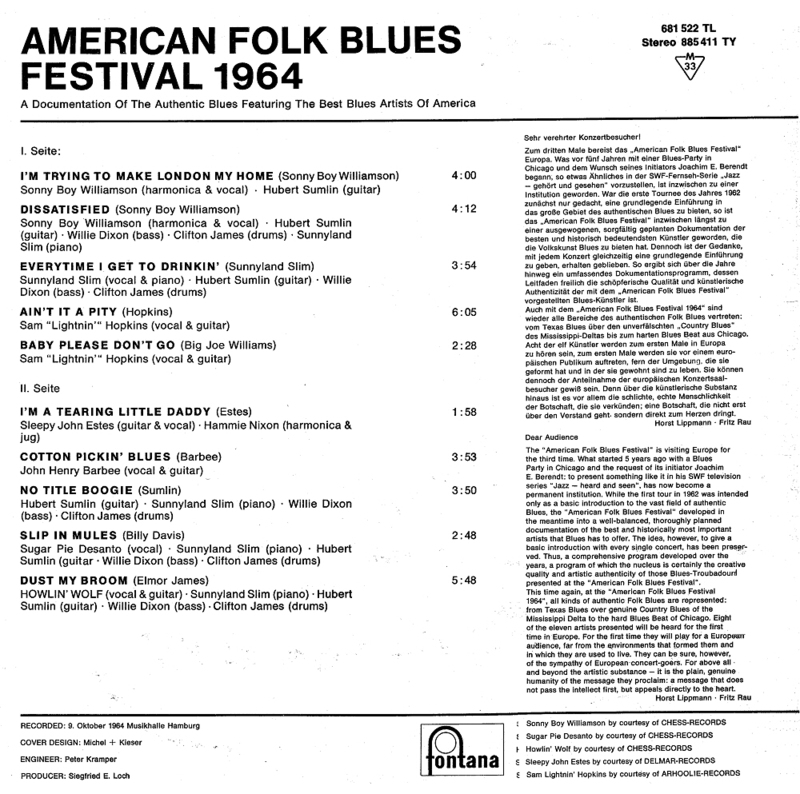 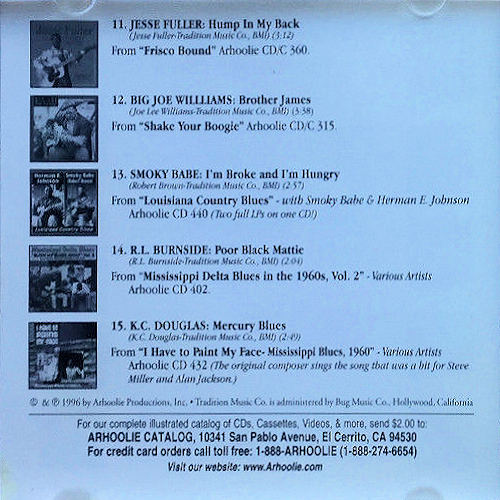 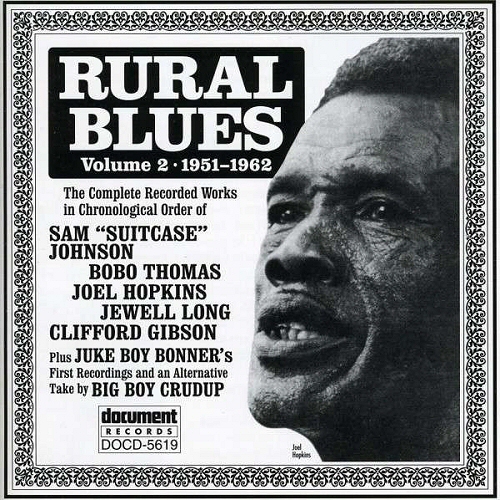 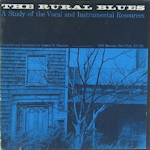 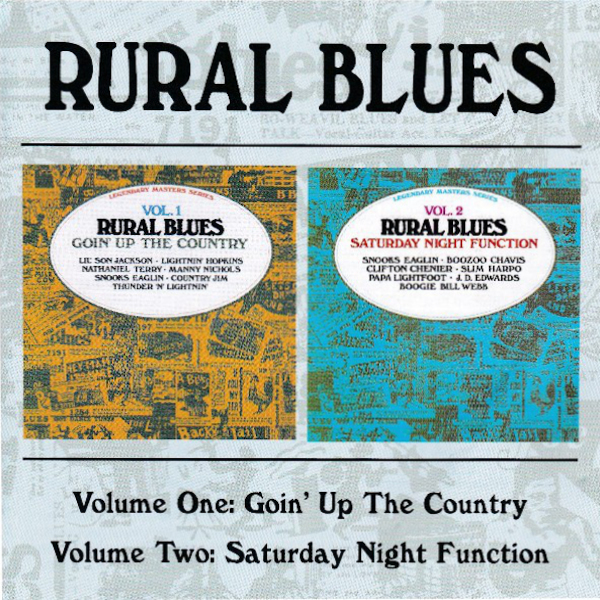 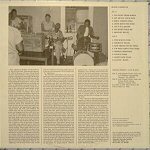 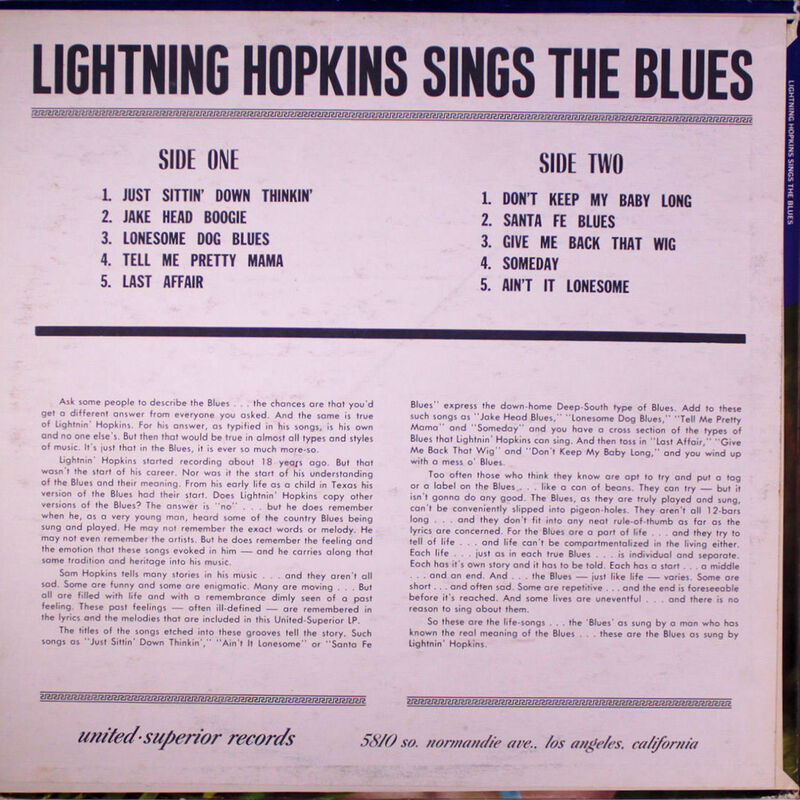 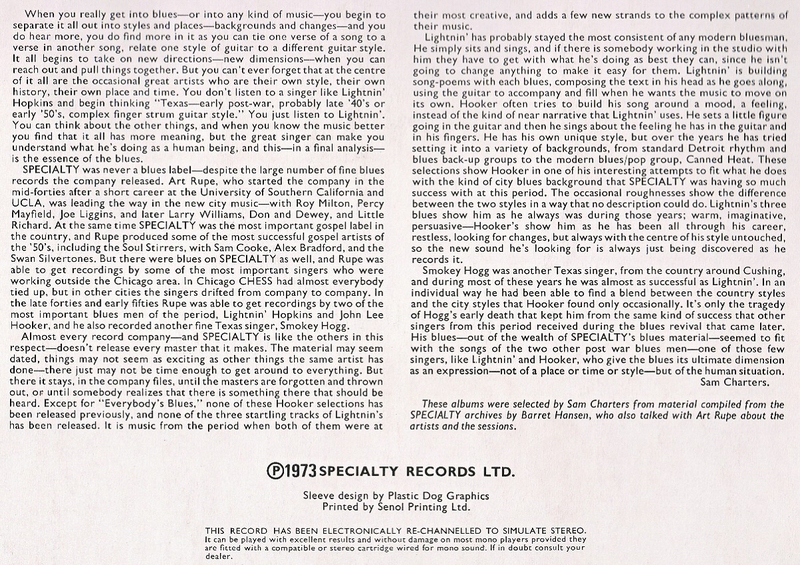 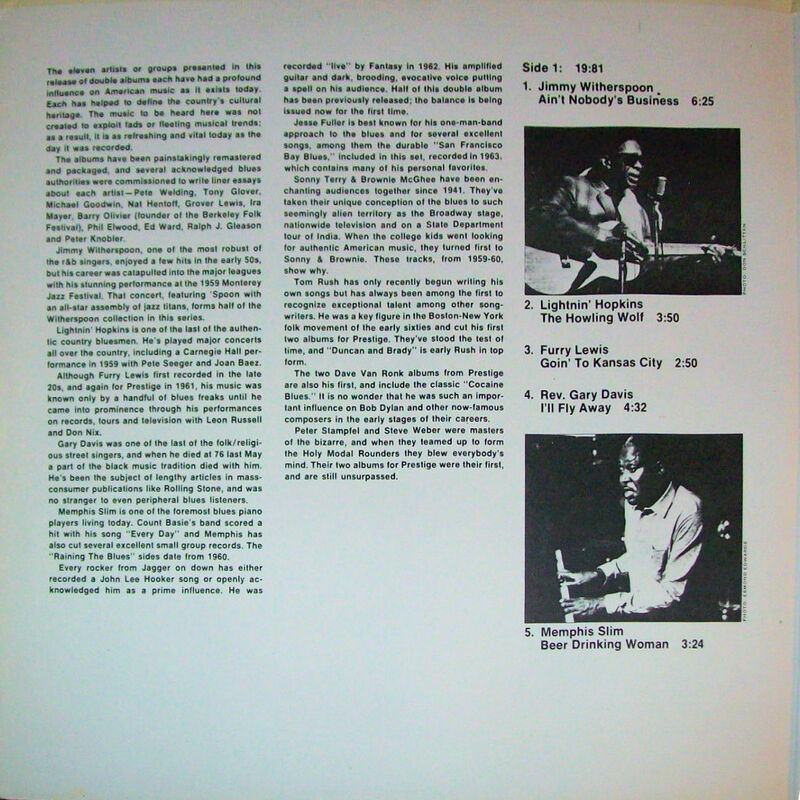 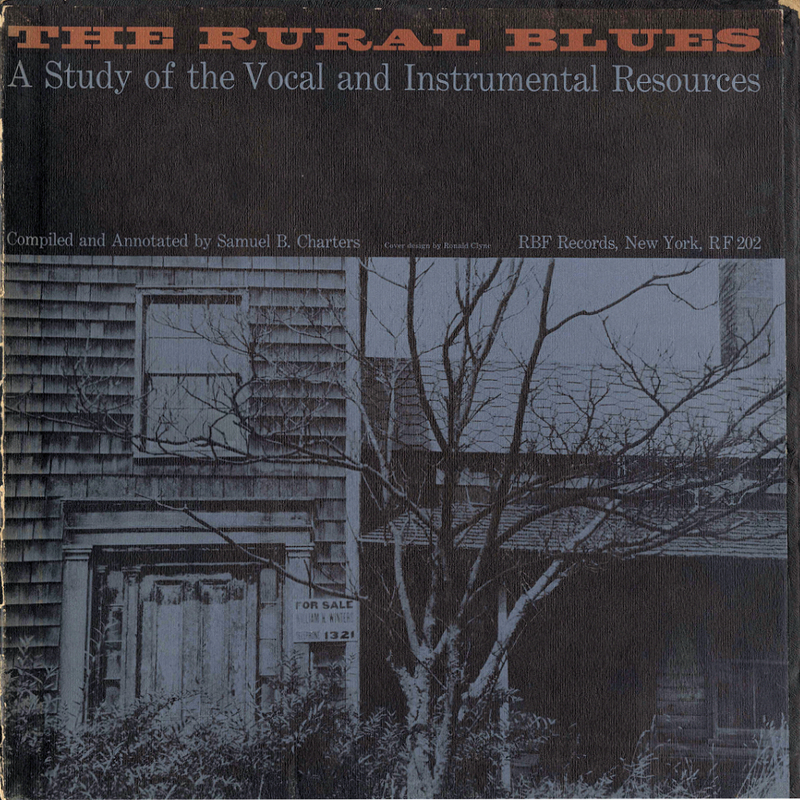 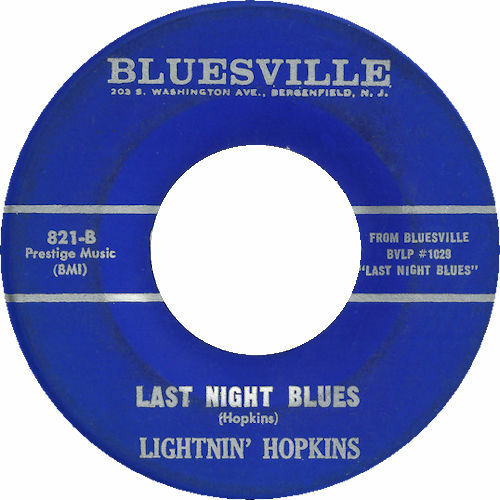 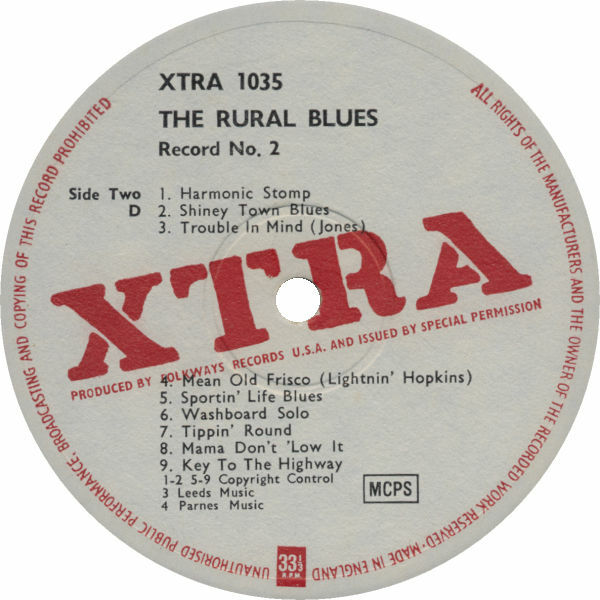 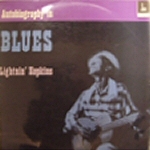 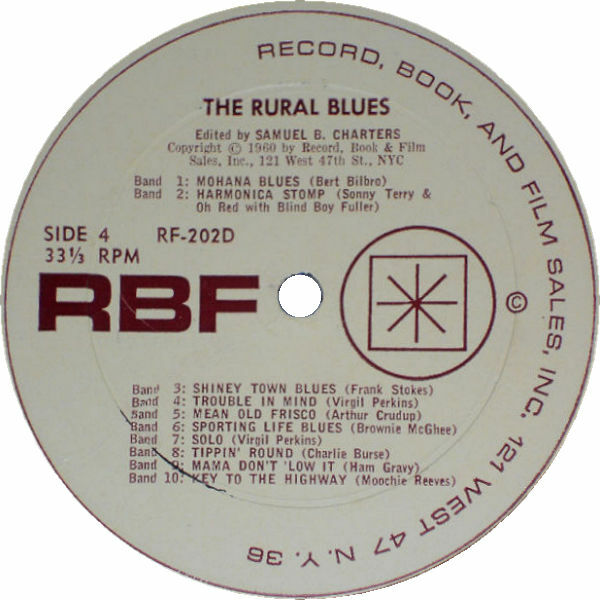 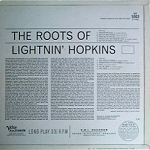 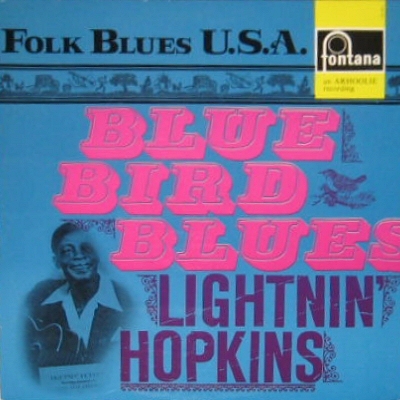 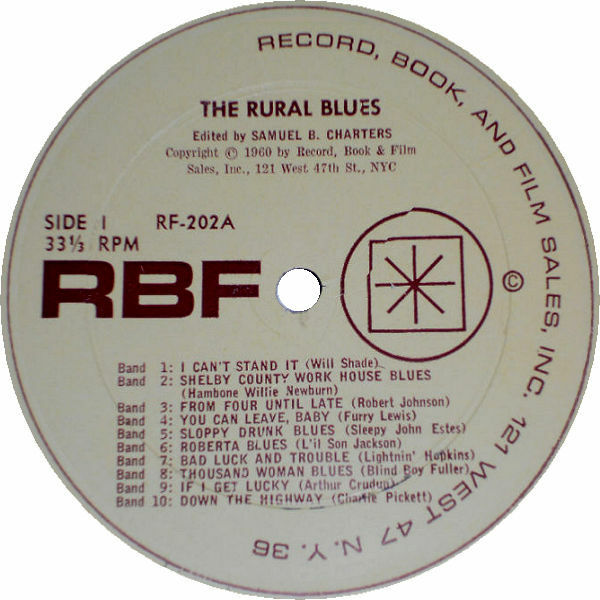 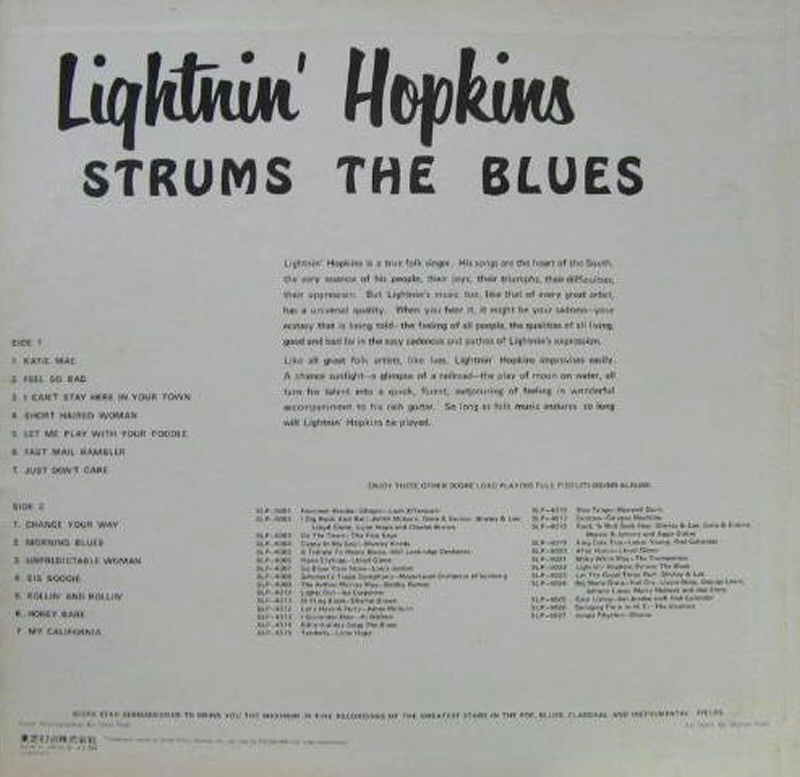 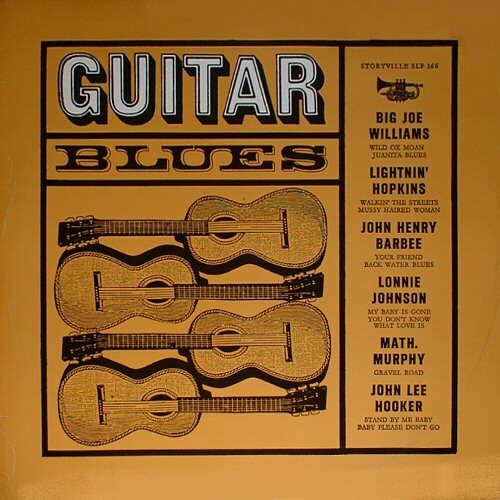 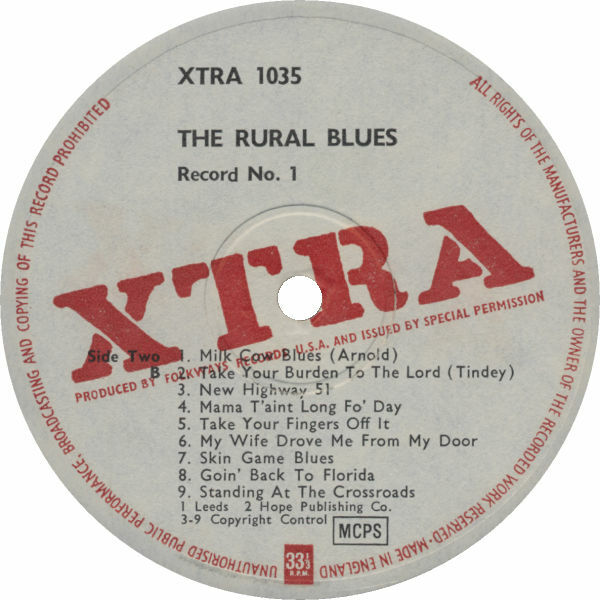 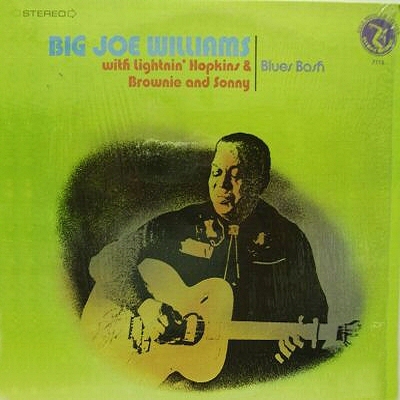 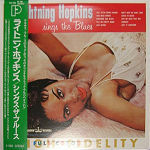 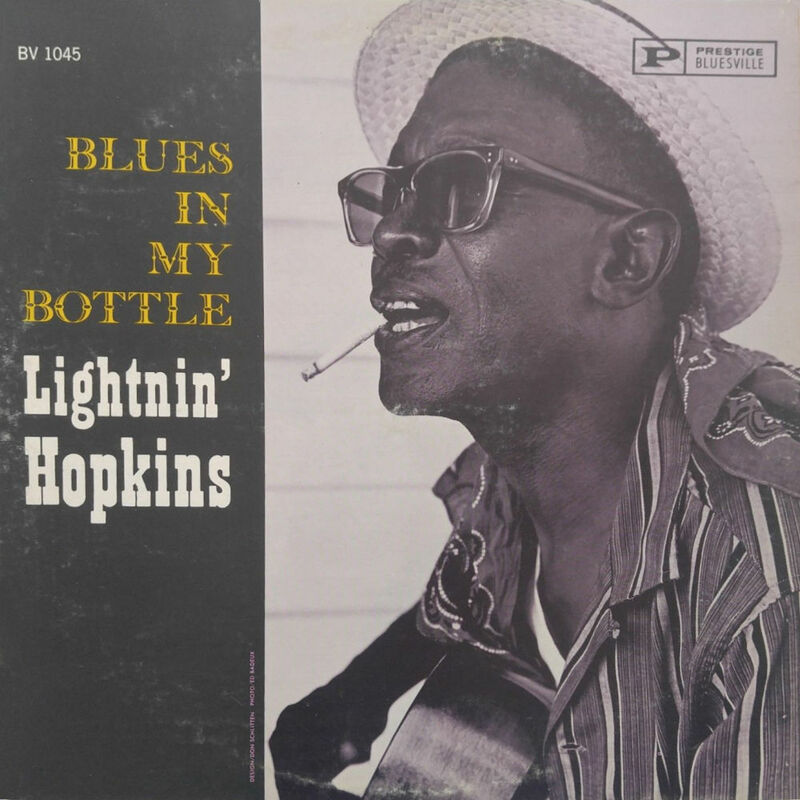 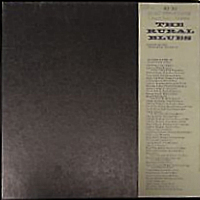 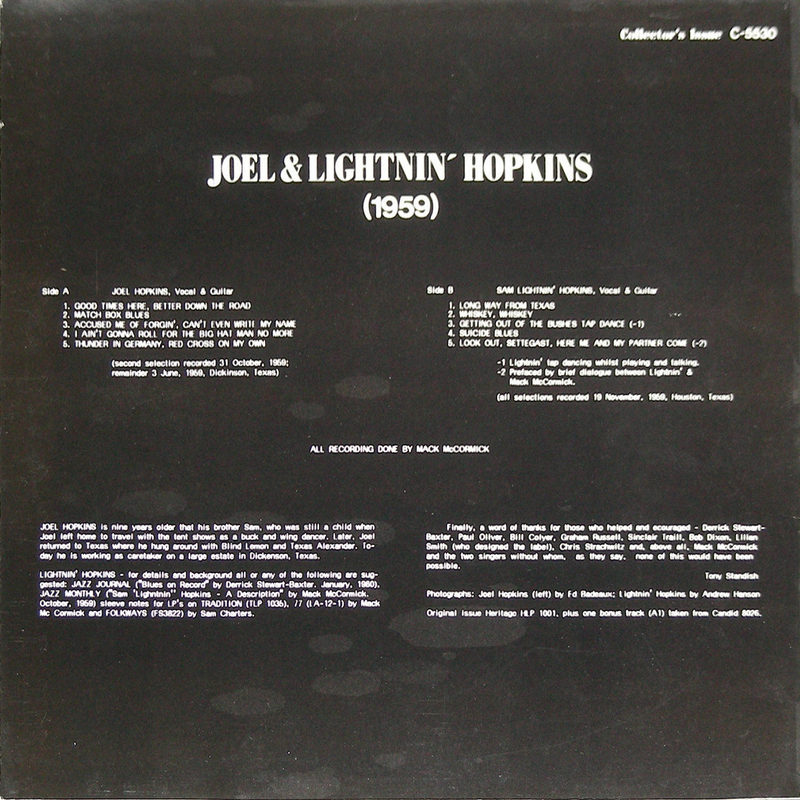 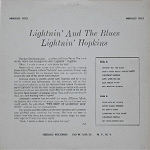 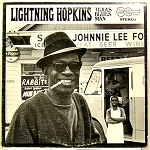 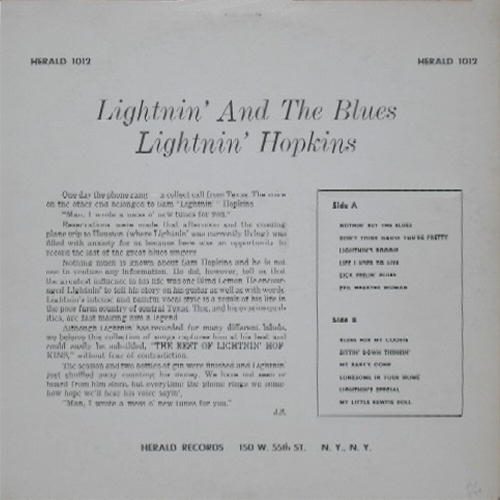 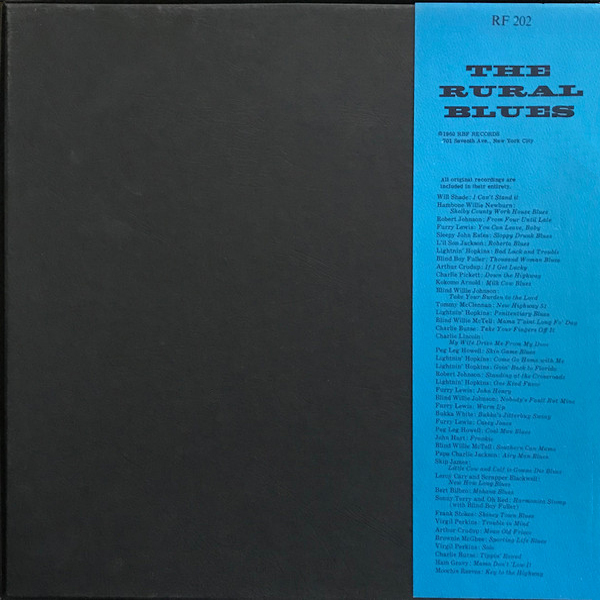 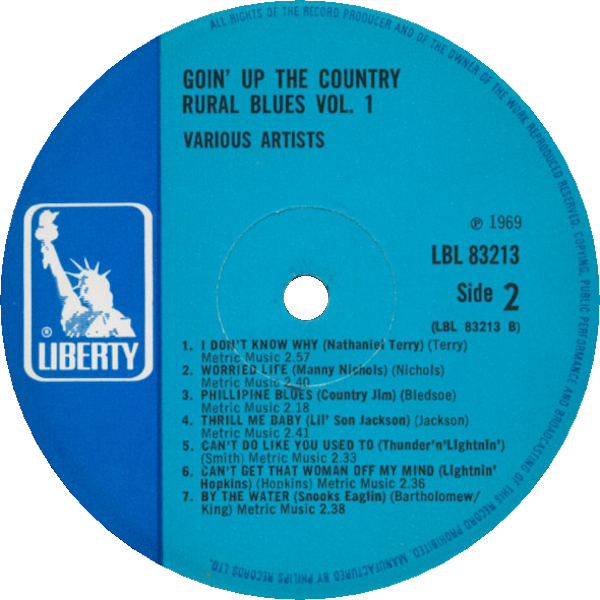 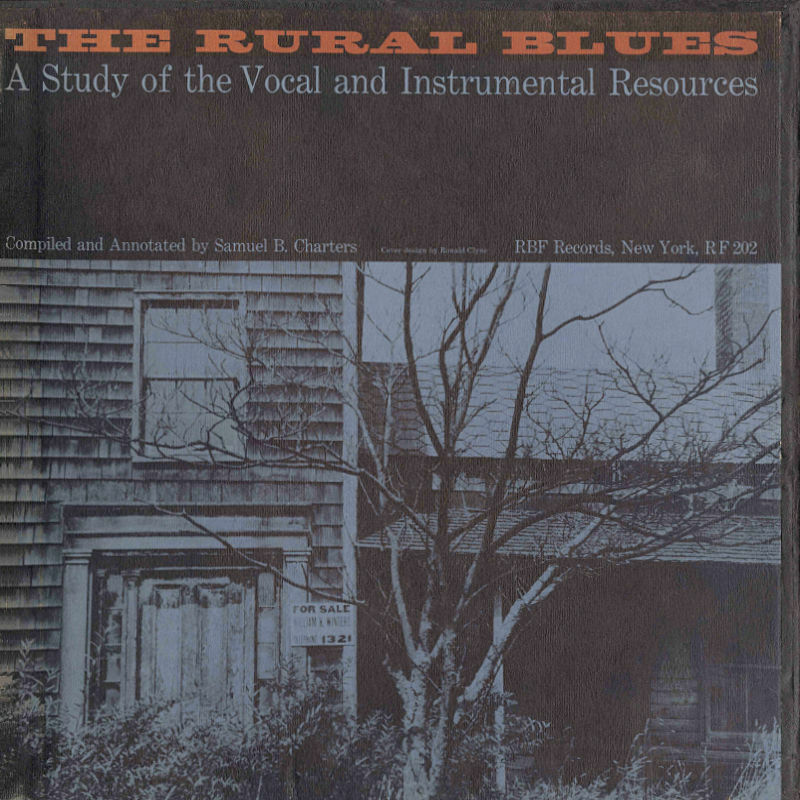 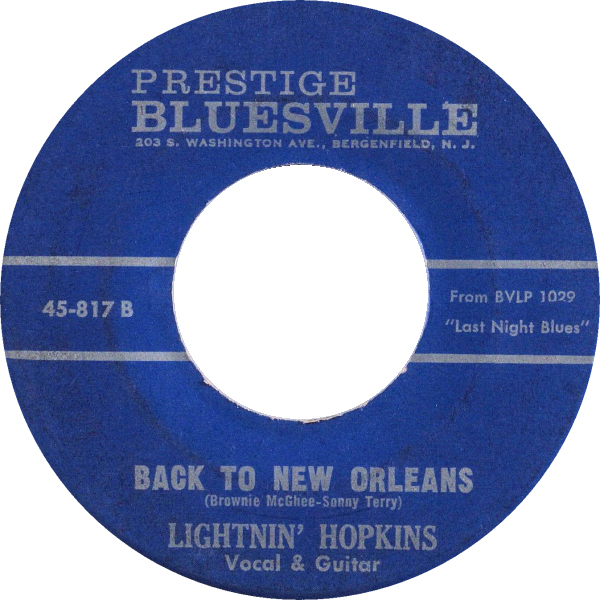 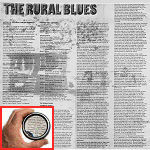 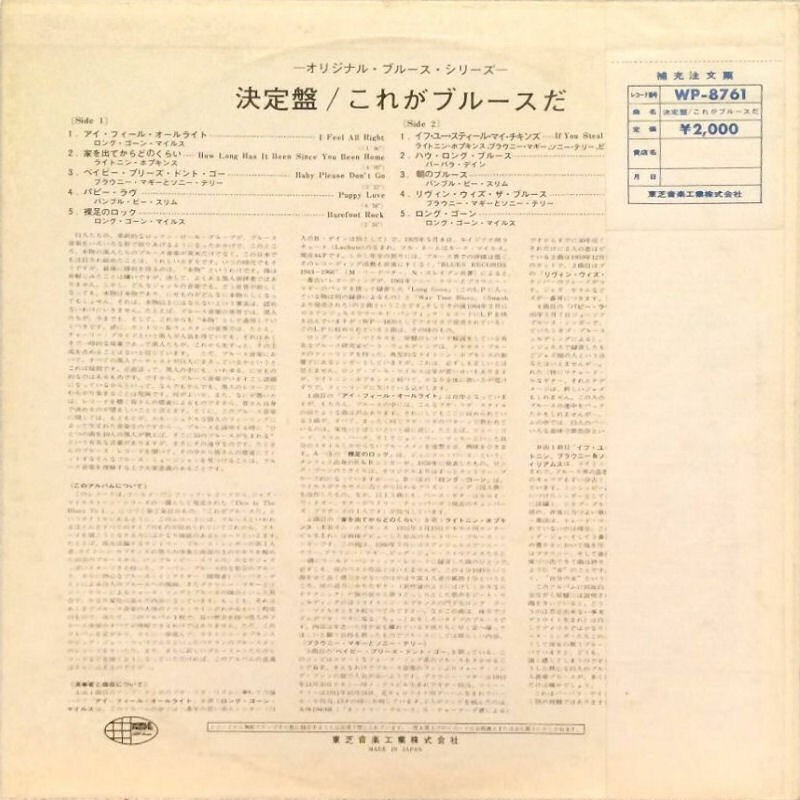 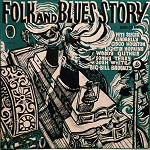 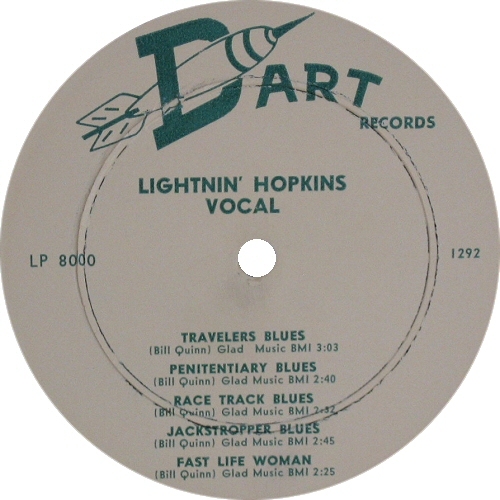 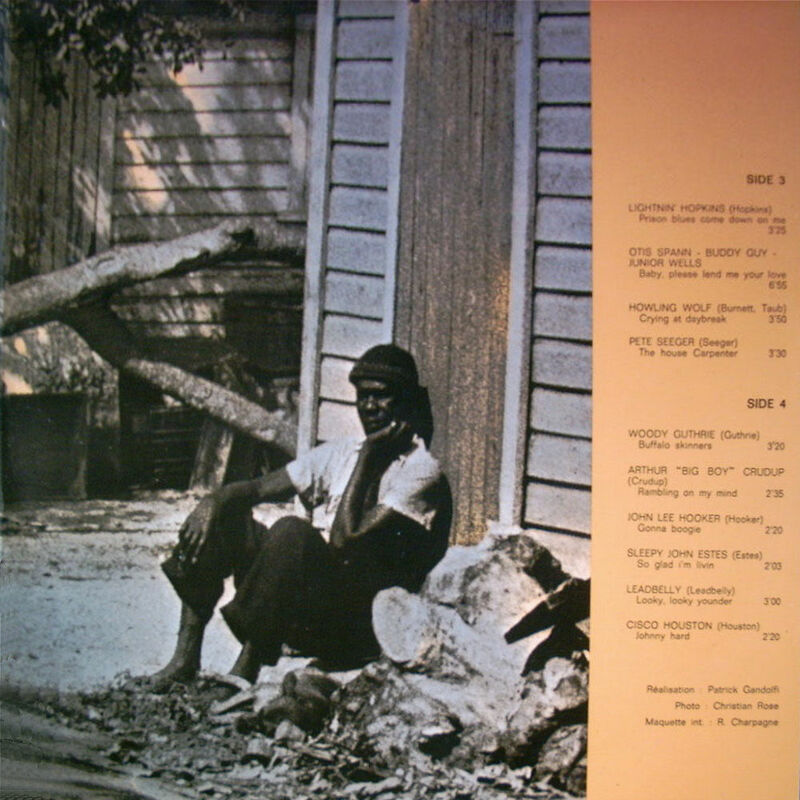 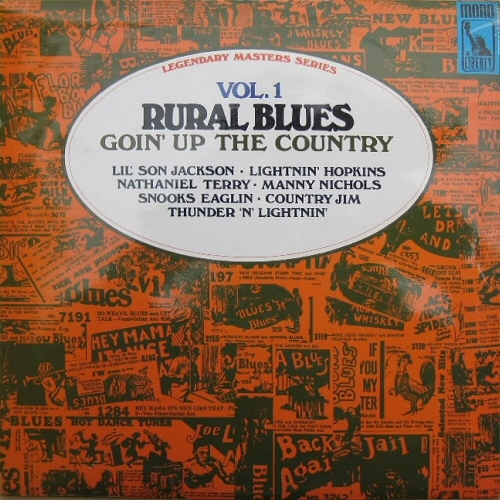 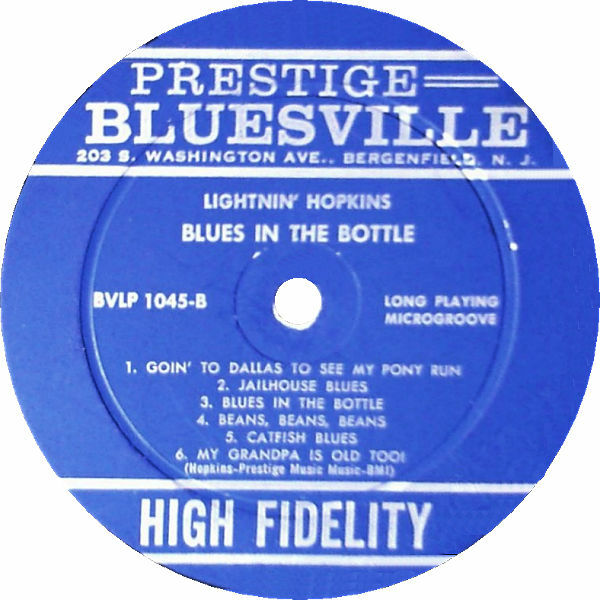 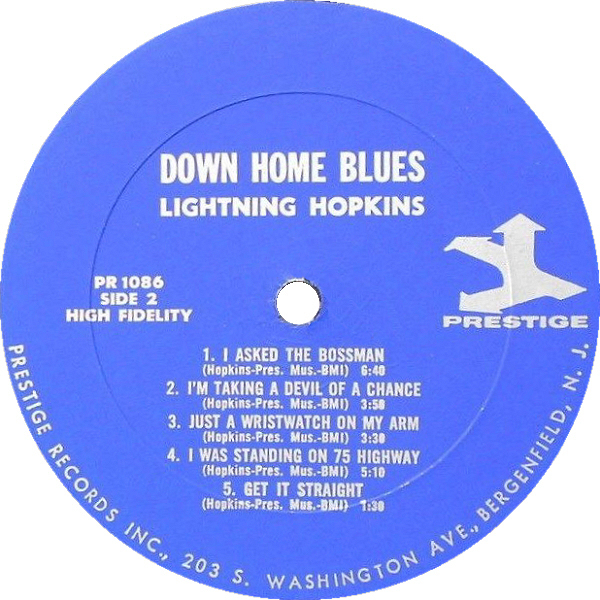 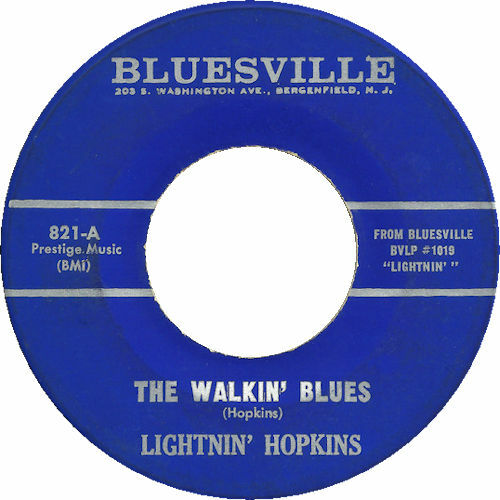 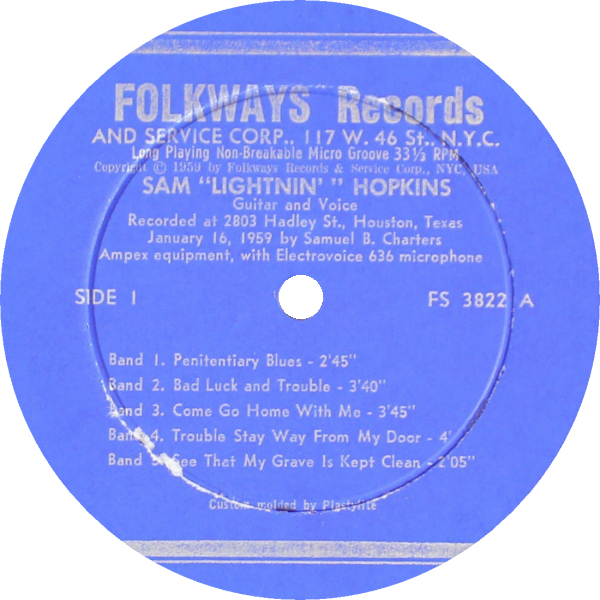 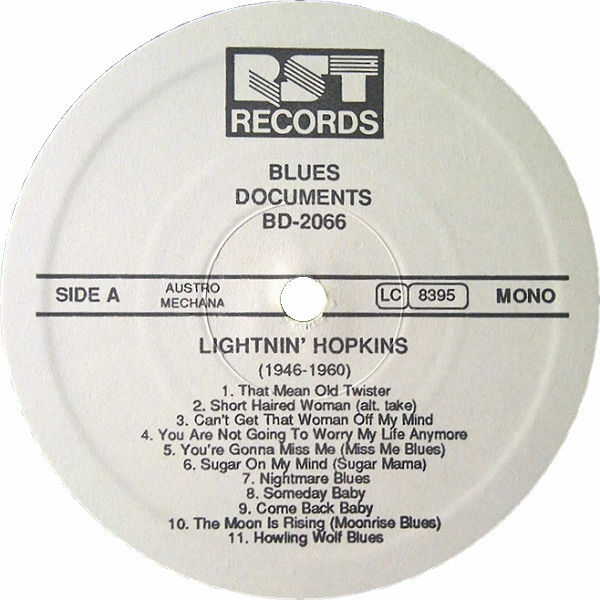 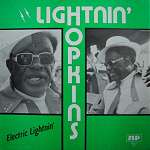 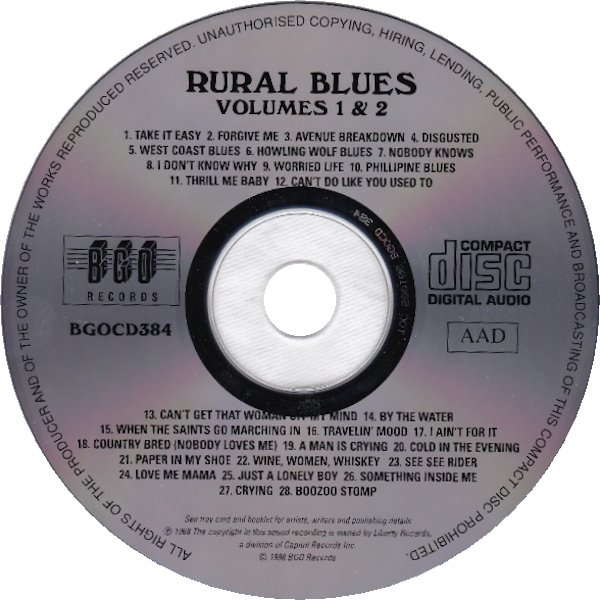 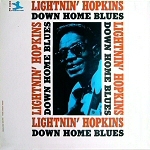 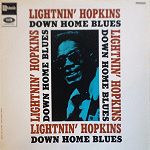 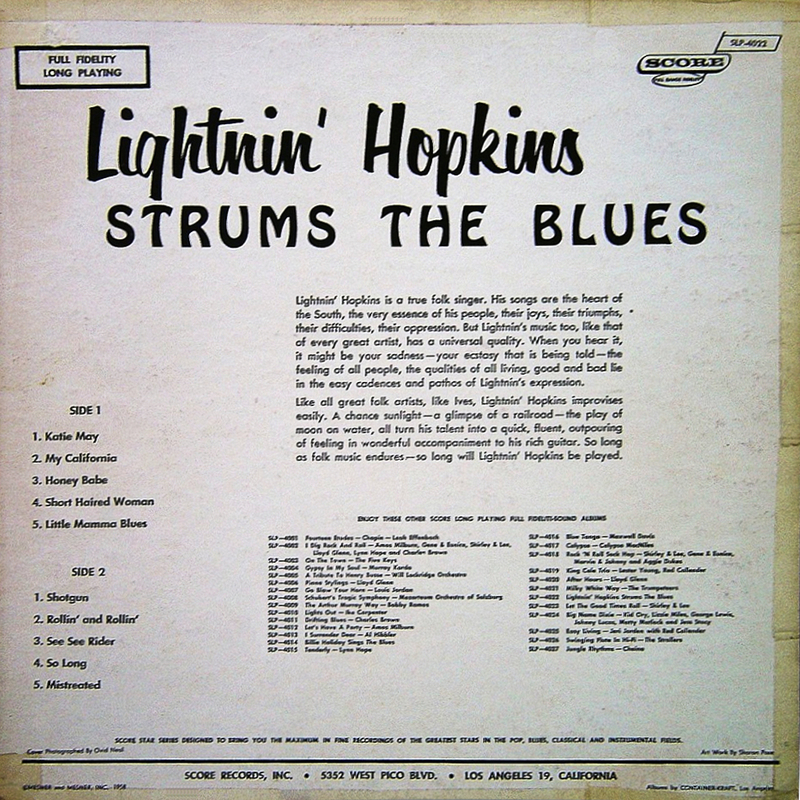 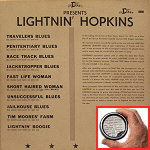 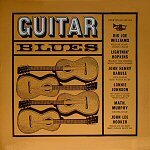 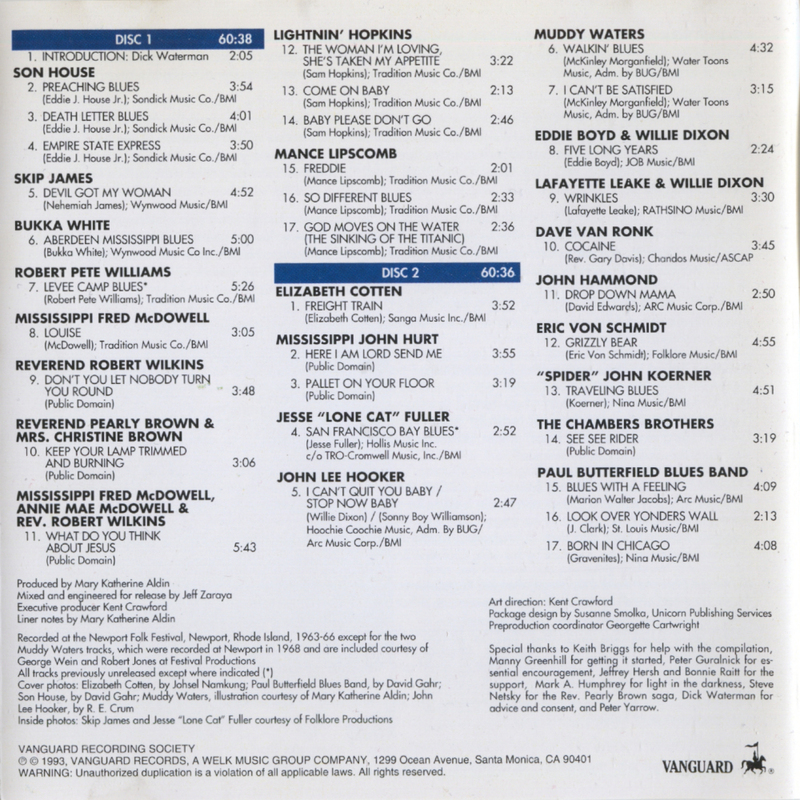 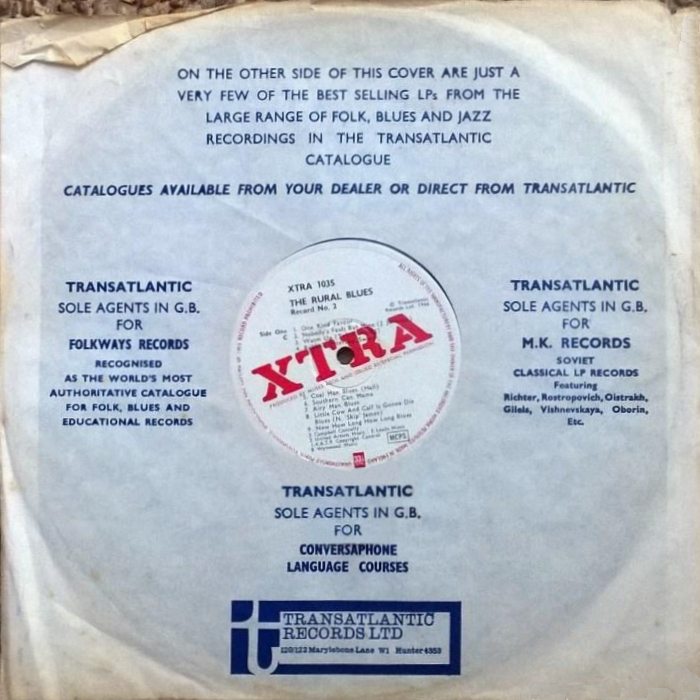 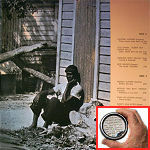 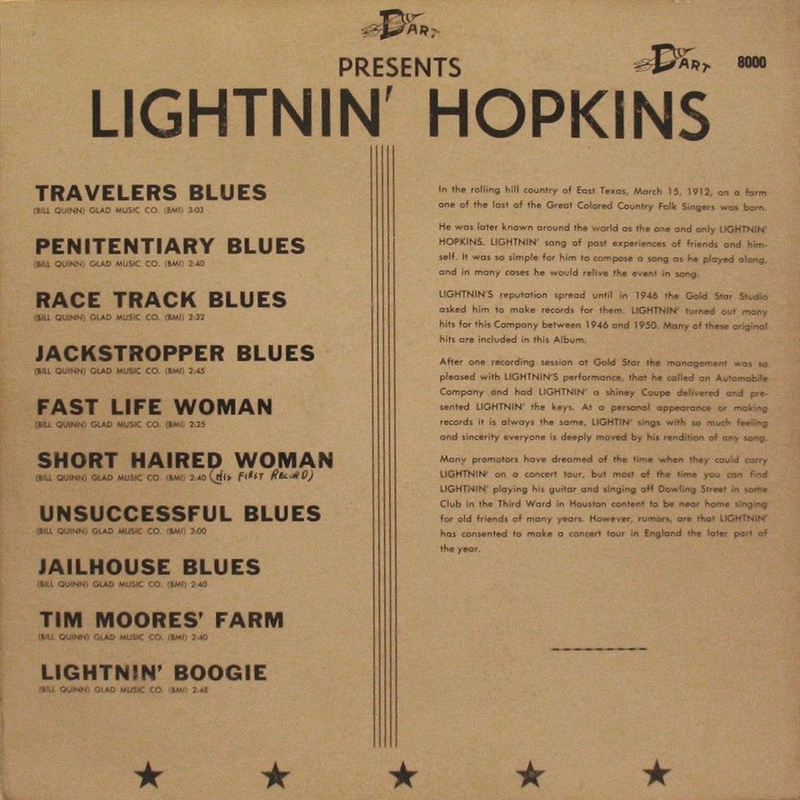 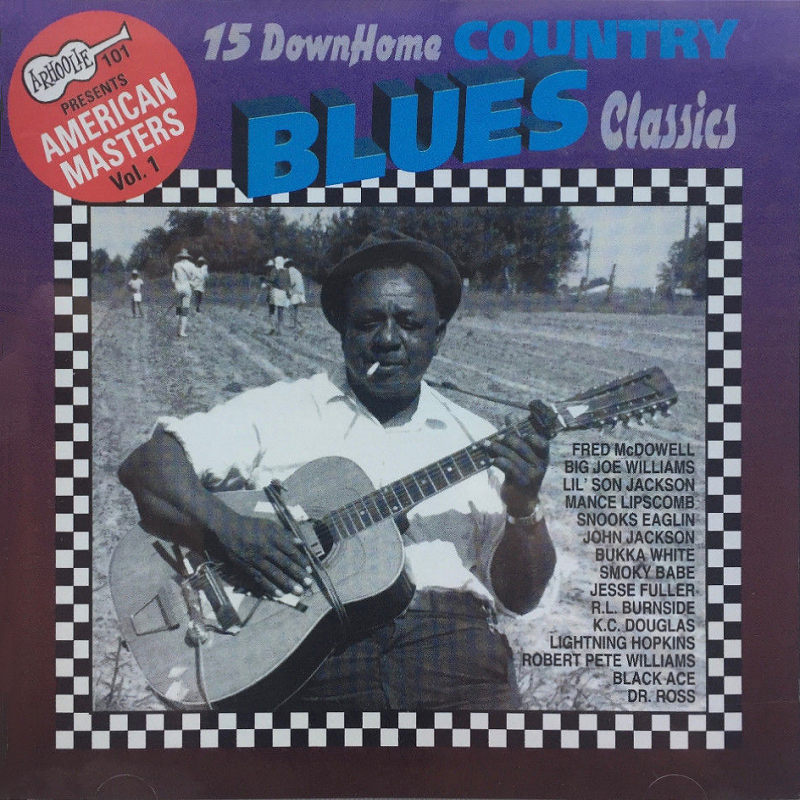 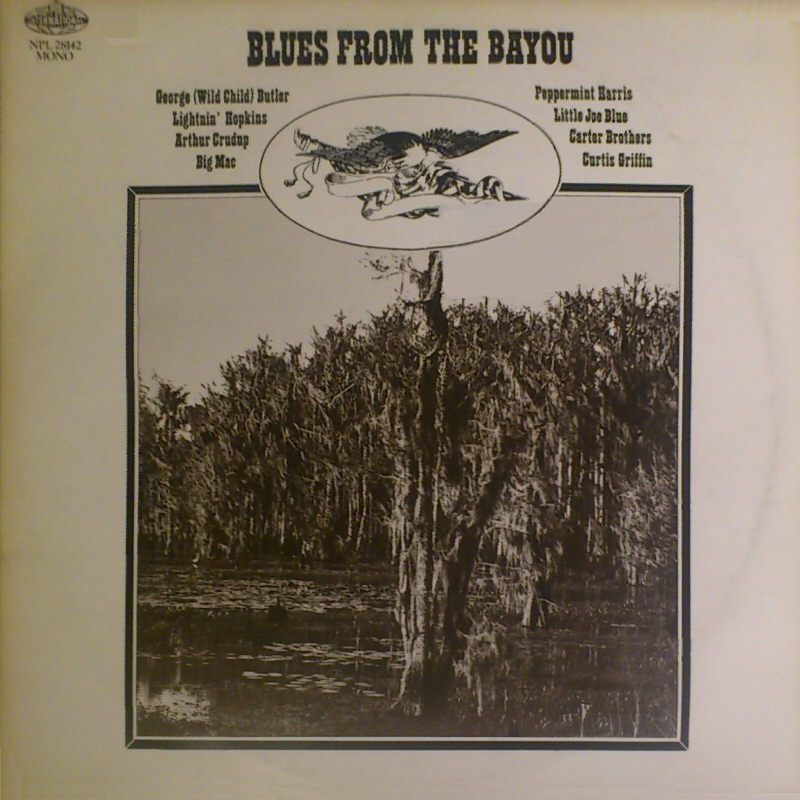 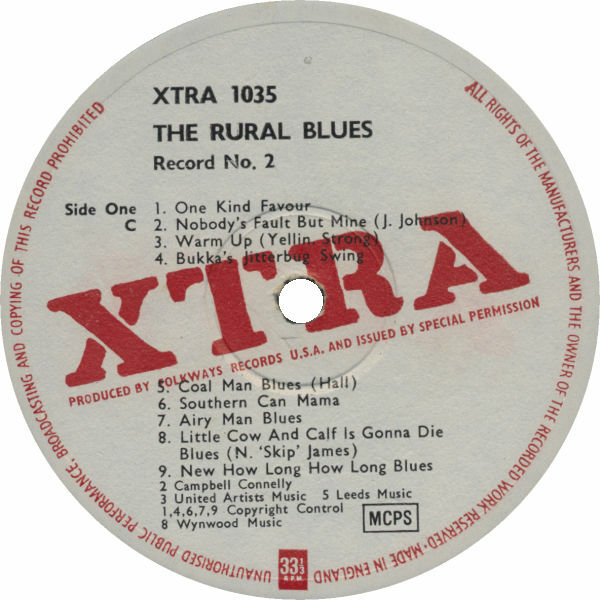 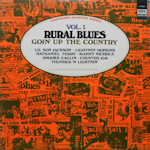 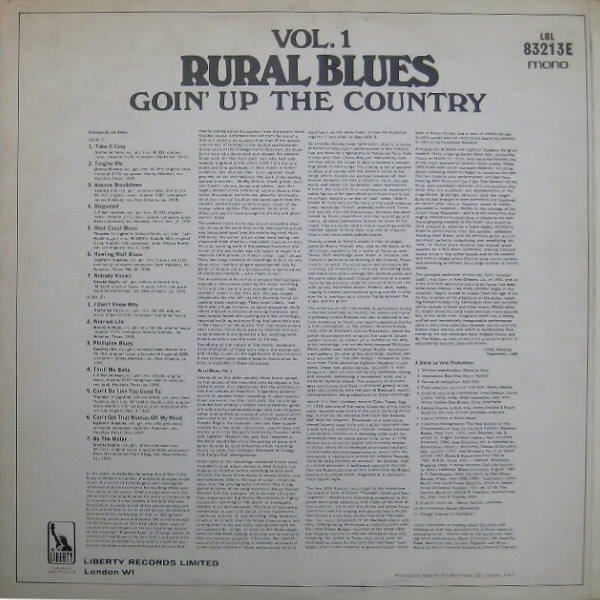 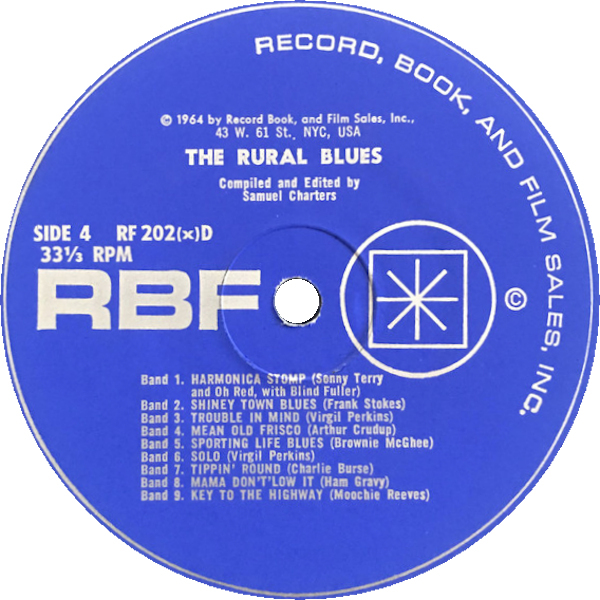 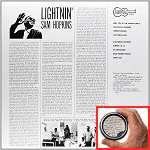 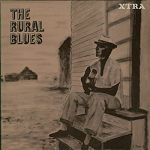 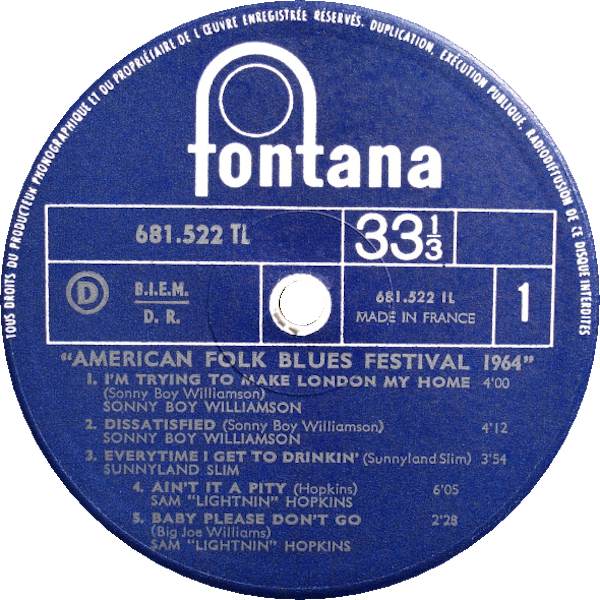 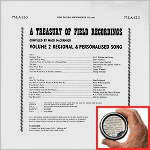 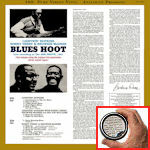 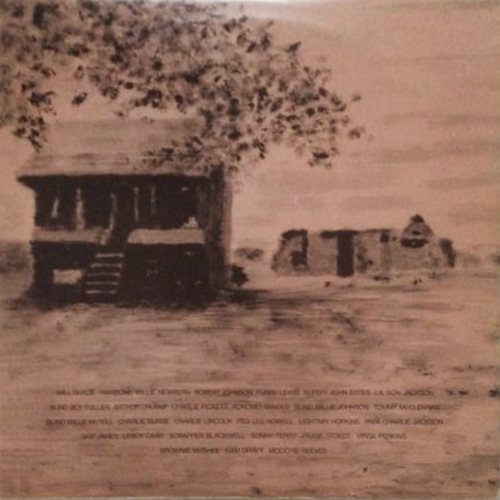 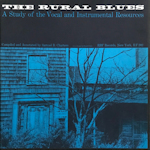 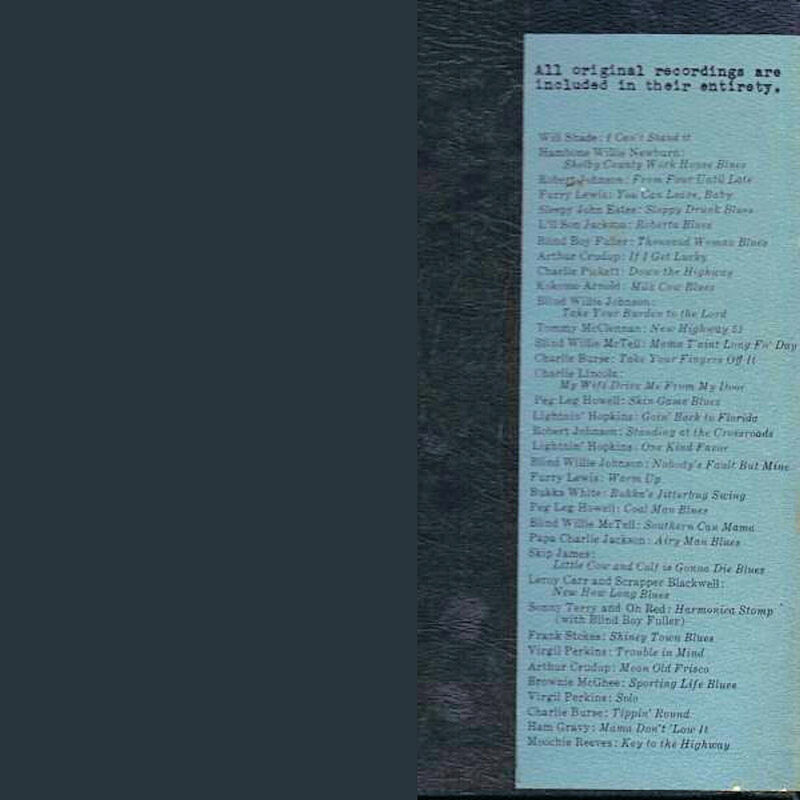 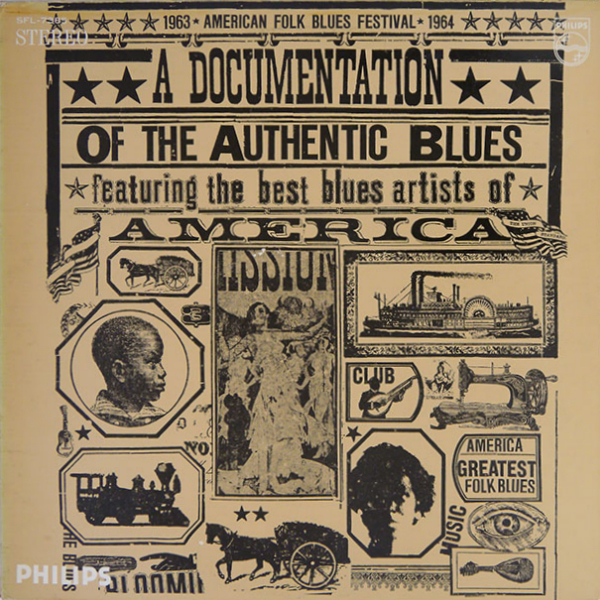 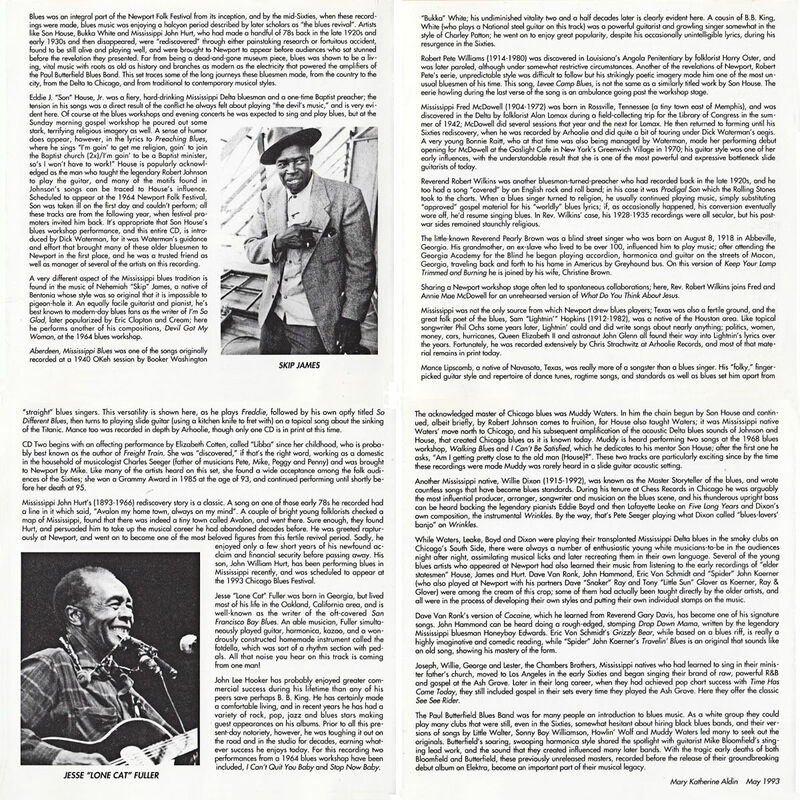 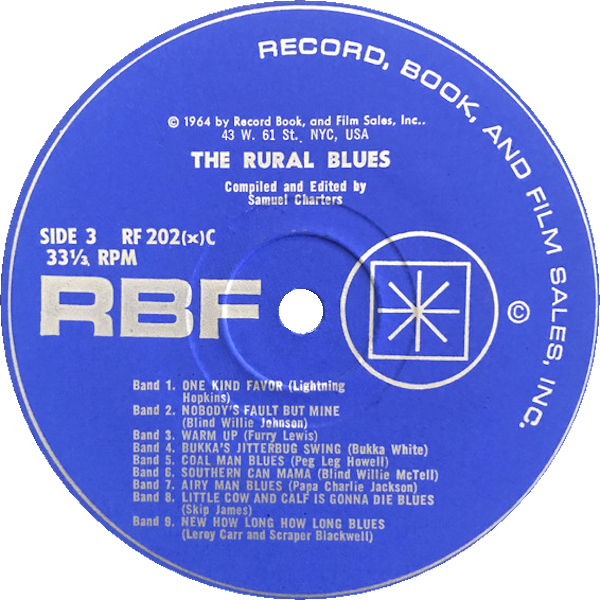 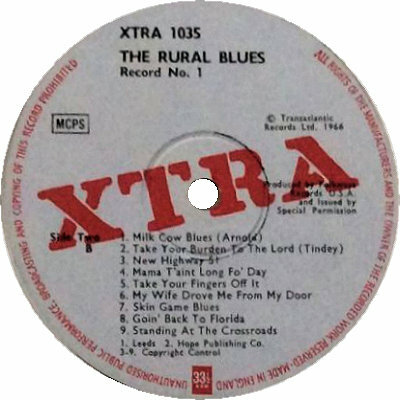 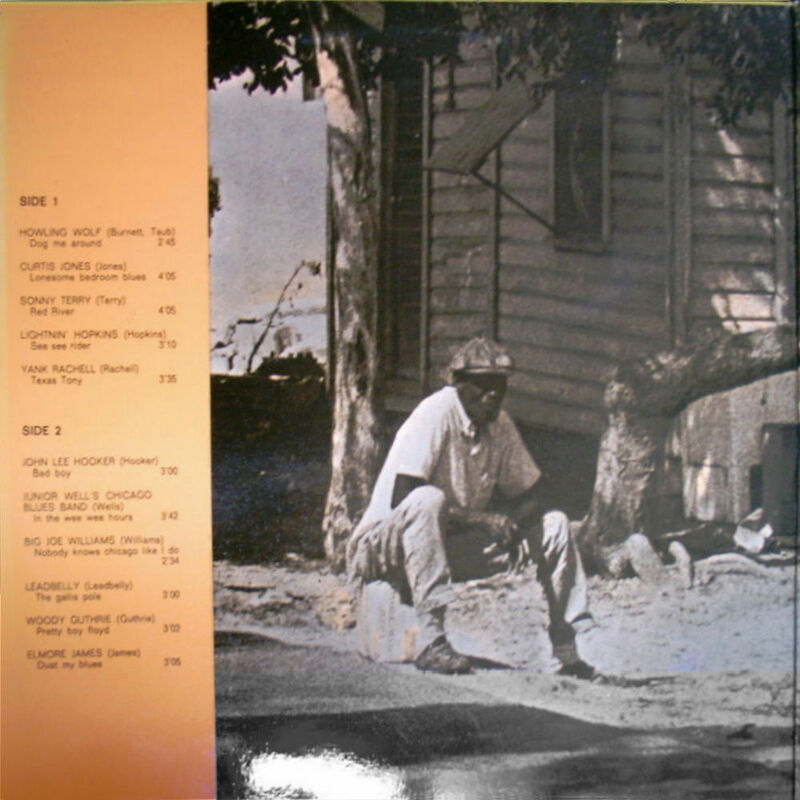 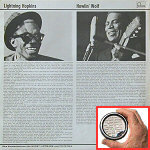 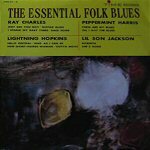 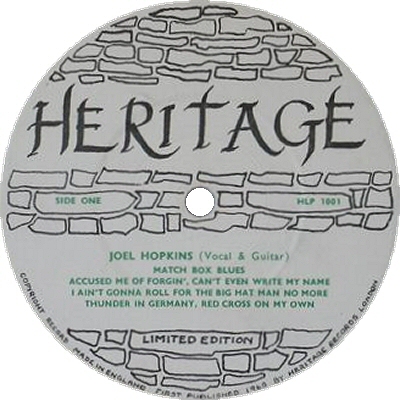 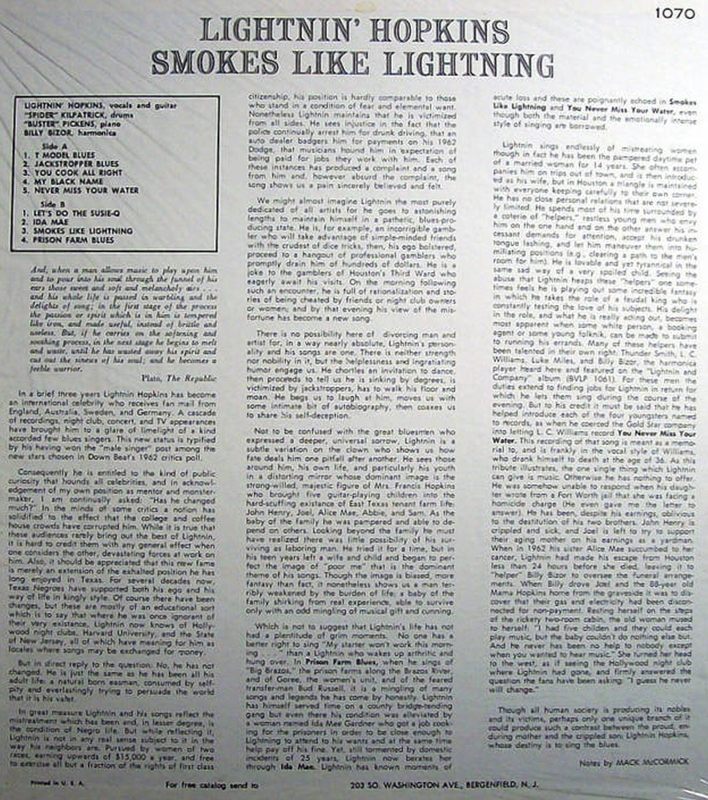 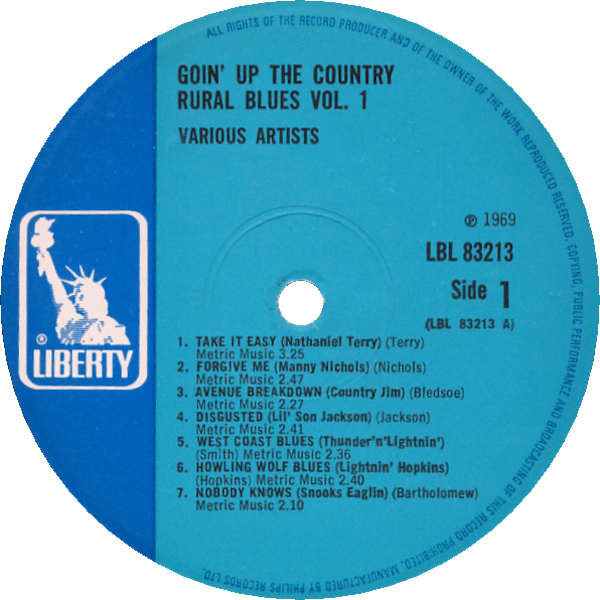 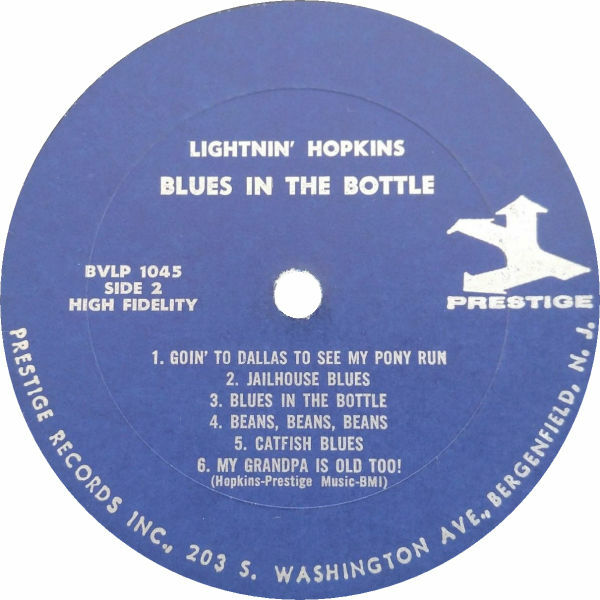 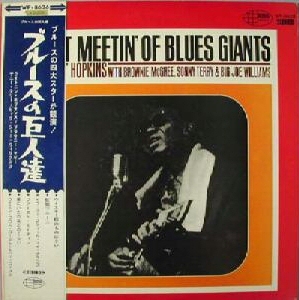 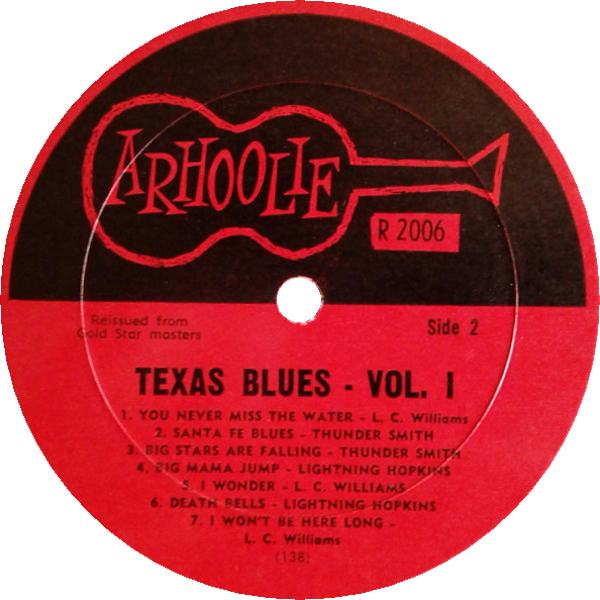 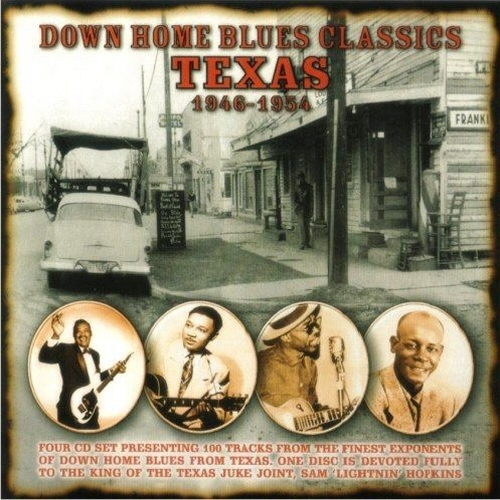 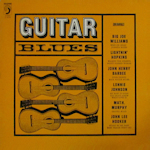 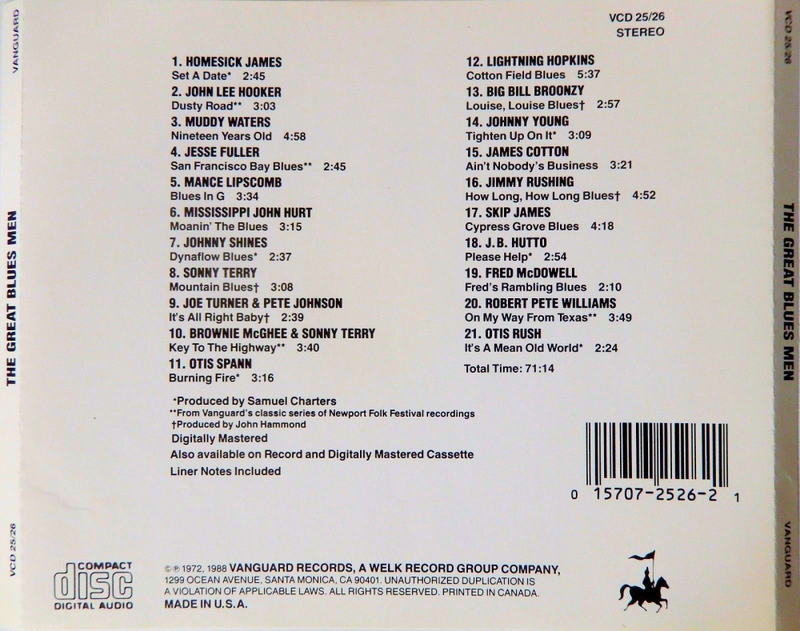 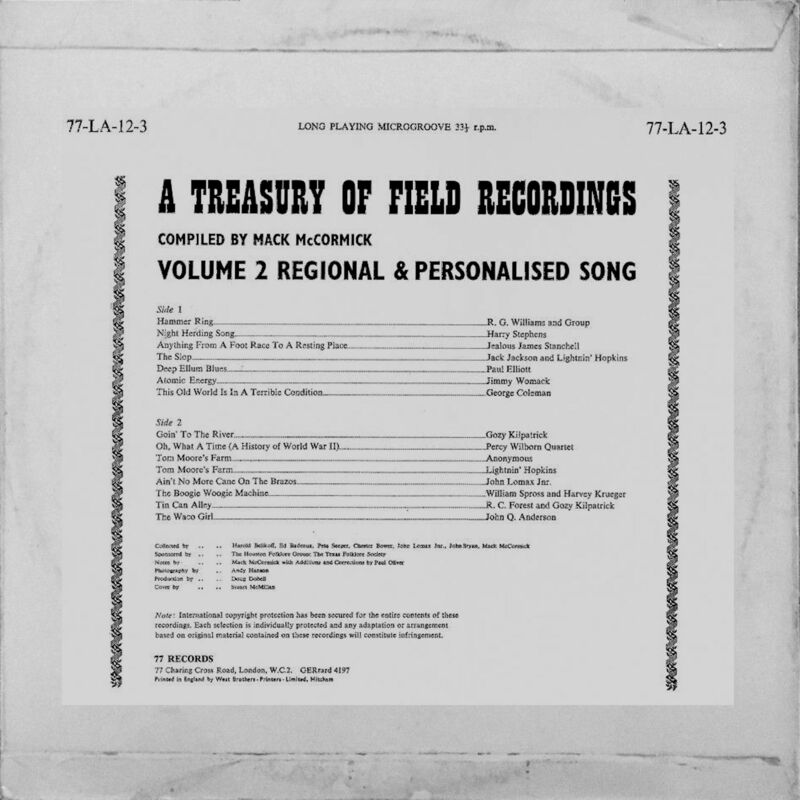 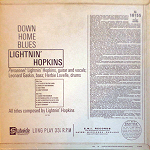 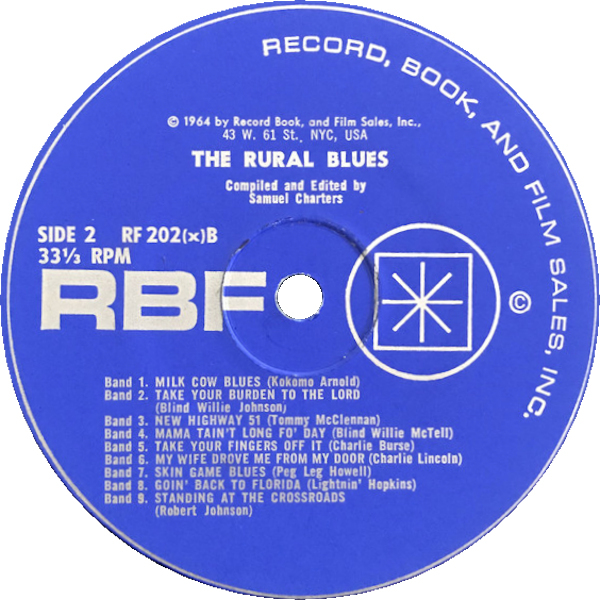 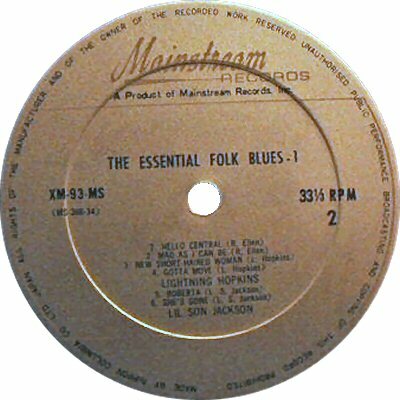 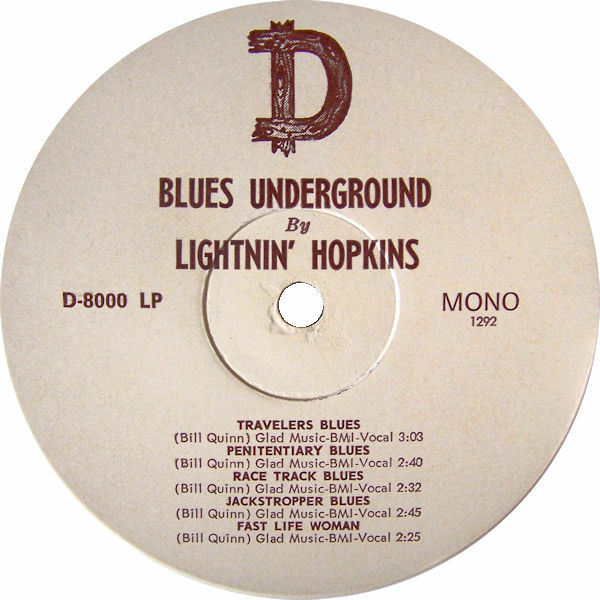 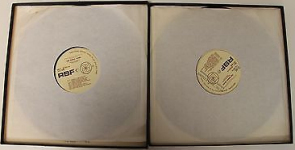 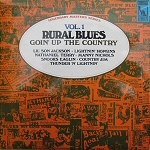 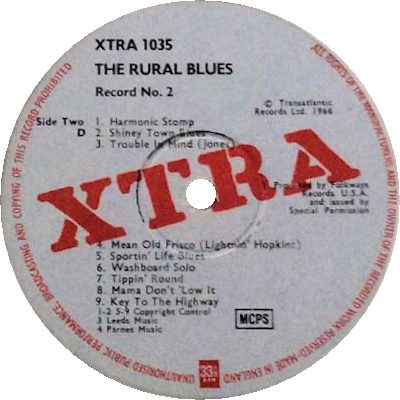 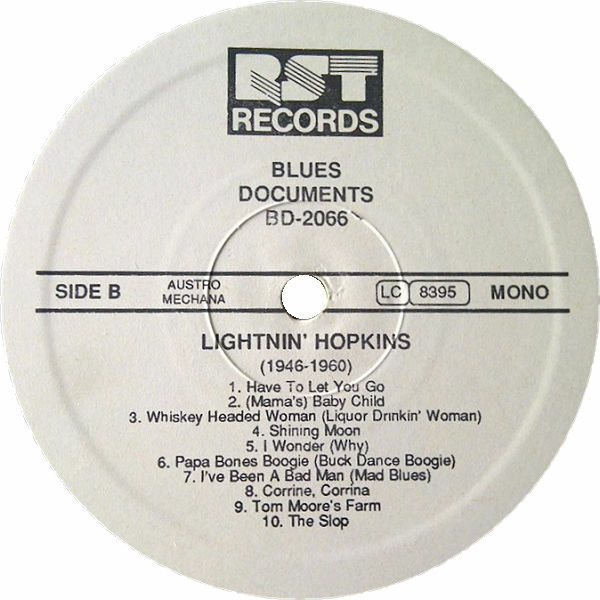 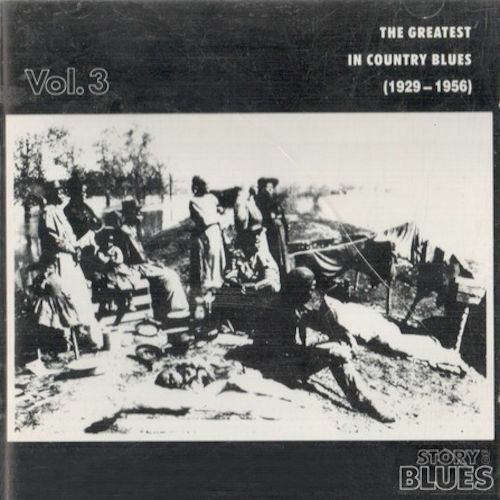 "Joel & Lightnin' Hopkins (1959)"
Joel Hopkins tracks available on Document DOCD-5619 "Rural Blues Vol. 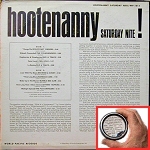 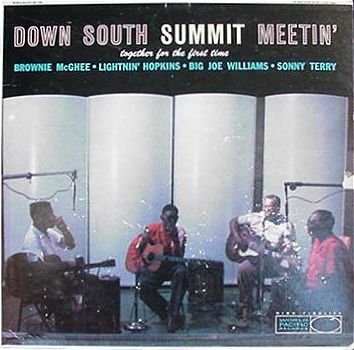 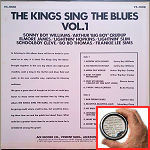 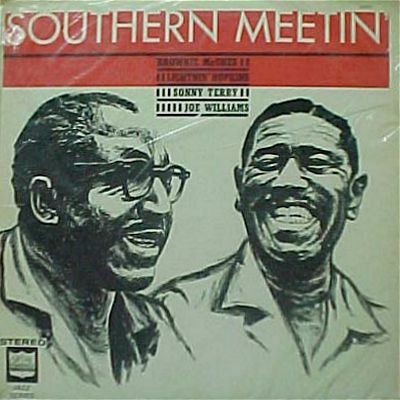 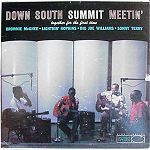 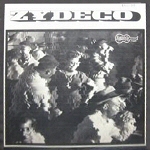 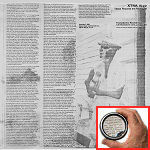 2 1951-1962"
= 11017 (stereo) "Southern Meetin'"
- Who Stole My Beer? 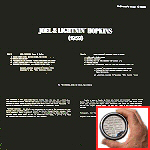 [= CJM 8025 / CJS 9025 ??? 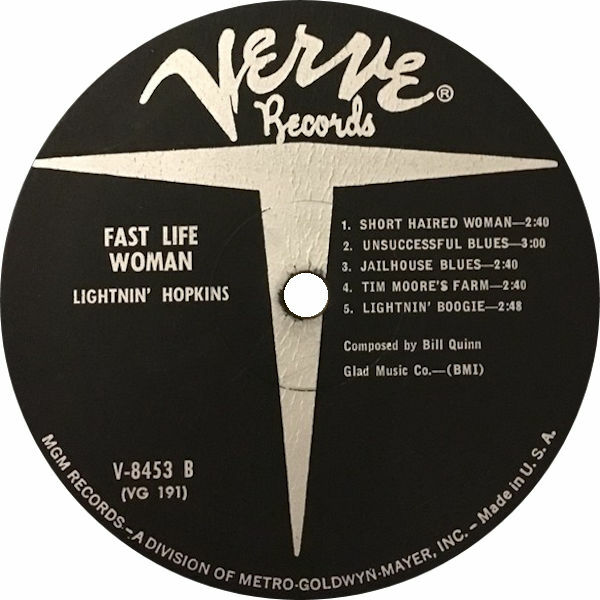 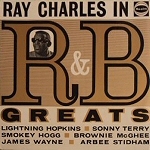 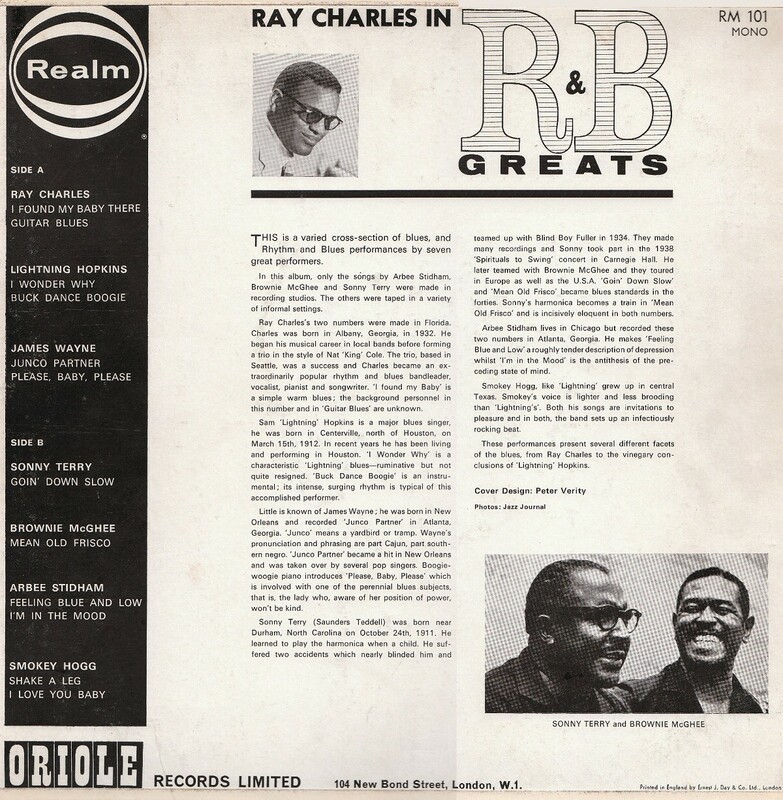 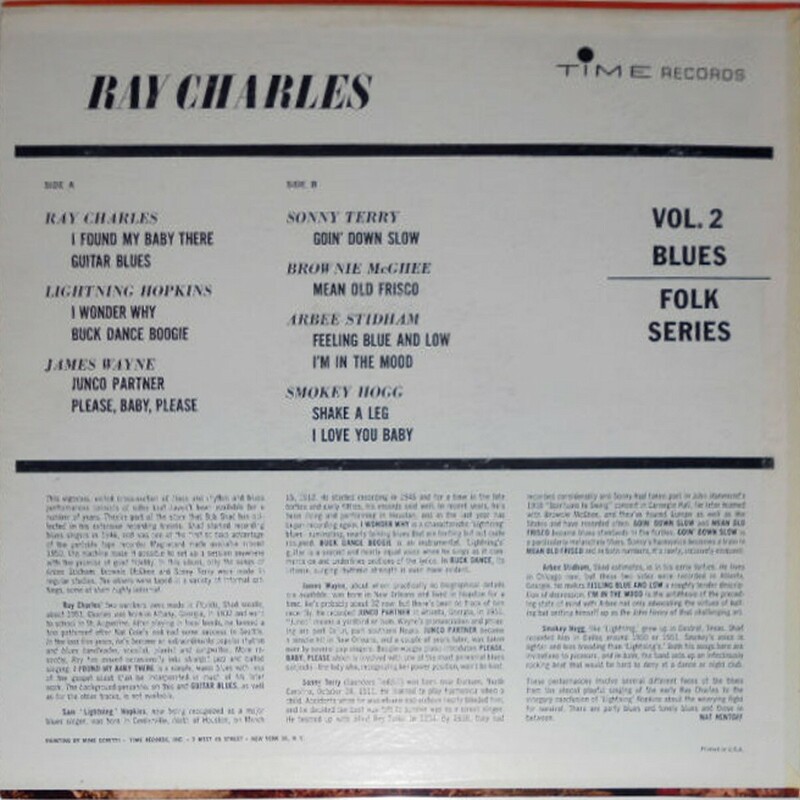 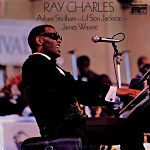 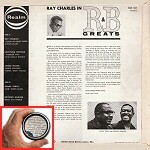 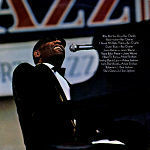 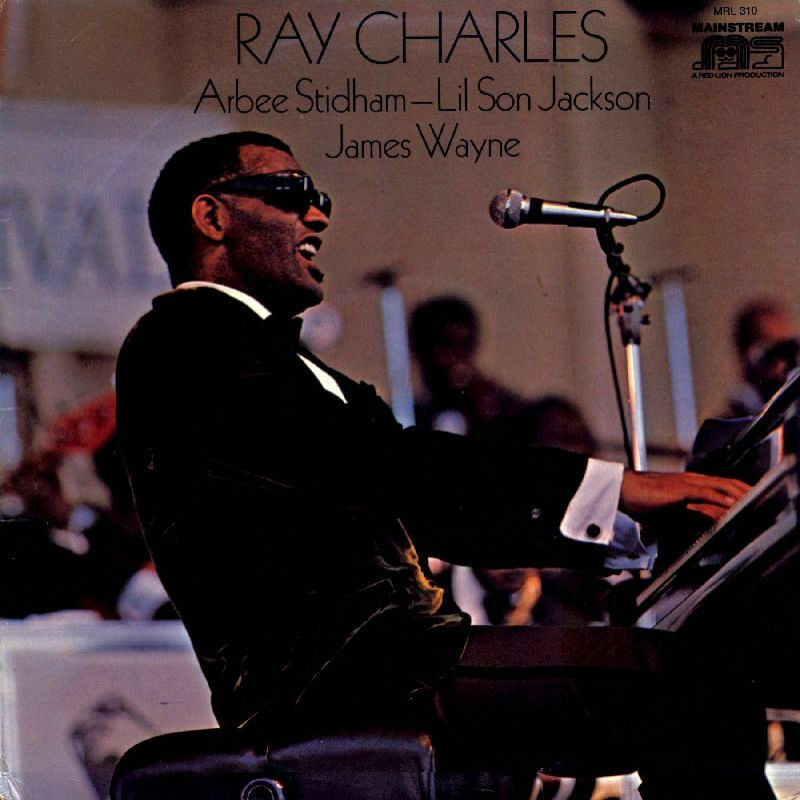 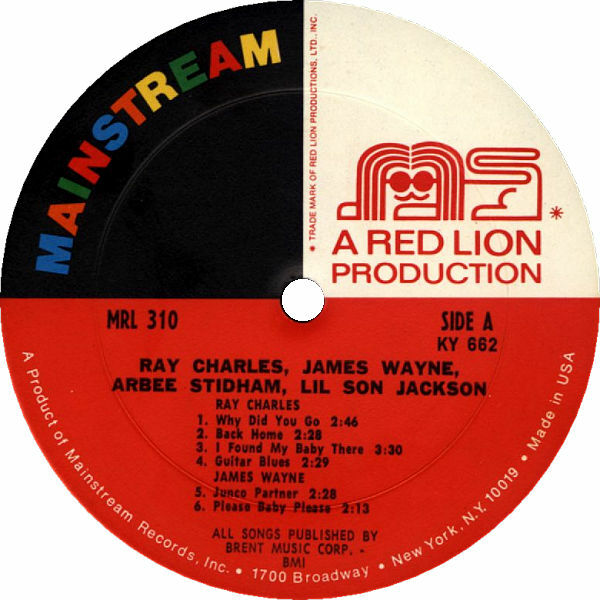 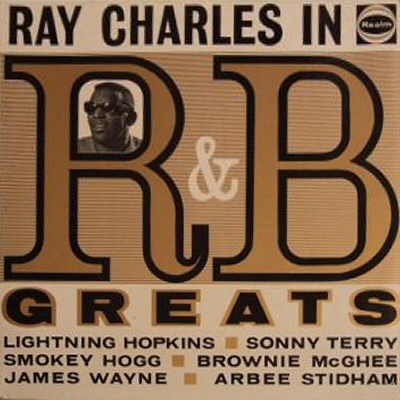 = Realm RM 101 (1963) "Ray Charles In R&B Greats"
= Dart LP 8000 (US 1960) "Lightning Strikes Again"
= Verve V8453 (US 1962) "Fast Life Woman"
= Verve Bel Air 331.010 (Fr 1962?) 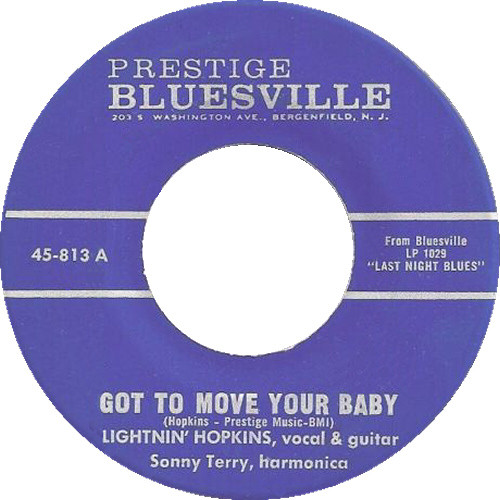 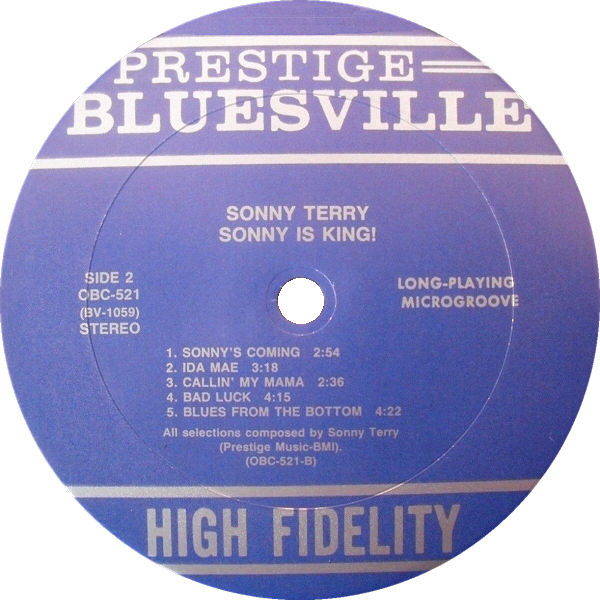 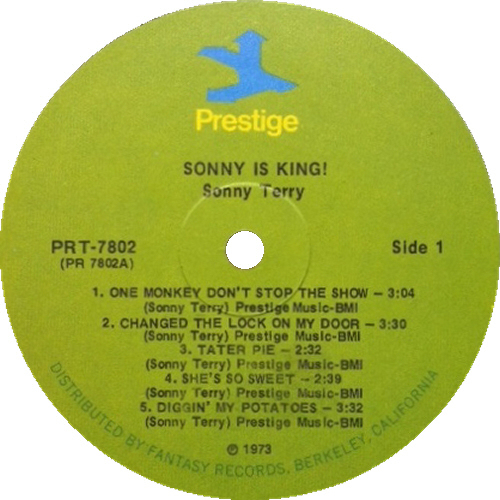 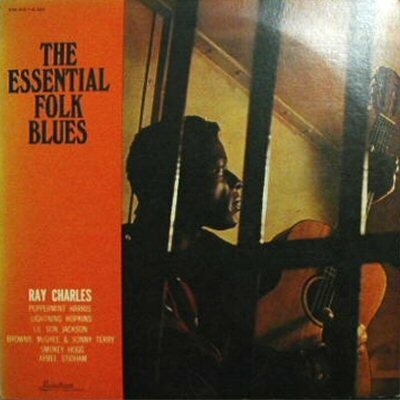 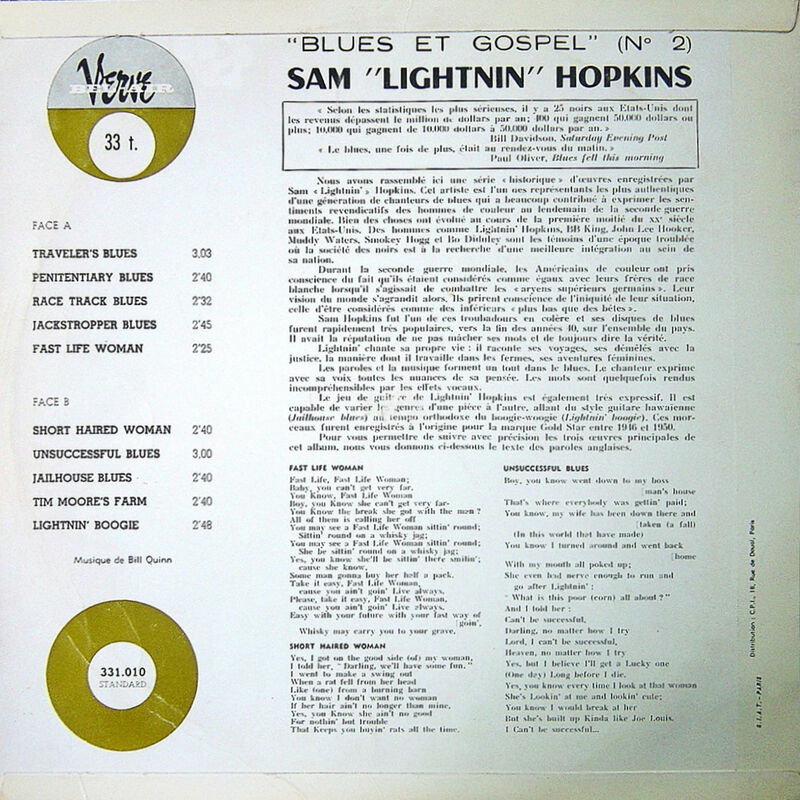 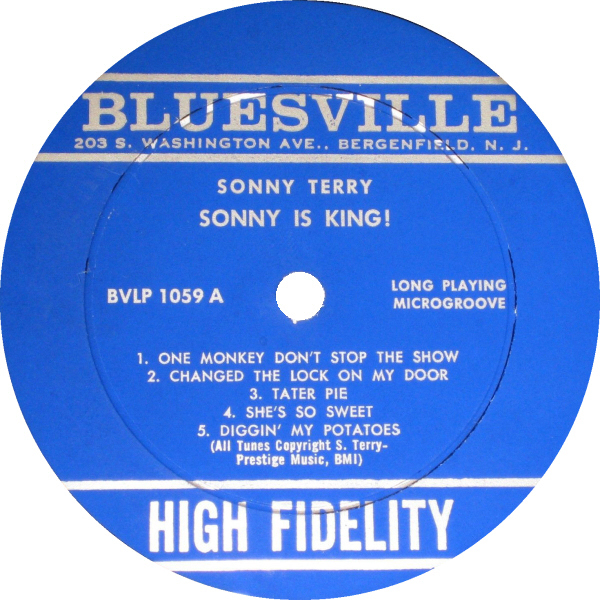 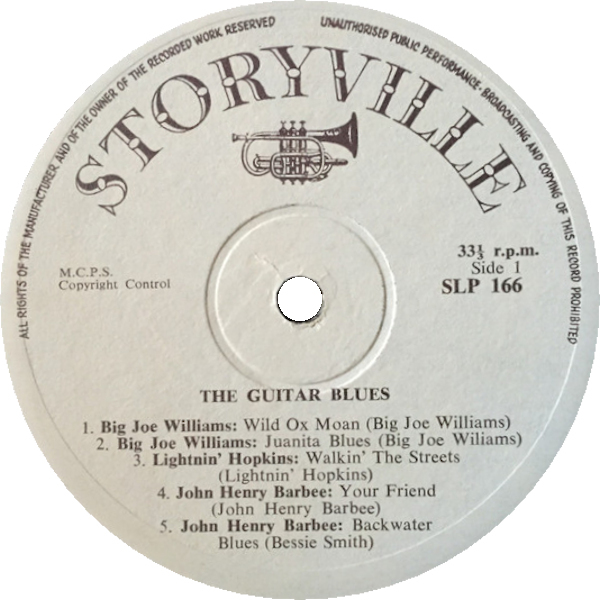 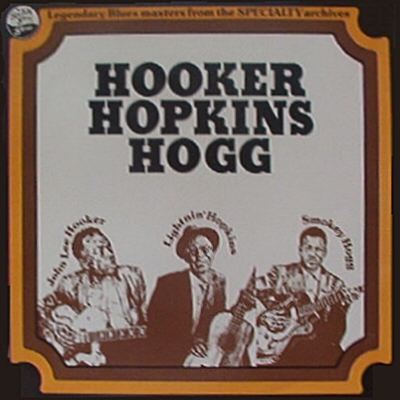 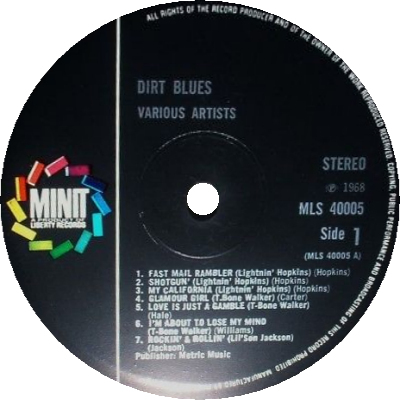 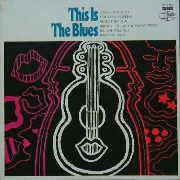 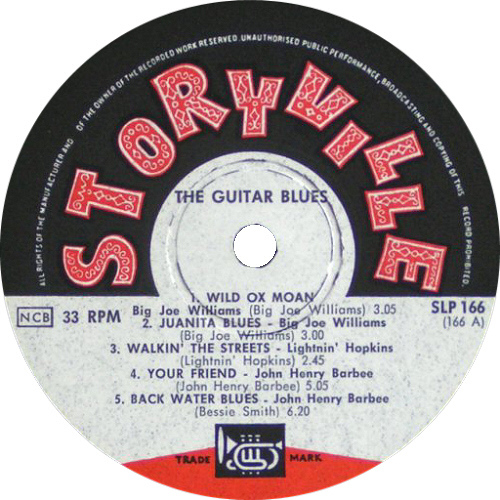 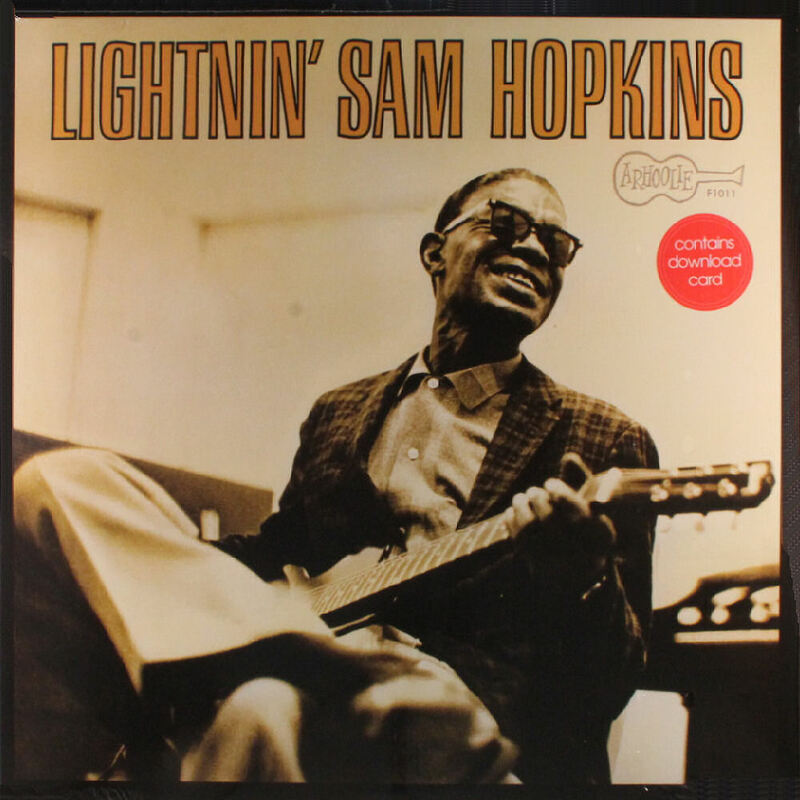 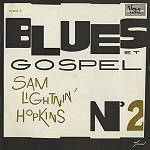 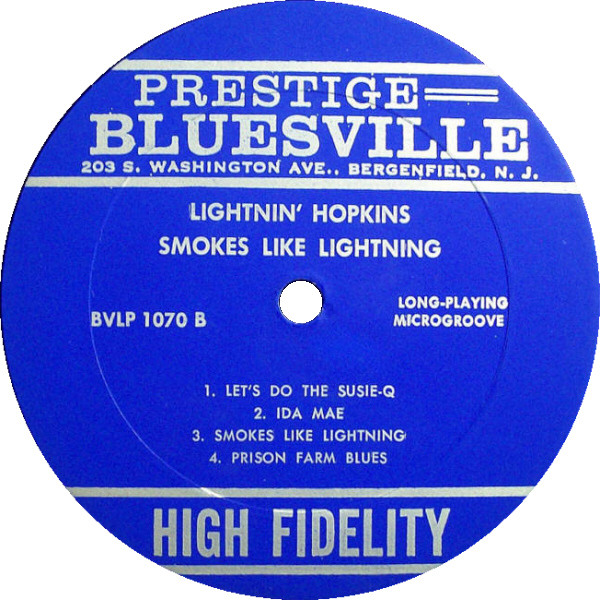 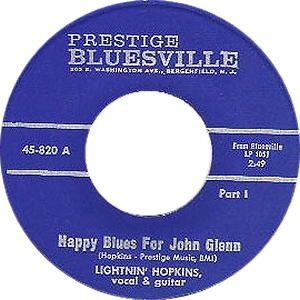 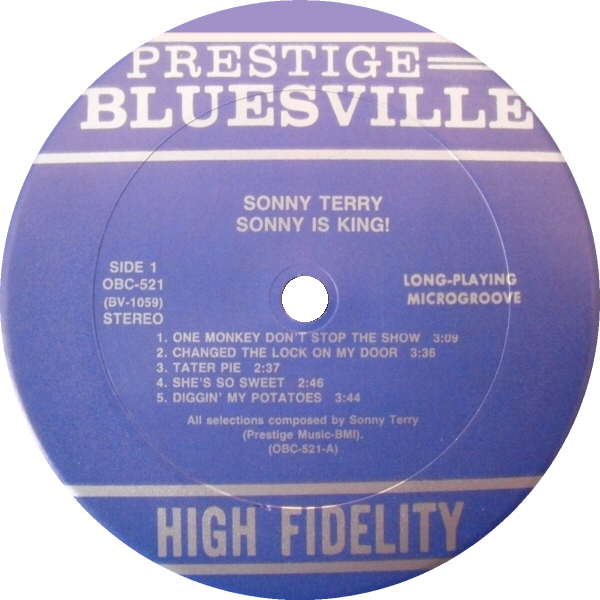 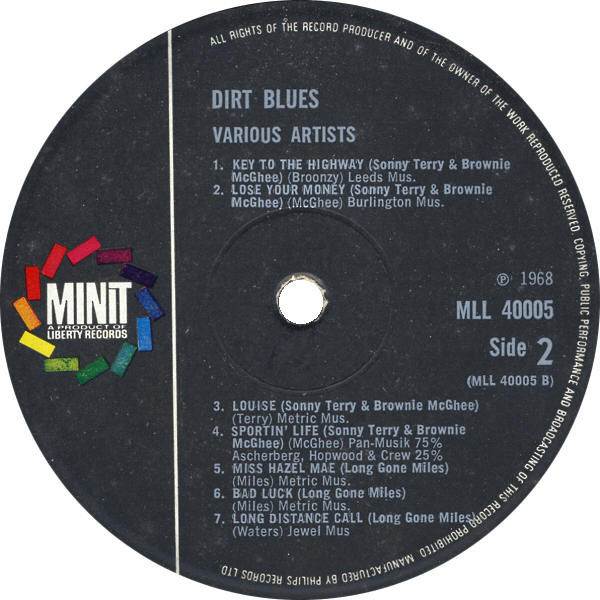 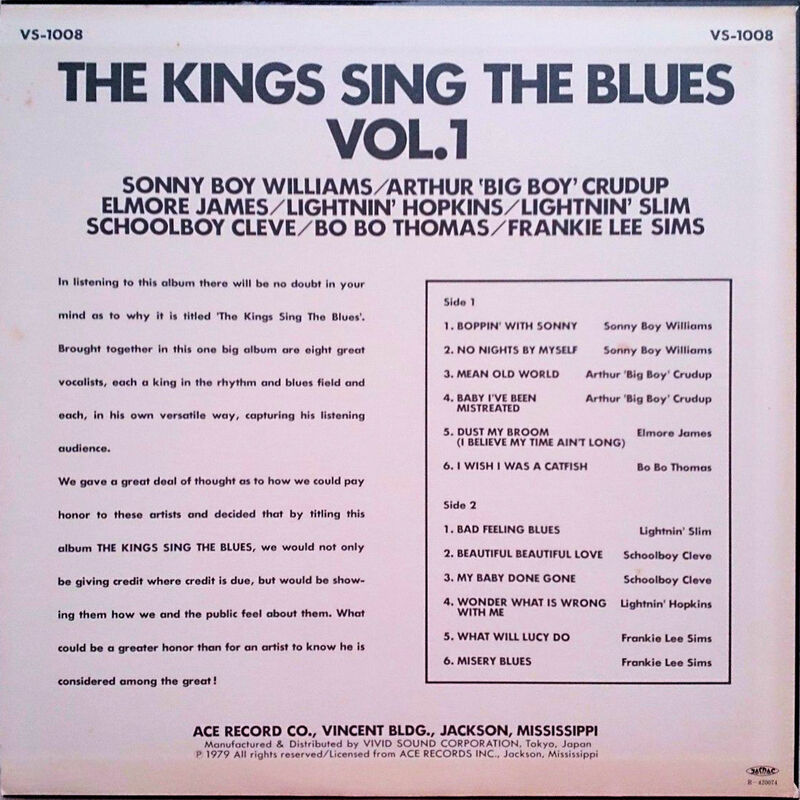 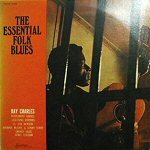 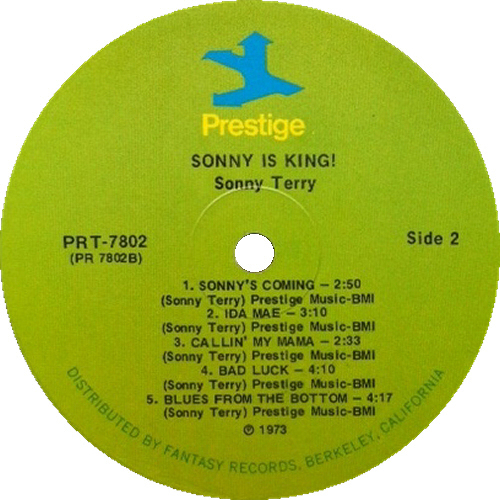 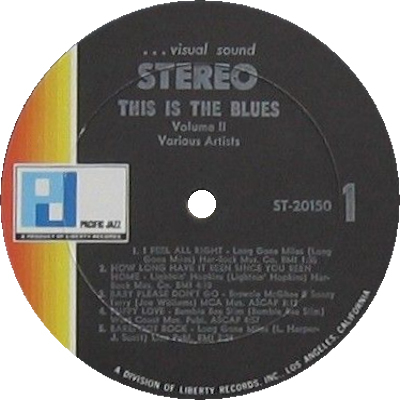 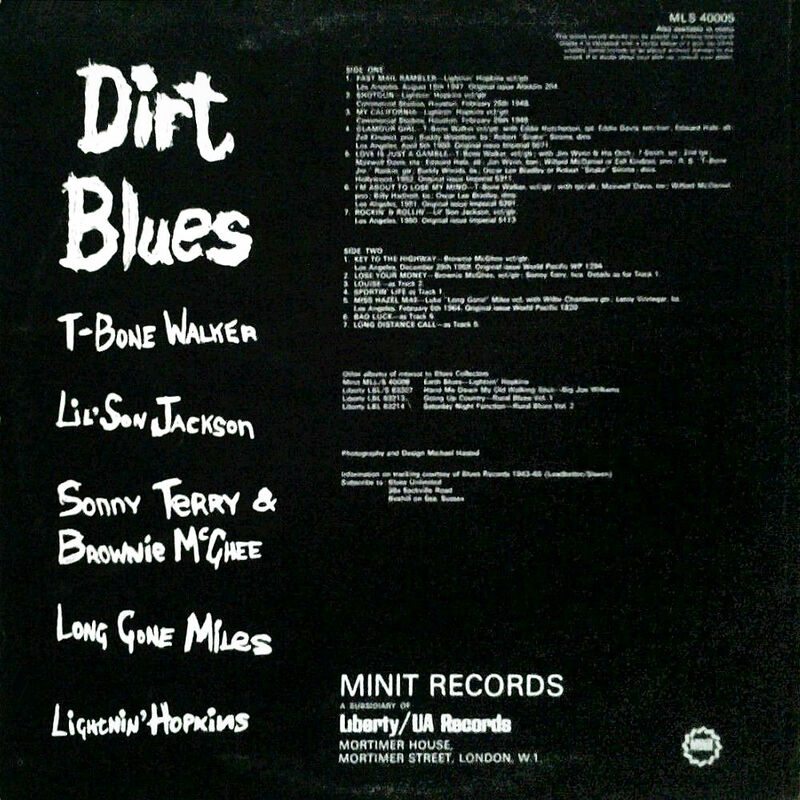 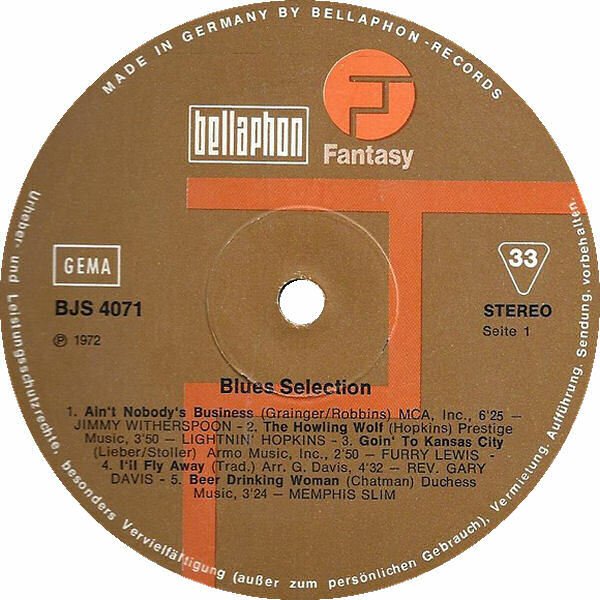 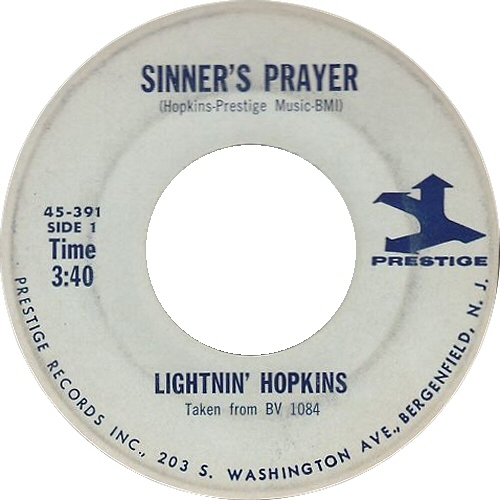 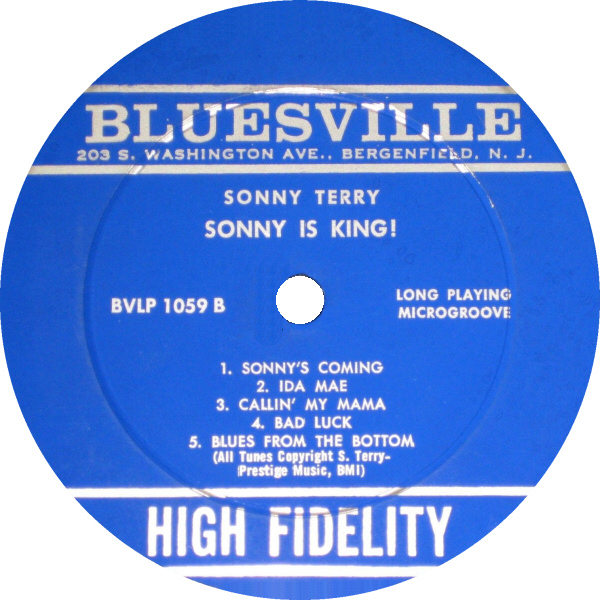 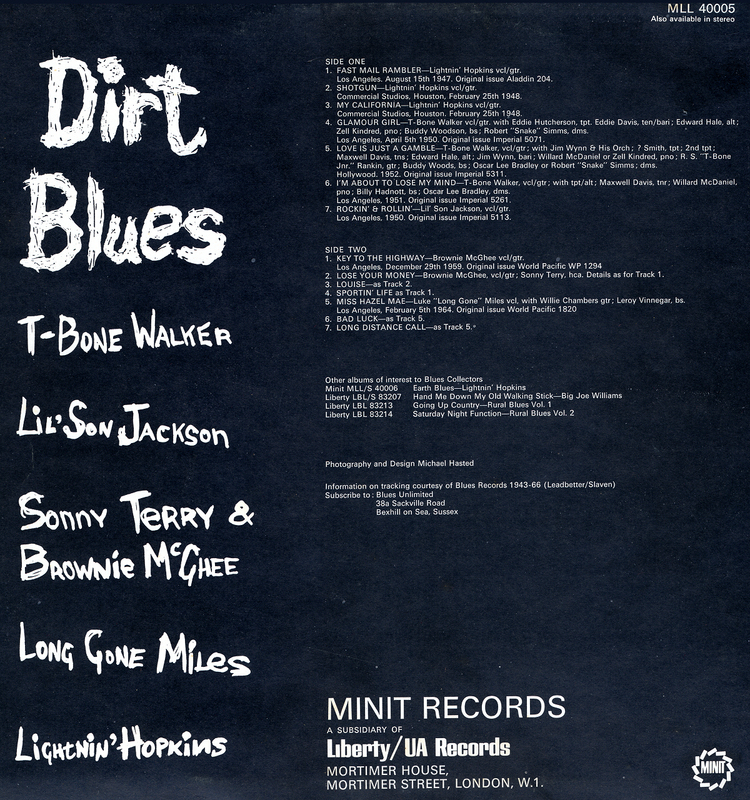 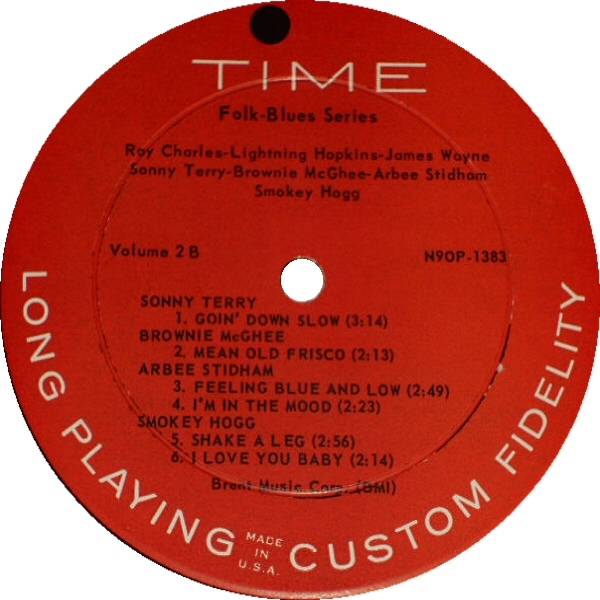 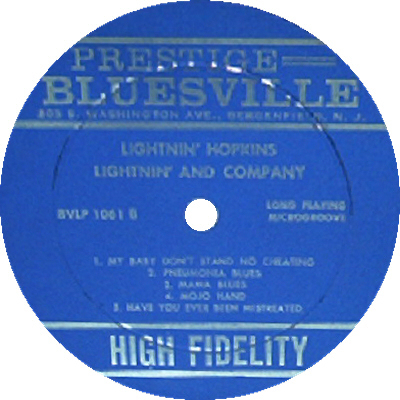 "Sam Lightnin' Hopkins Blues et Gospel No 2"
= D D-8000 (US 1967) "Blues Underground"
(=) Prestige/Bluesville 4406 "The Complete Prestige/Bluesville Recordings"
(=) Not Now NOT3CD128 "Bluesville Story 1960-1962"
some tracks on Tradition Everest S-2056 (US 1968) "The Best of Lightnin' Hopkins"
"Baby!" 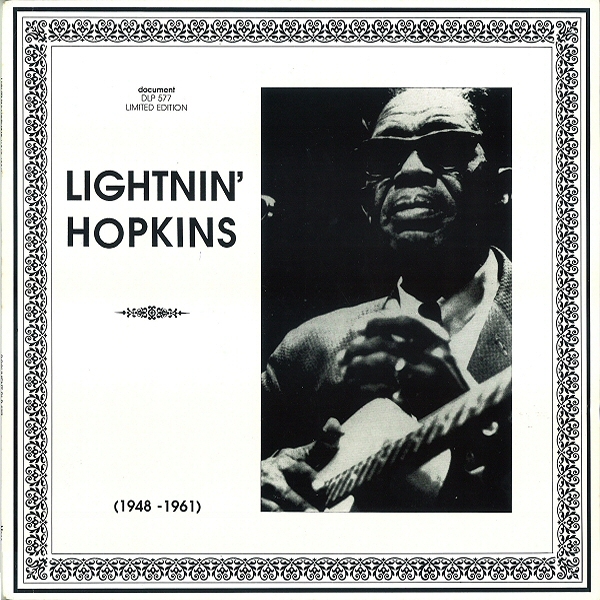 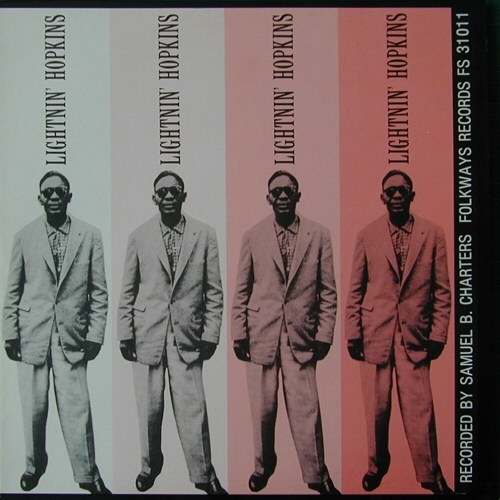 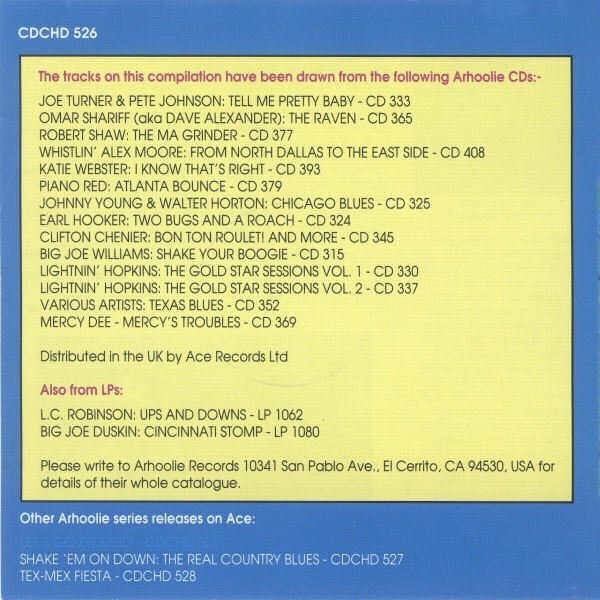 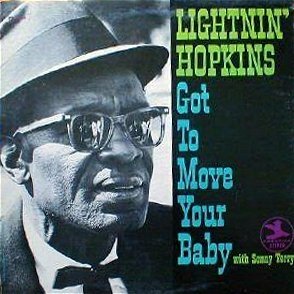 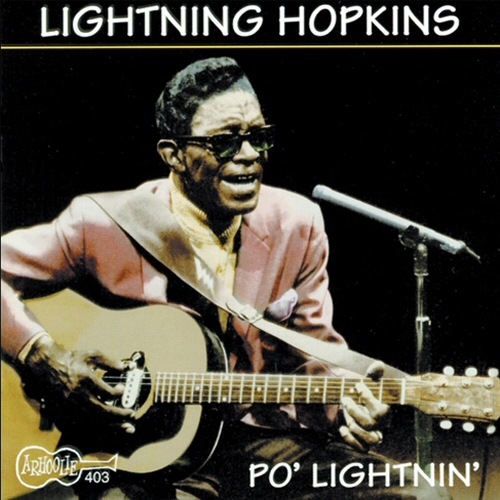 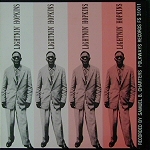 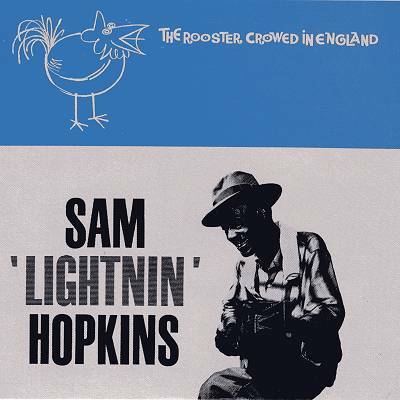 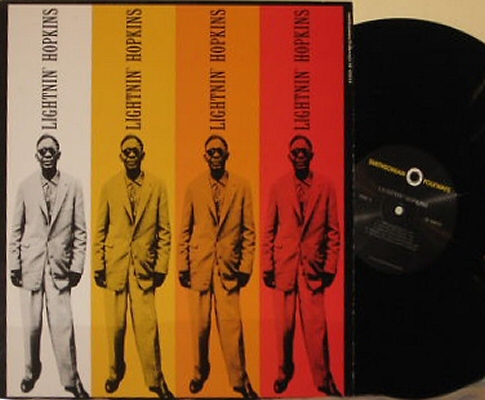 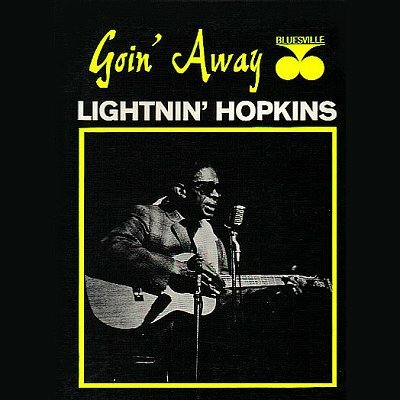 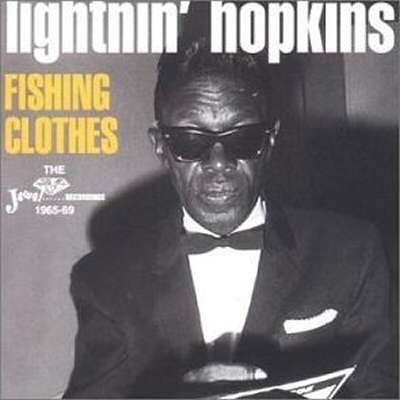 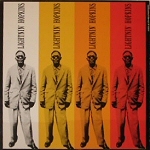 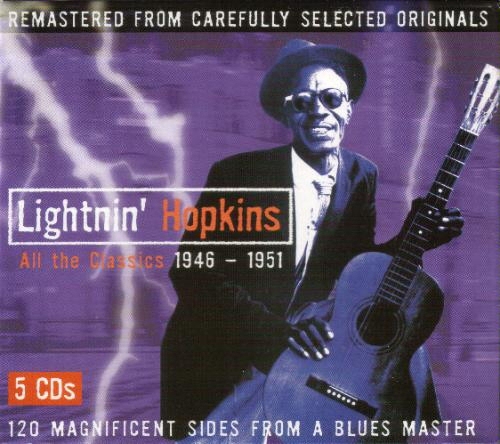 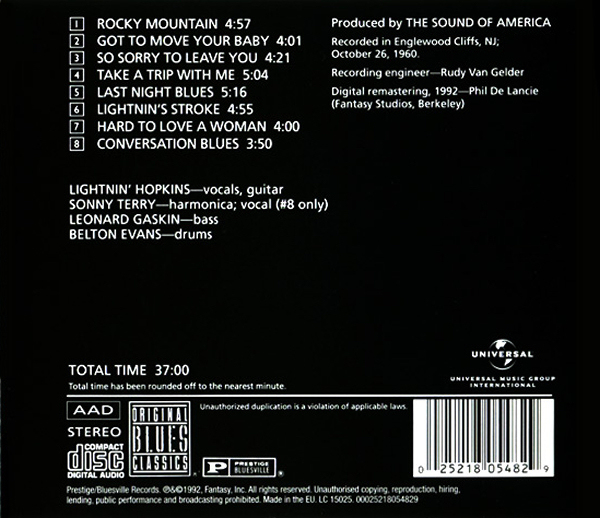 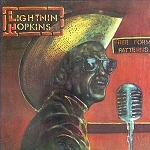 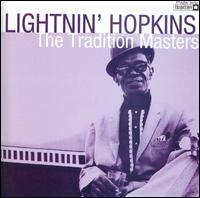 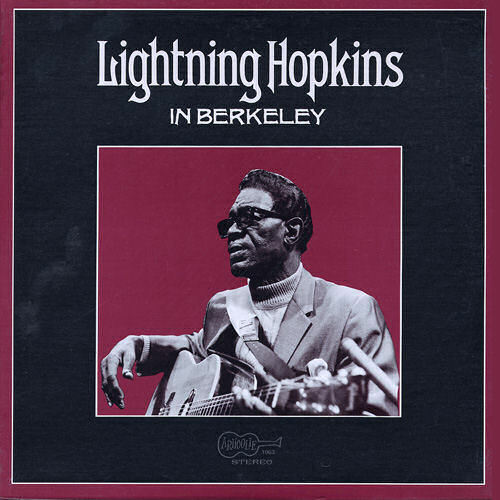 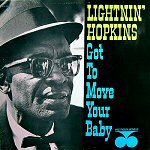 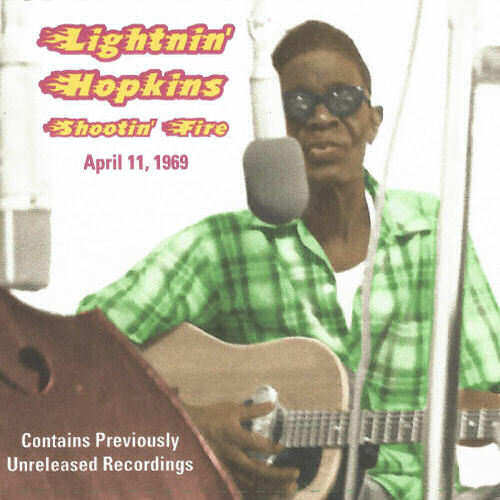 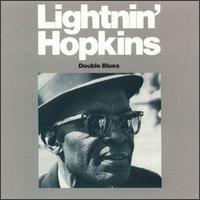 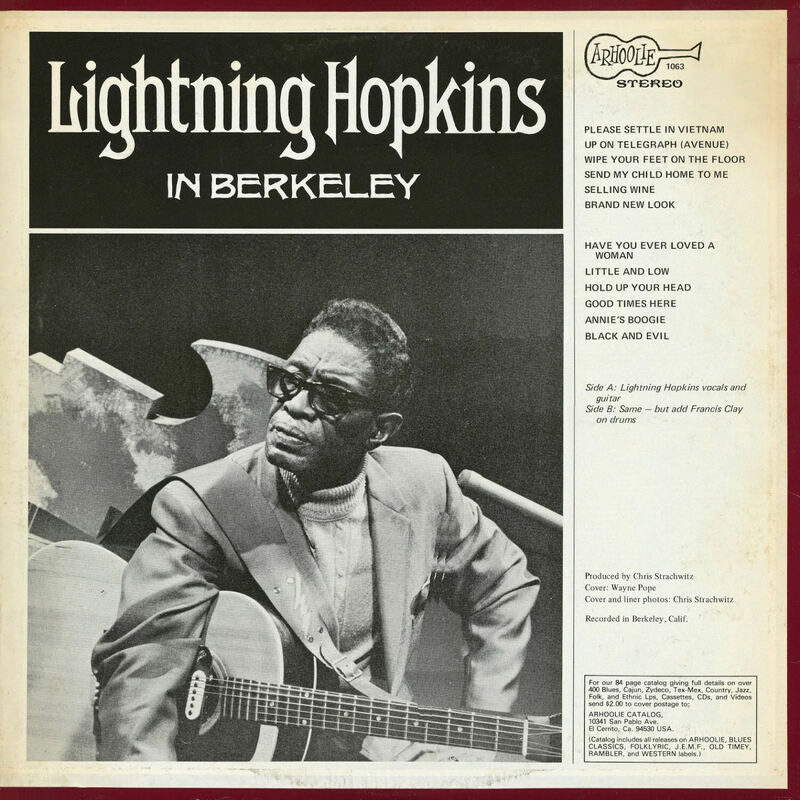 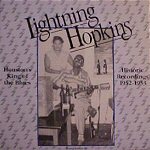 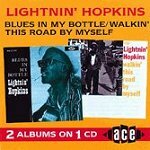 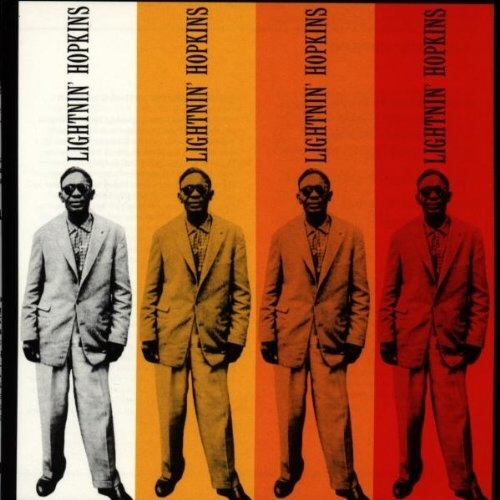 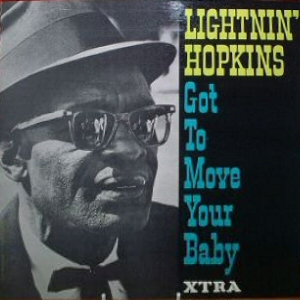 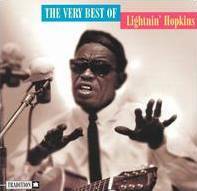 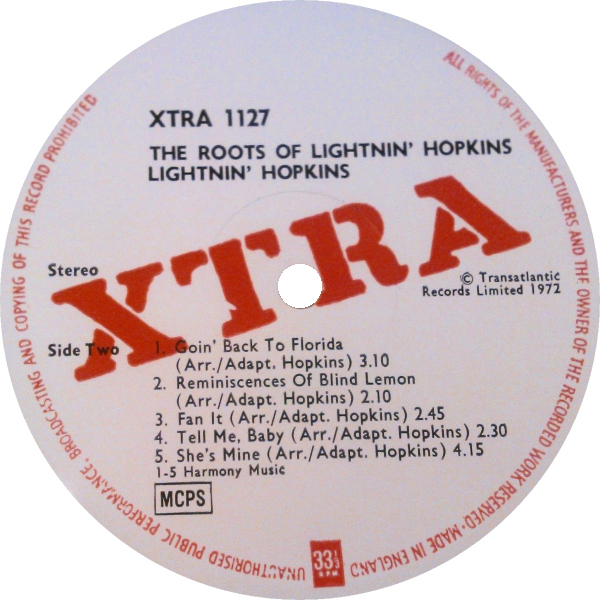 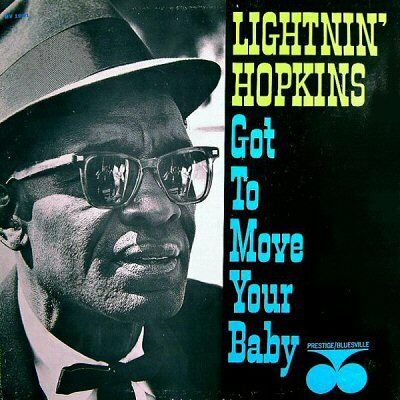 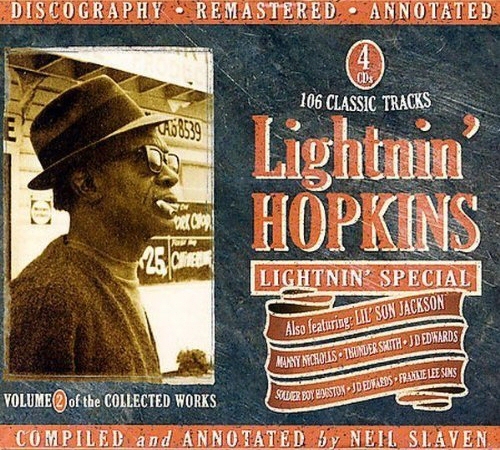 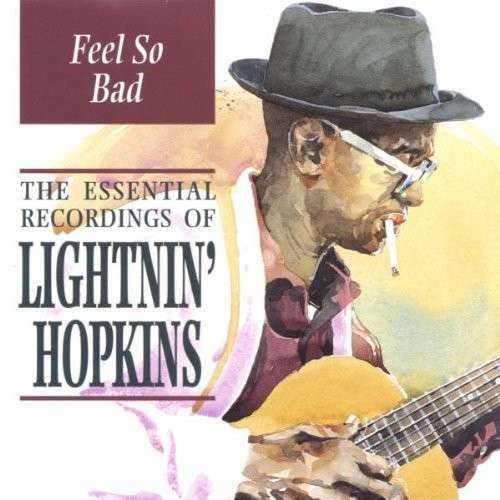 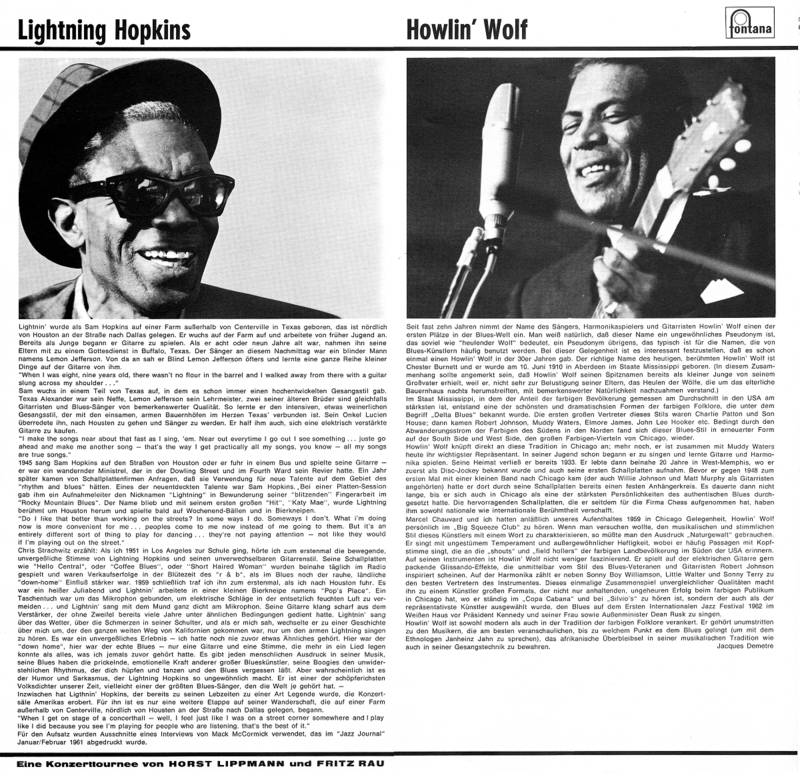 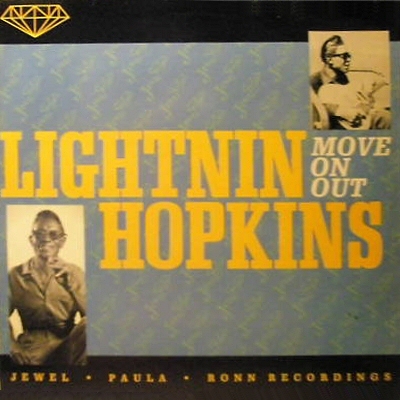 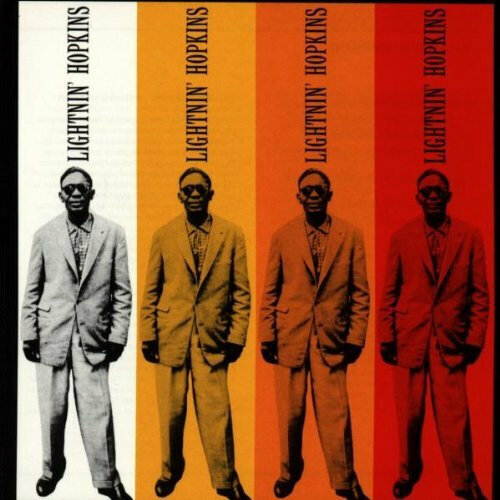 also on Tradition CD 1074 (US 1999) "The Very Best of Lightnin' Hopkins"
= Ace CH 409 (along with BVLP 1061 and BVLP 1070) "How Many More Years I Got ..."
Arhoolie F 1011 (US 1962) "Lightnin' Sam Hopkins"
= Fontana 688 801 ZL (1964) "Burnin' In L.A."
(=) Arhoolie CD 403 "Po' Lightnin'"
"rec. 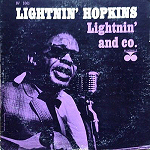 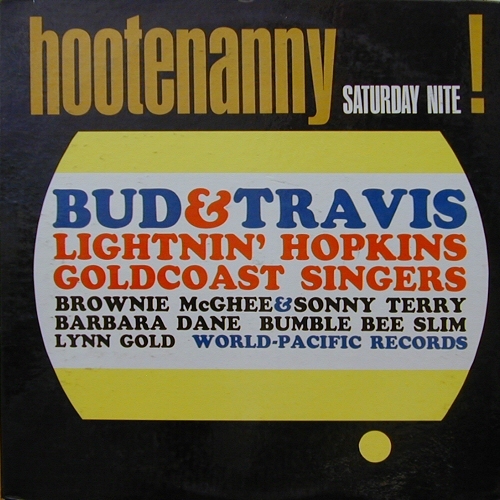 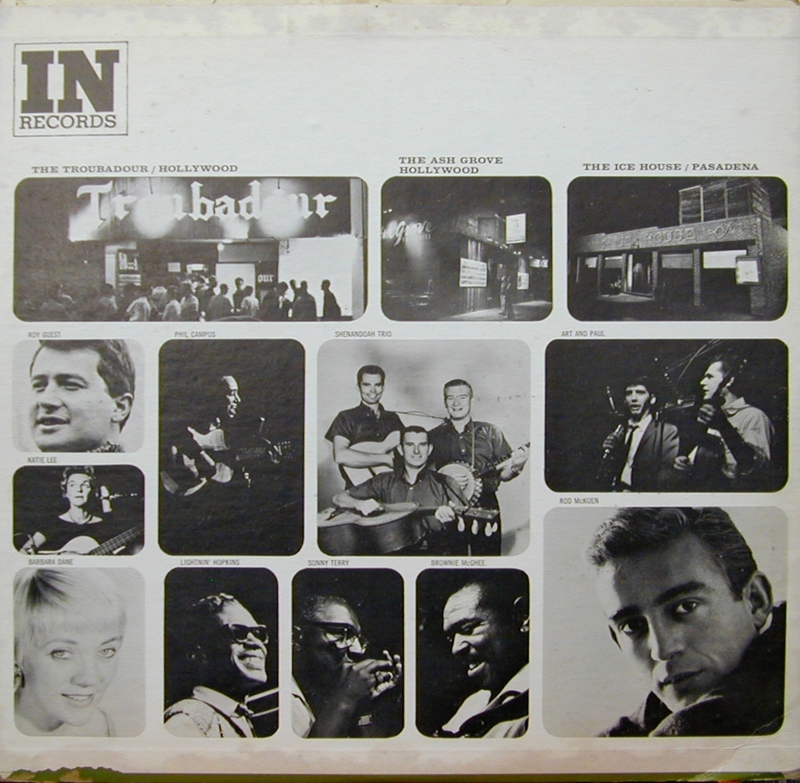 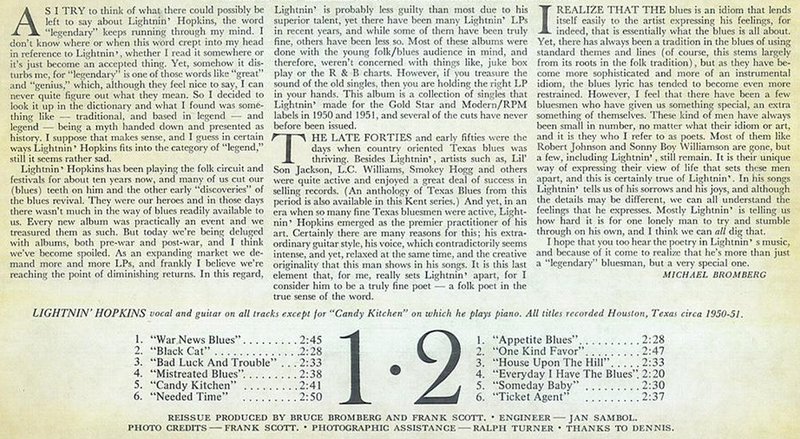 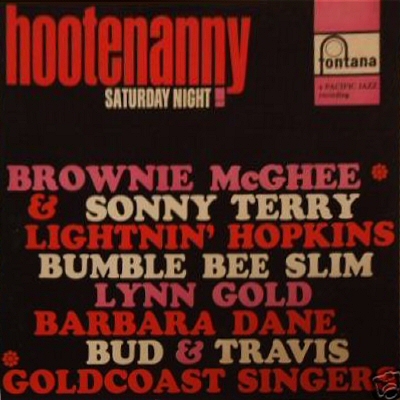 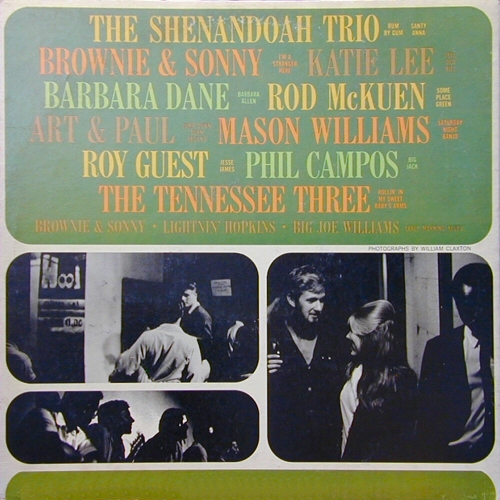 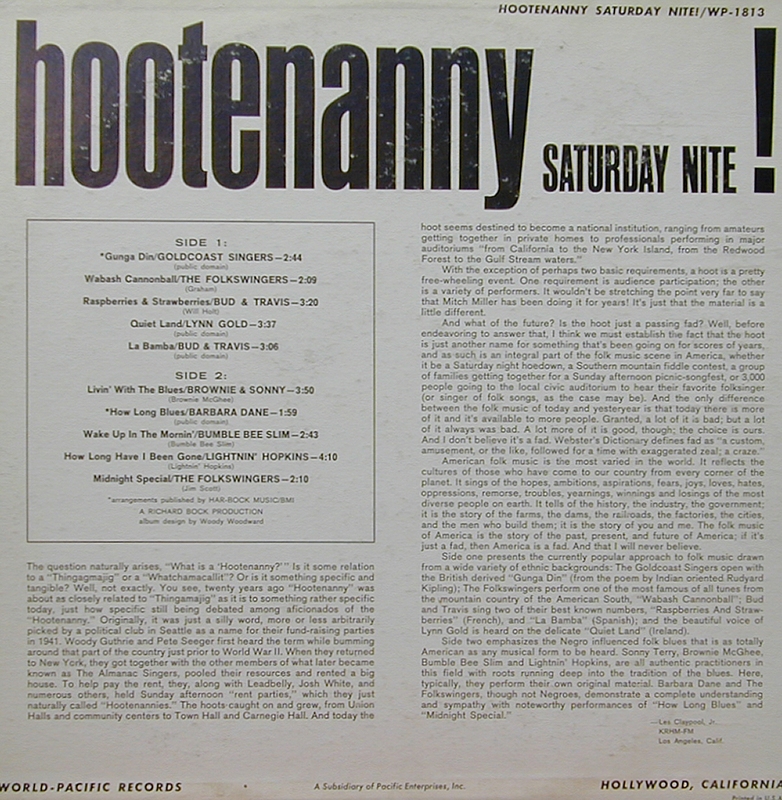 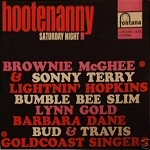 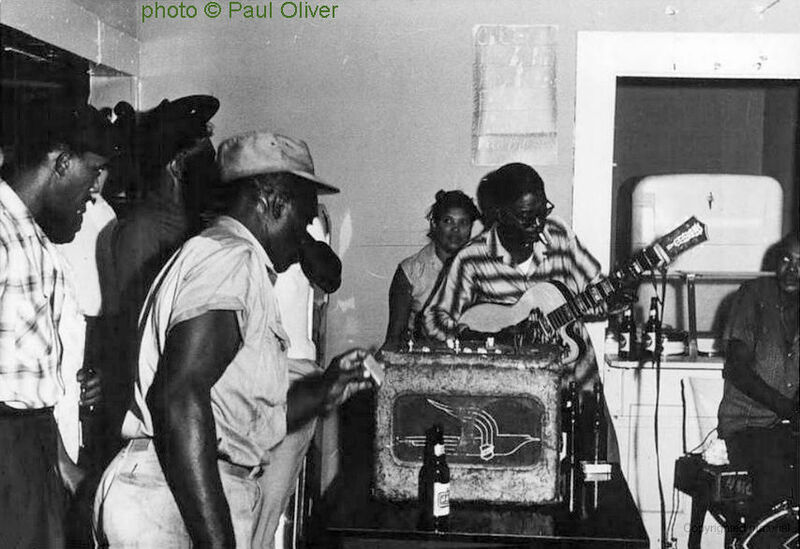 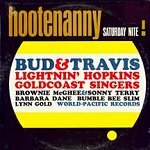 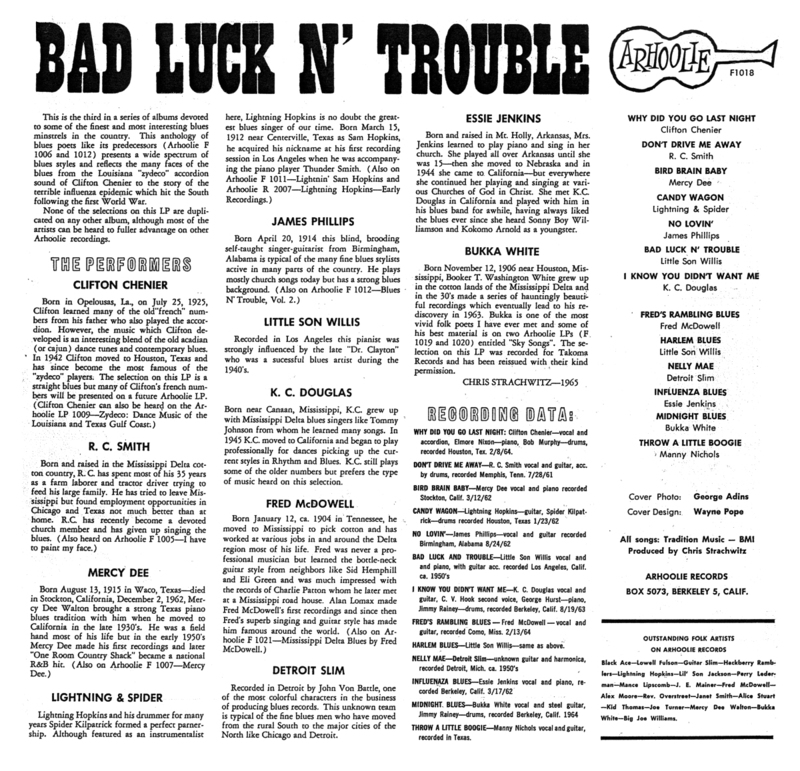 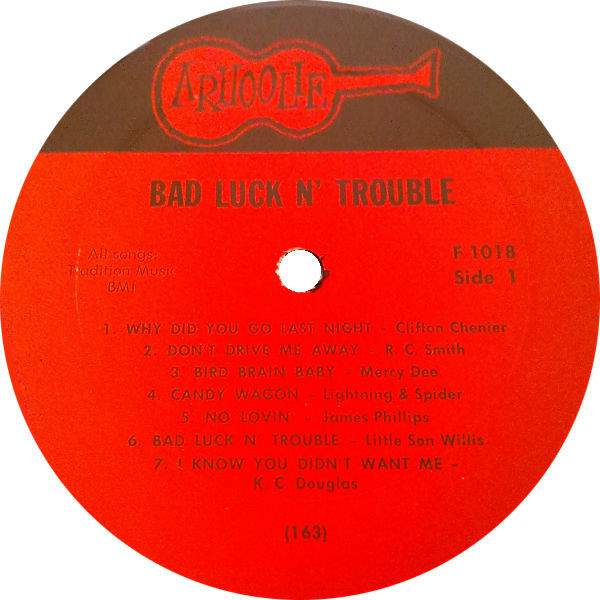 1960 live at the Troubadour, Los Angeles, CA"
13 1963 Lightnin' Hopkins: Lightnin' & co.
= Ace CH 409 (UK 19??) 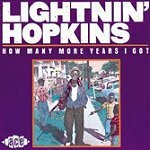 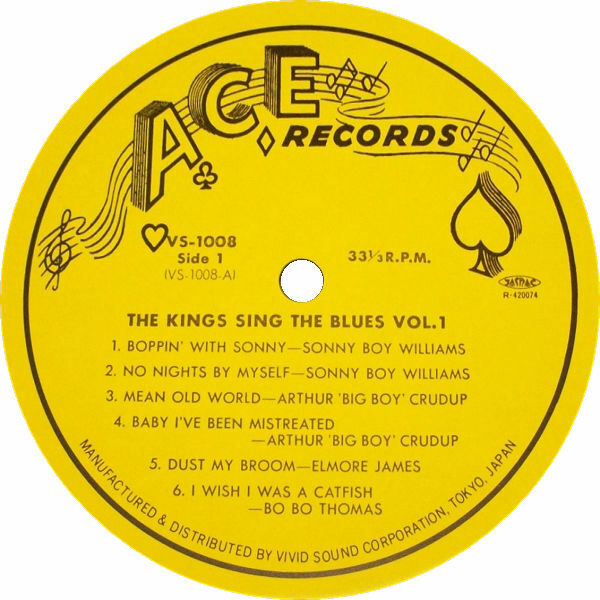 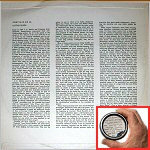 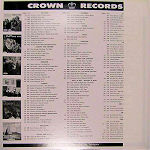 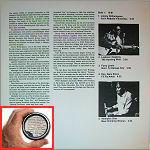 (along with BVLP 1057 and BVLP 1070) "How Many More Years I Got ..."
= Ace CH 409 (UK 19??) 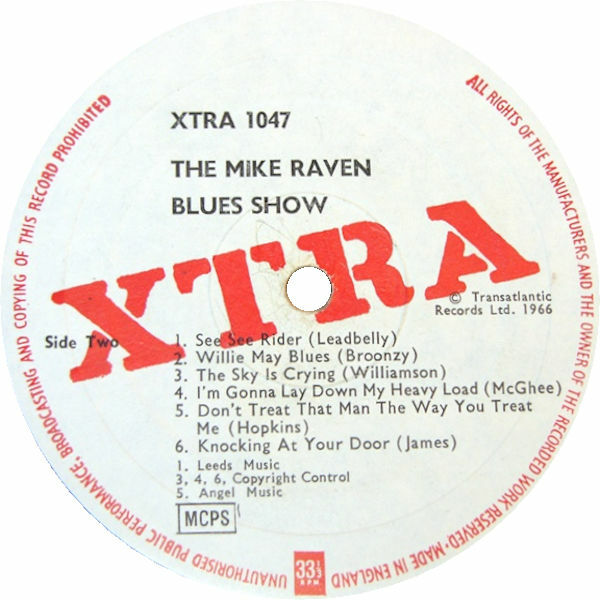 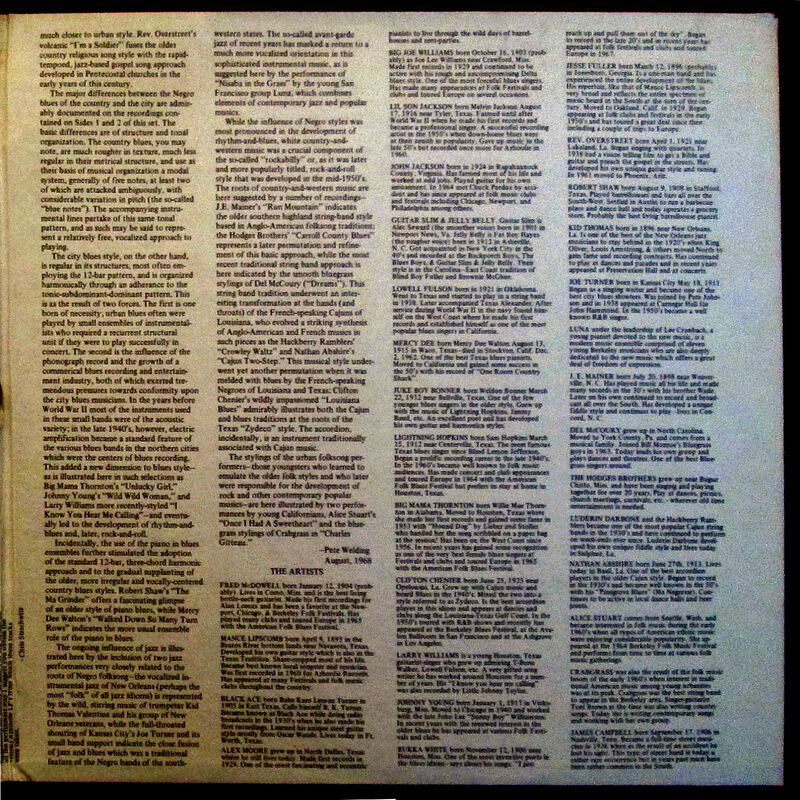 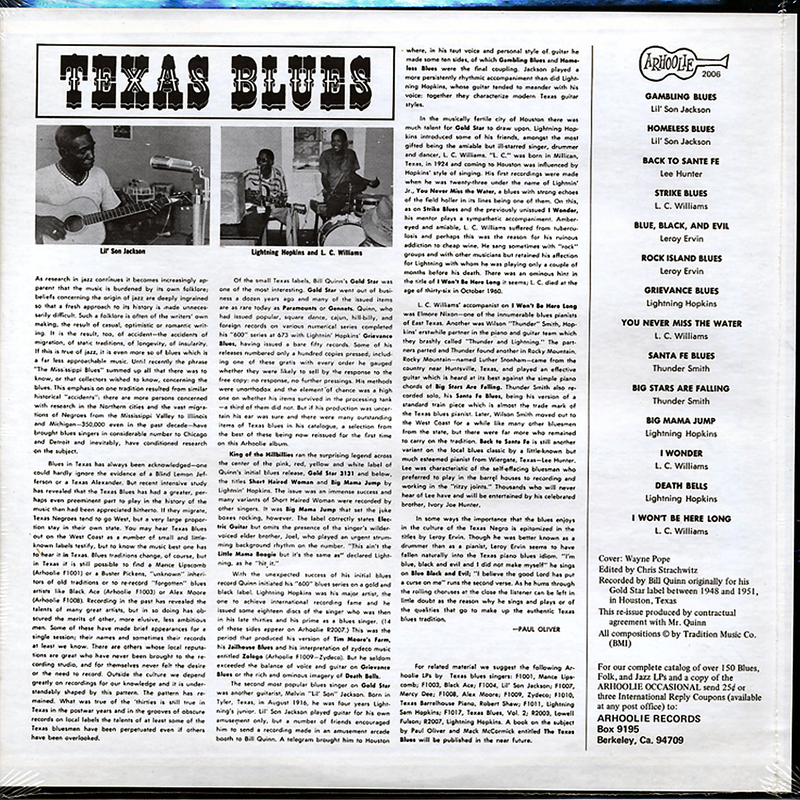 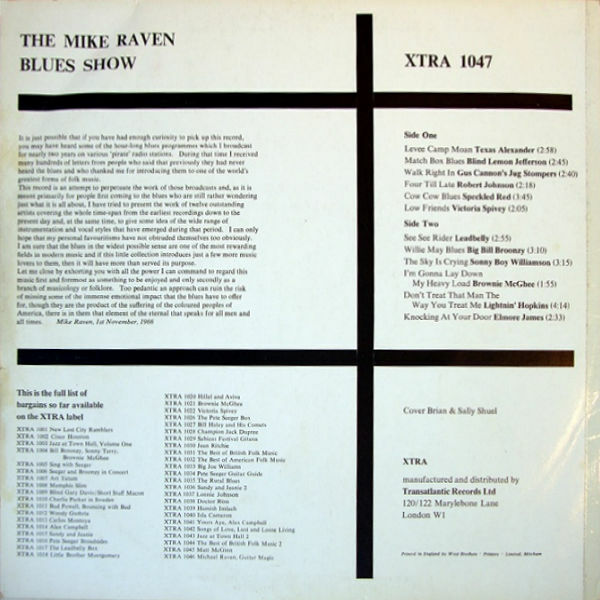 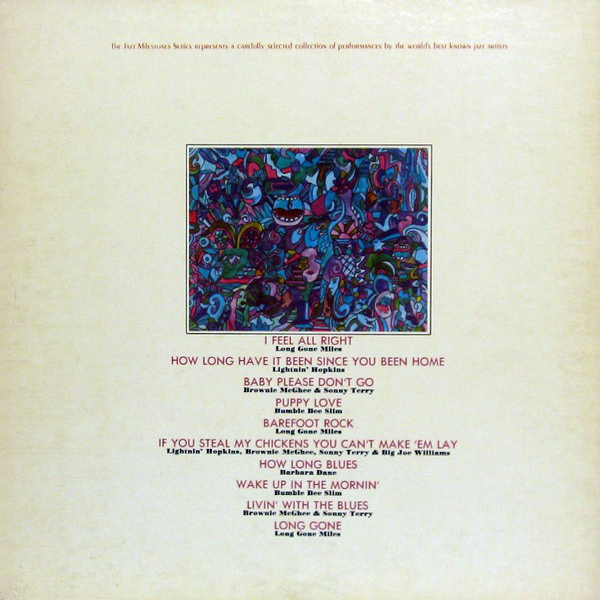 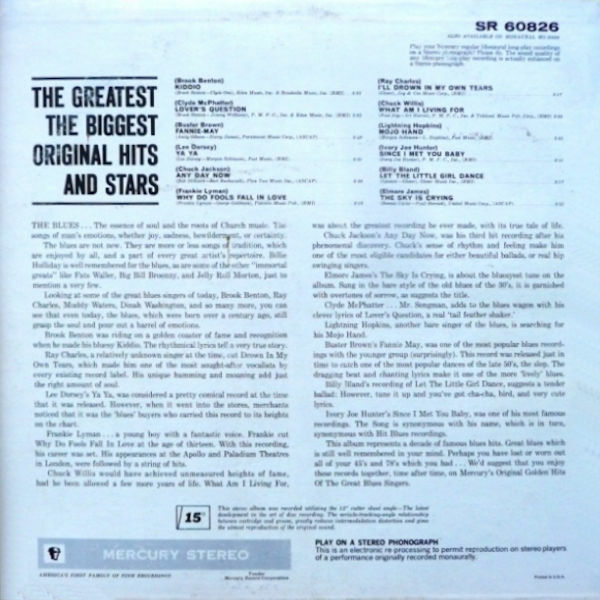 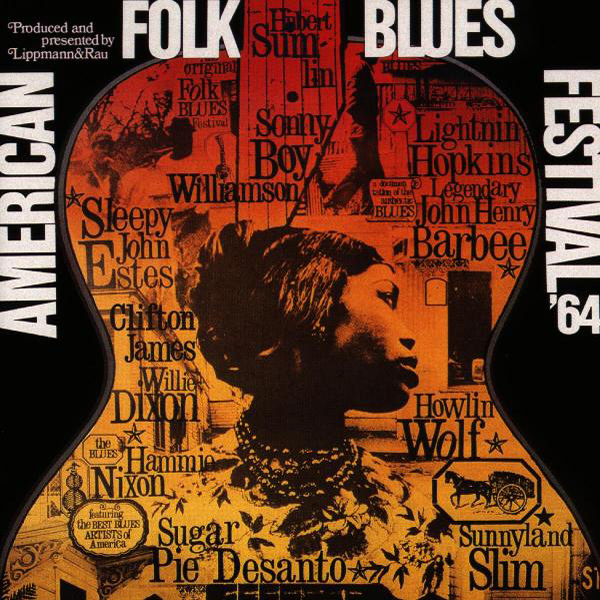 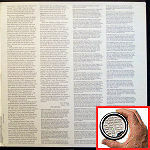 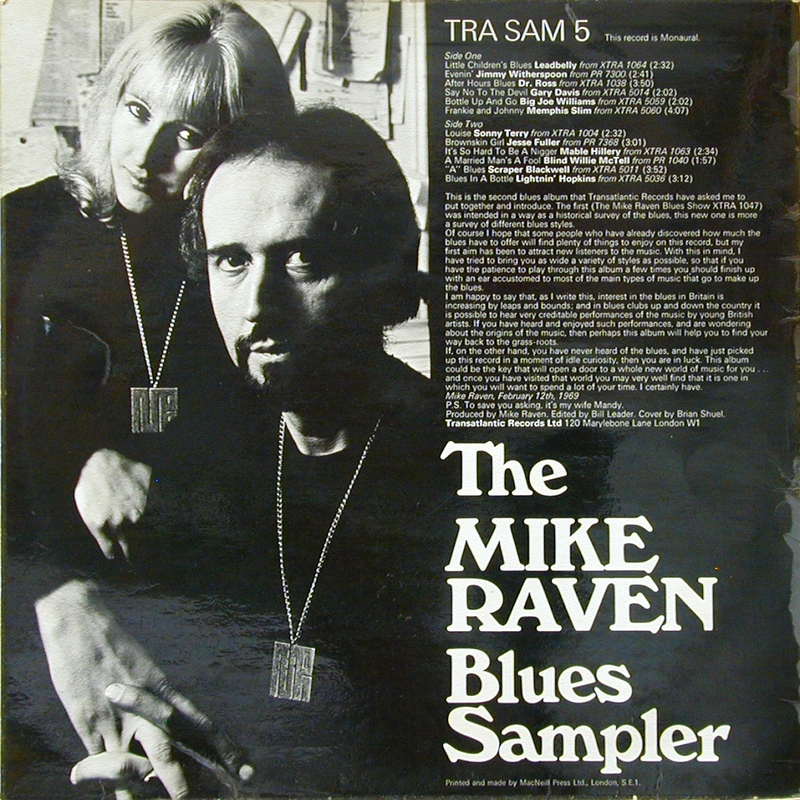 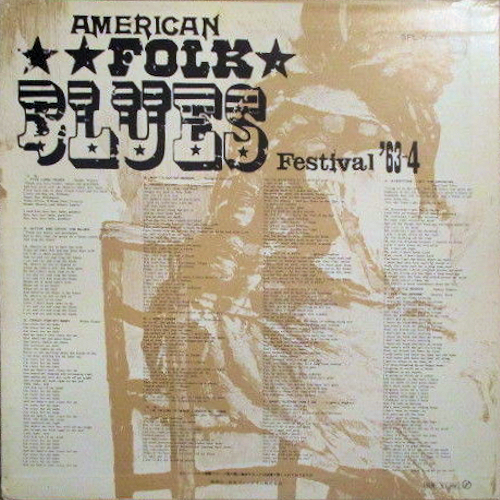 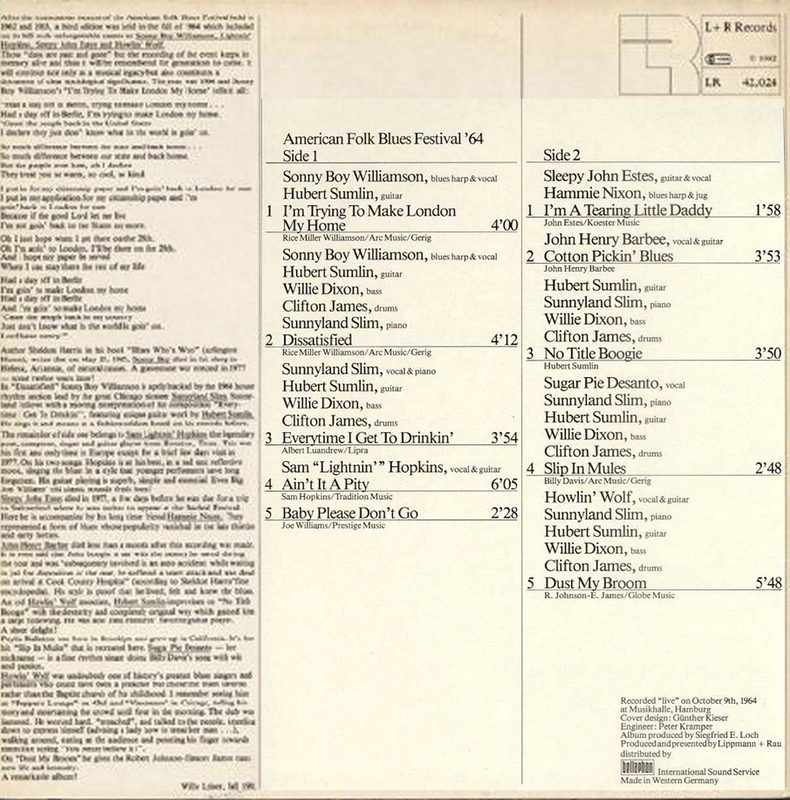 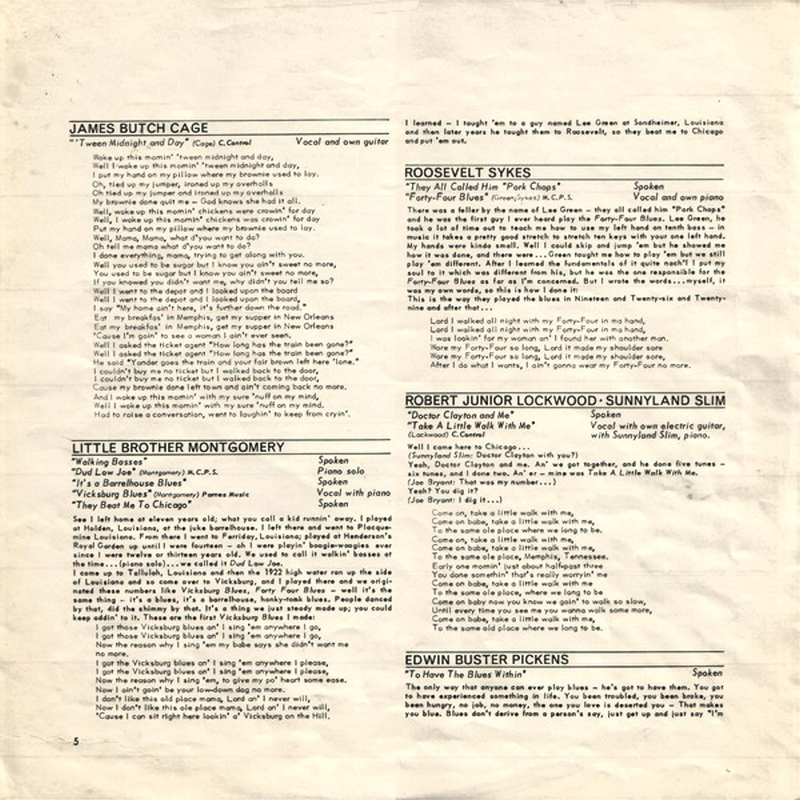 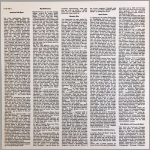 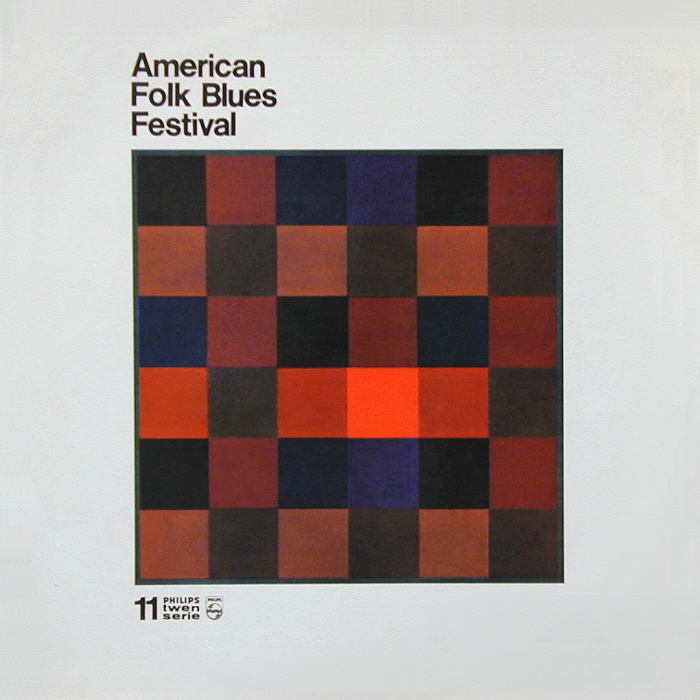 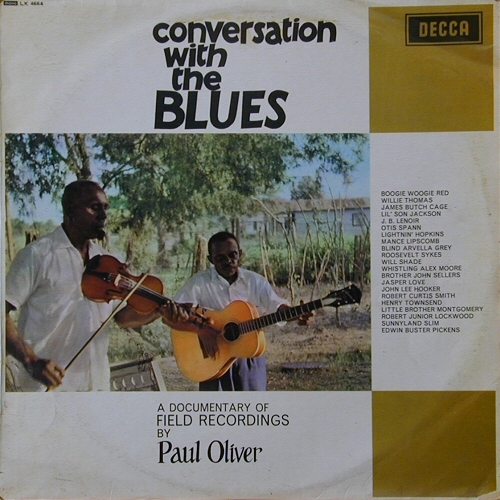 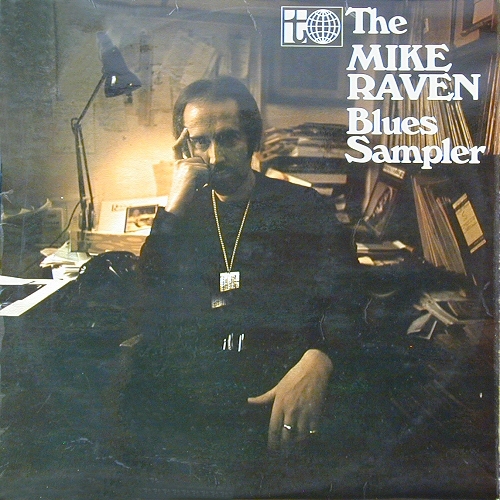 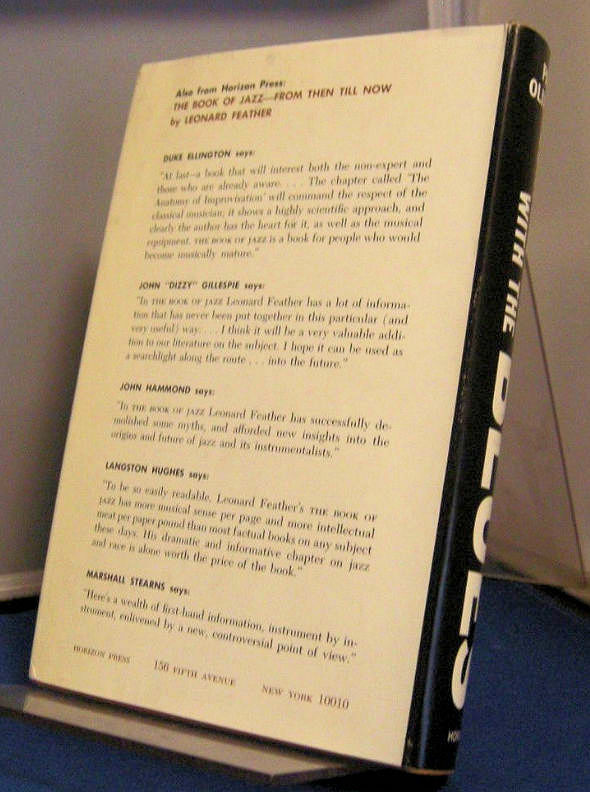 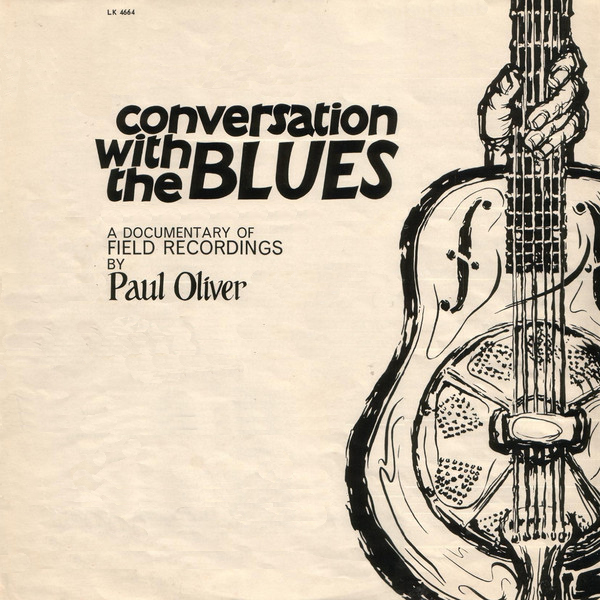 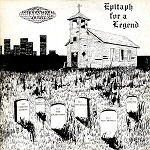 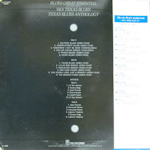 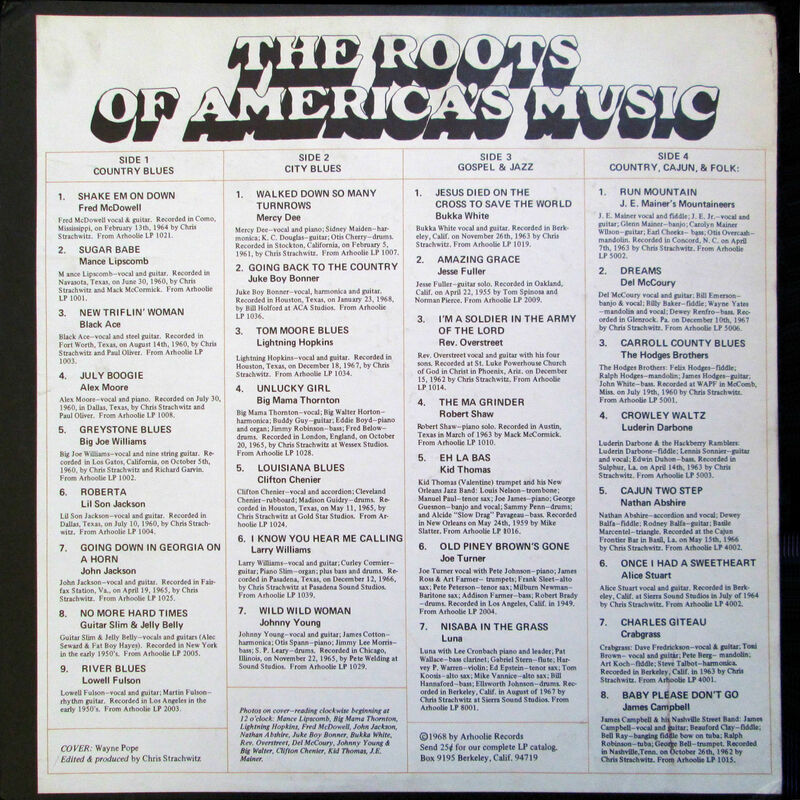 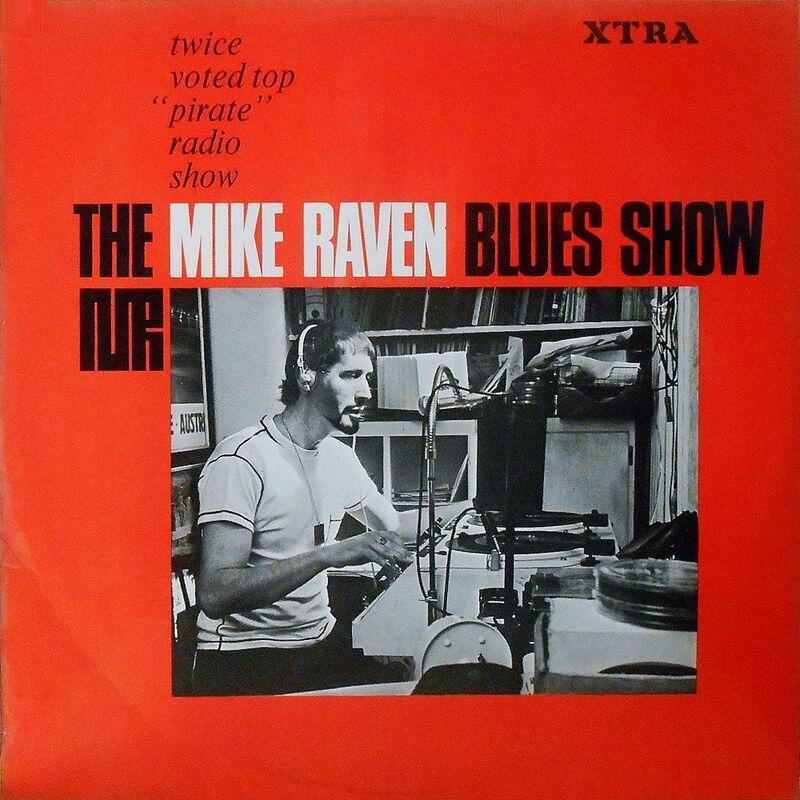 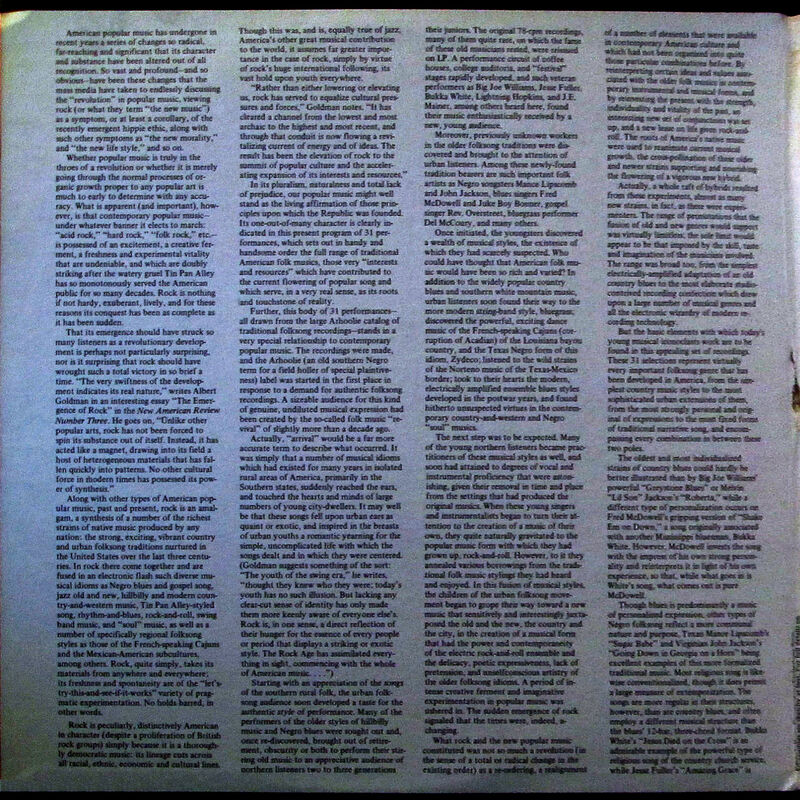 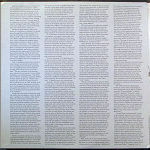 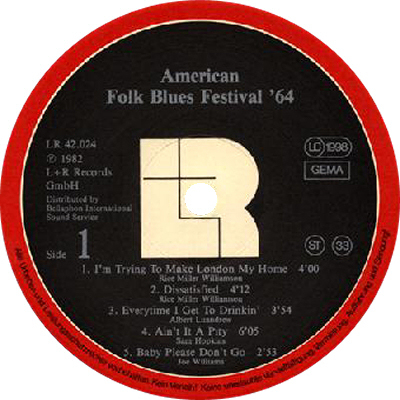 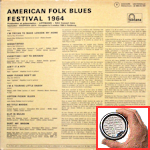 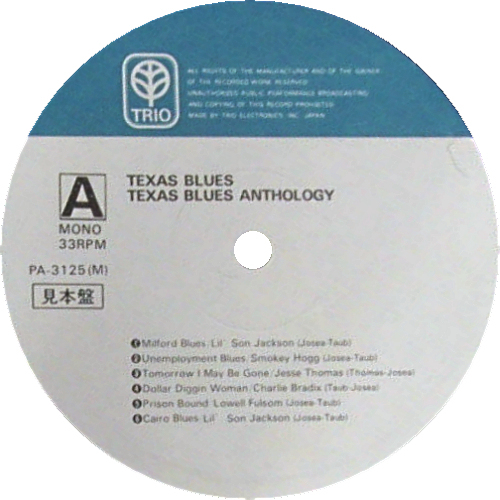 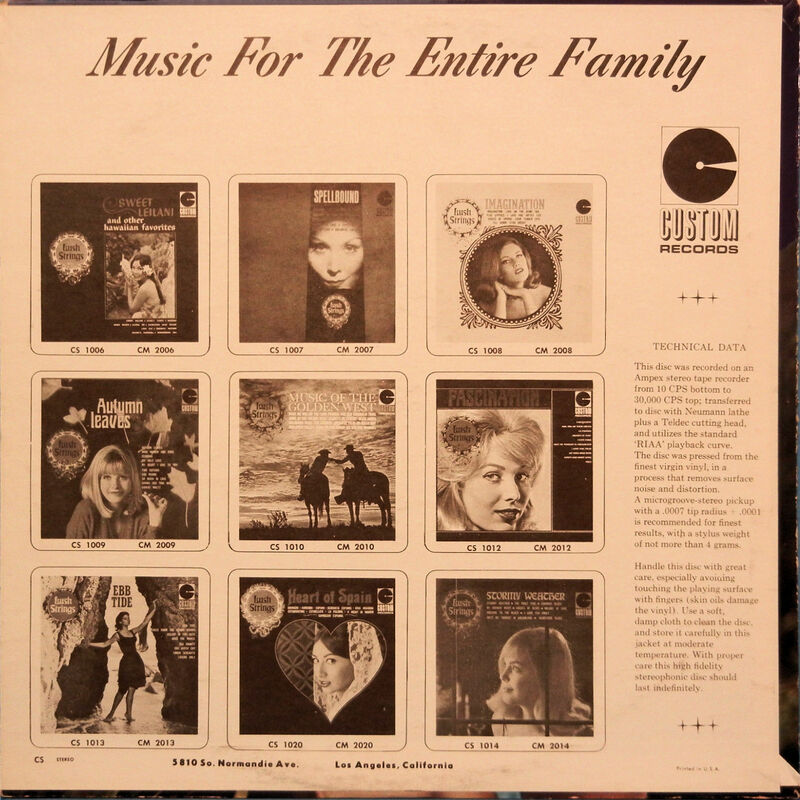 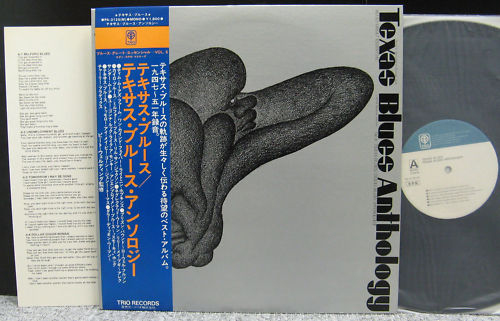 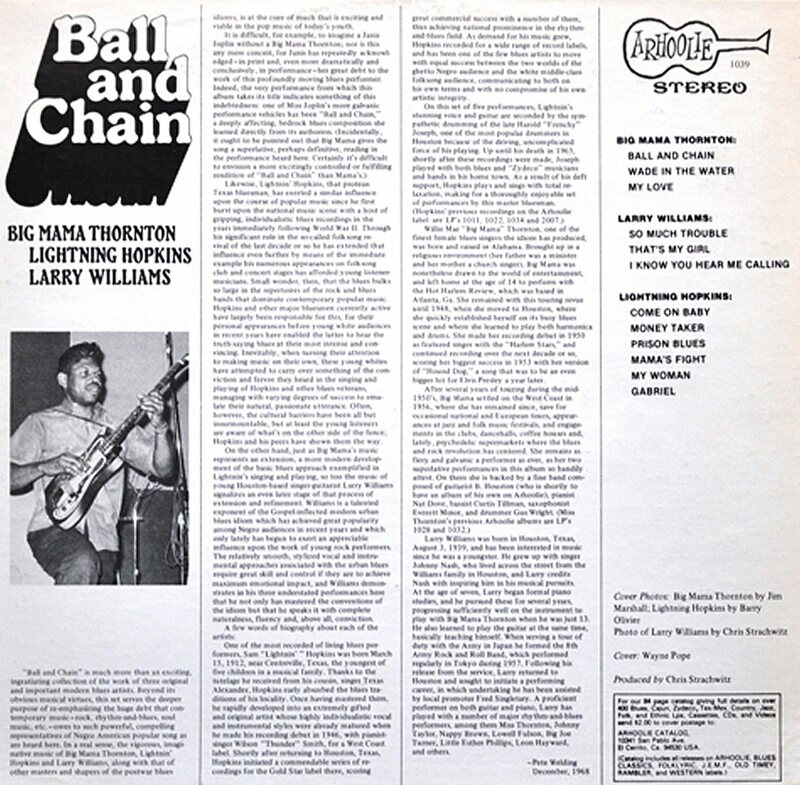 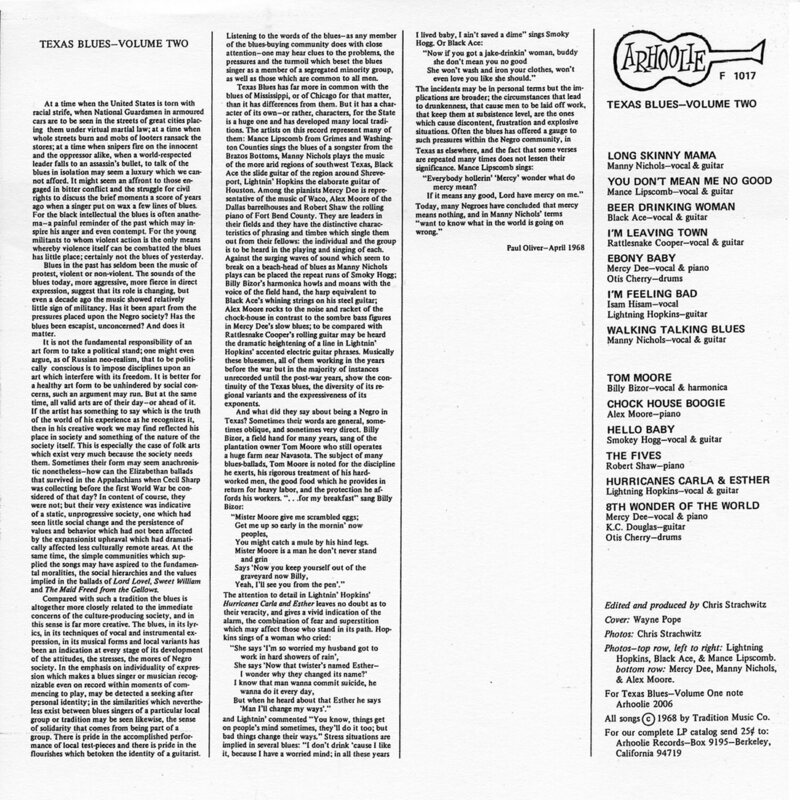 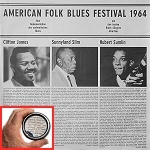 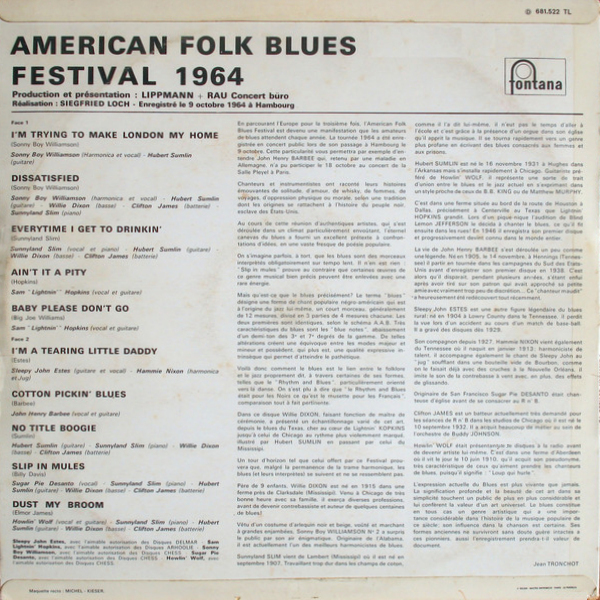 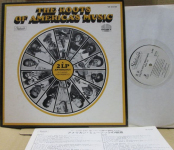 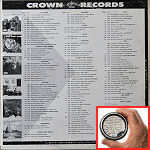 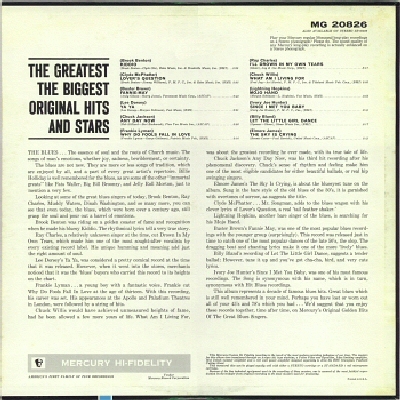 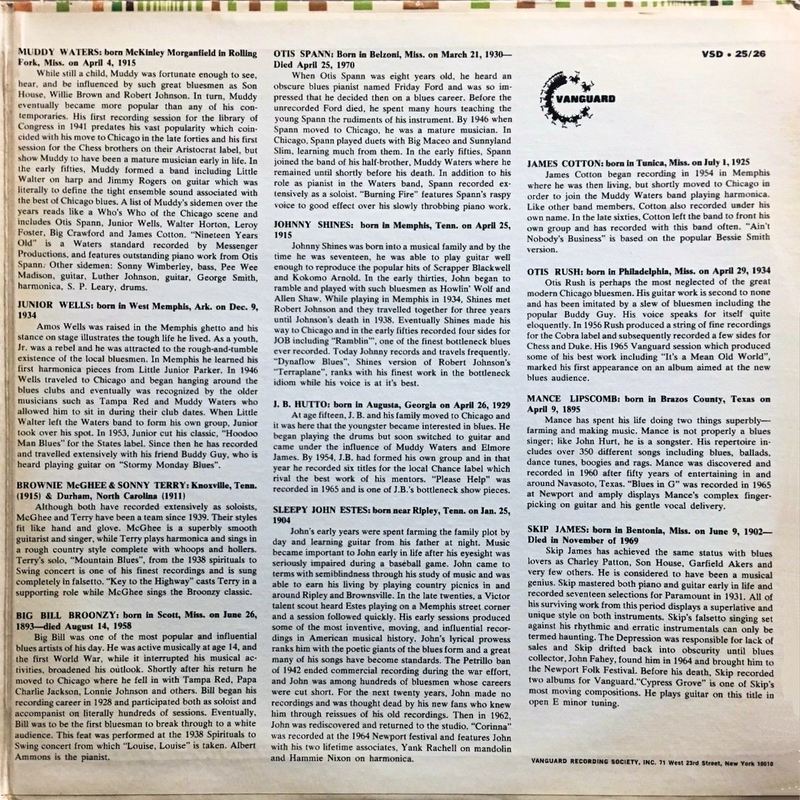 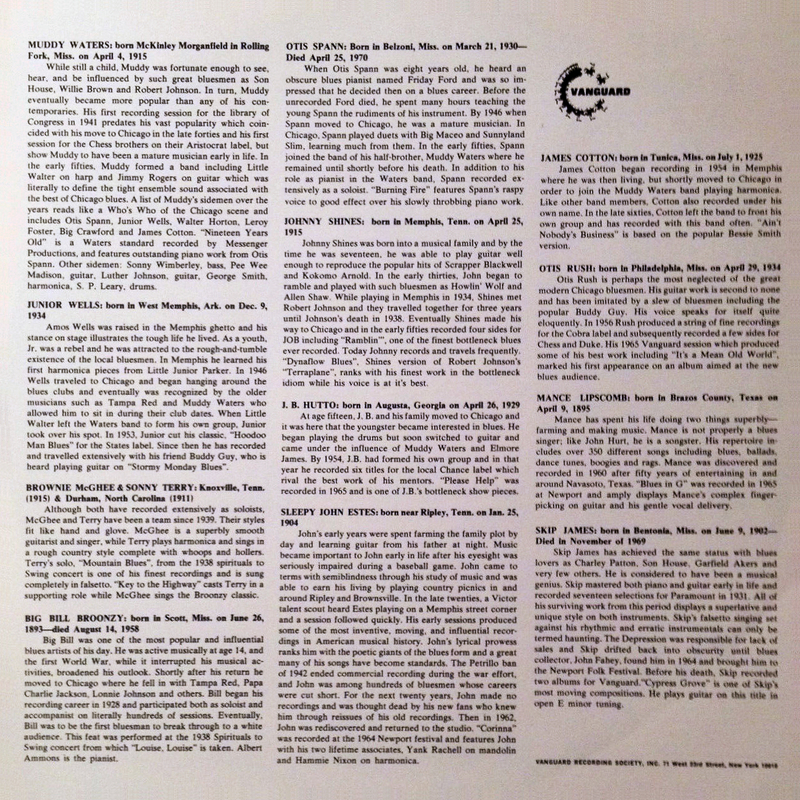 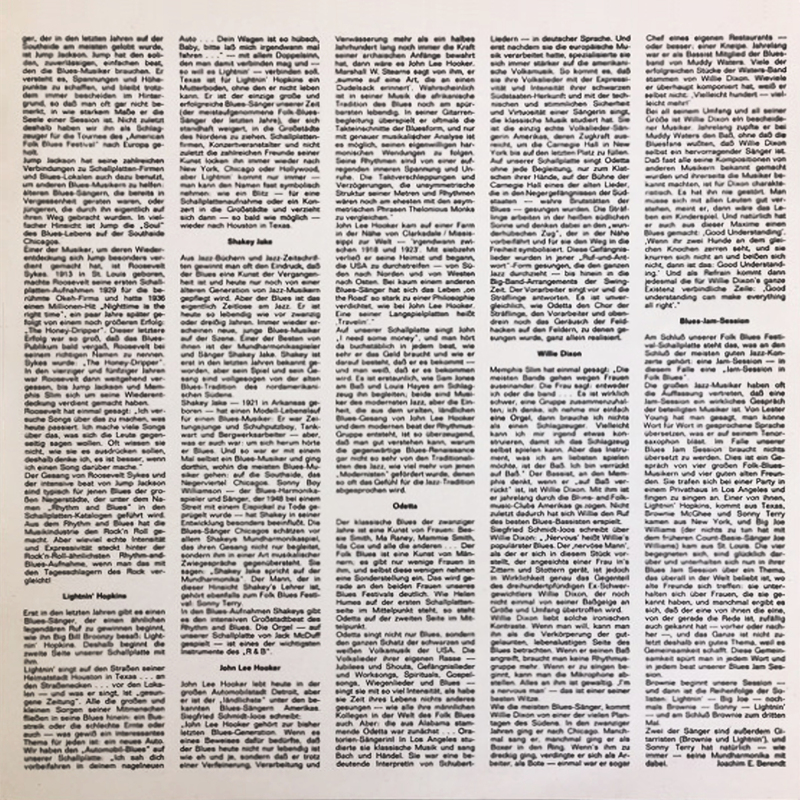 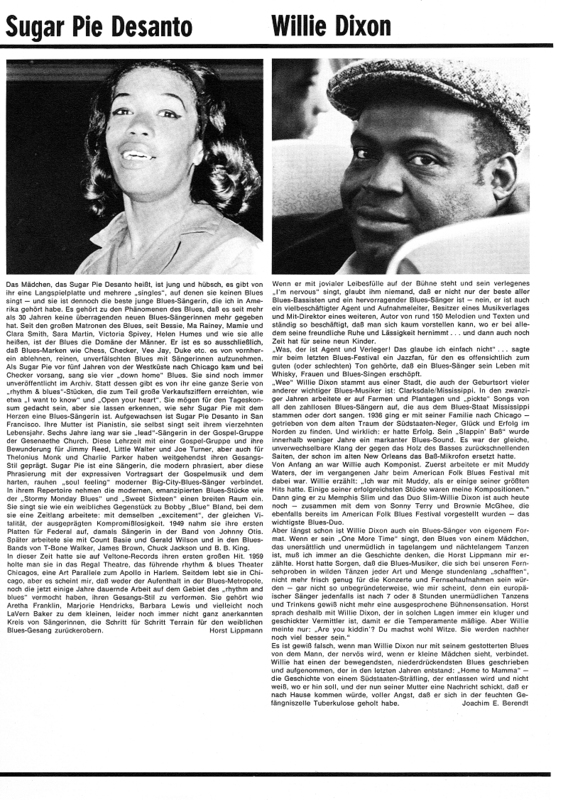 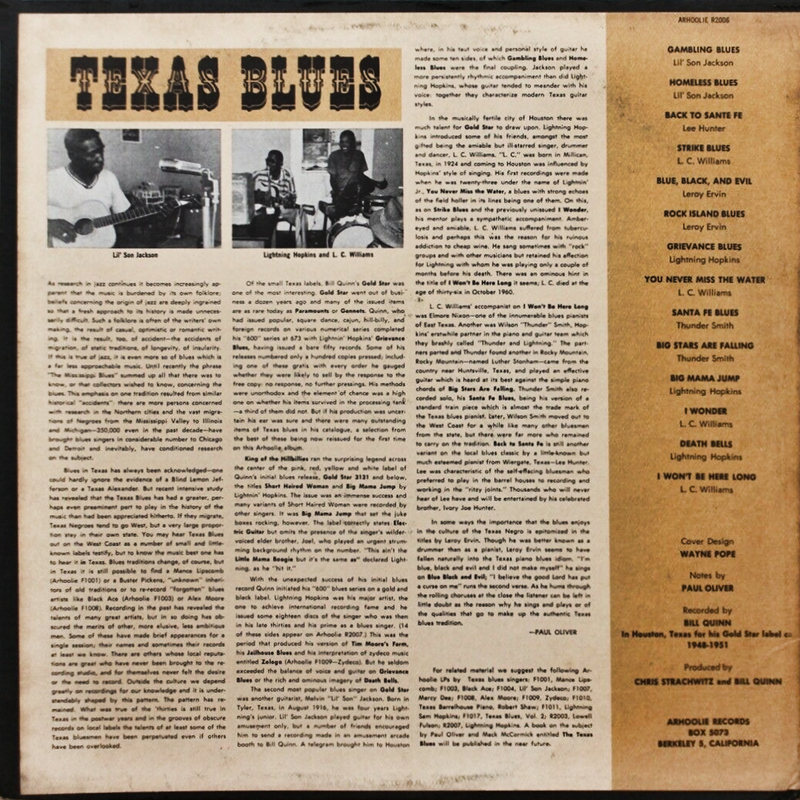 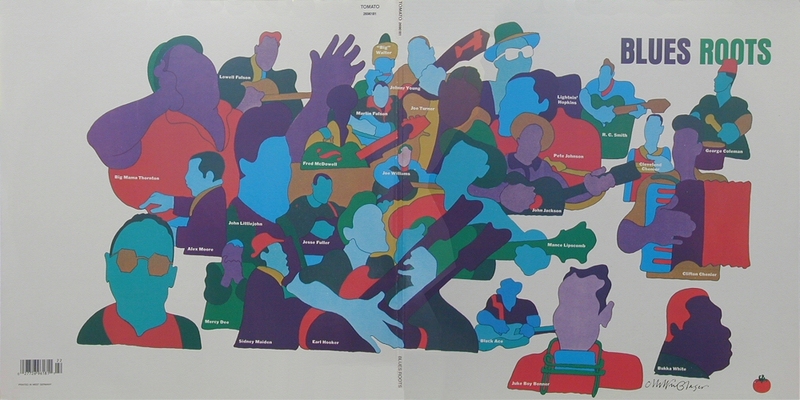 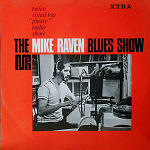 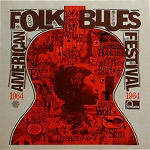 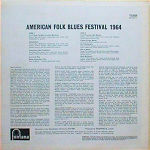 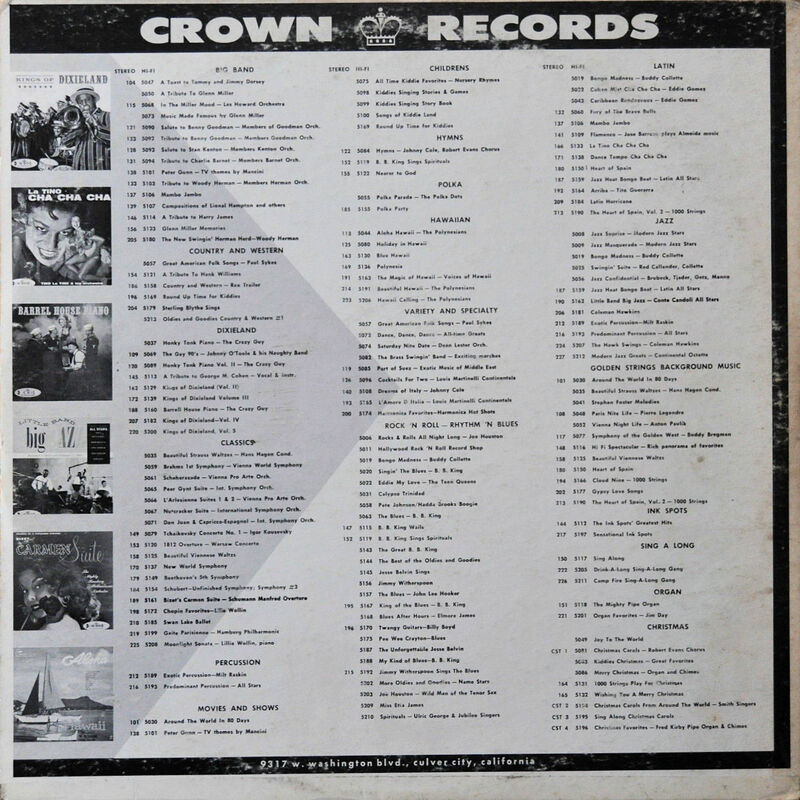 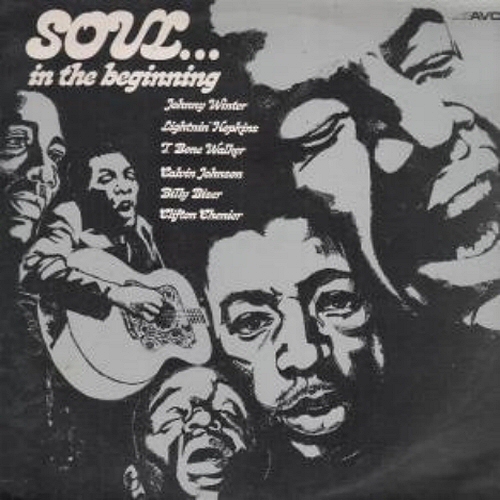 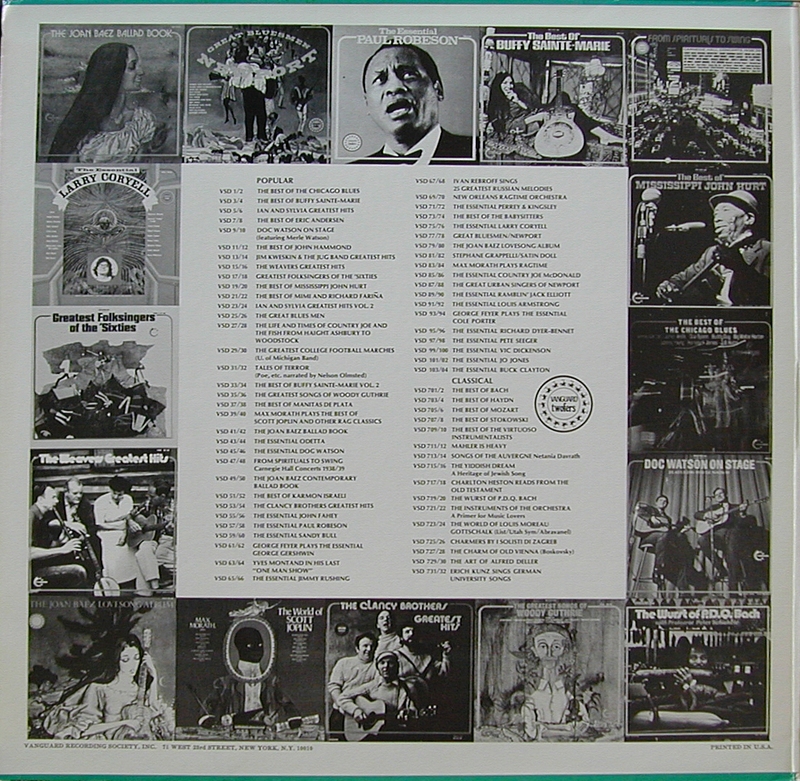 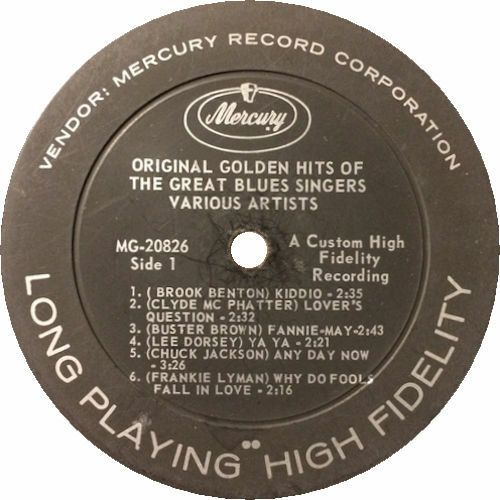 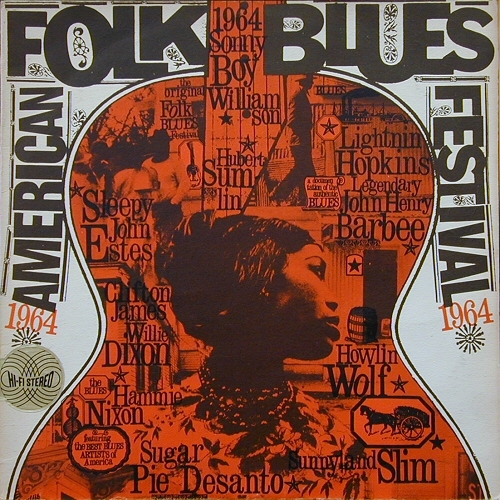 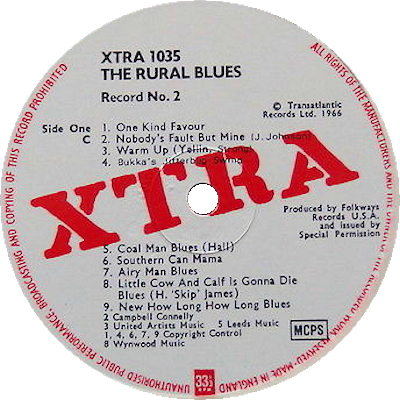 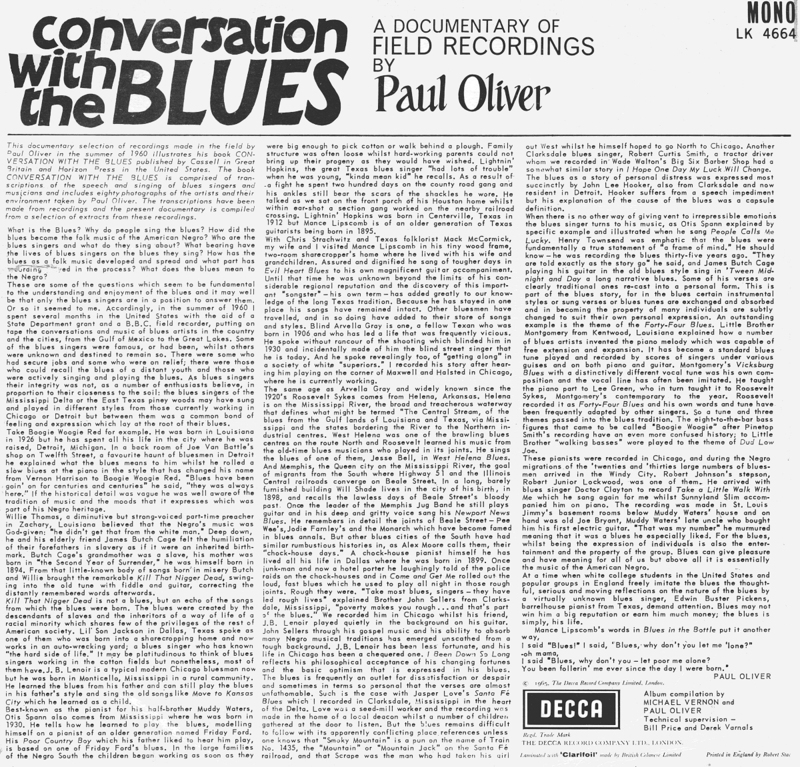 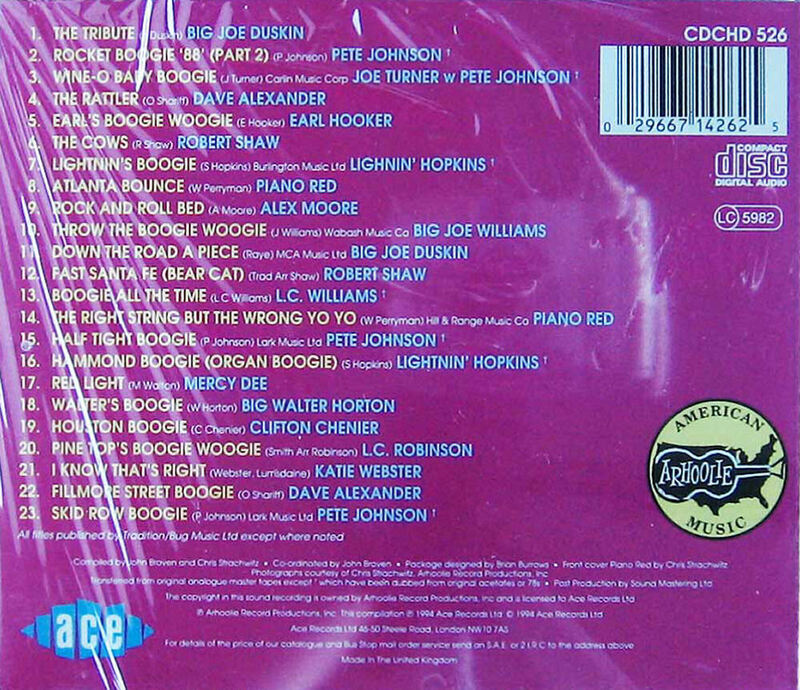 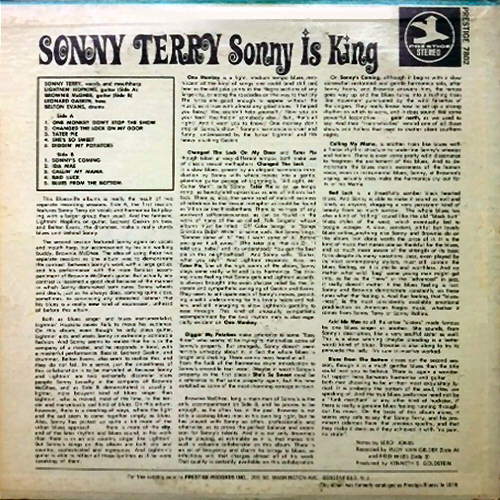 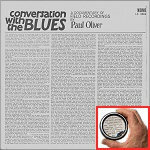 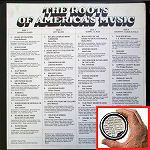 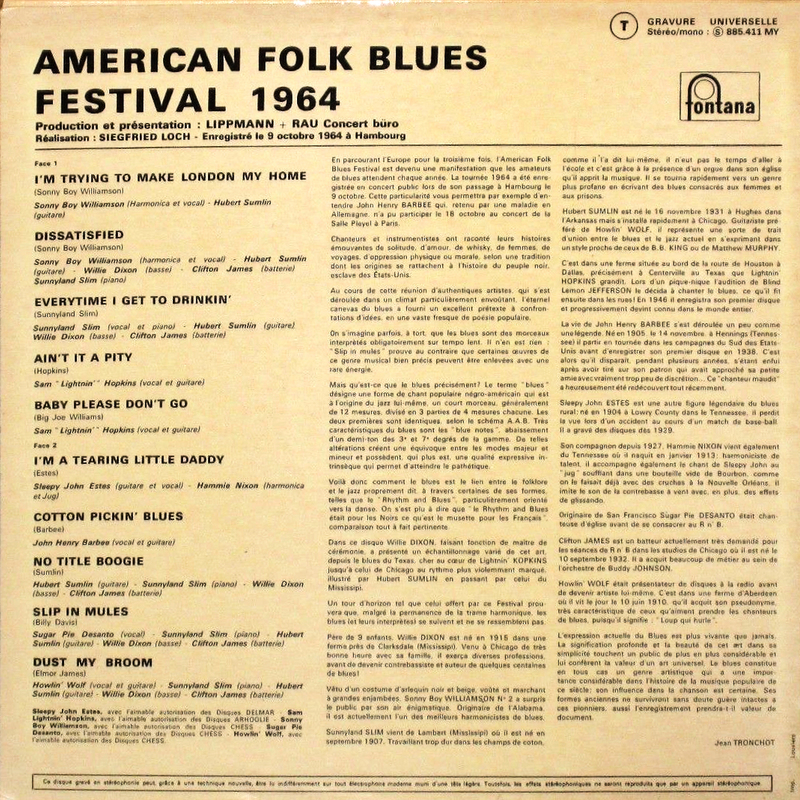 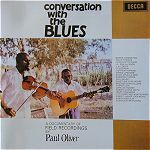 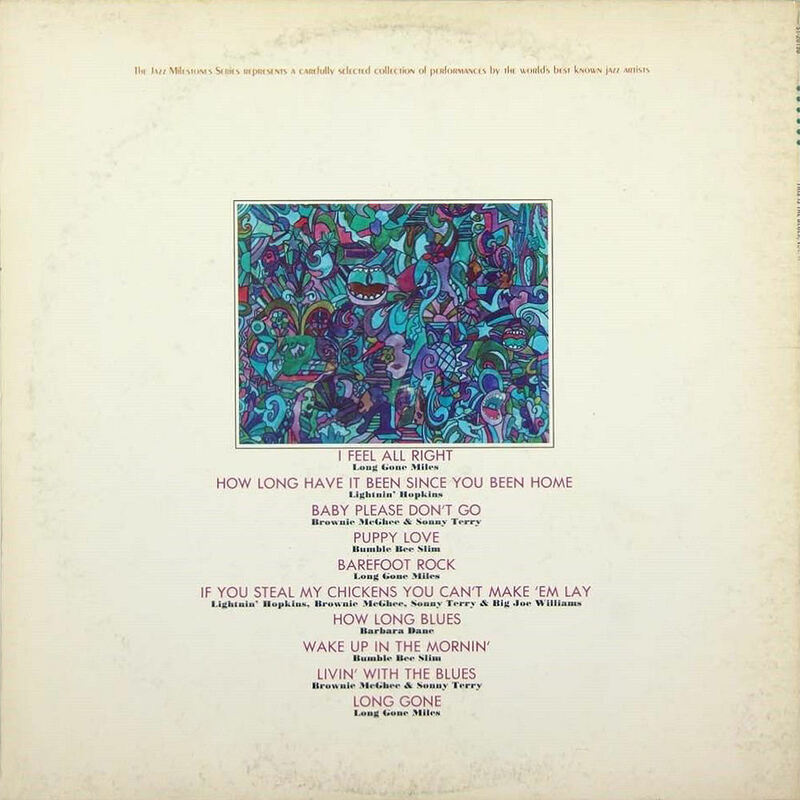 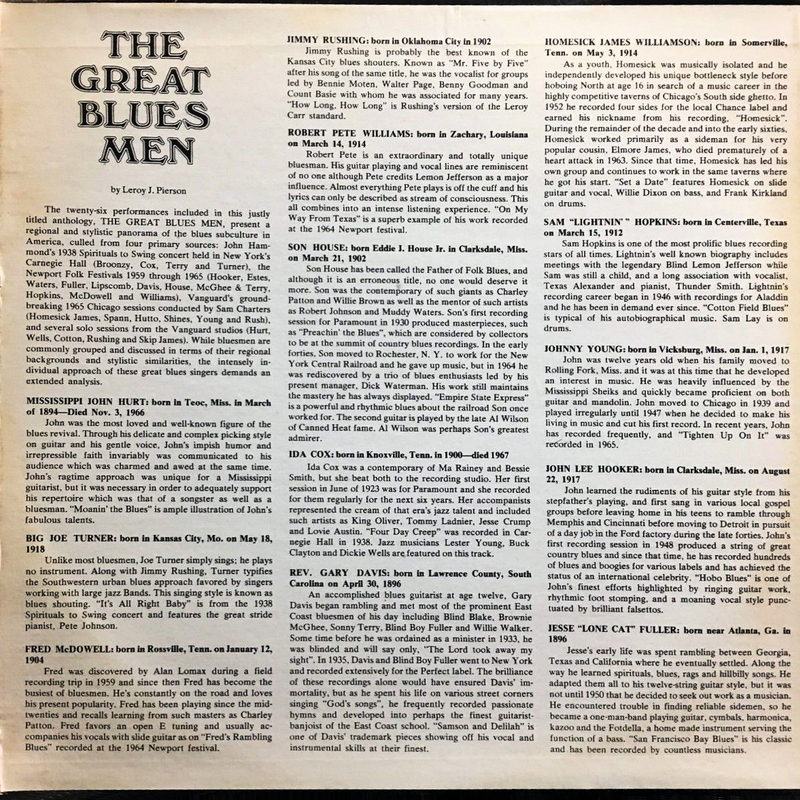 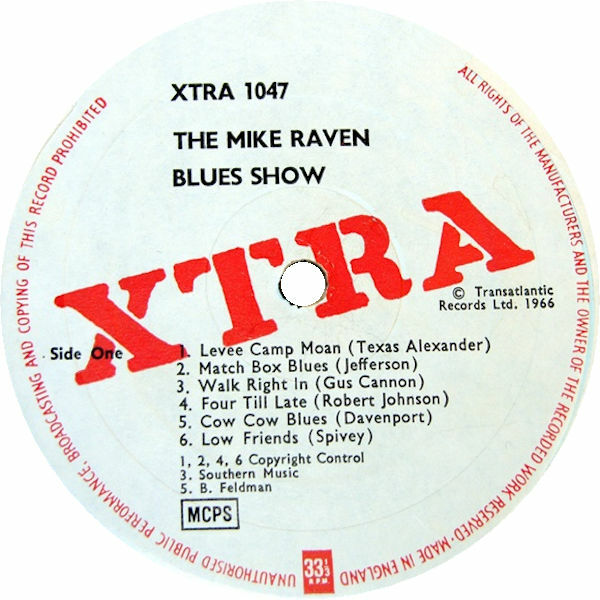 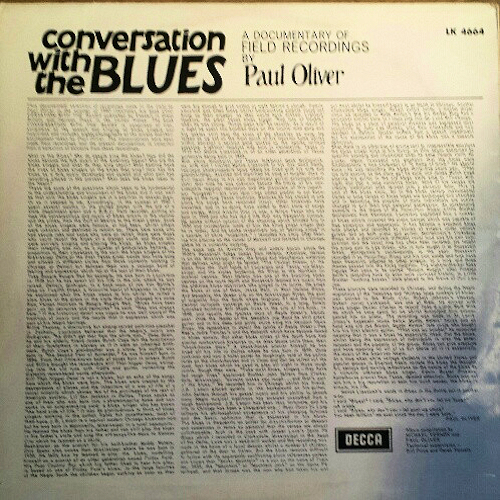 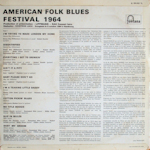 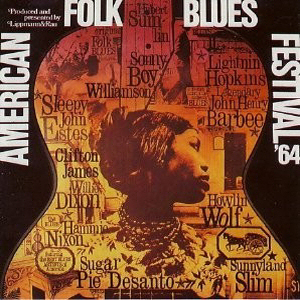 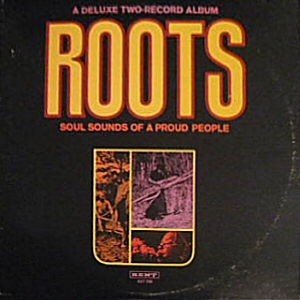 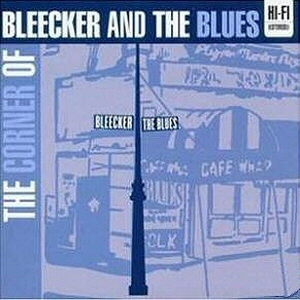 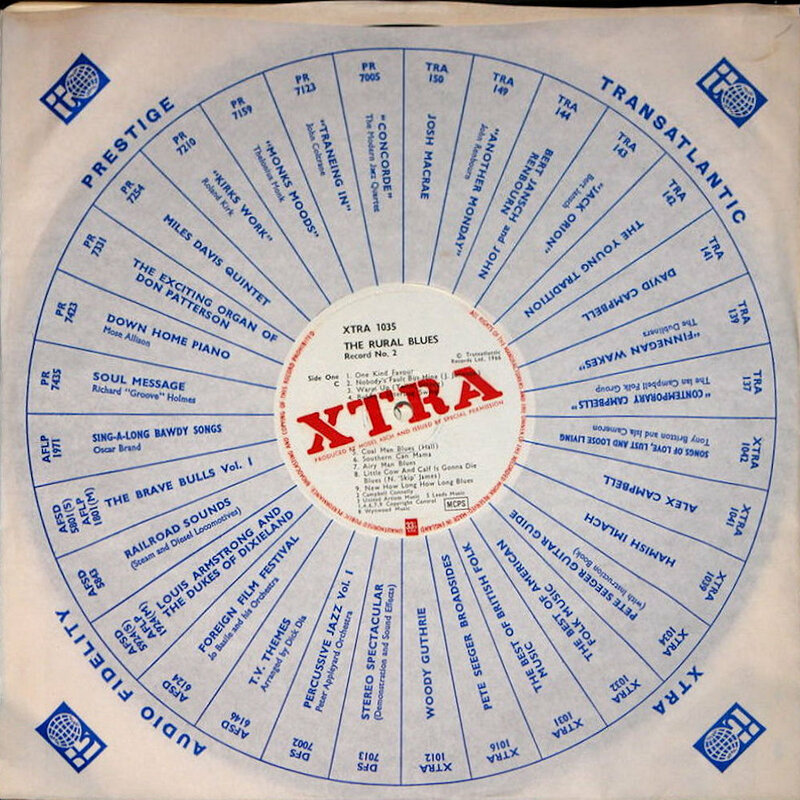 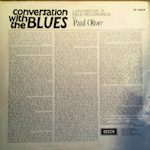 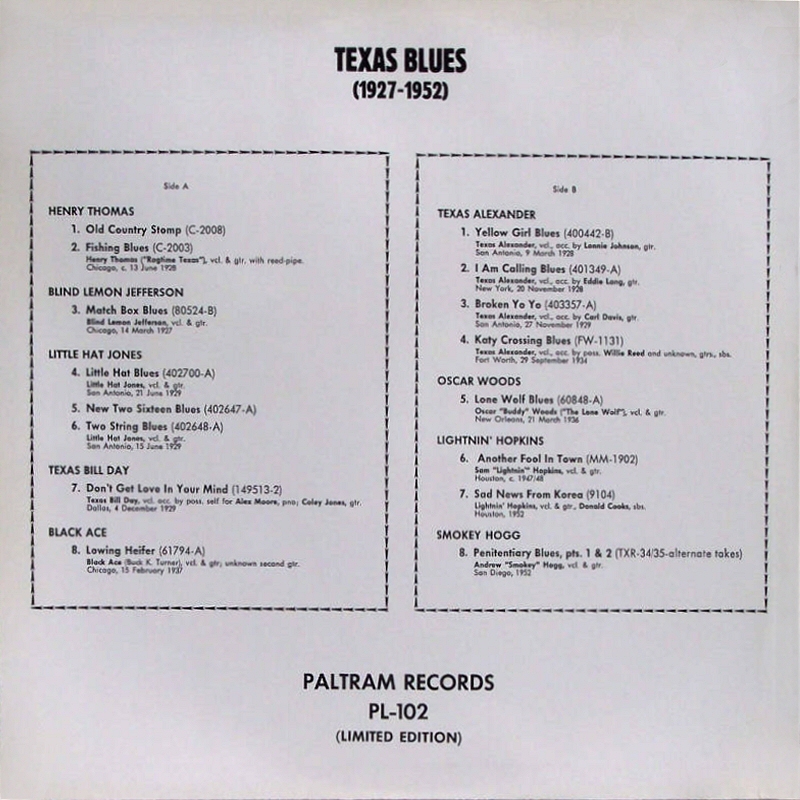 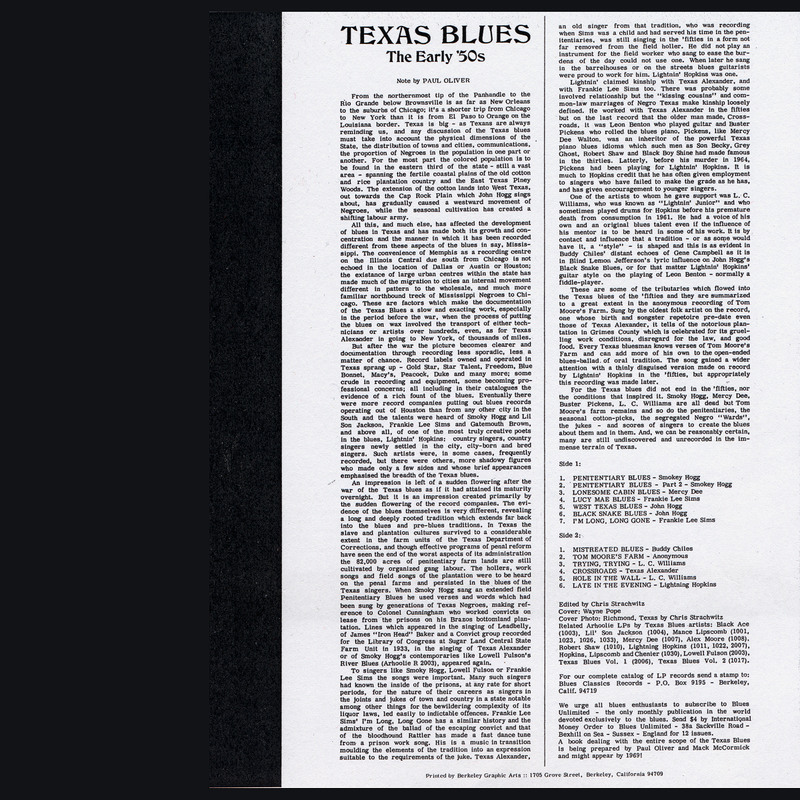 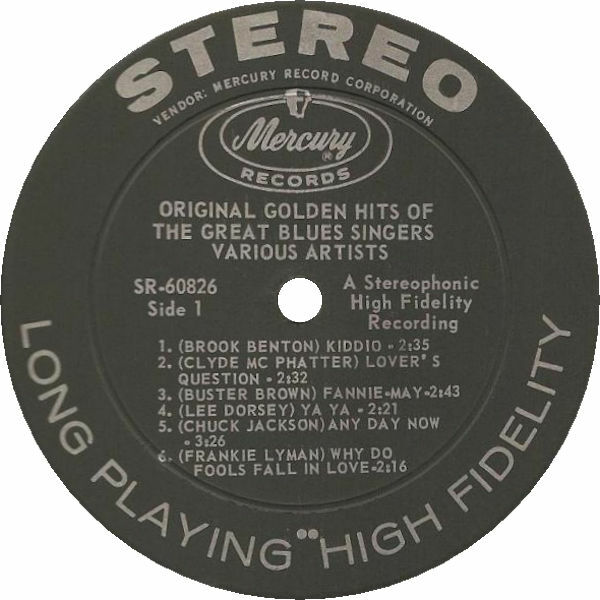 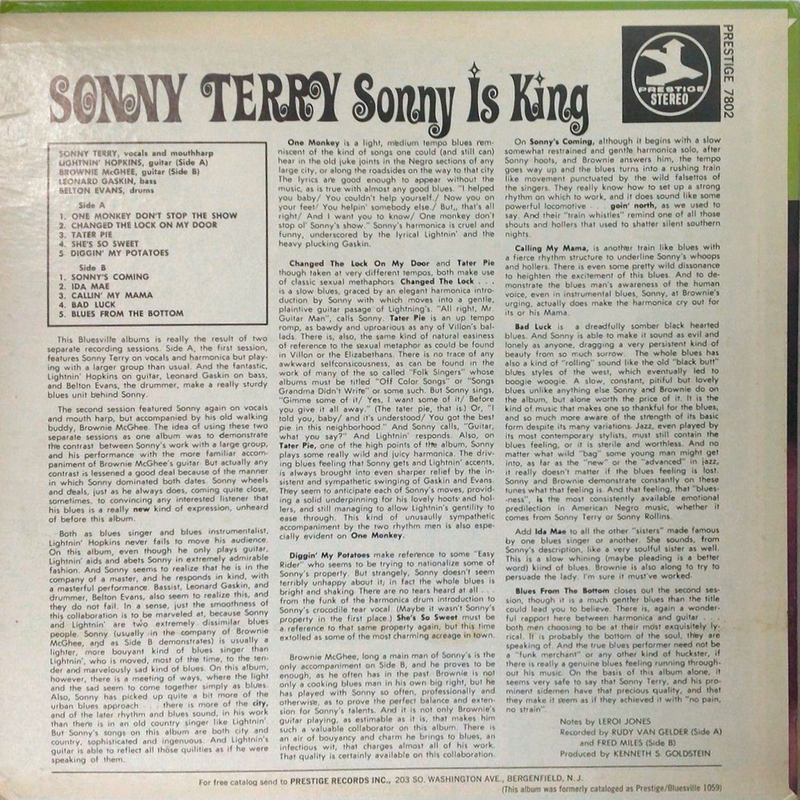 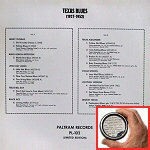 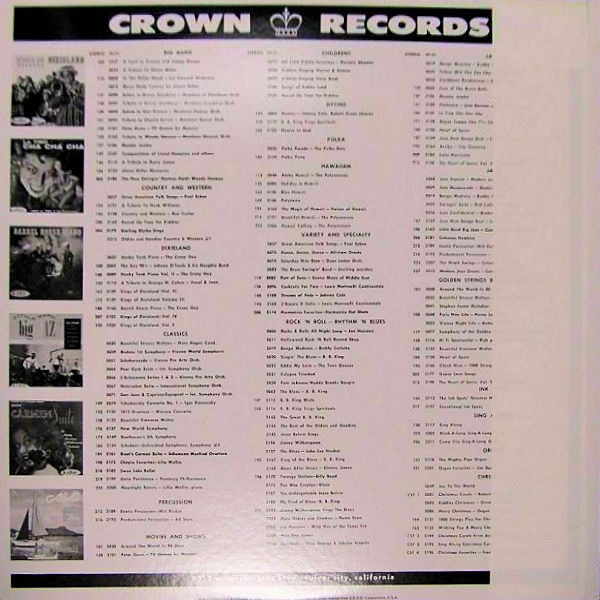 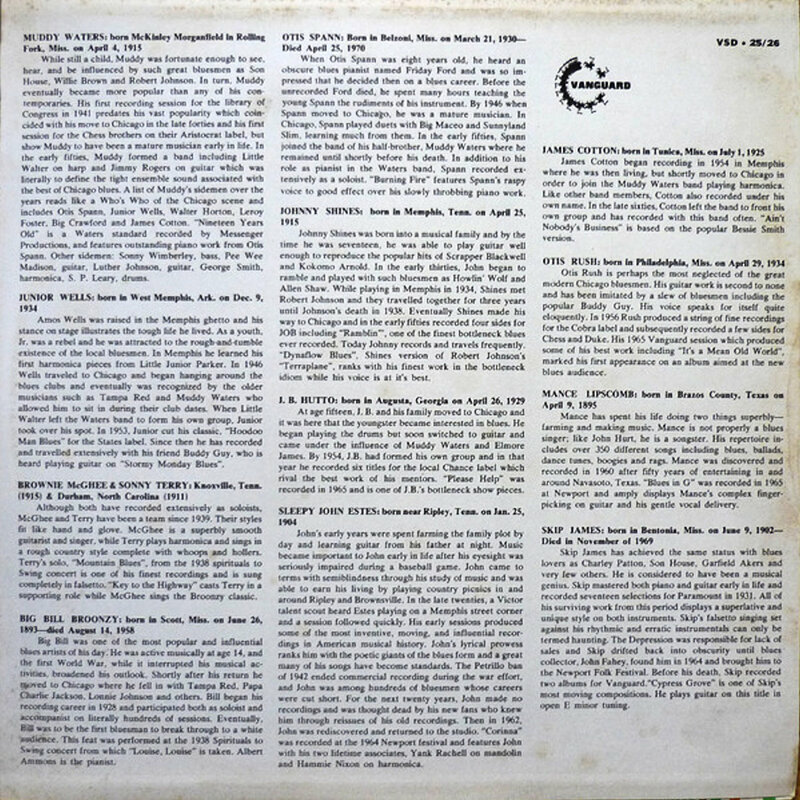 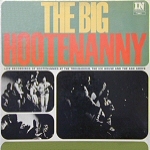 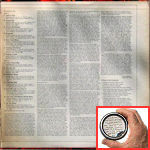 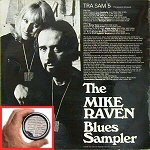 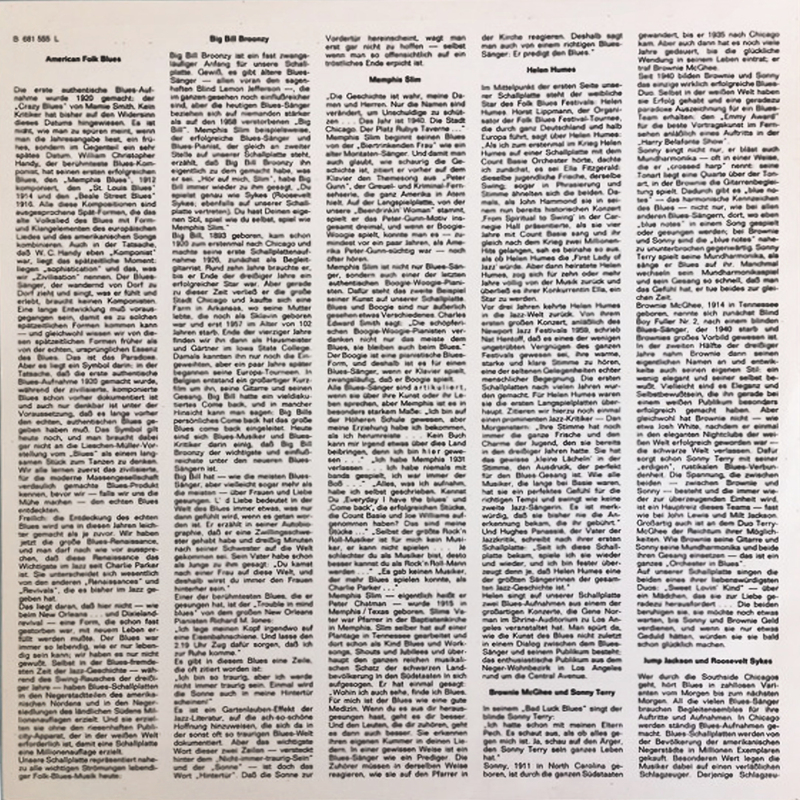 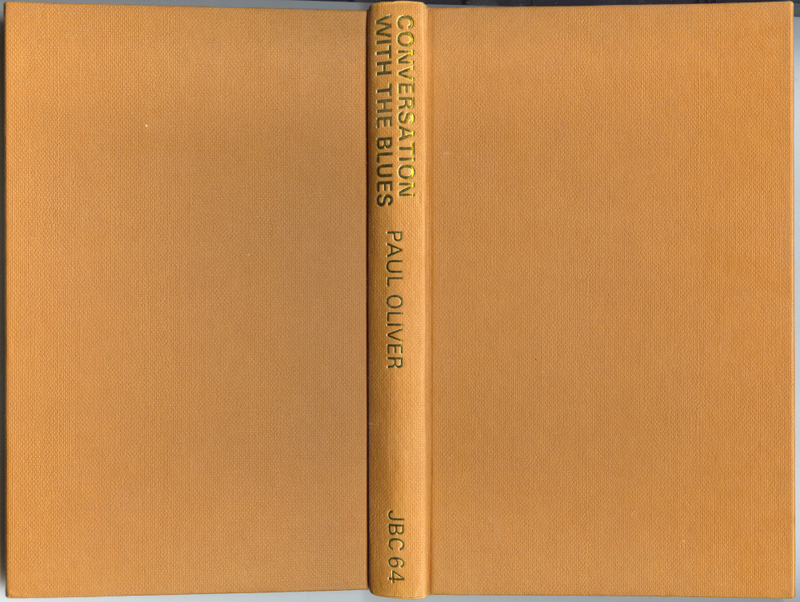 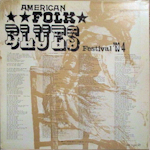 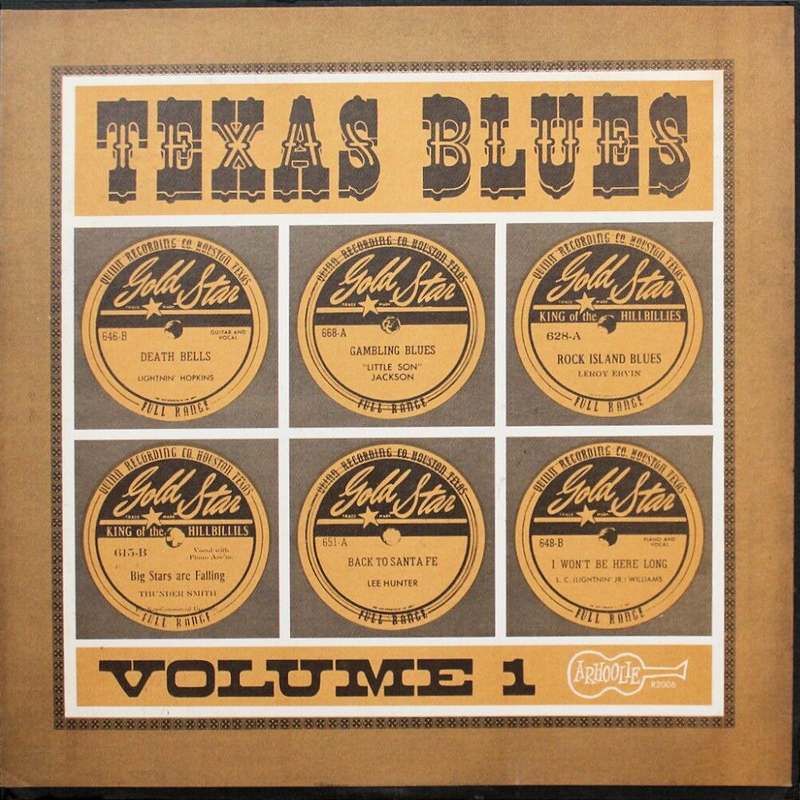 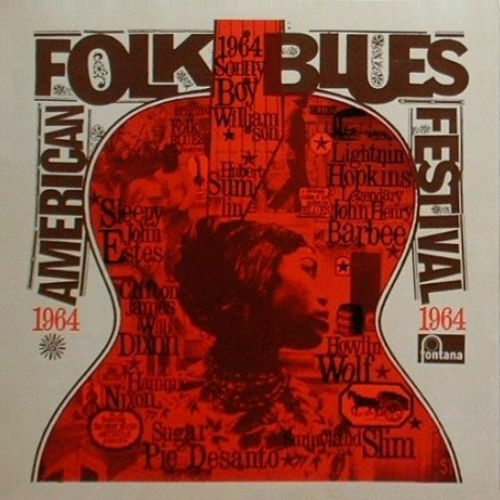 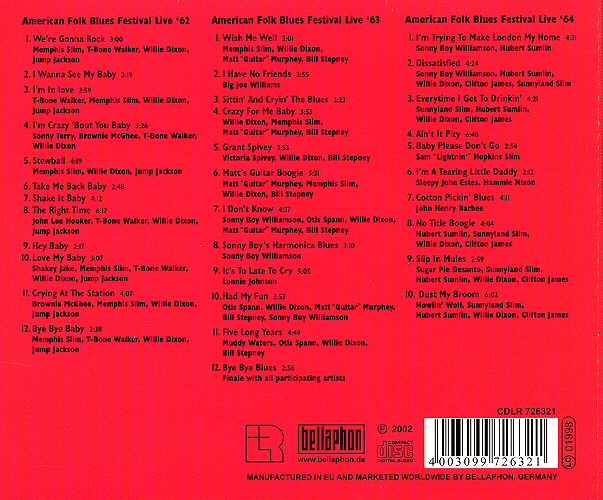 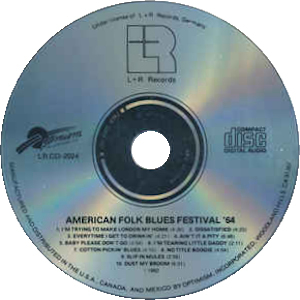 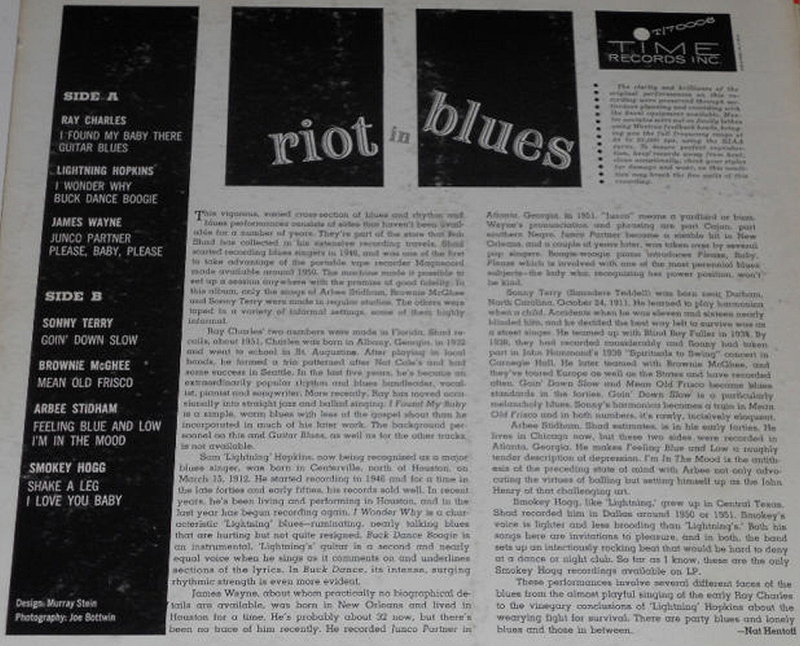 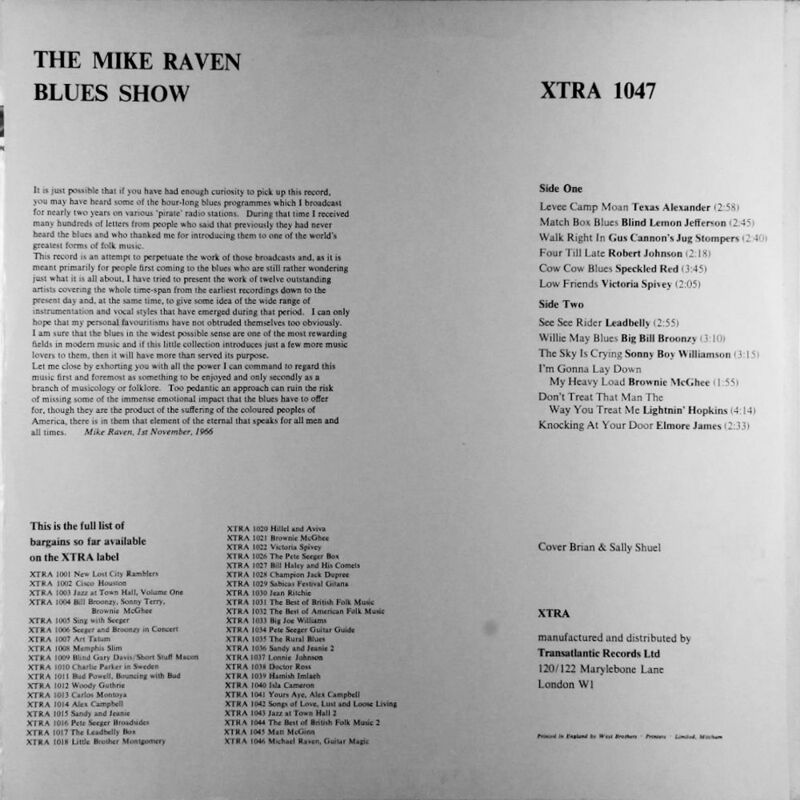 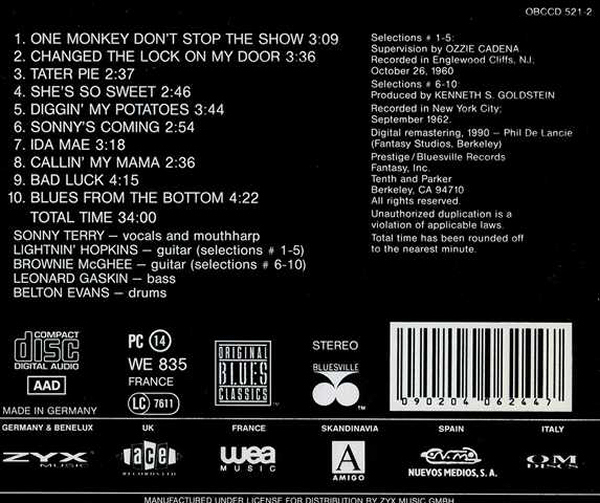 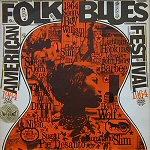 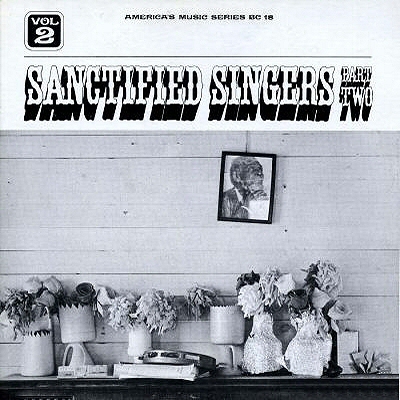 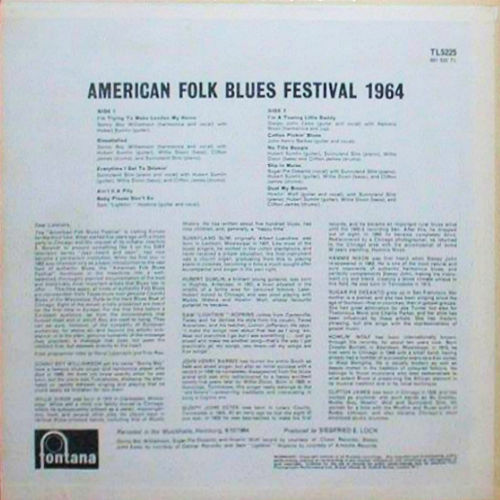 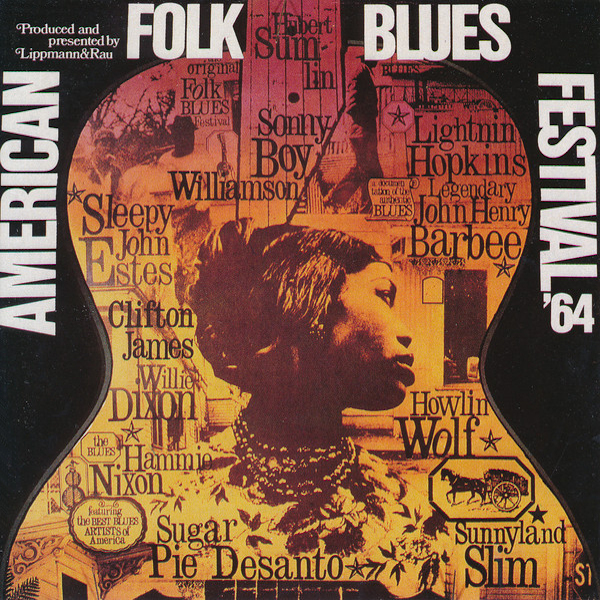 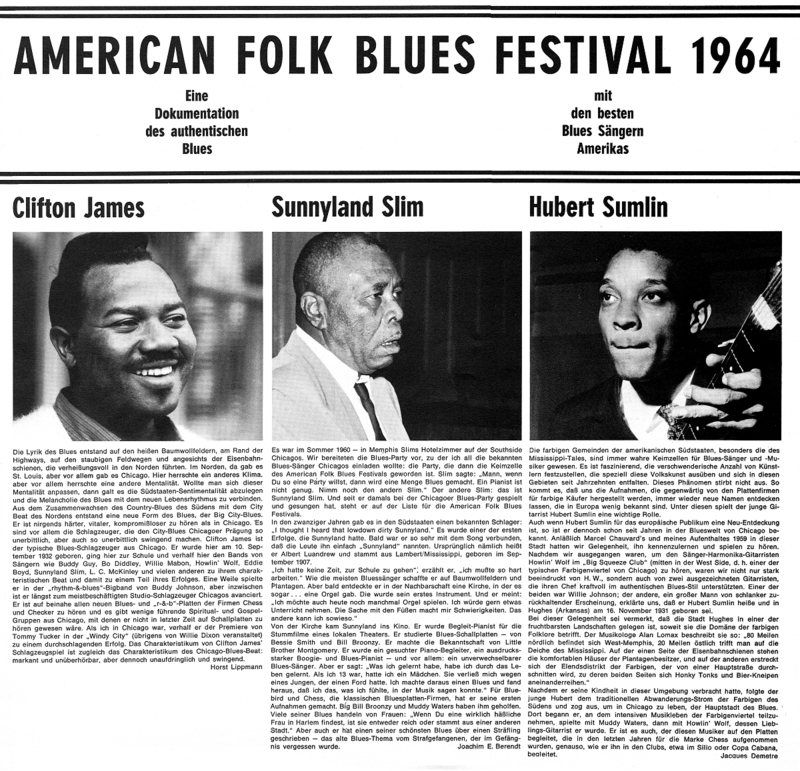 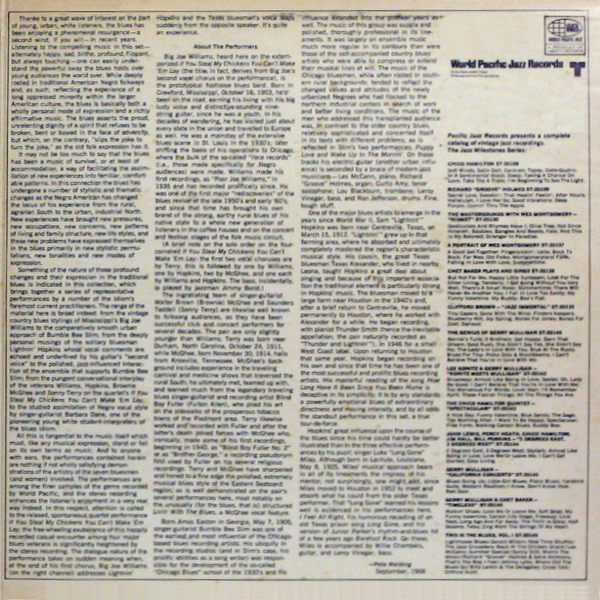 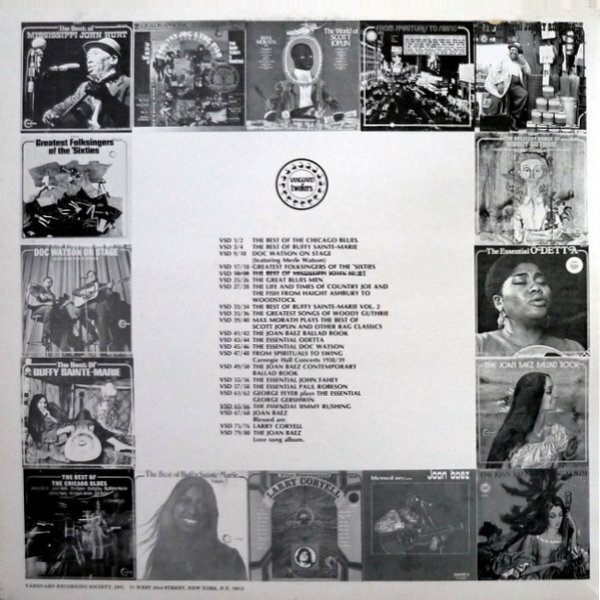 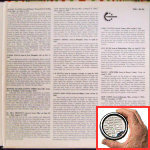 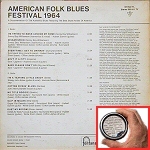 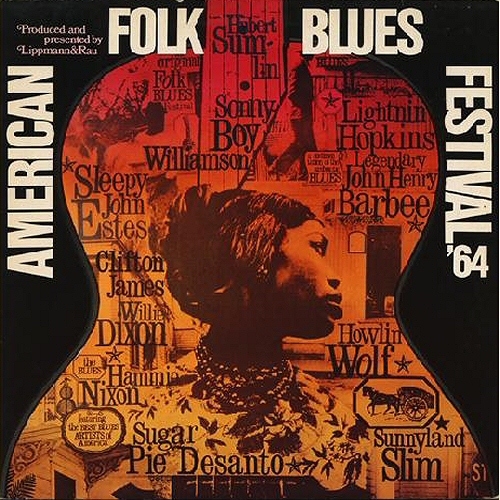 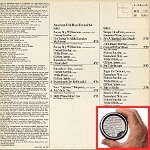 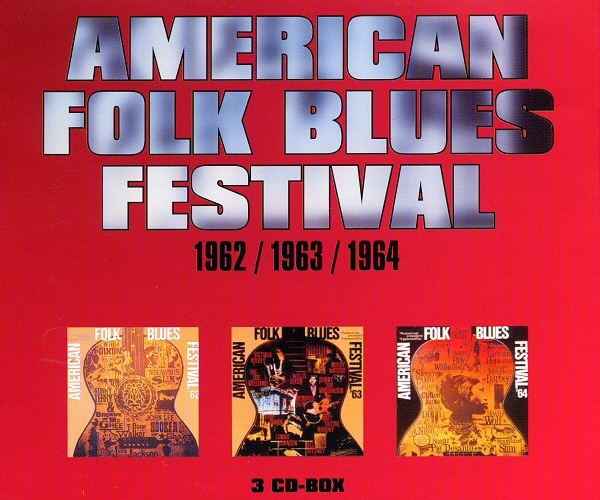 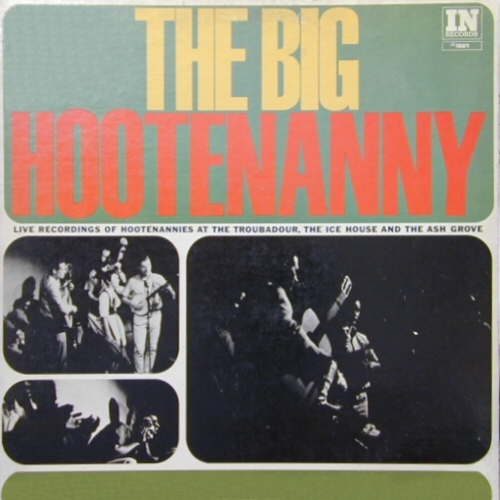 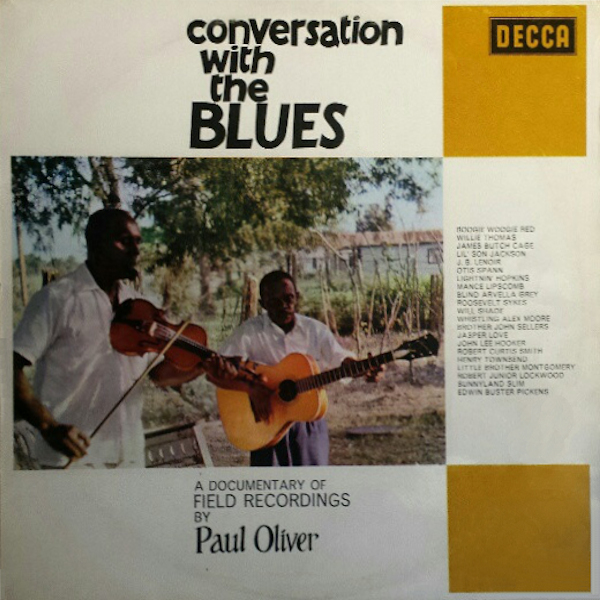 (along with BVLP 1057 and BVLP 1061) "How Many More Years I Got ..."
(=) Evidence ECD 26100 (US 1995) "American Folk Blues Festival '62-'65" CD 4: "'sixty four"
= Prestige PR 7592 (US 1968) "Lightnin' Hopkins' Greatest Hits!" 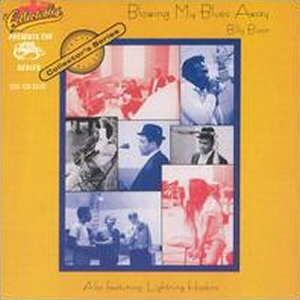 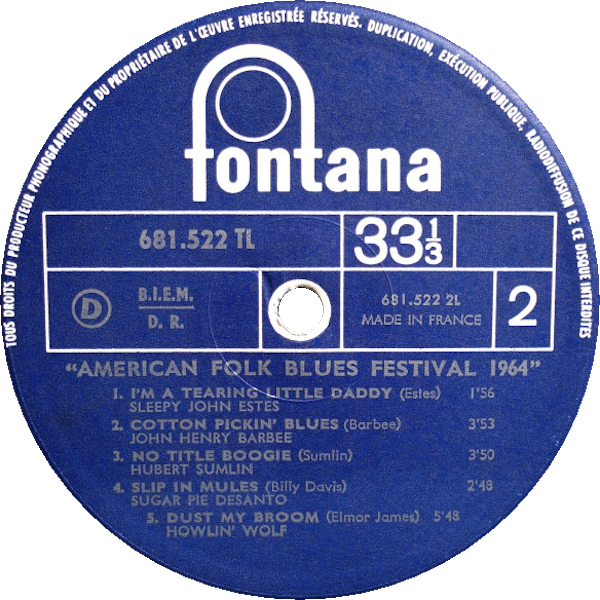 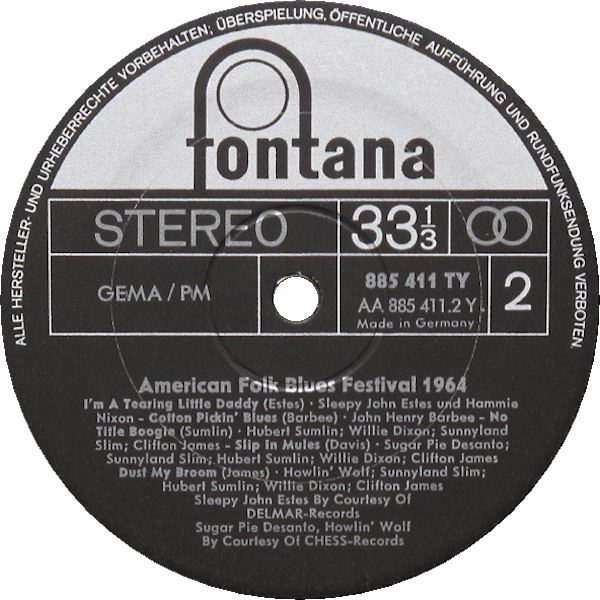 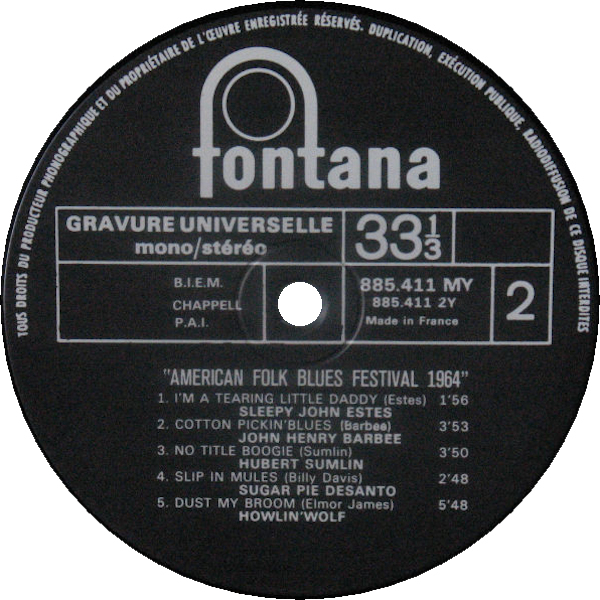 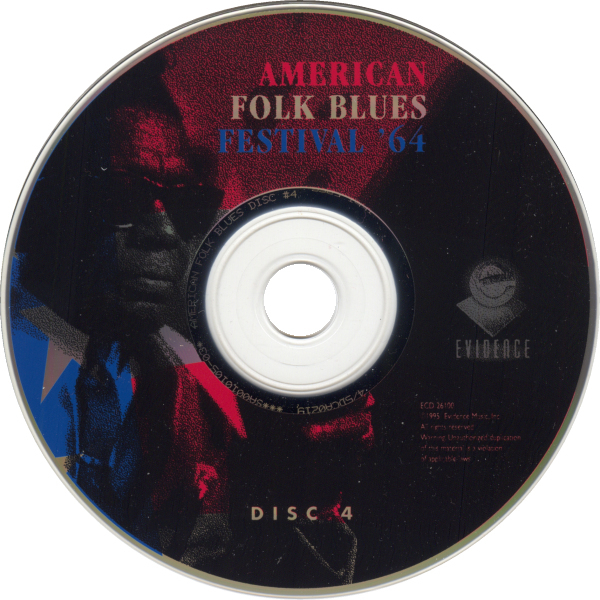 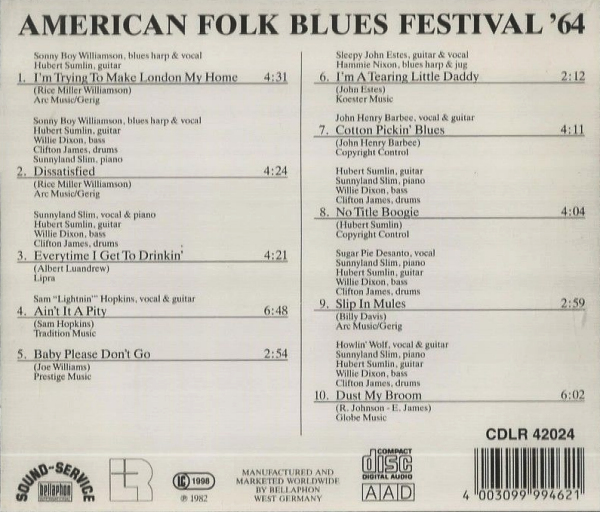 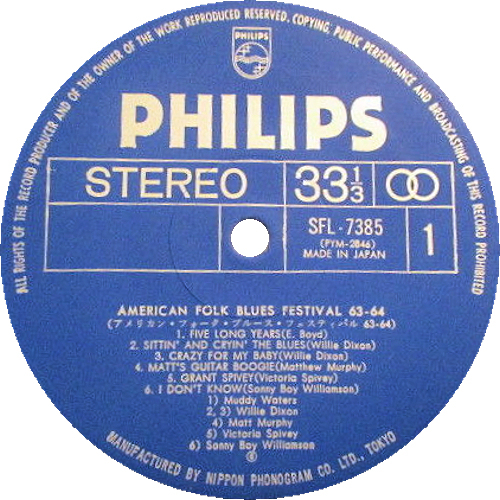 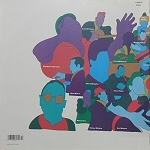 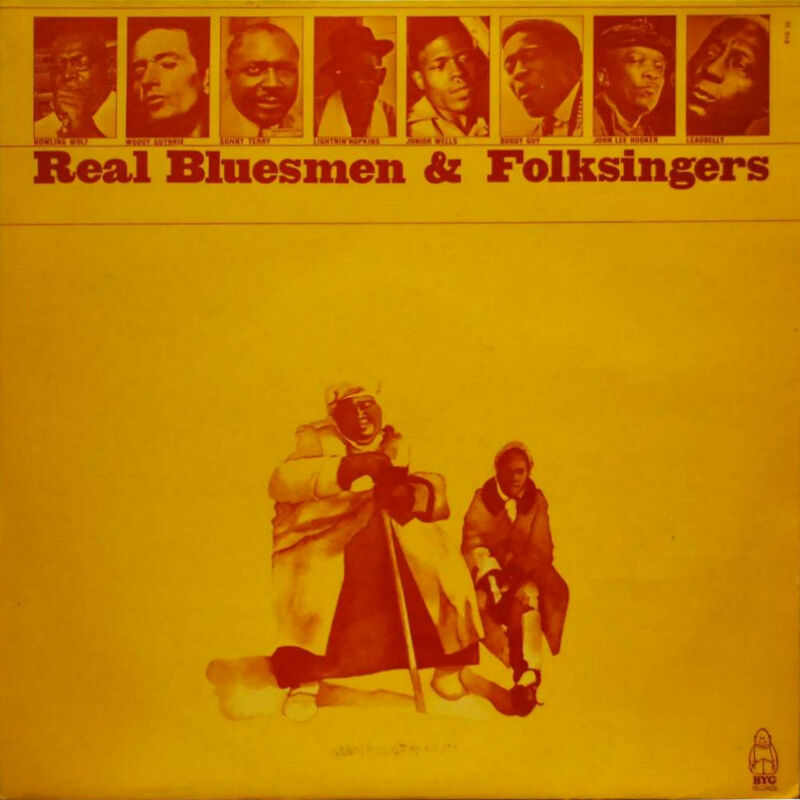 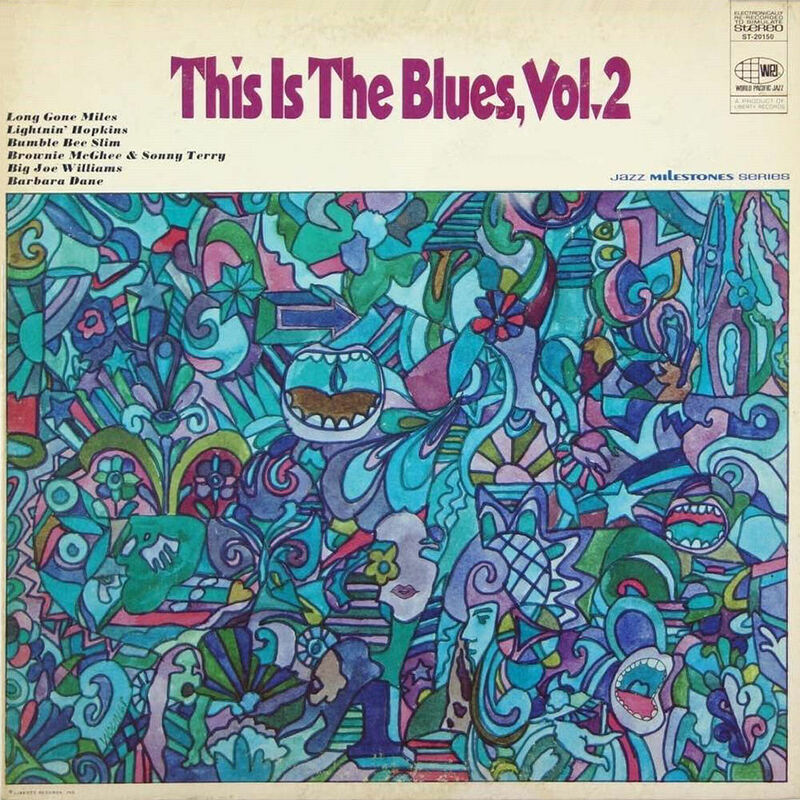 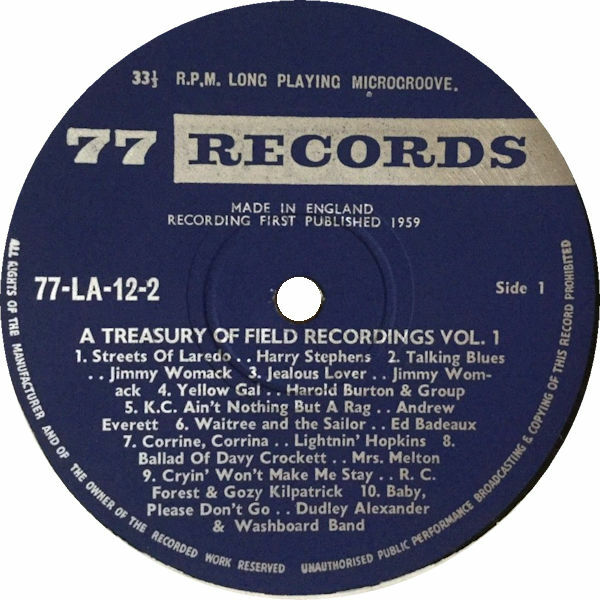 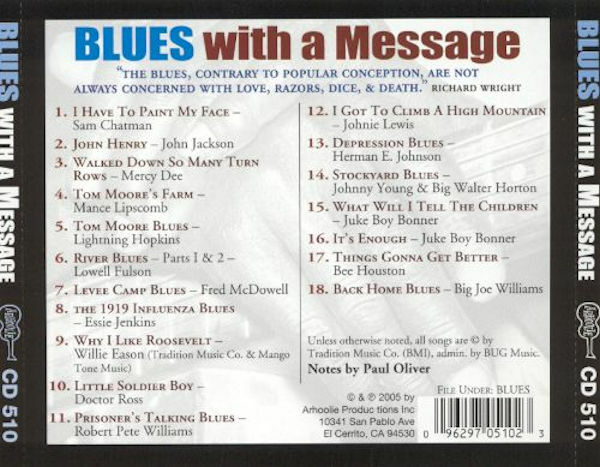 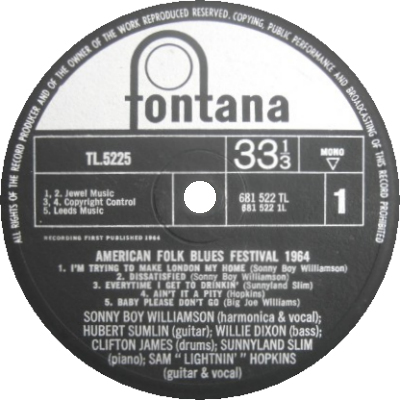 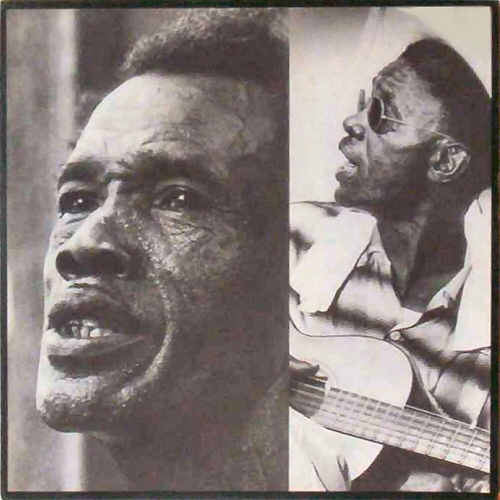 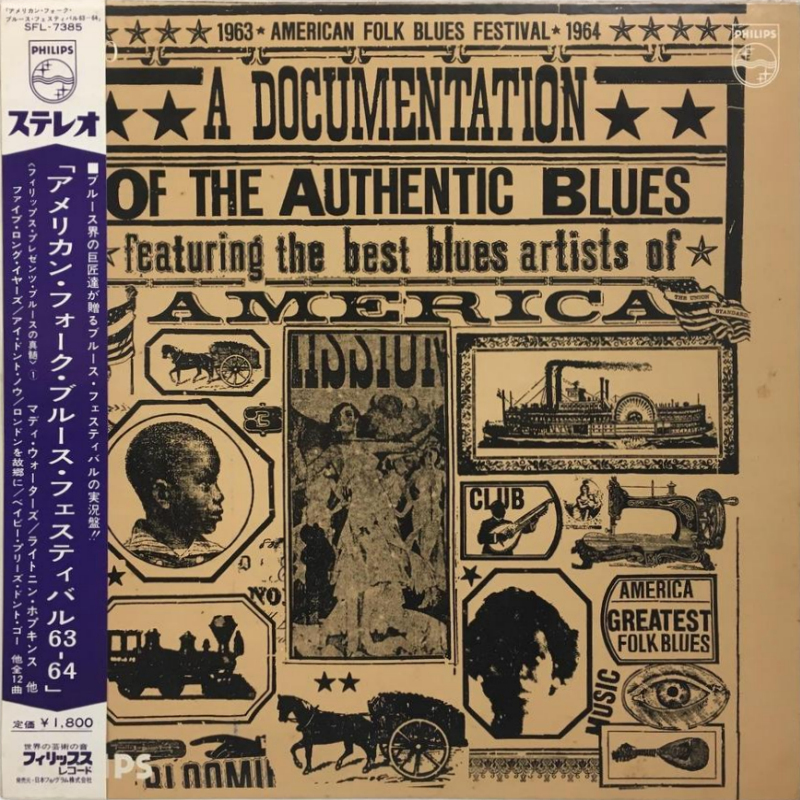 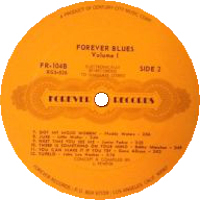 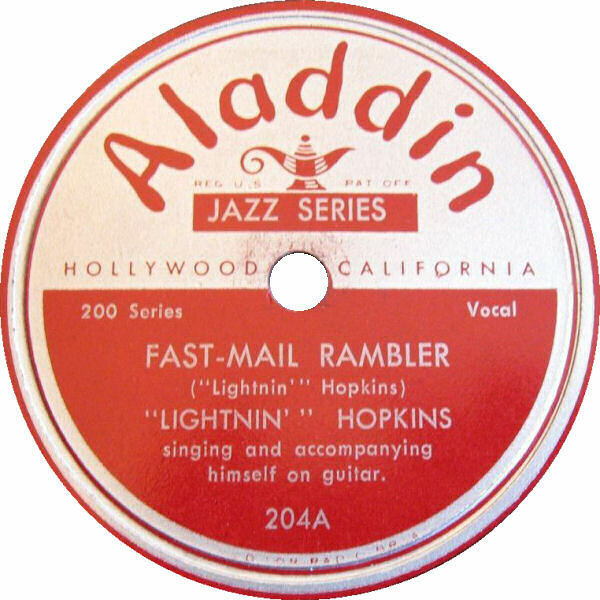 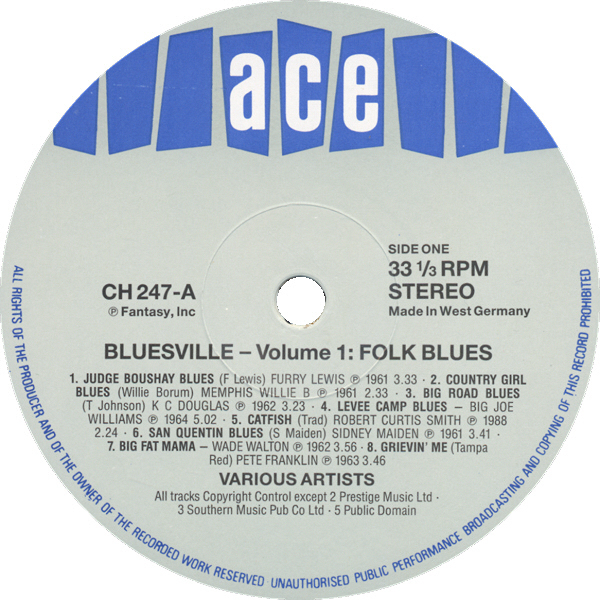 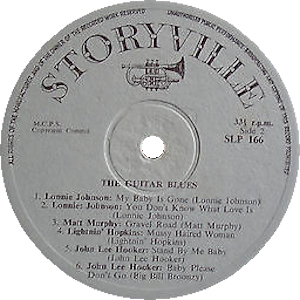 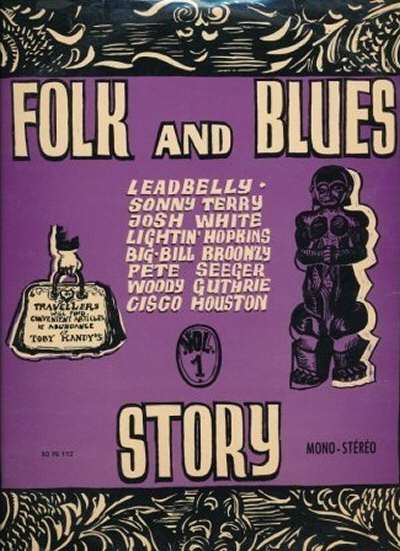 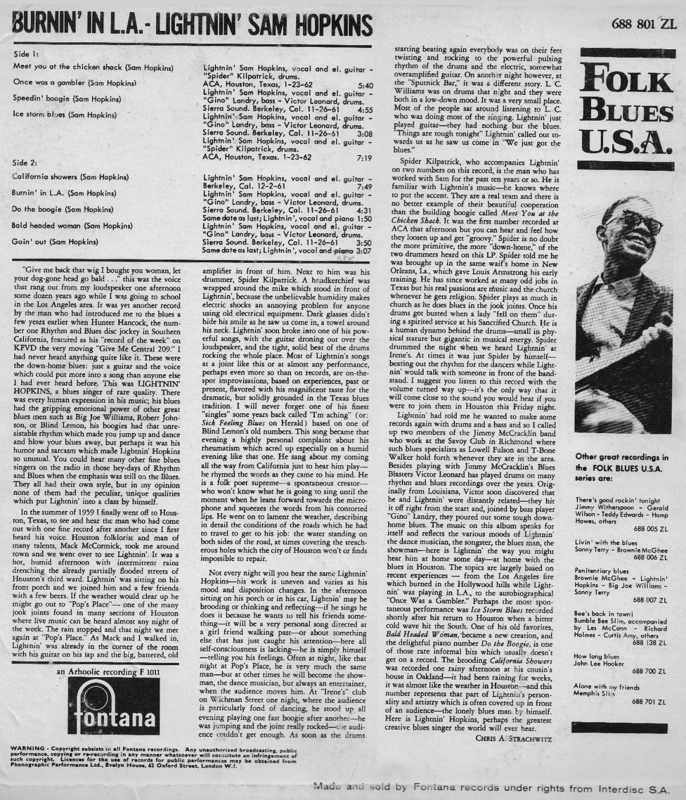 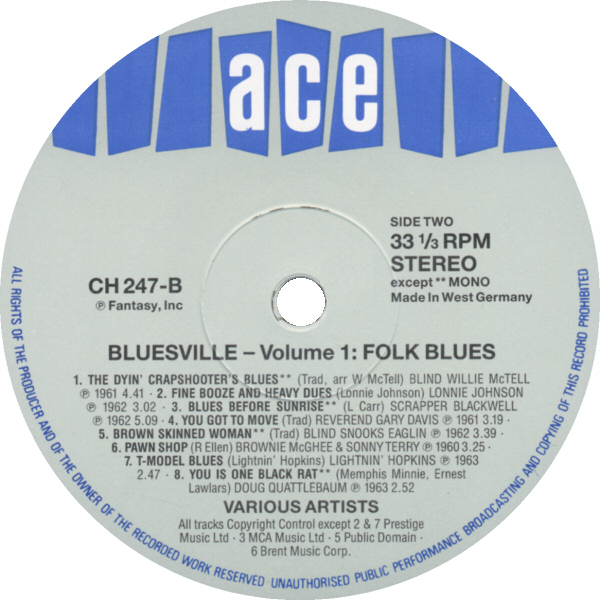 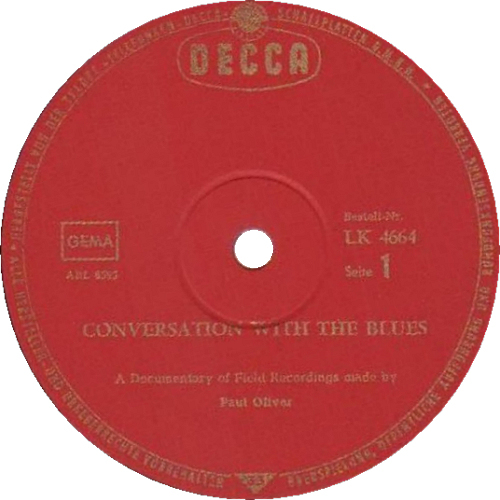 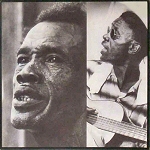 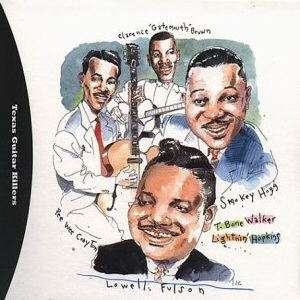 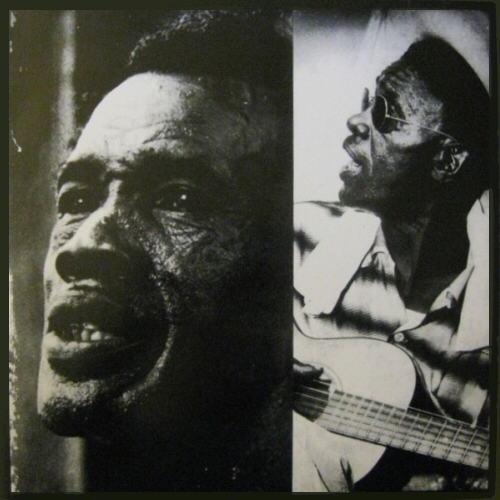 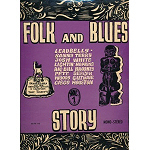 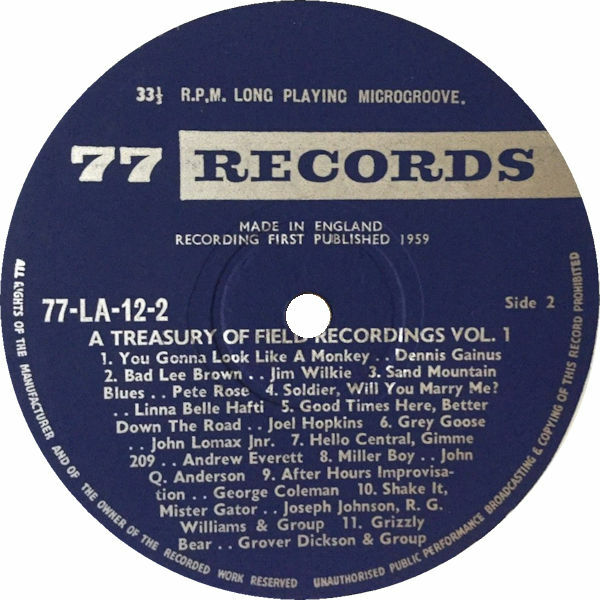 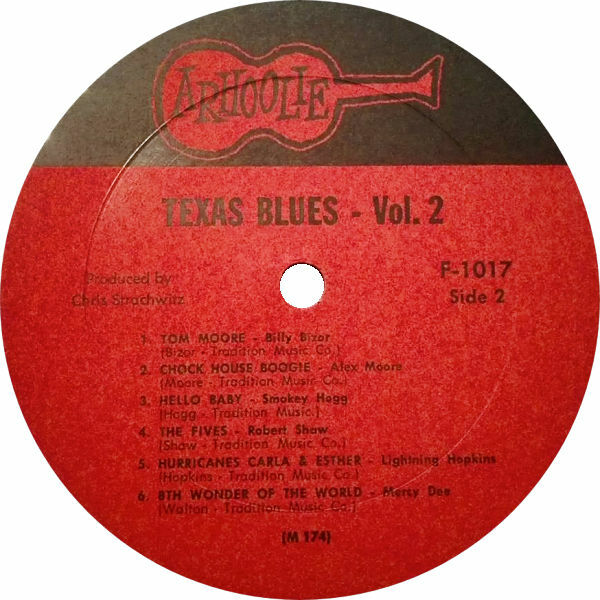 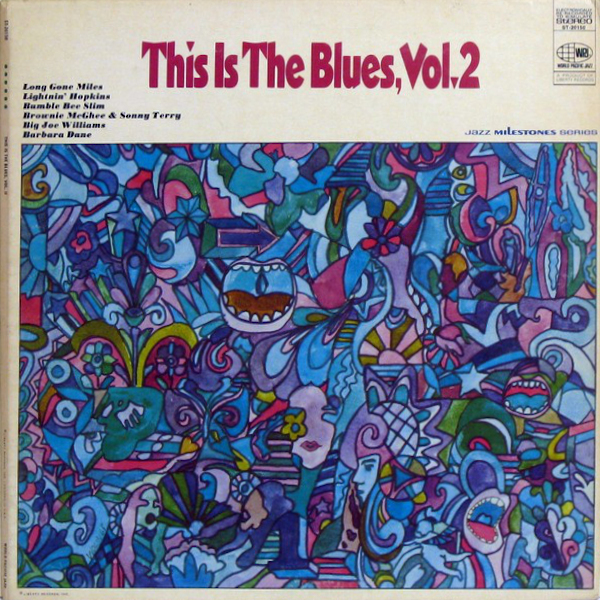 = Fantasy F-24702 "Double Blues"
the musician depicted on the front cover of Everest / Archive of Folk & Jazz Music FS 313 isn't Lightnin' Hopkins, but T-Bone Walker! 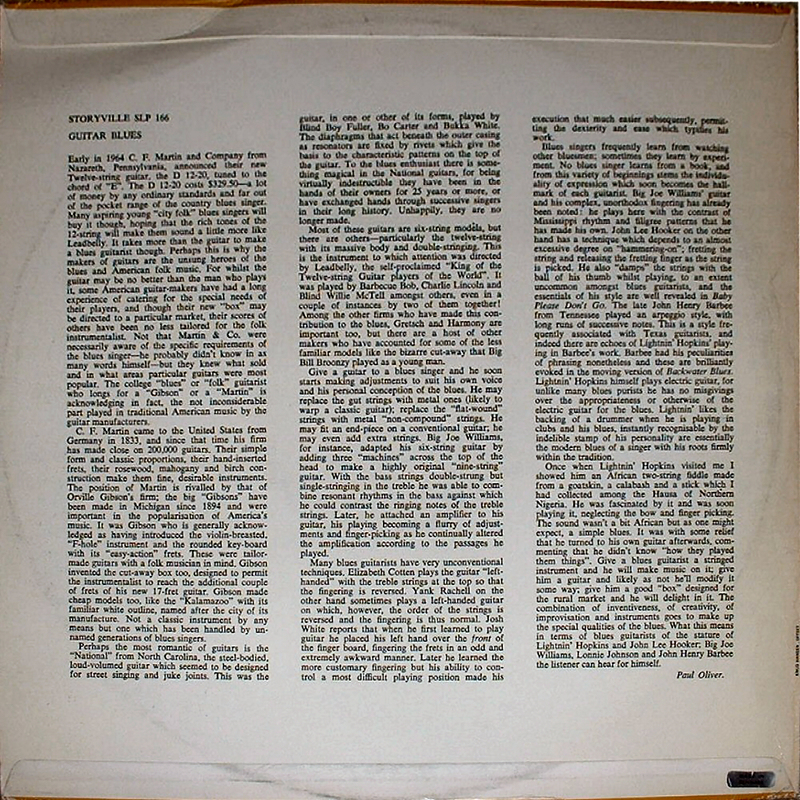 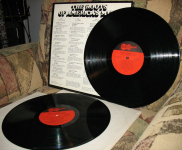 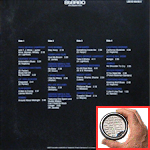 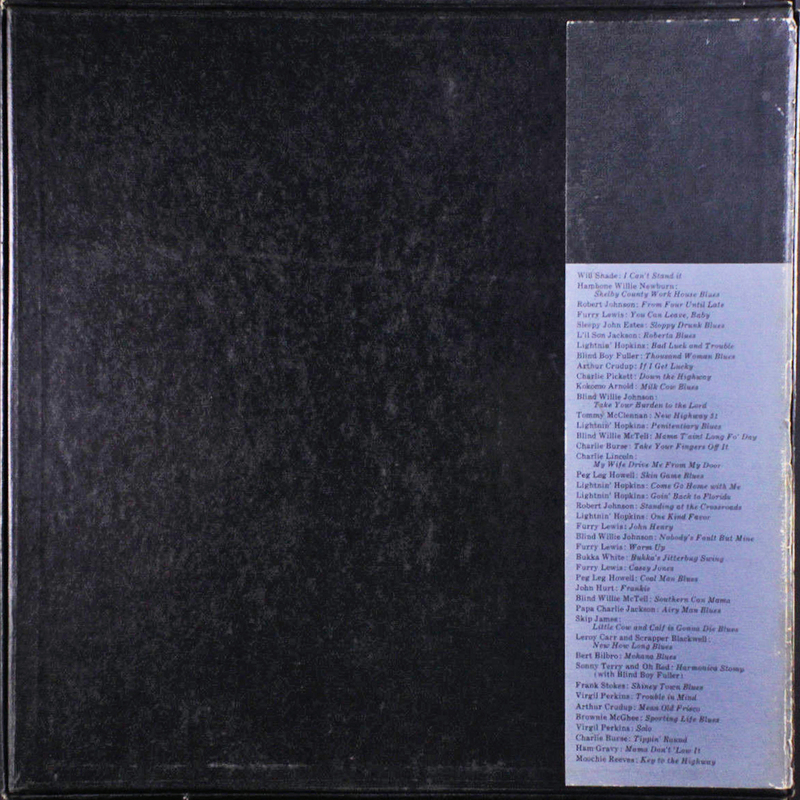 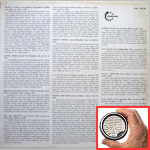 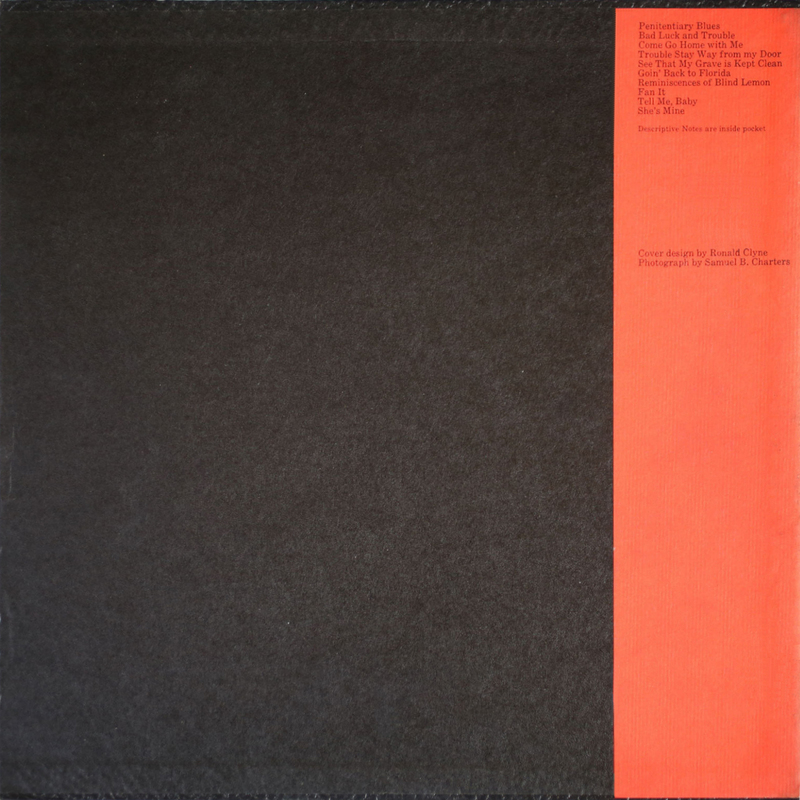 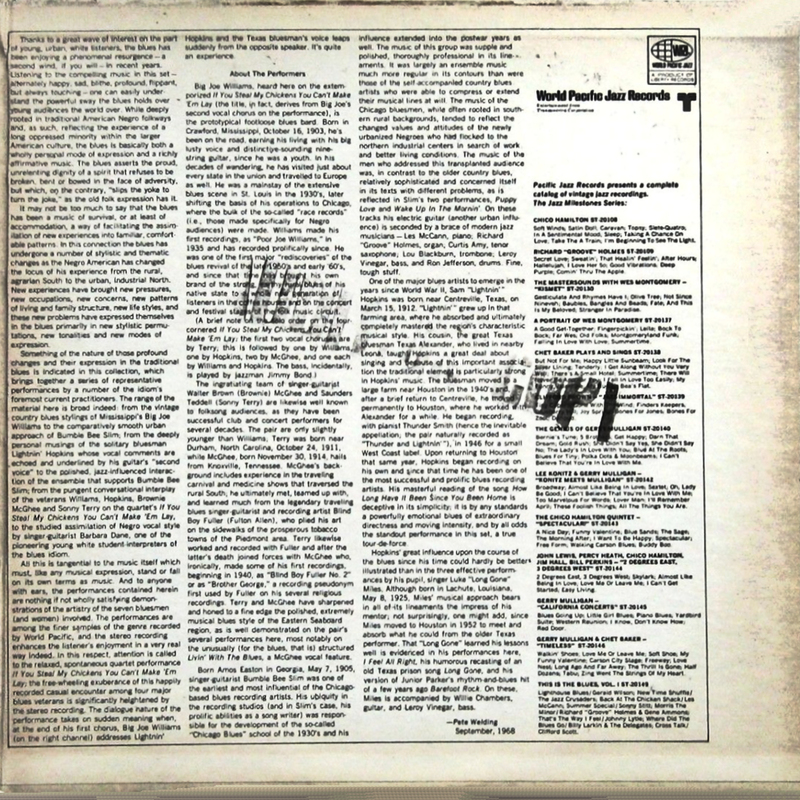 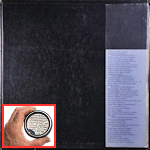 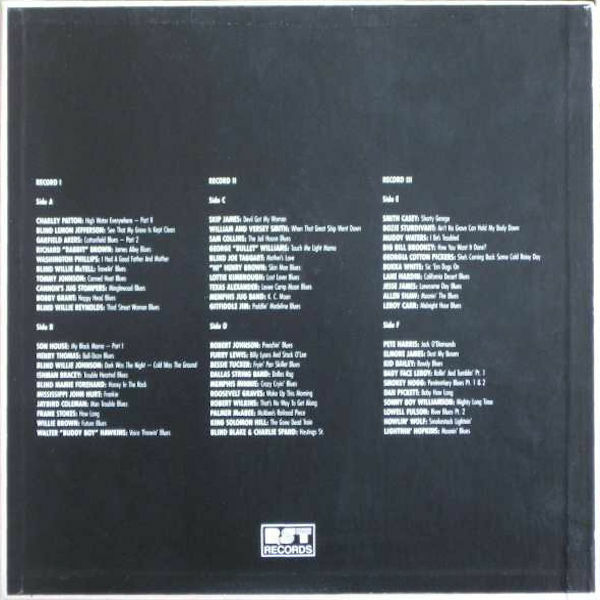 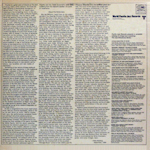 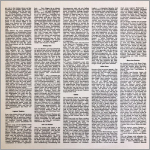 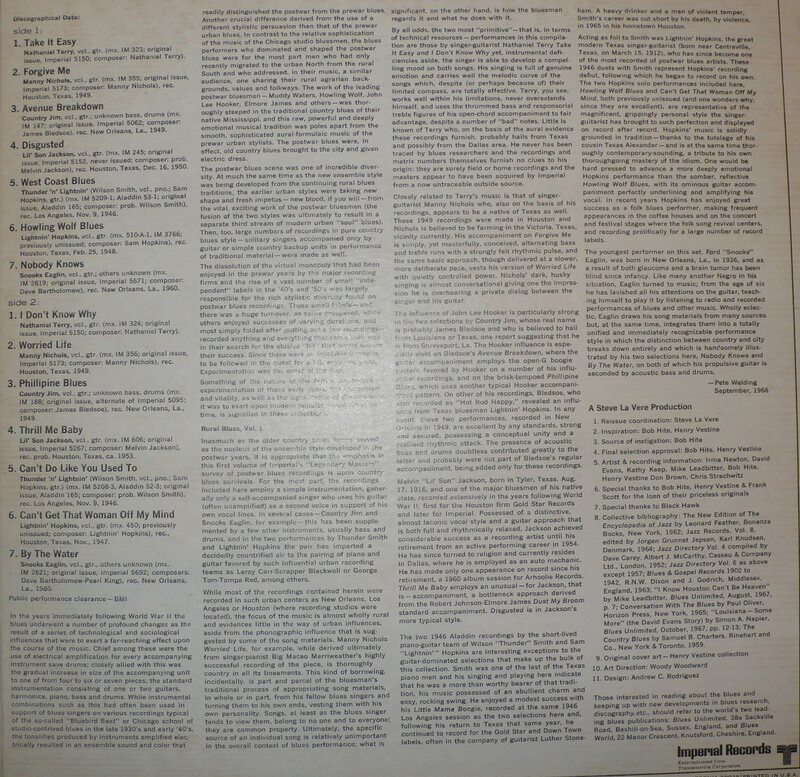 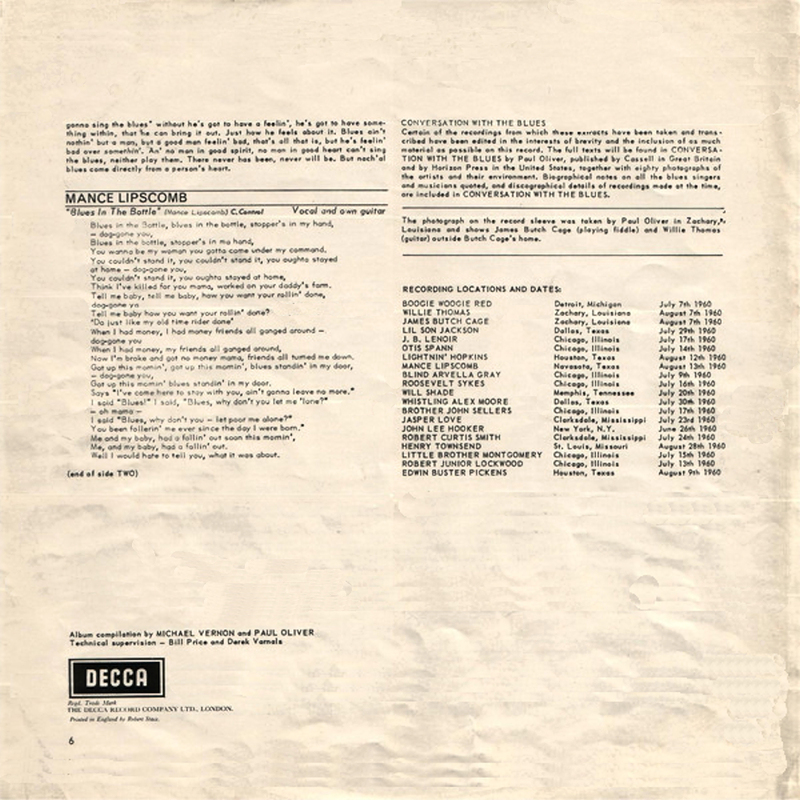 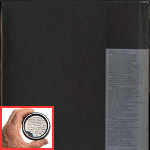 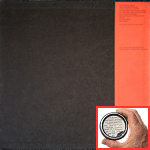 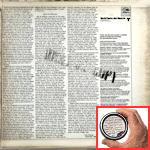 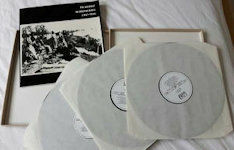 = Polydor 545 019 (UK 1969) "That's My Story"
# on 1974 repress only ! 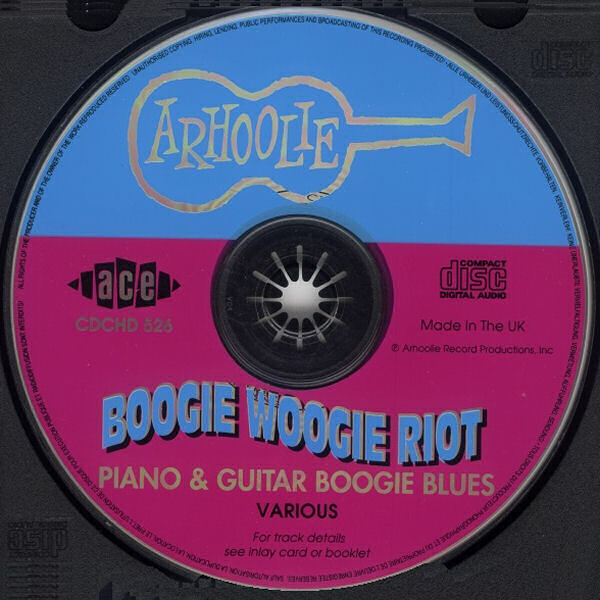 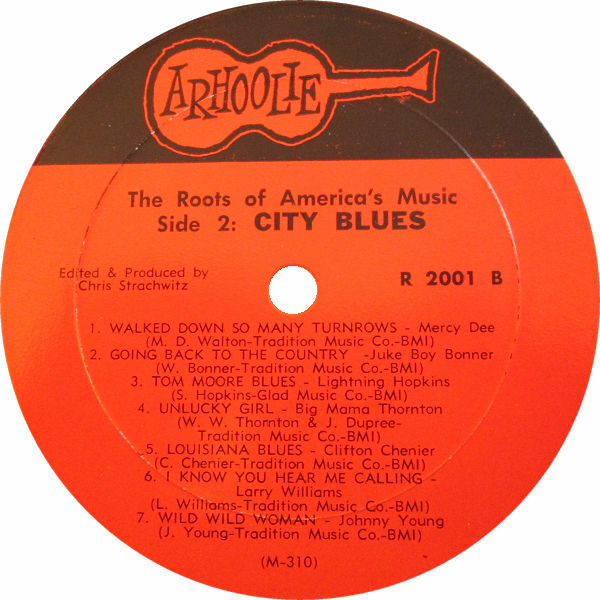 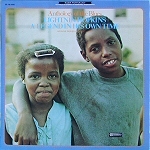 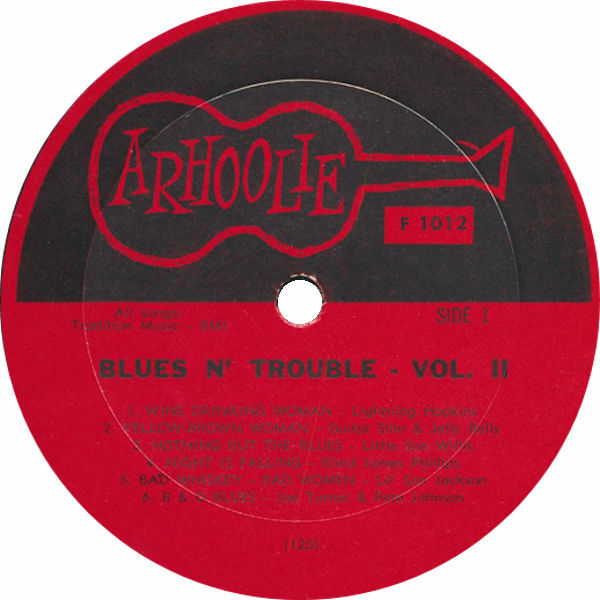 Arhoolie 2007 (196?) 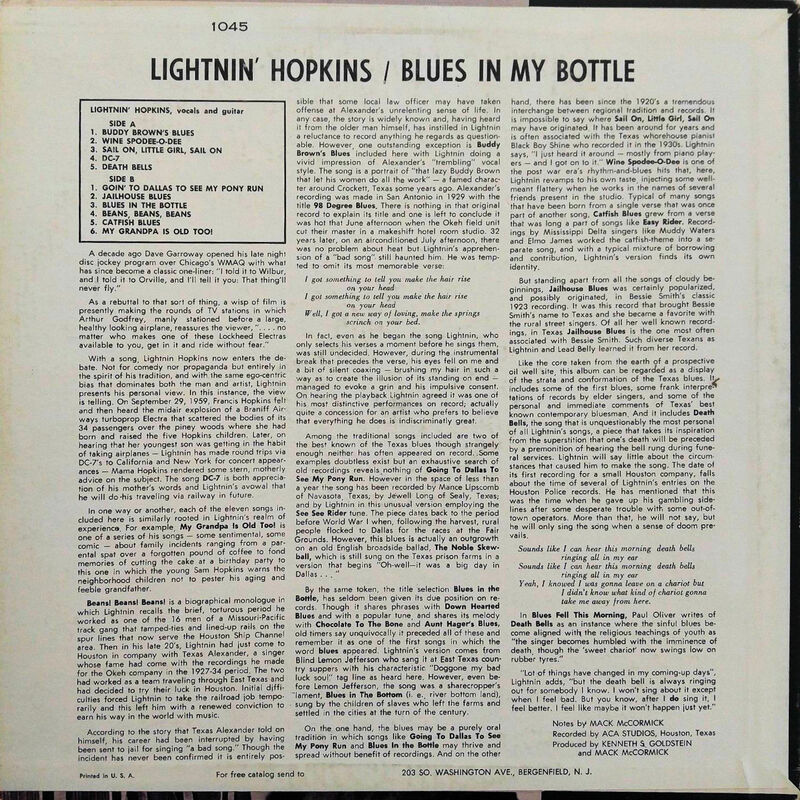 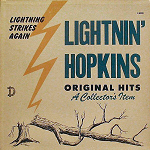 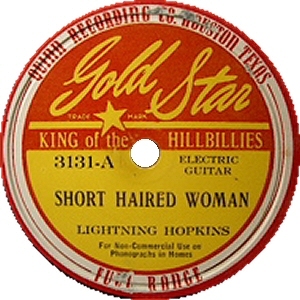 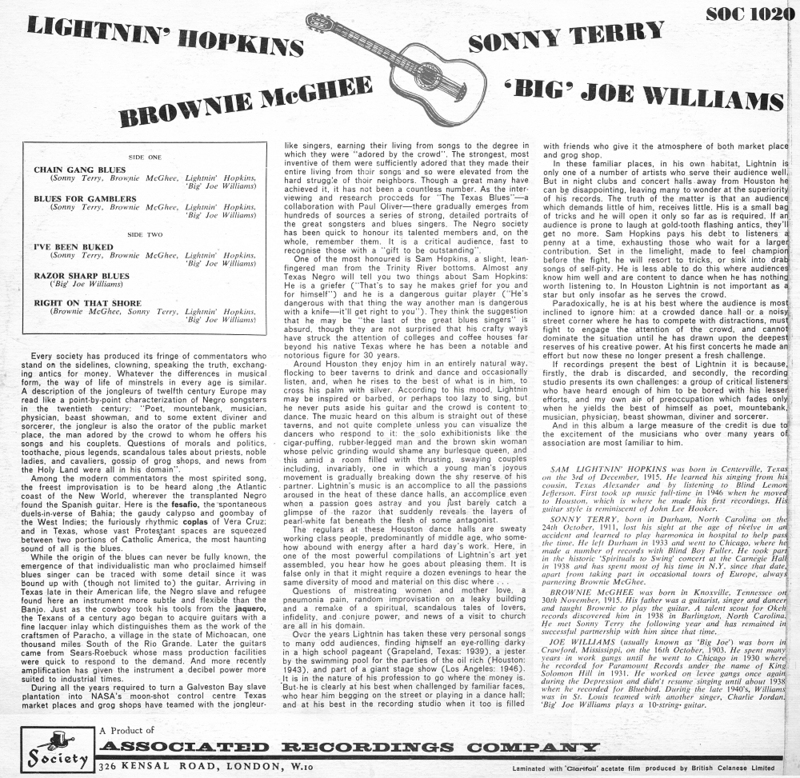 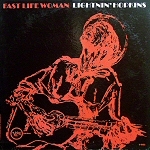 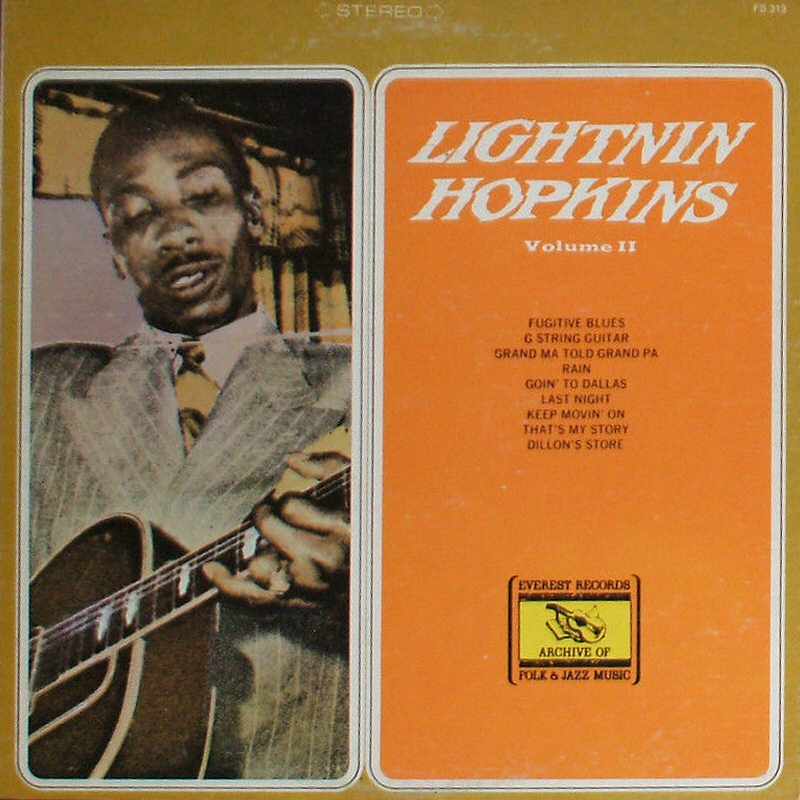 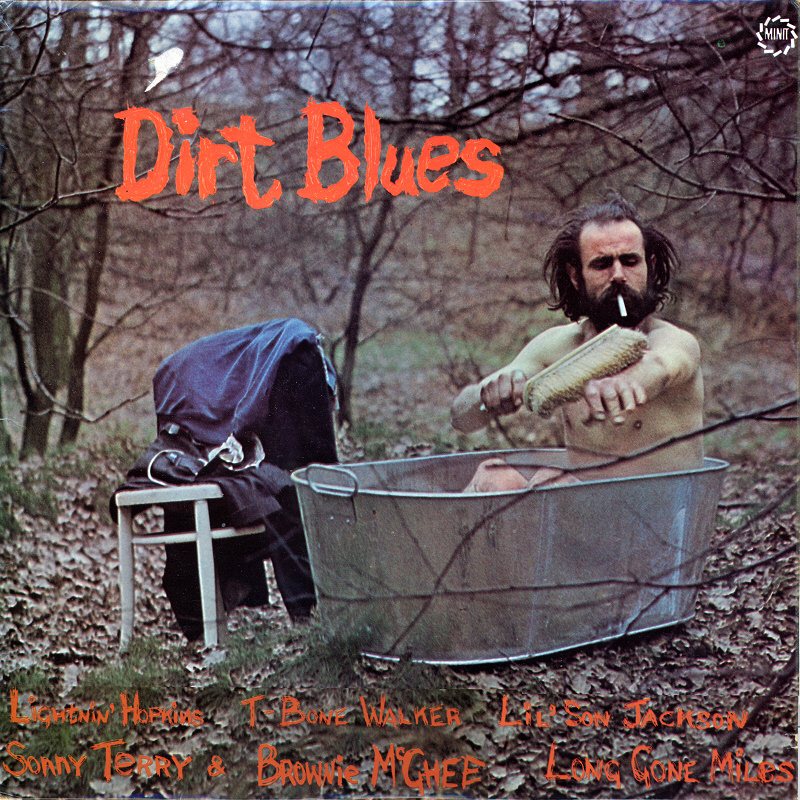 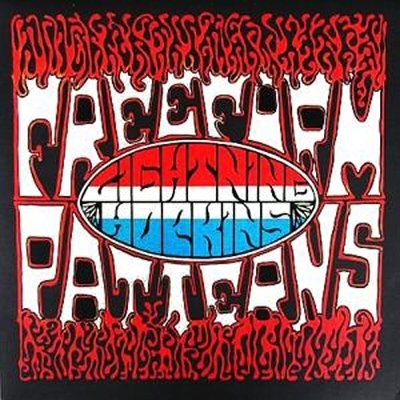 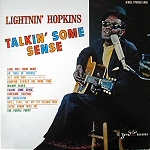 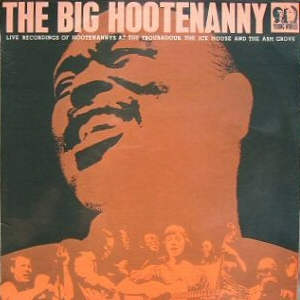 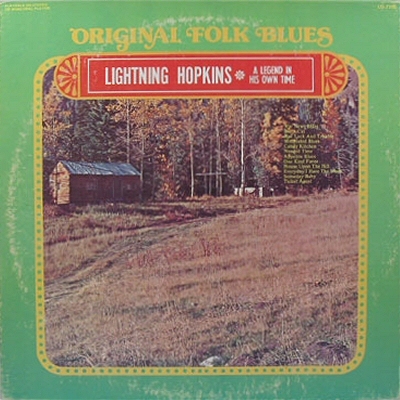 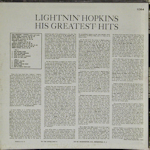 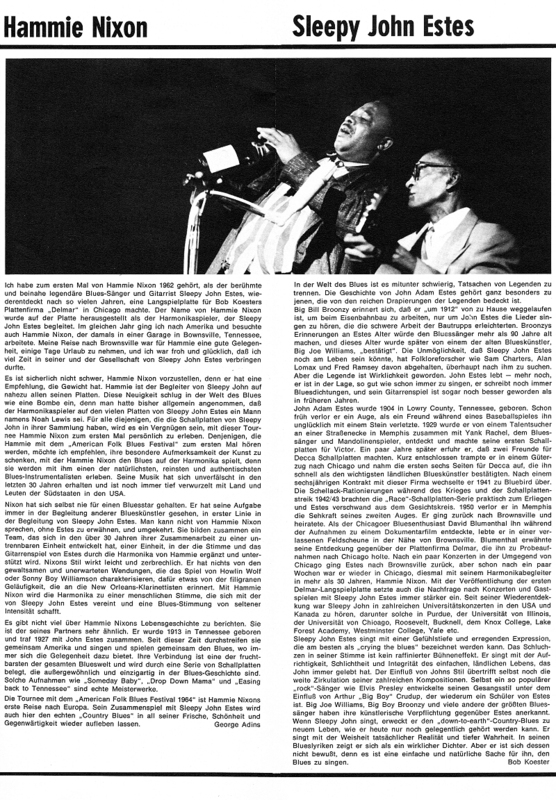 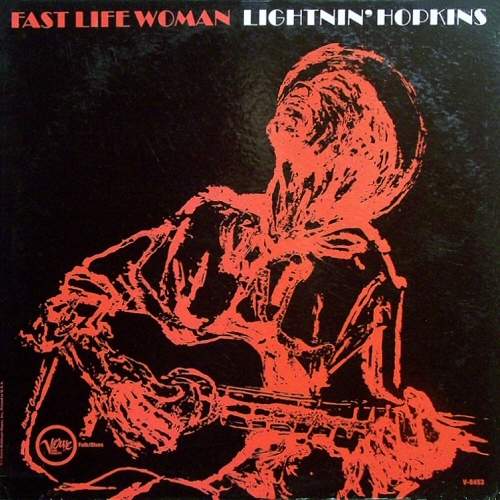 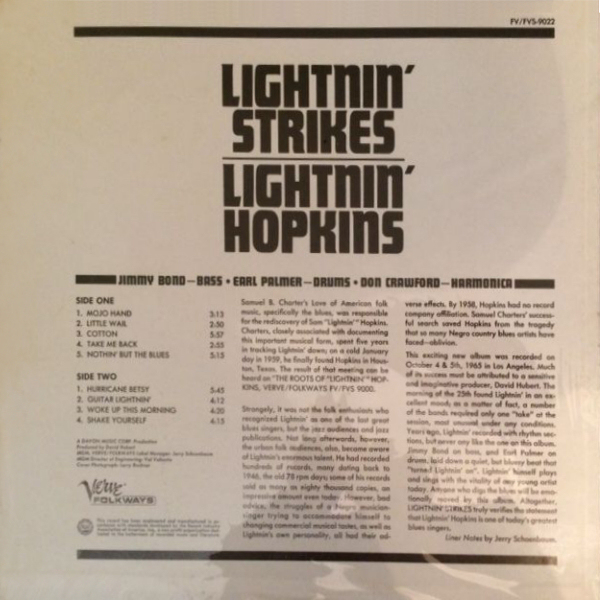 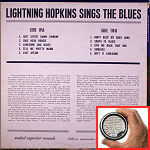 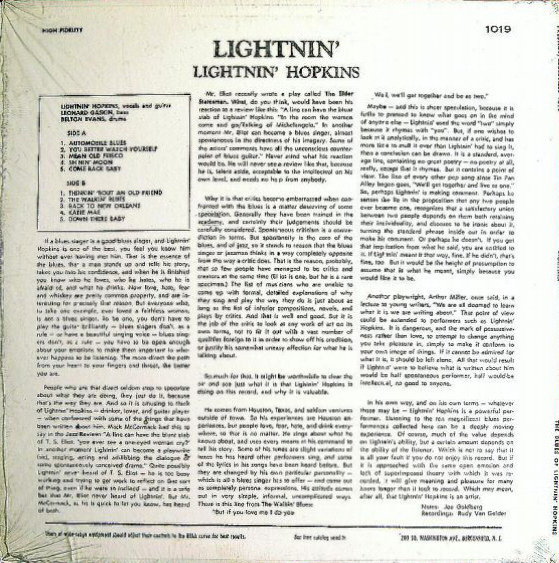 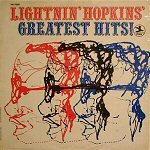 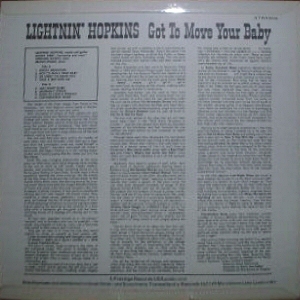 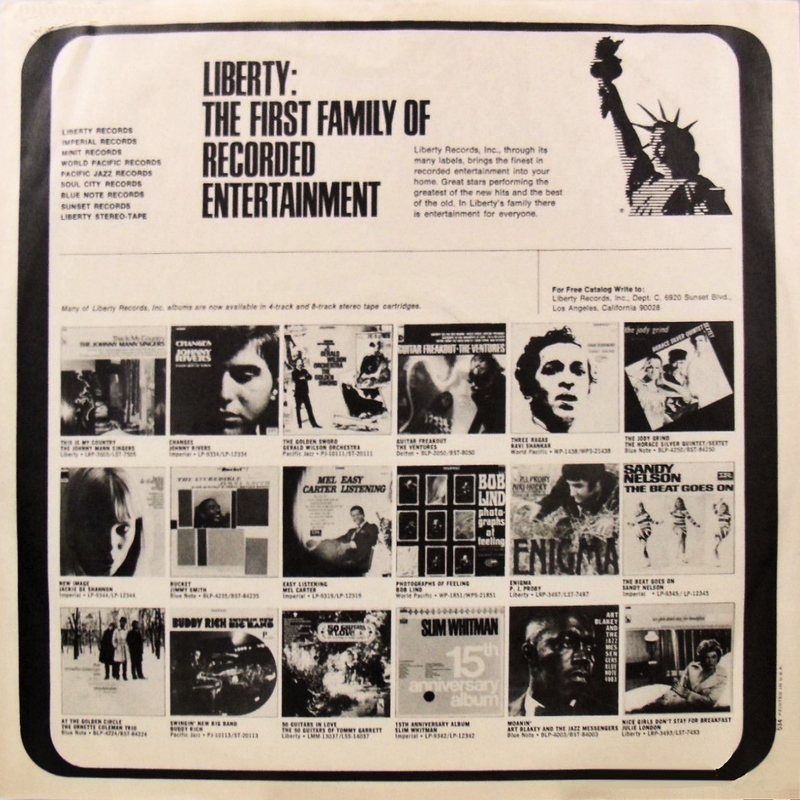 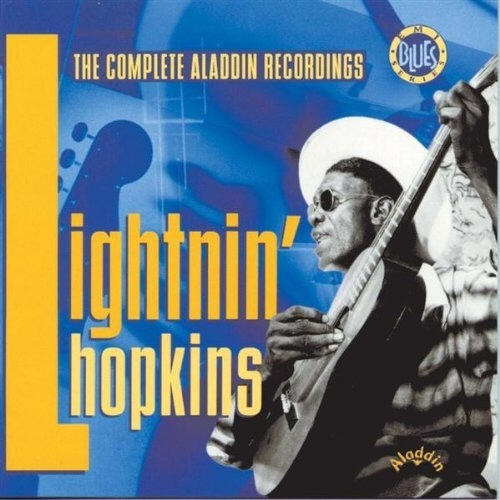 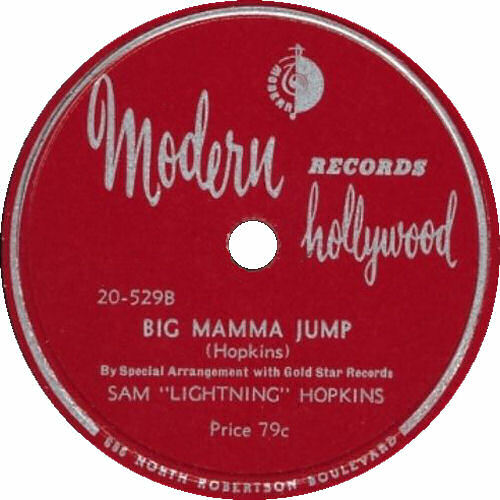 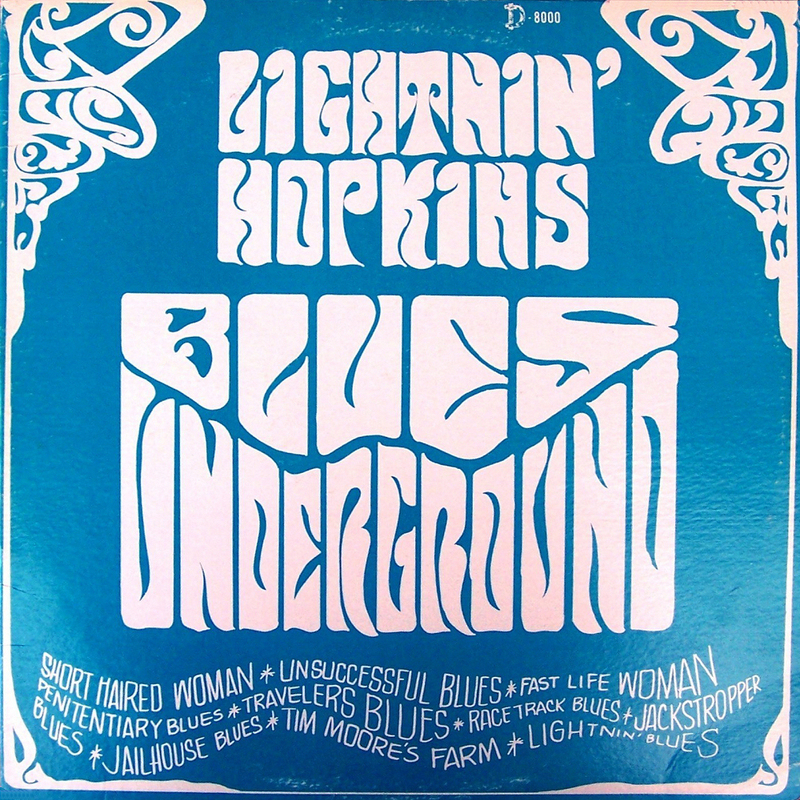 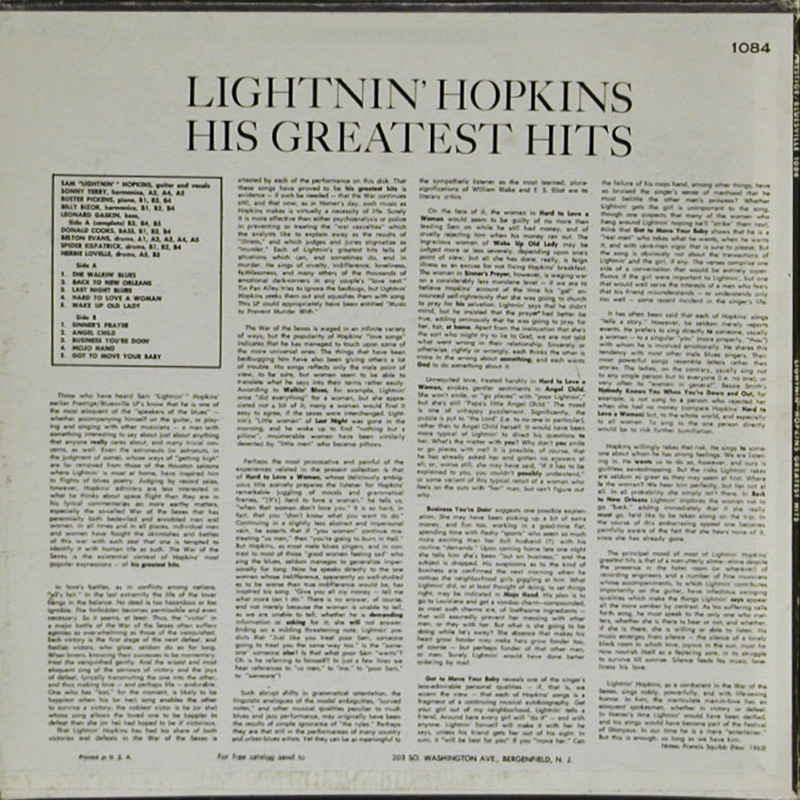 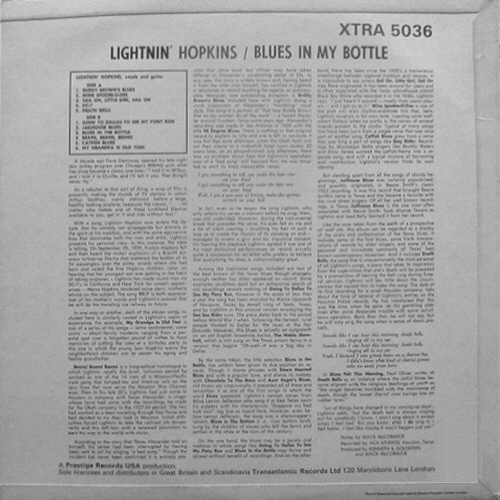 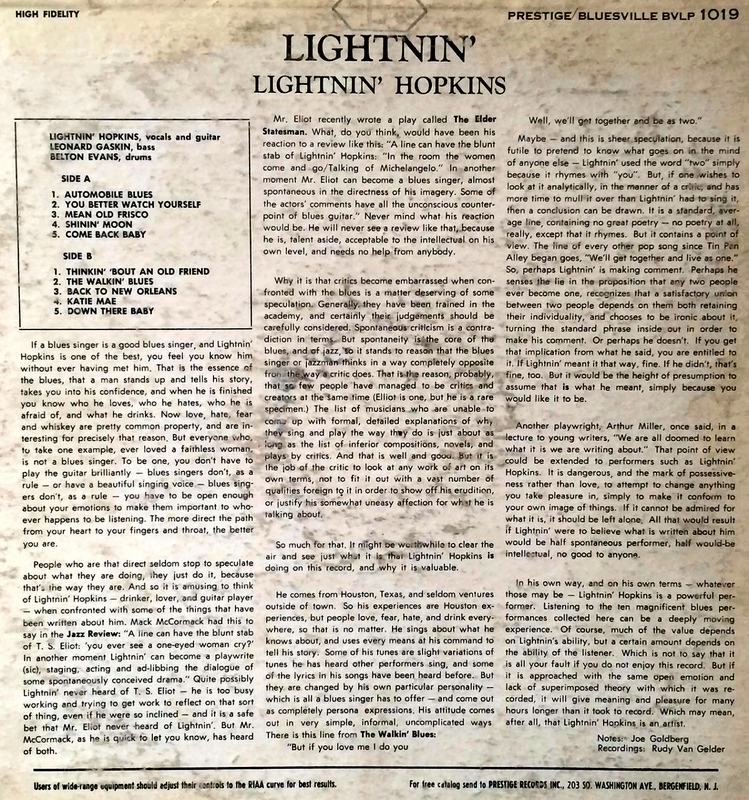 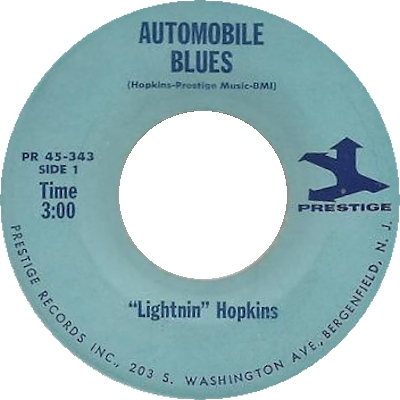 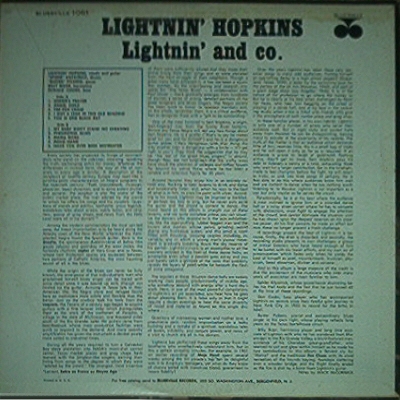 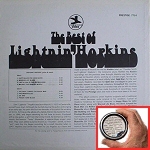 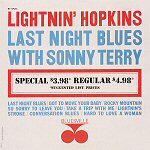 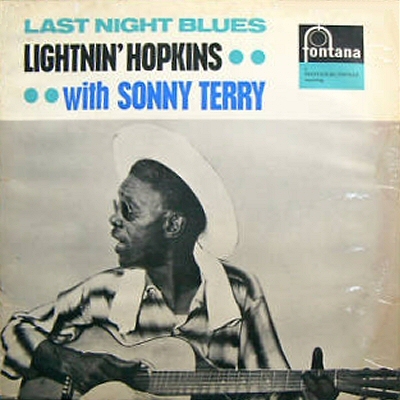 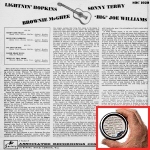 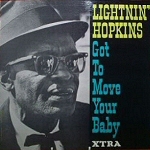 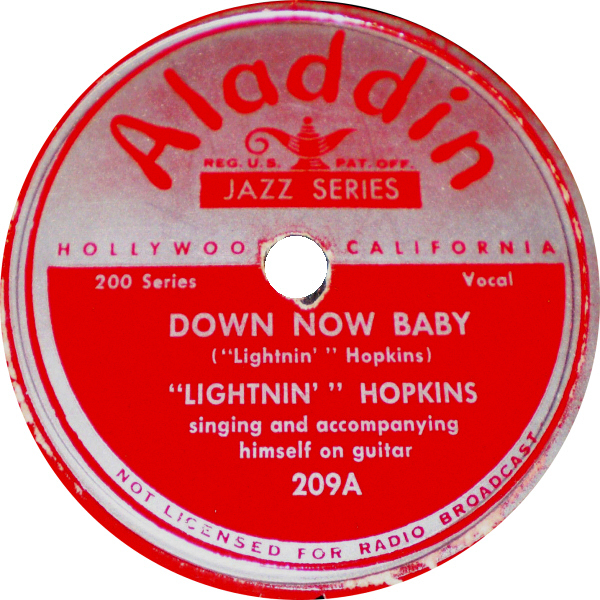 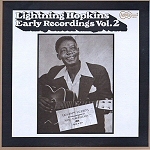 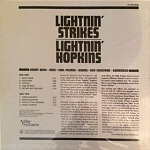 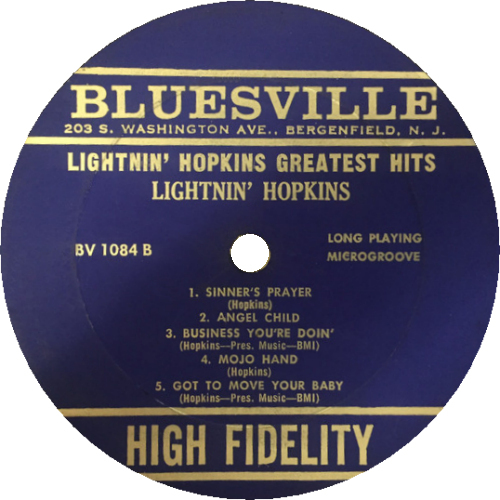 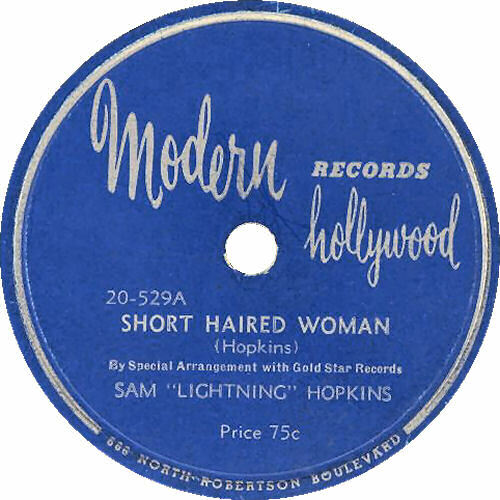 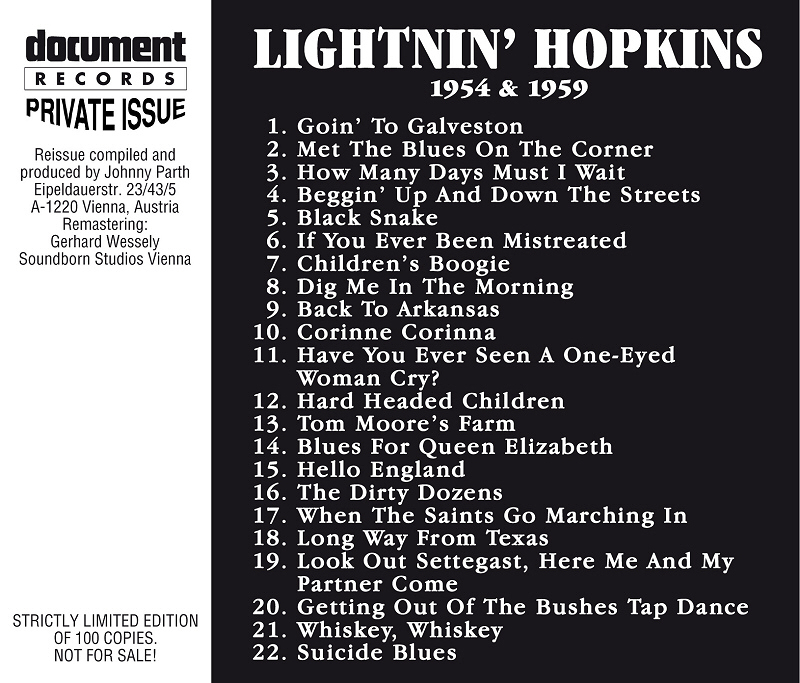 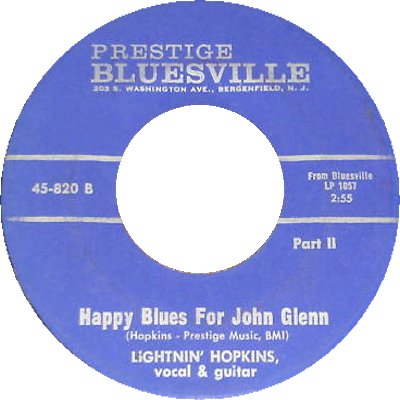 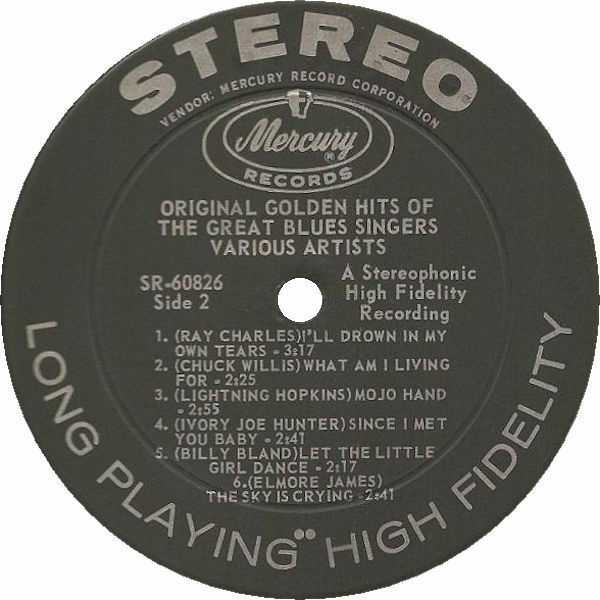 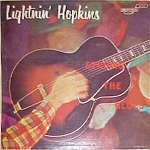 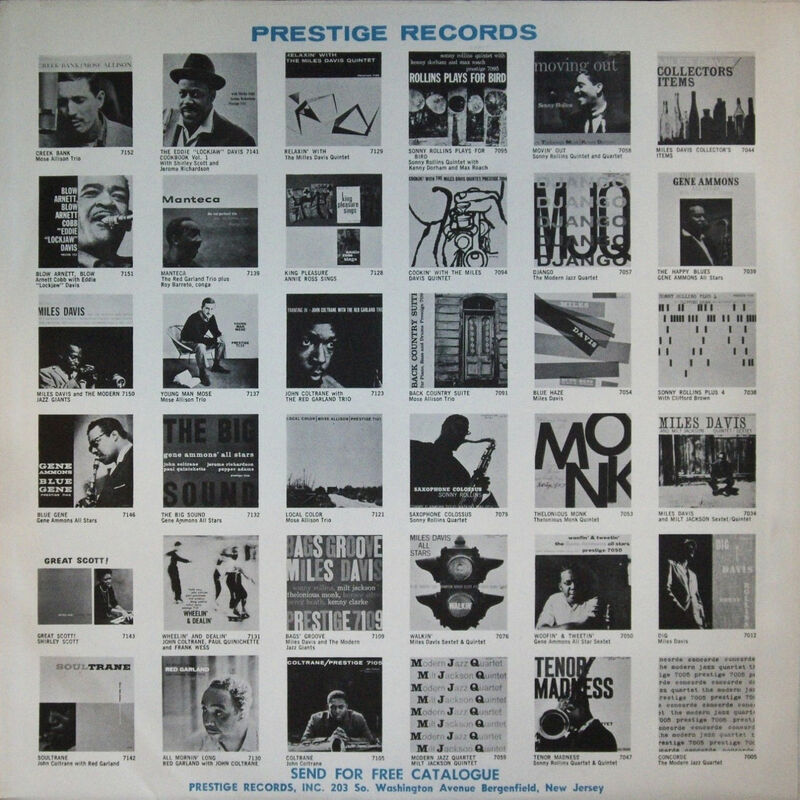 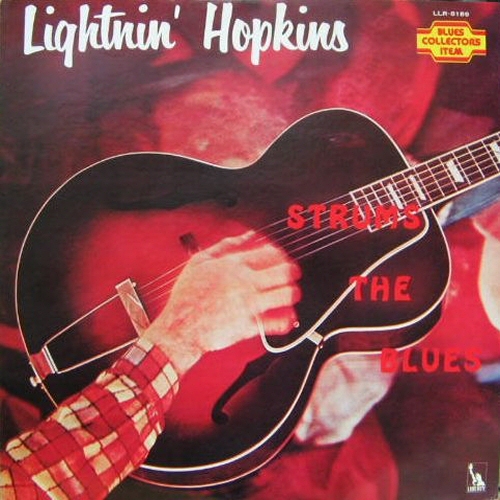 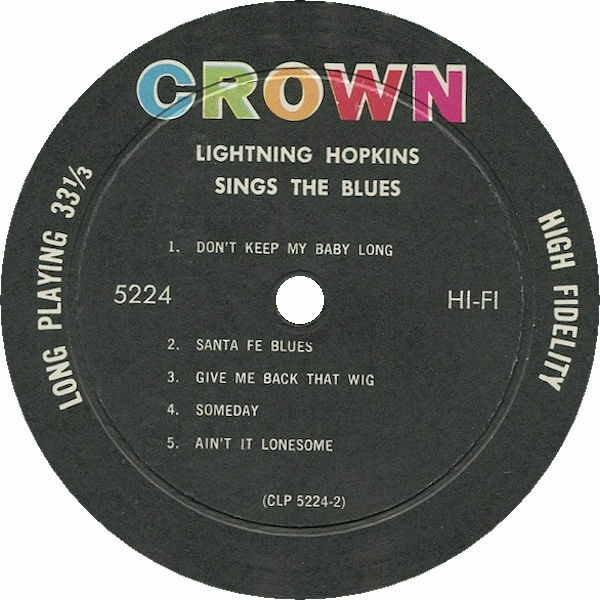 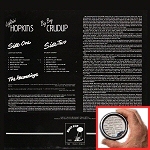 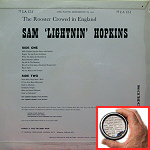 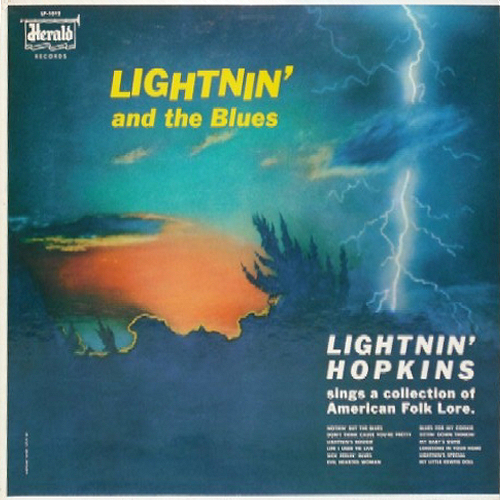 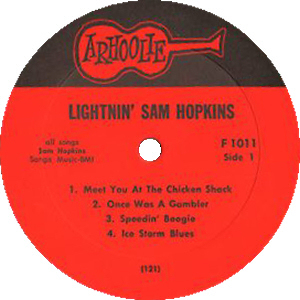 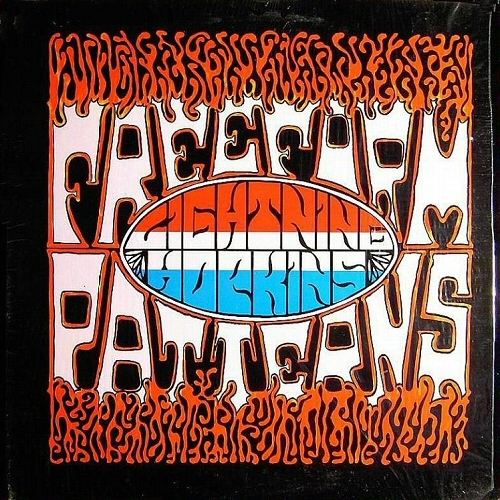 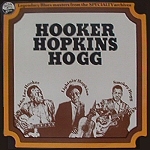 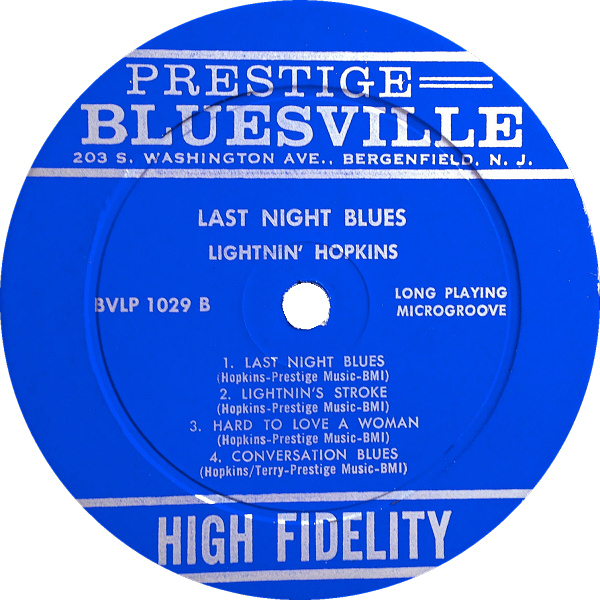 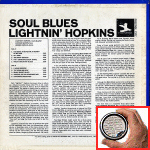 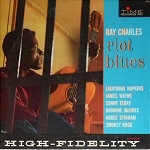 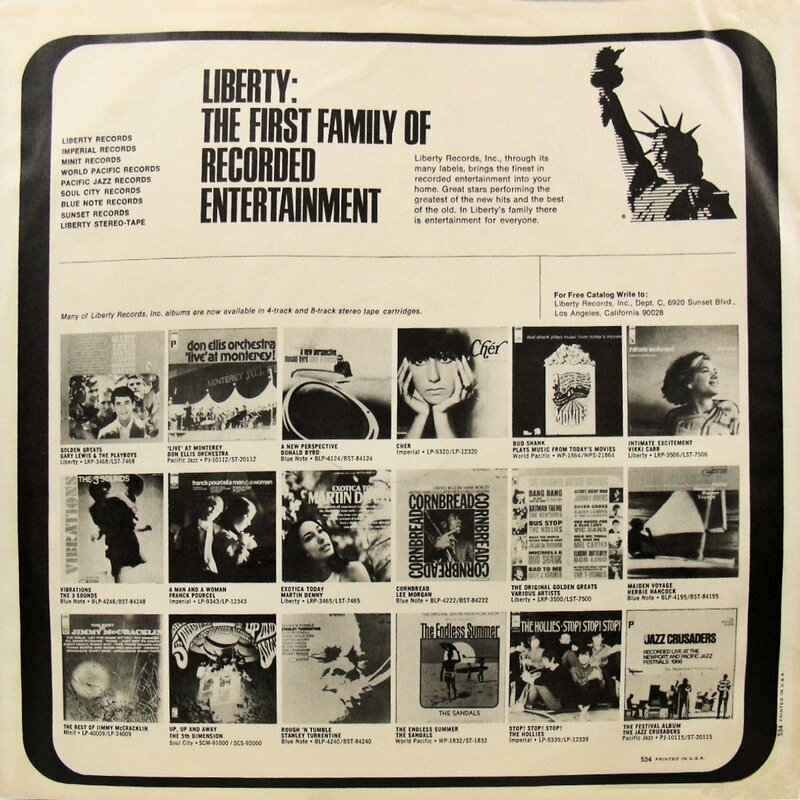 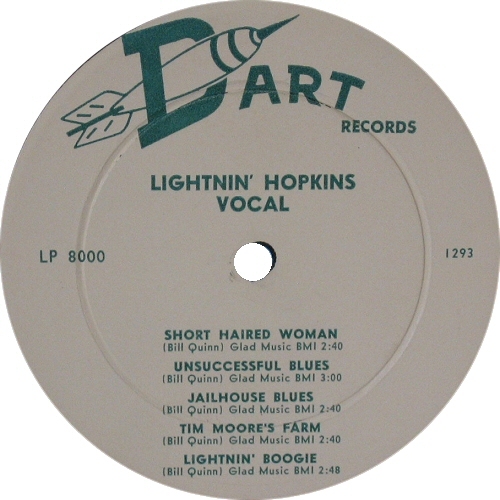 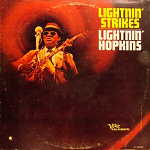 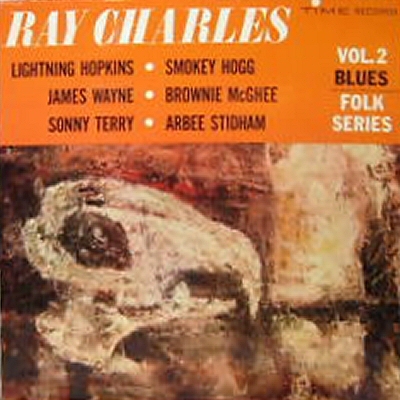 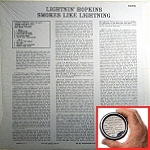 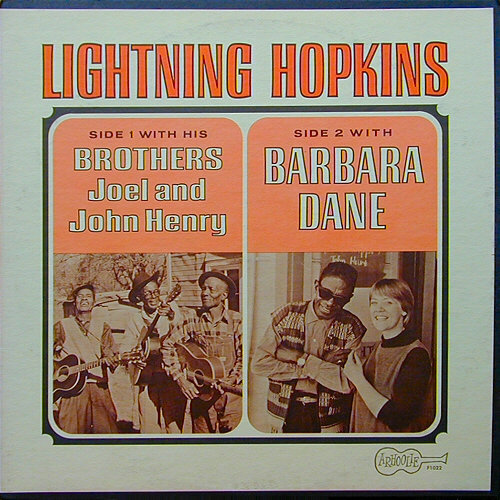 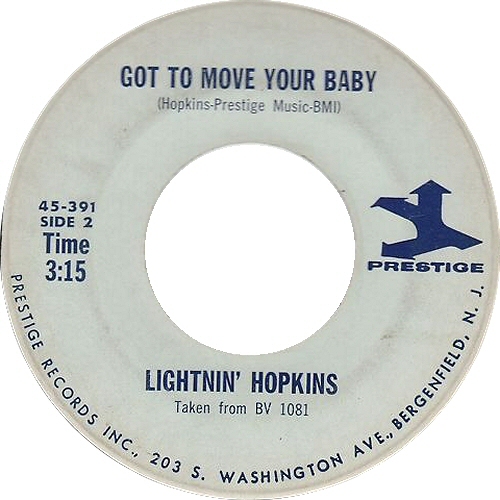 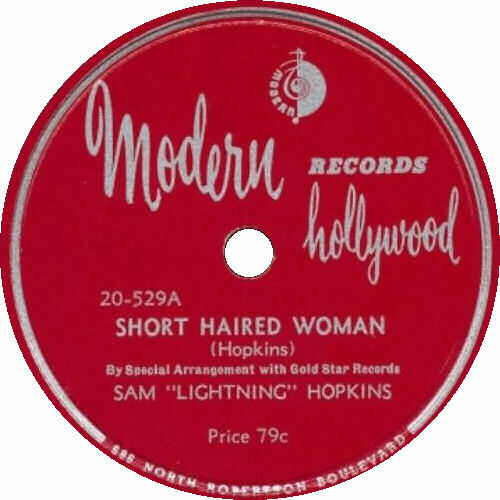 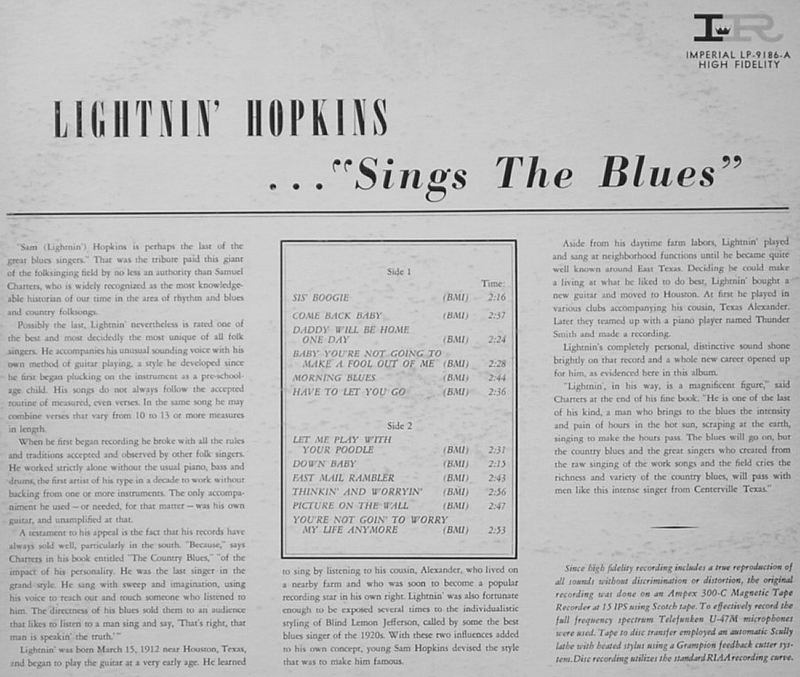 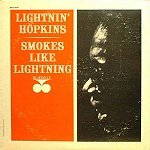 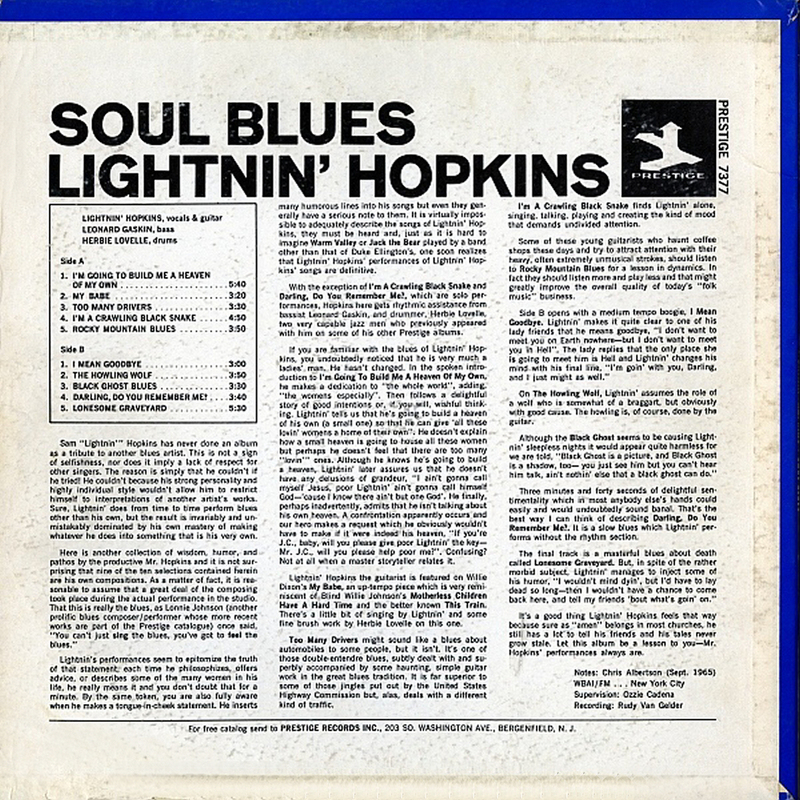 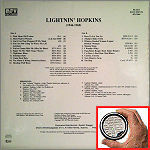 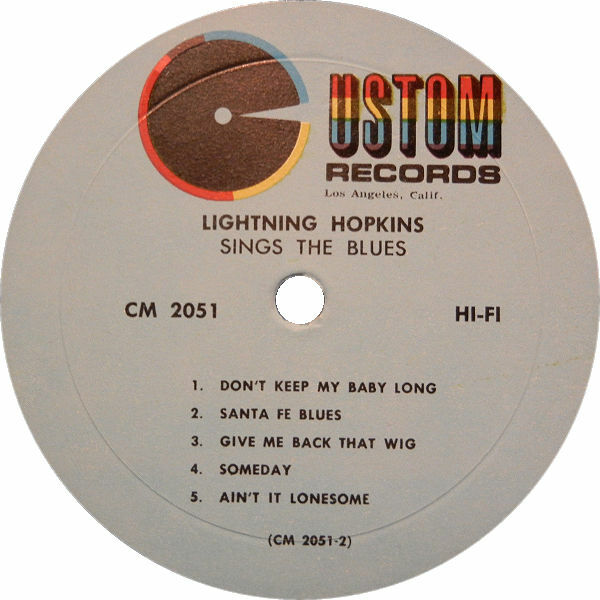 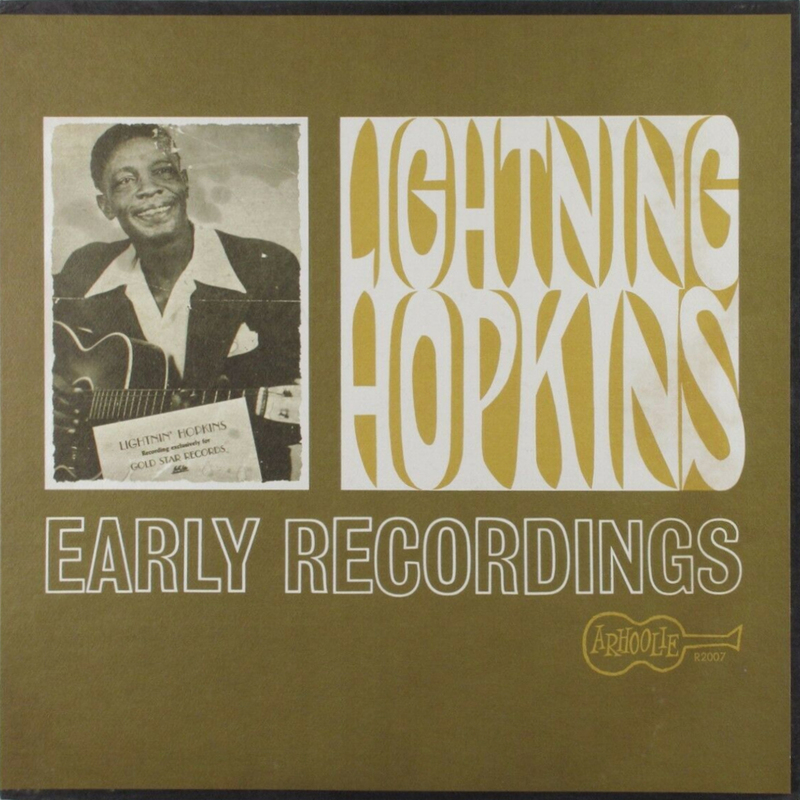 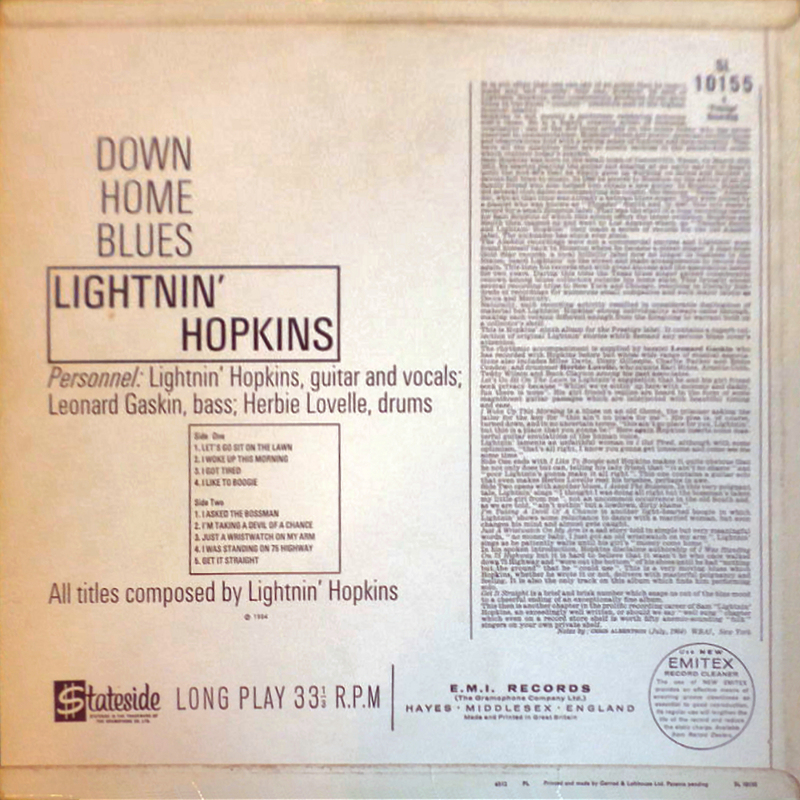 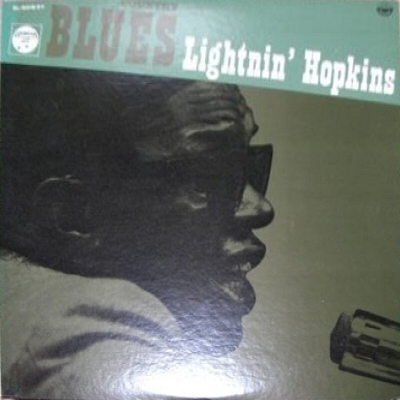 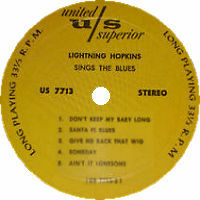 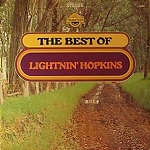 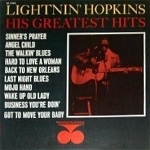 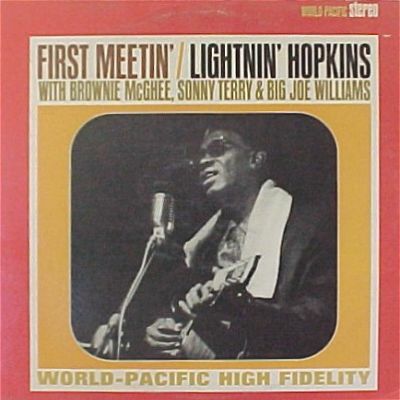 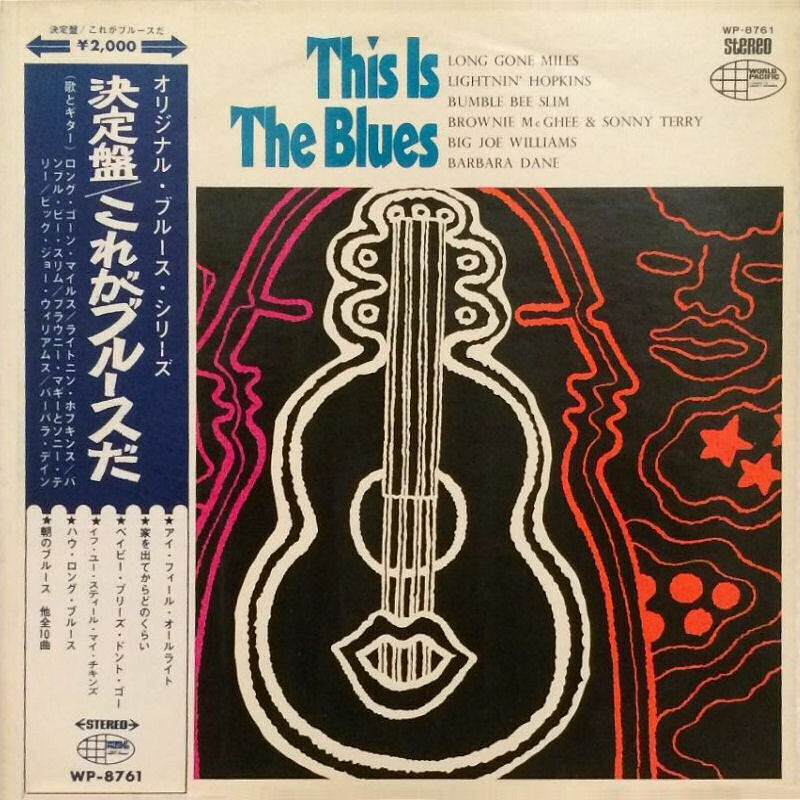 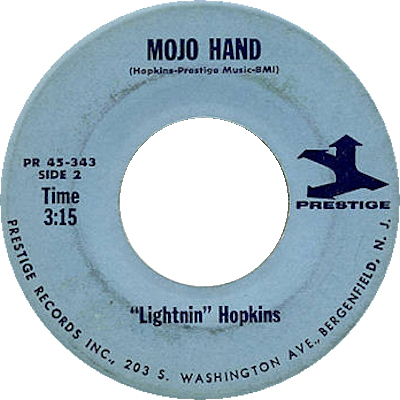 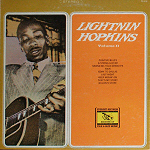 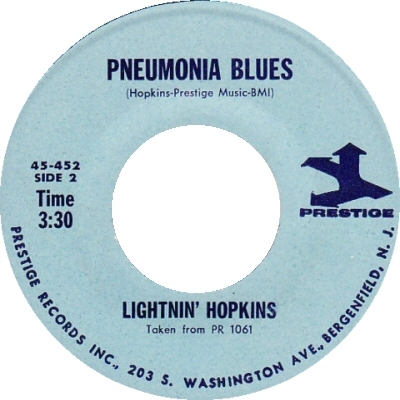 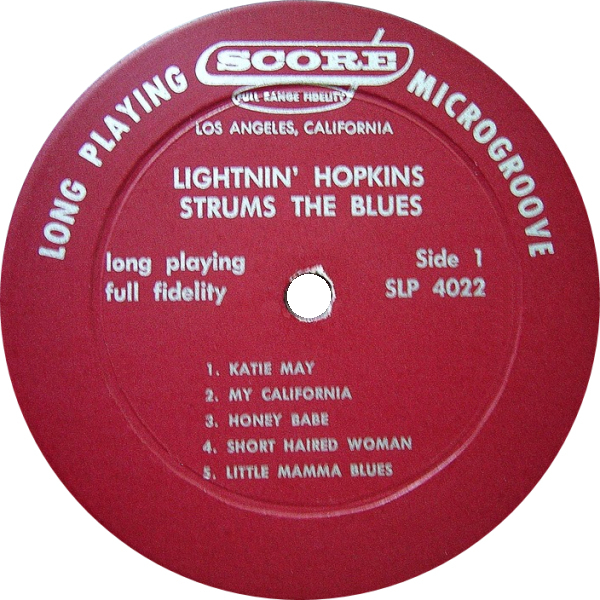 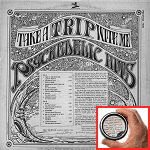 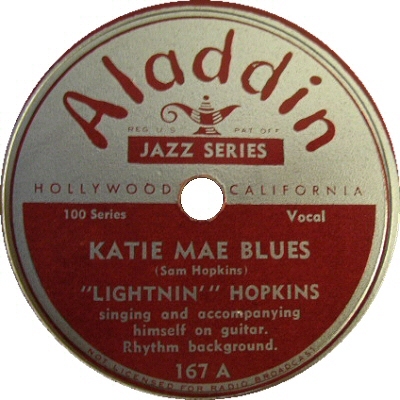 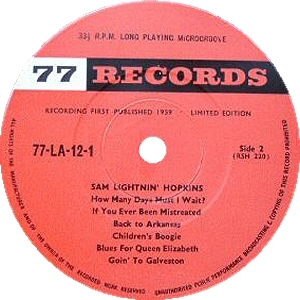 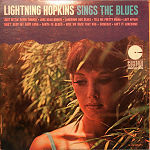 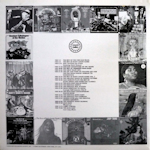 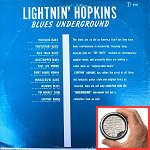 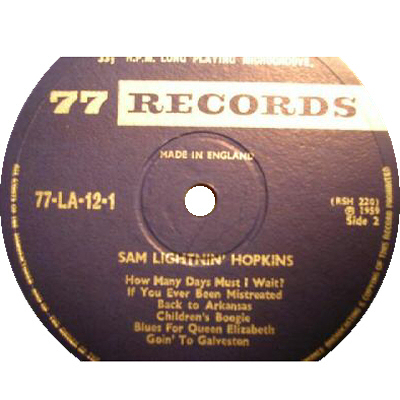 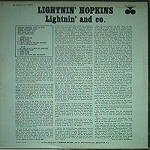 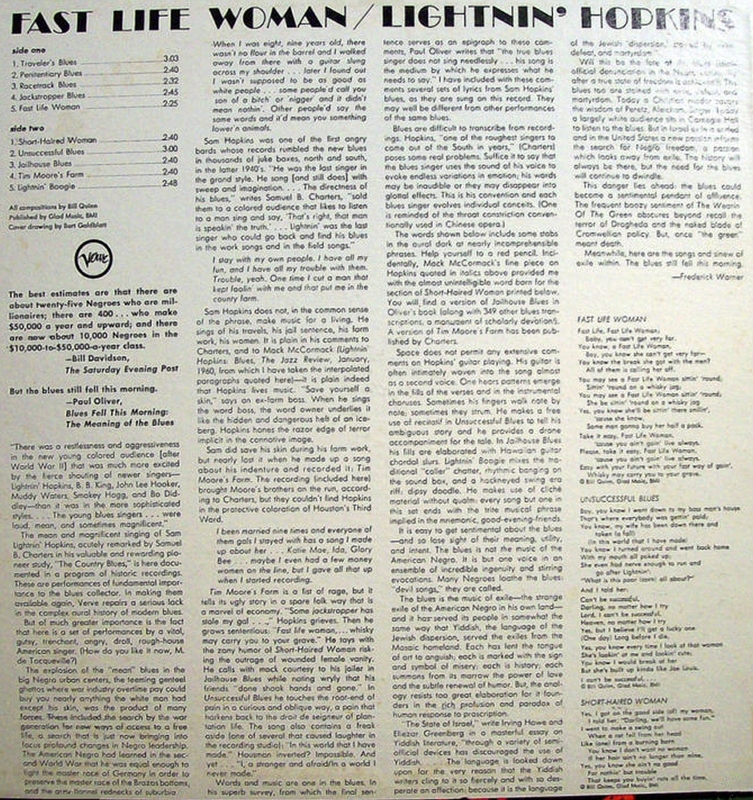 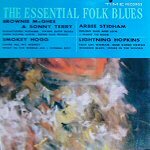 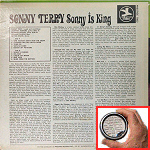 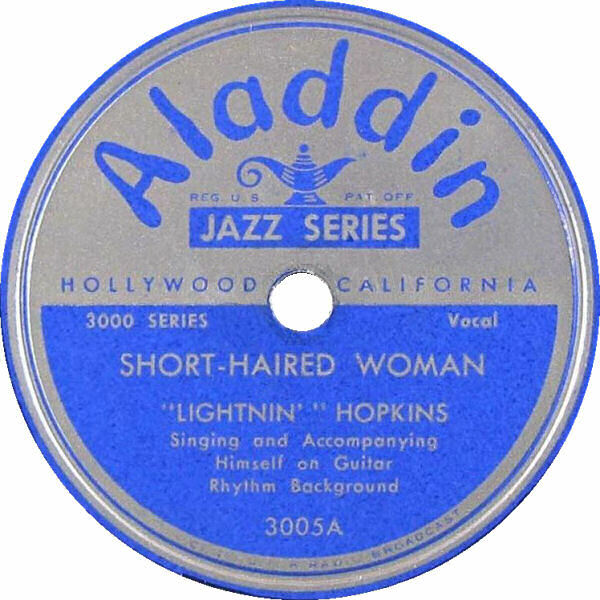 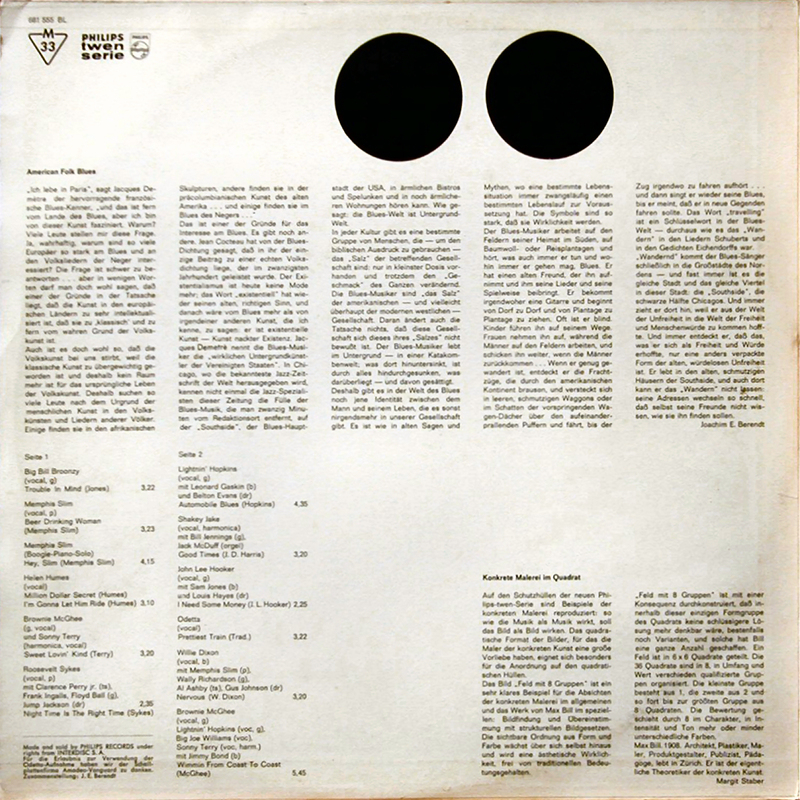 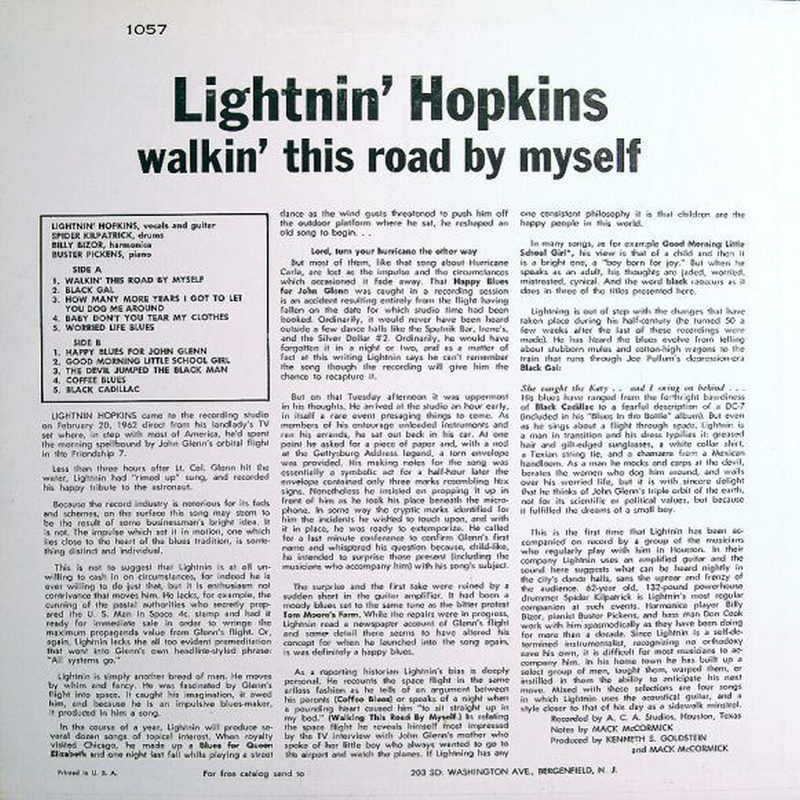 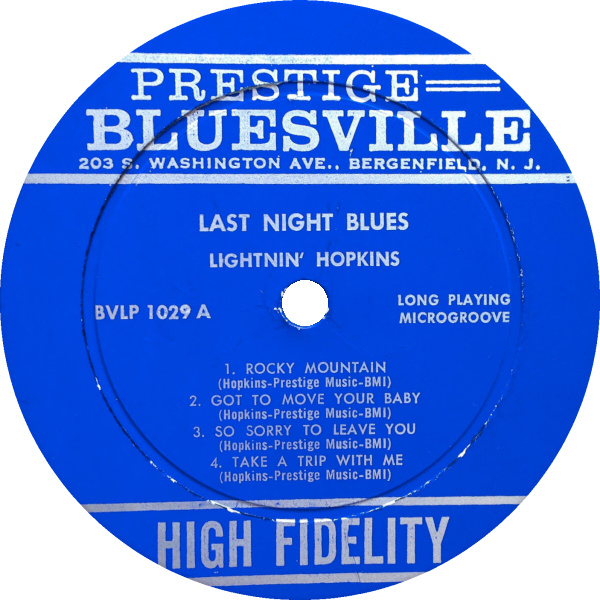 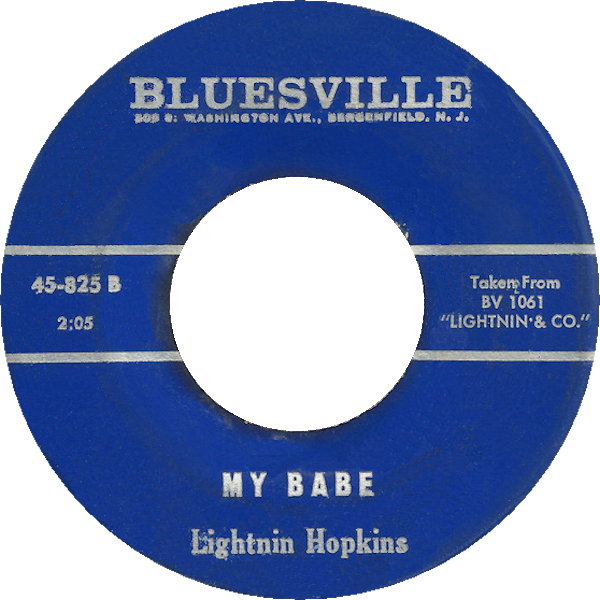 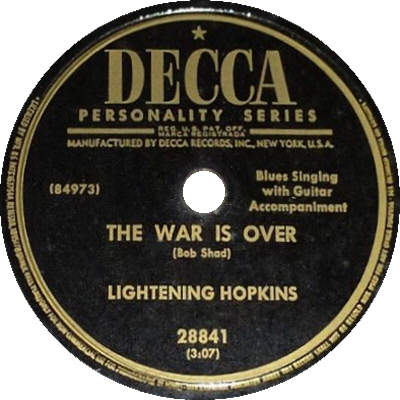 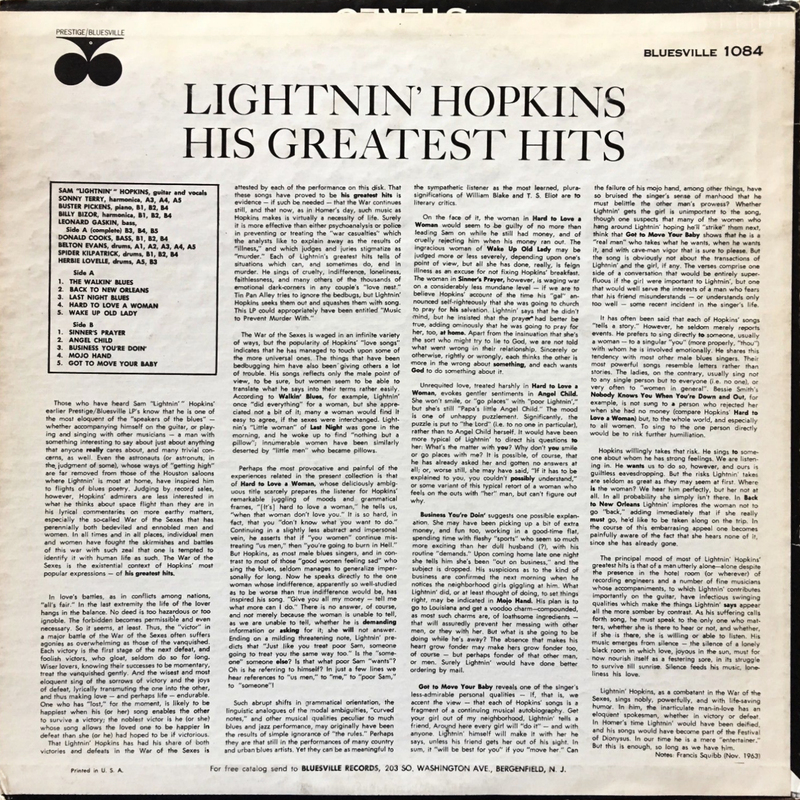 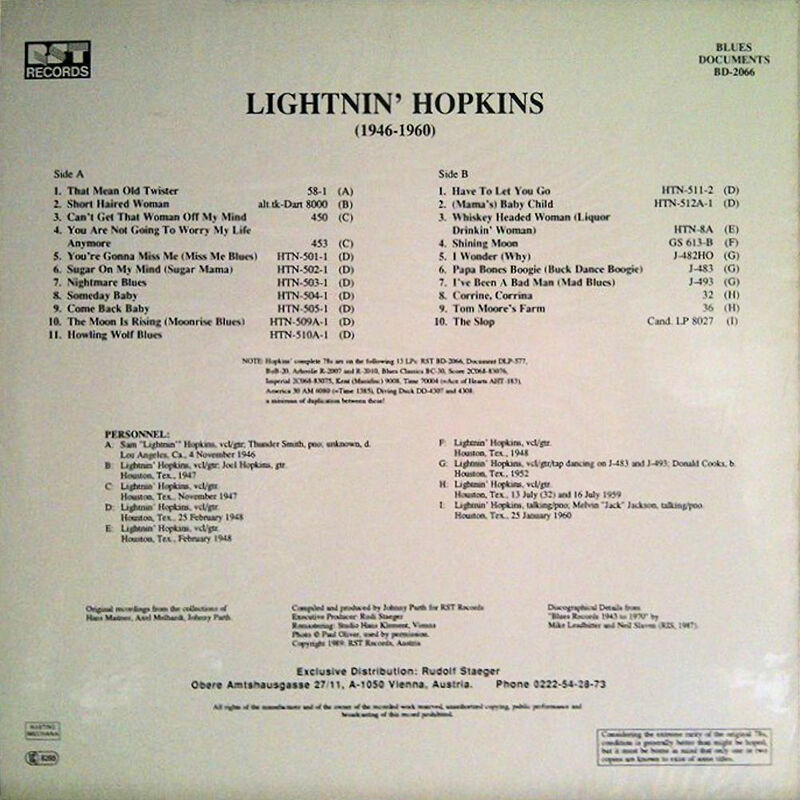 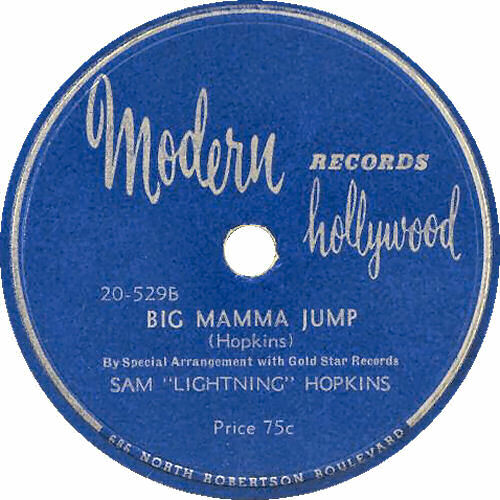 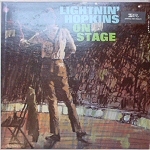 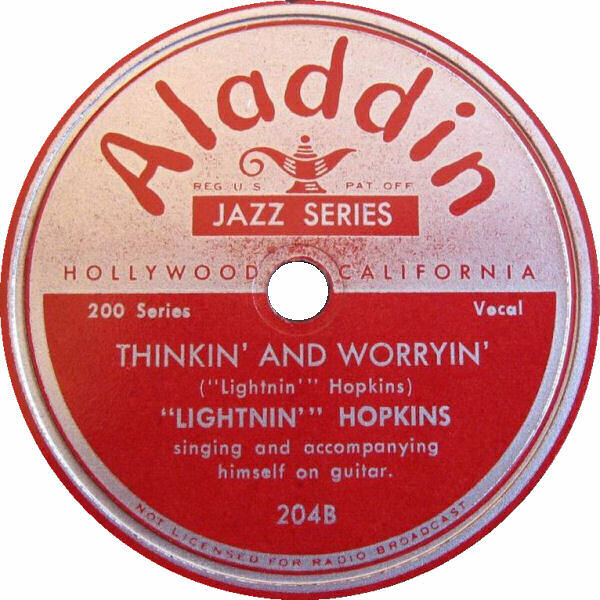 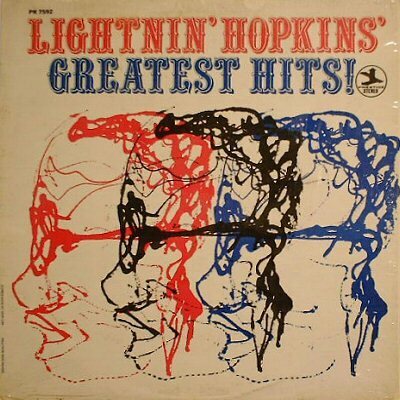 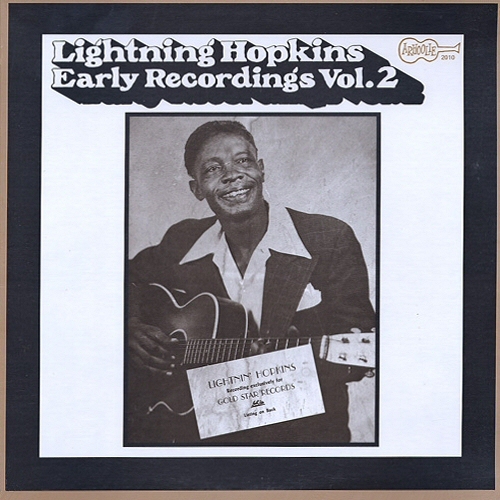 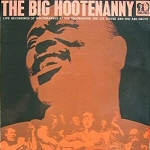 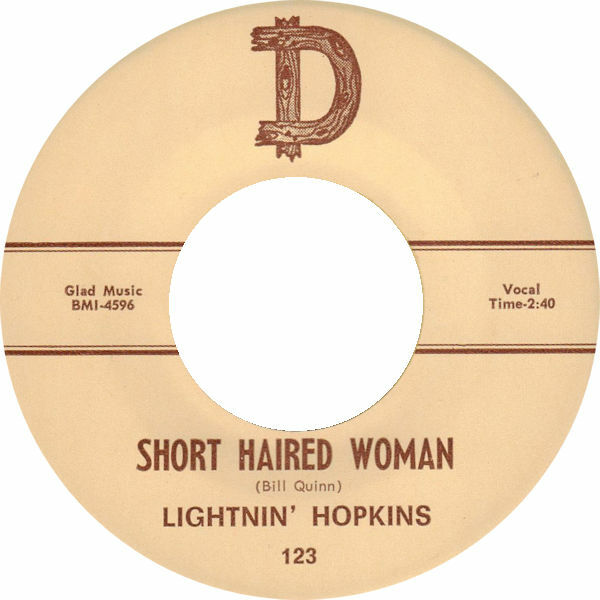 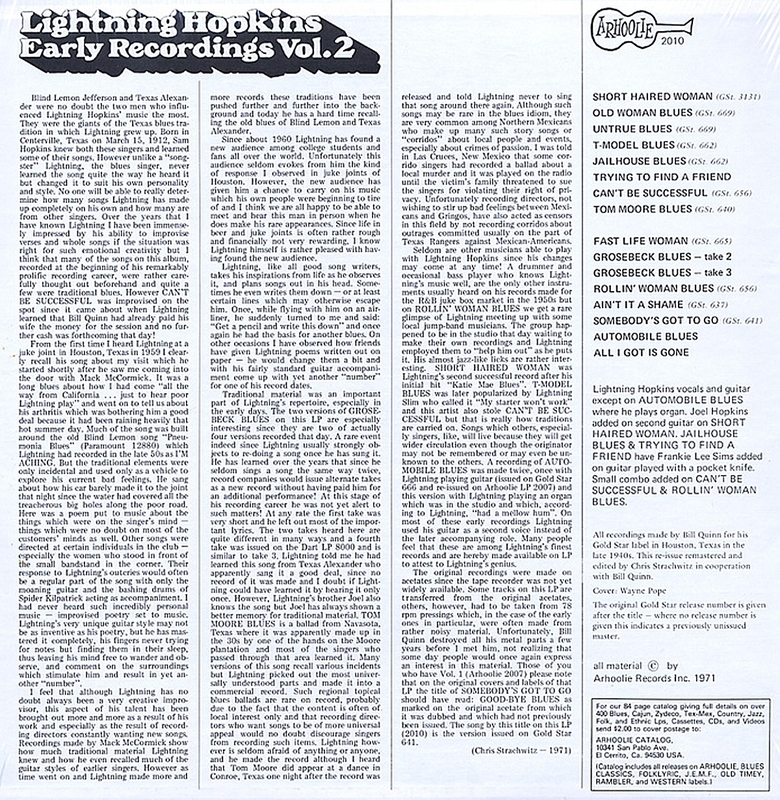 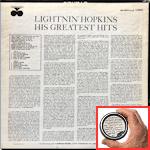 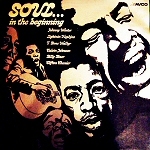 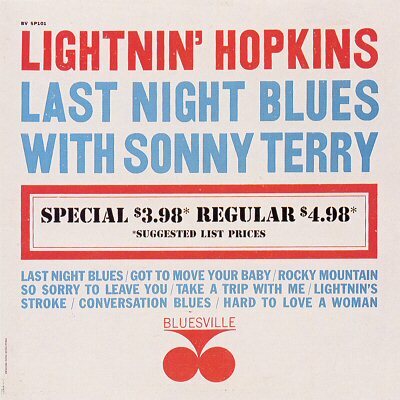 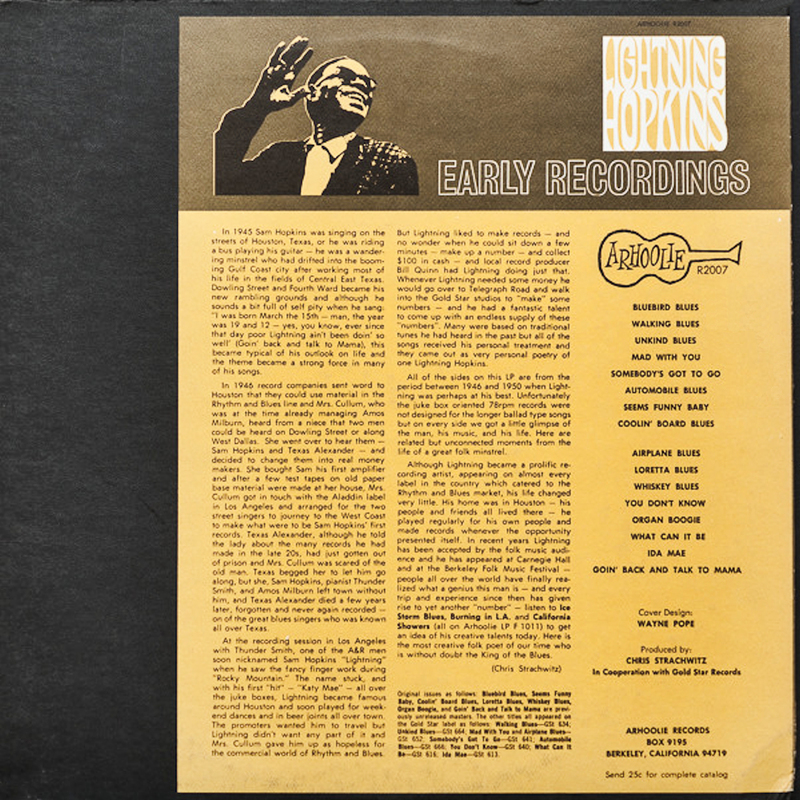 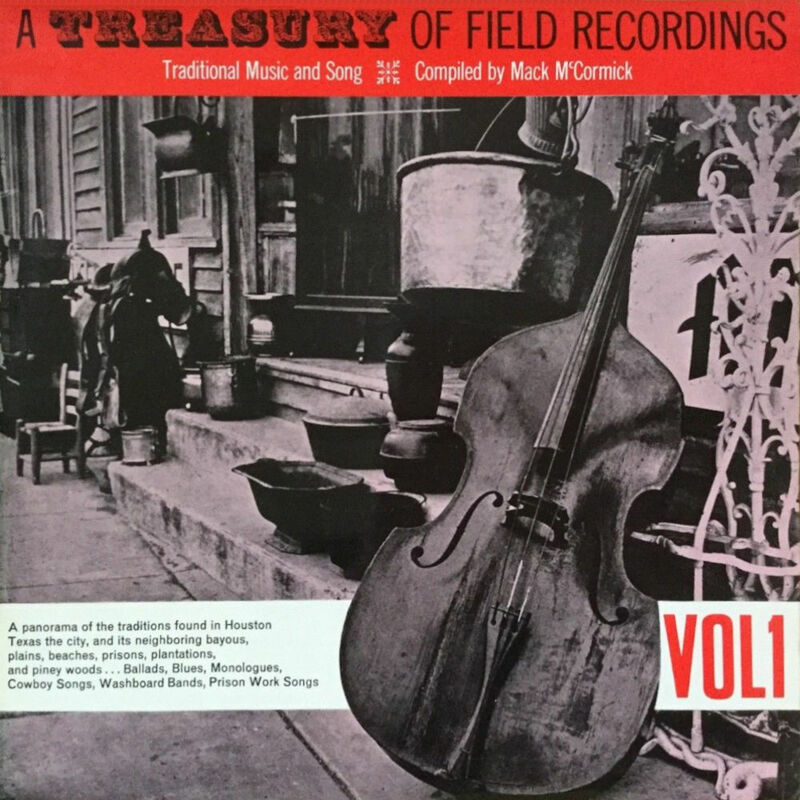 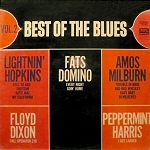 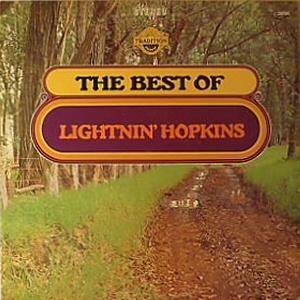 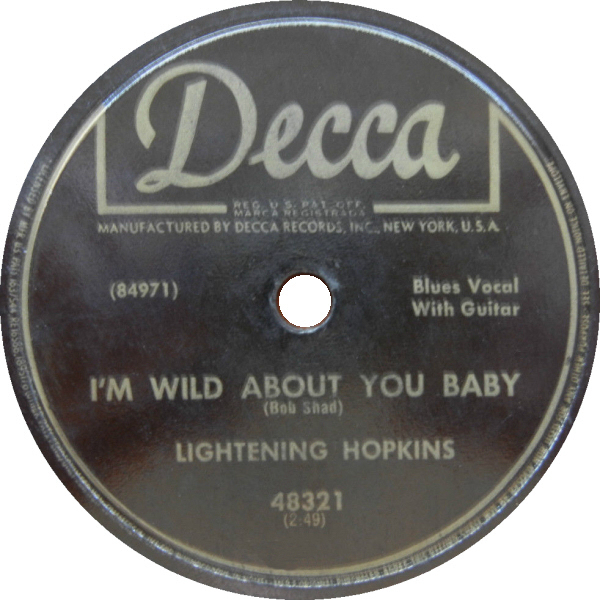 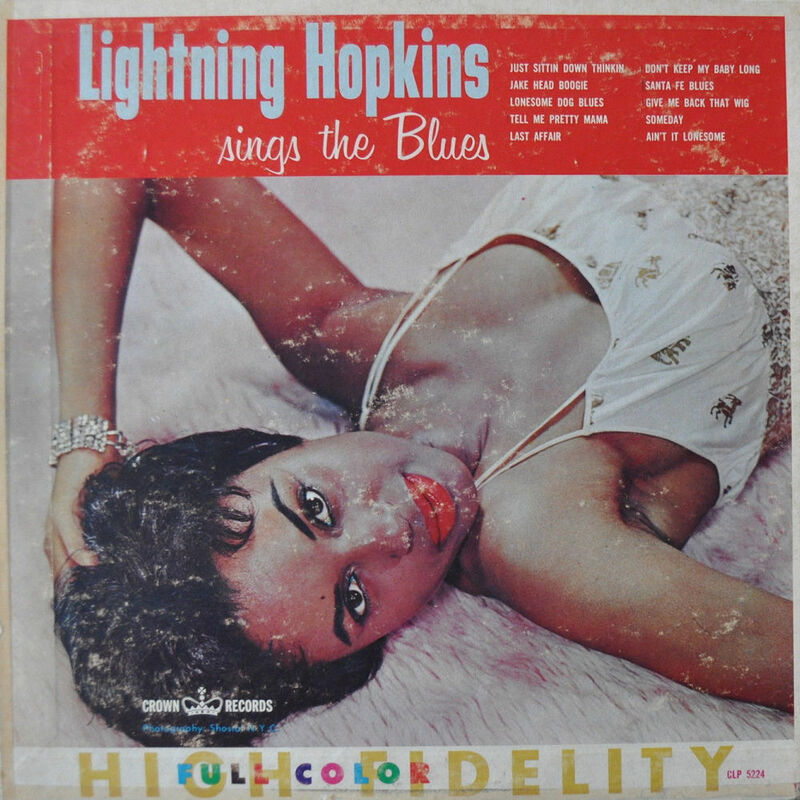 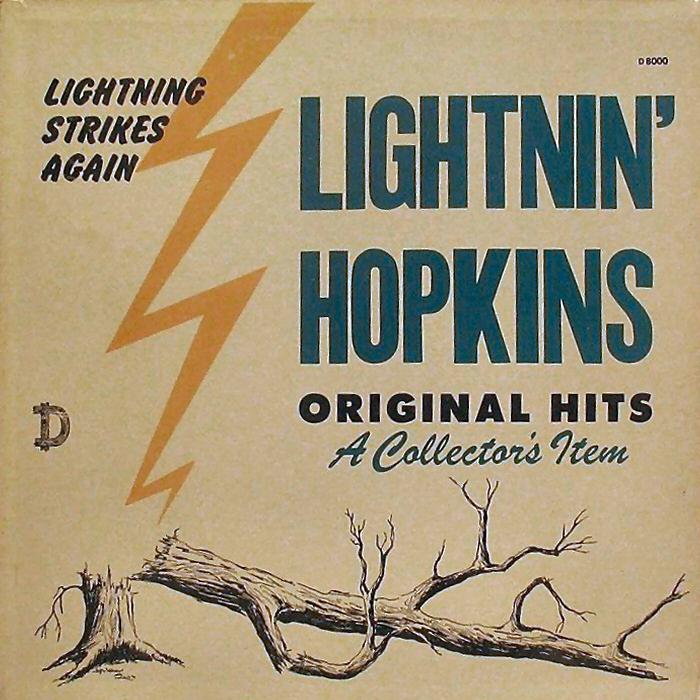 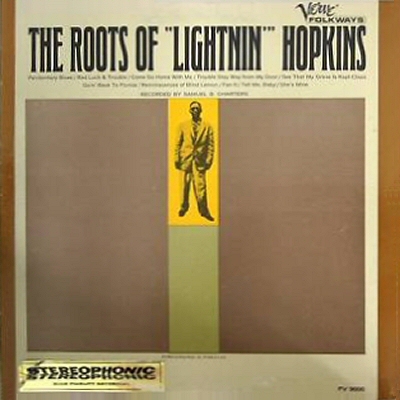 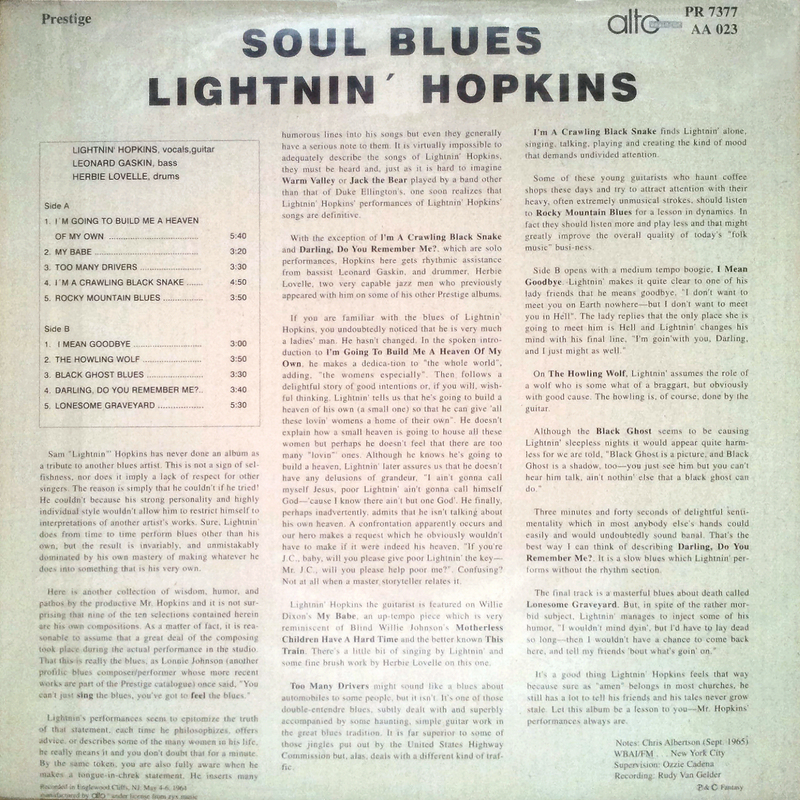 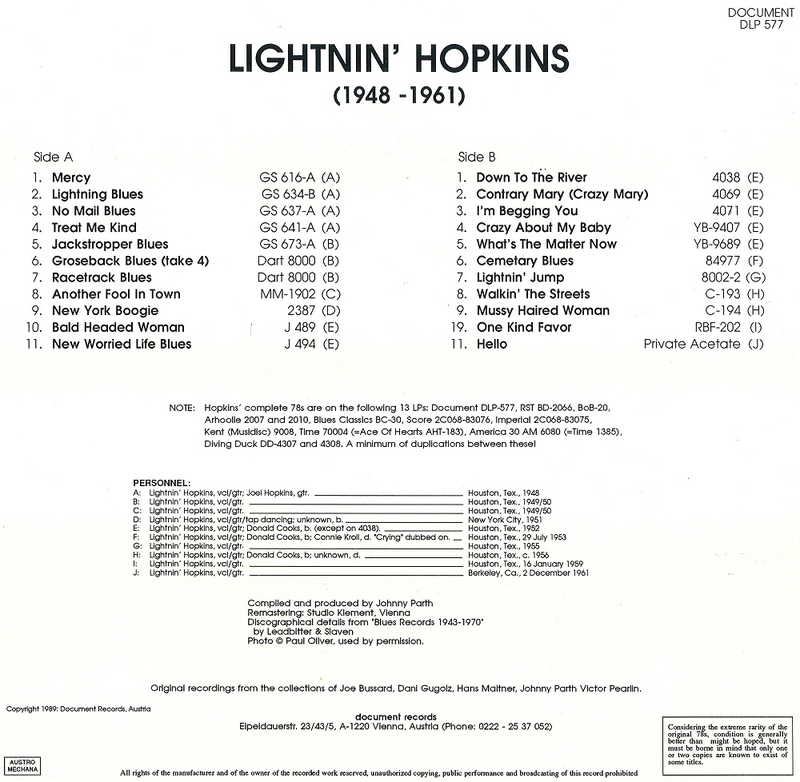 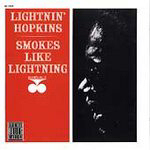 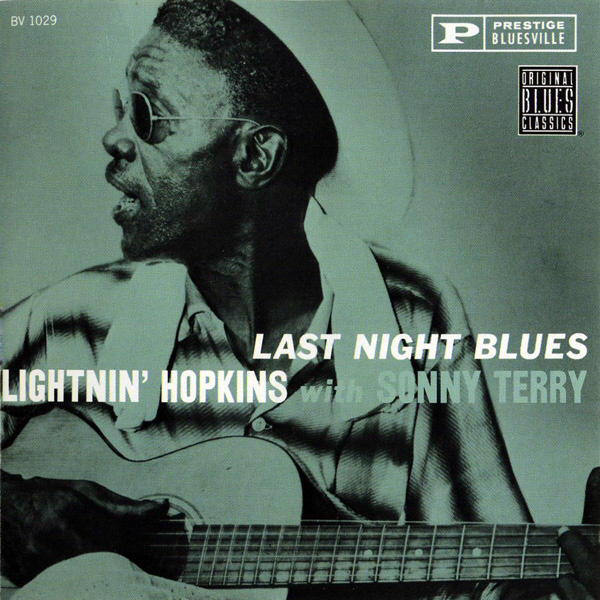 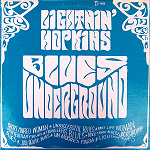 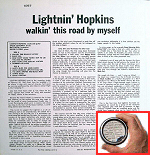 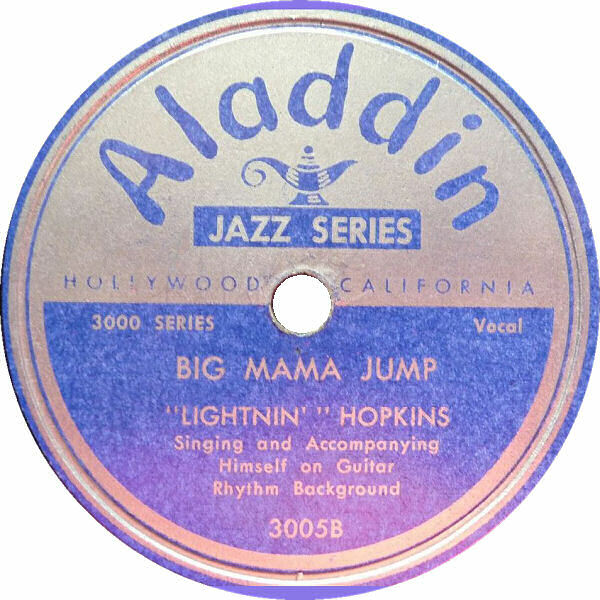 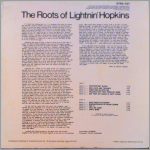 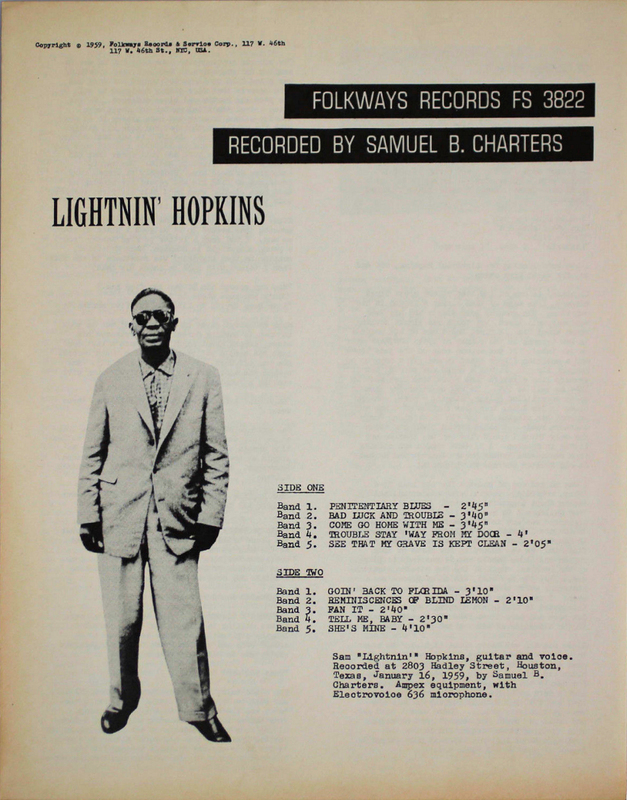 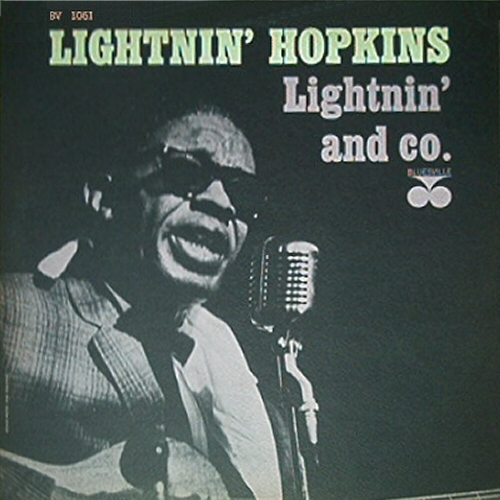 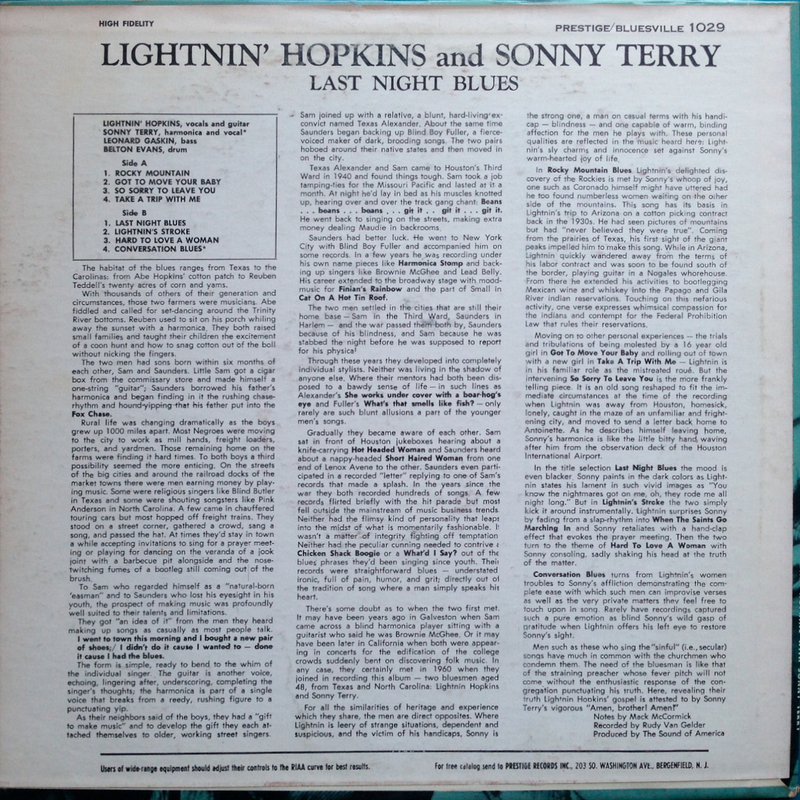 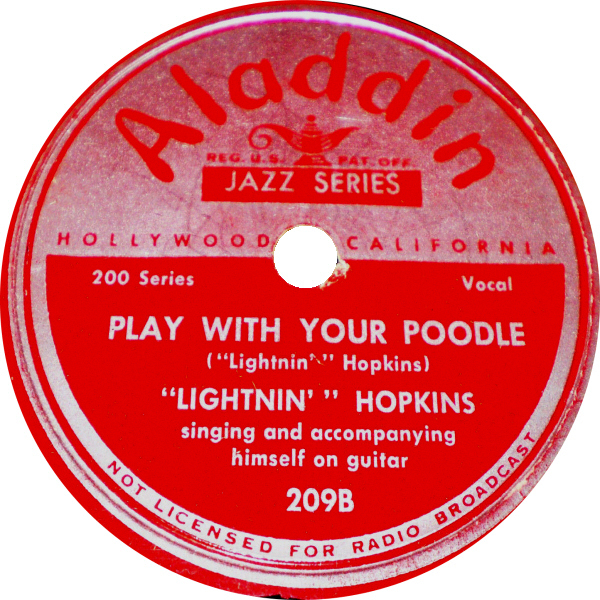 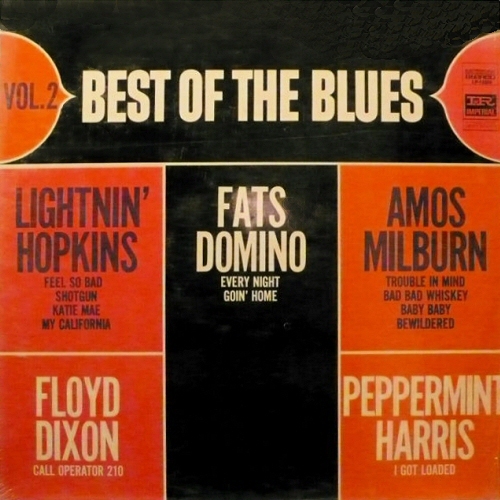 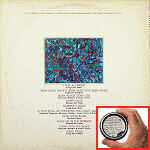 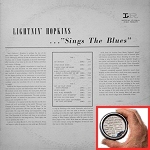 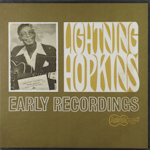 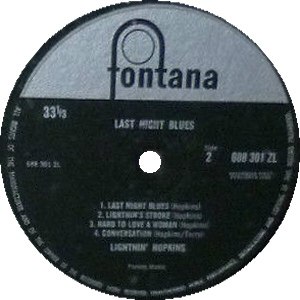 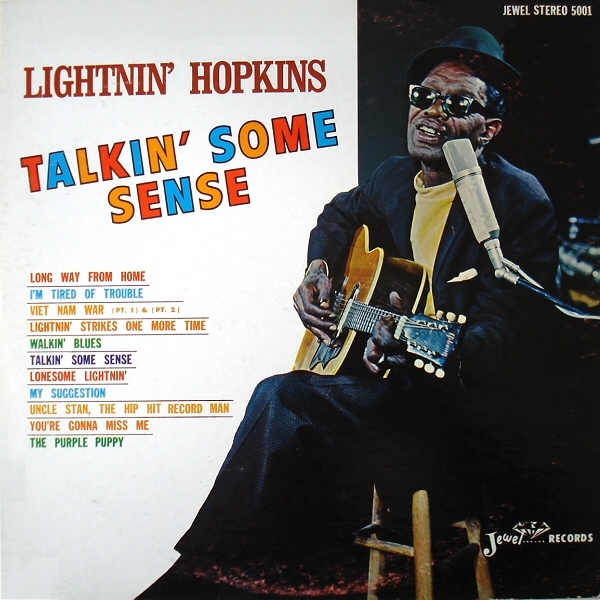 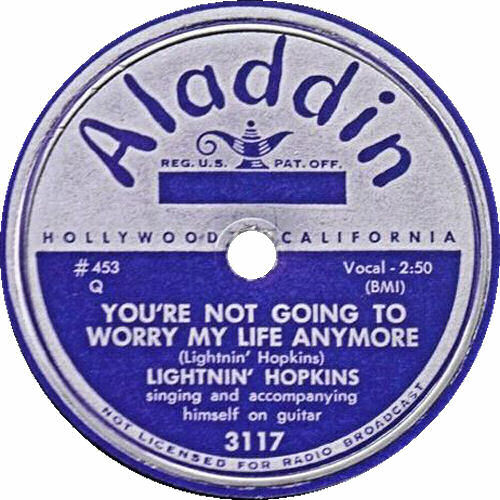 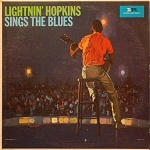 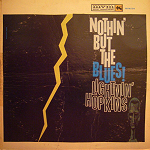 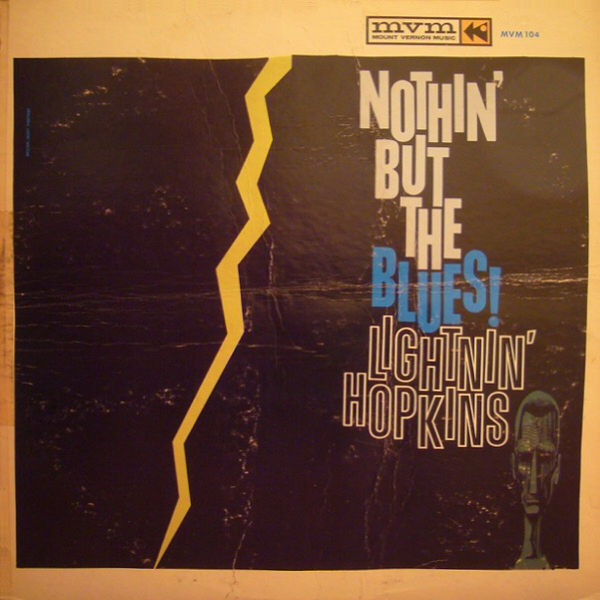 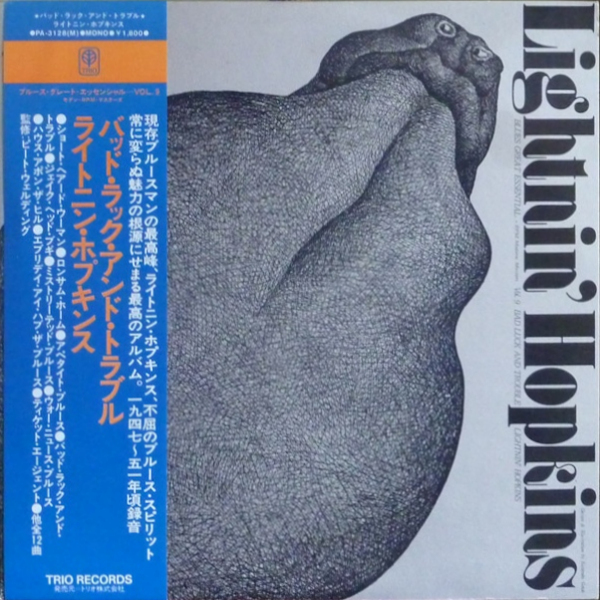 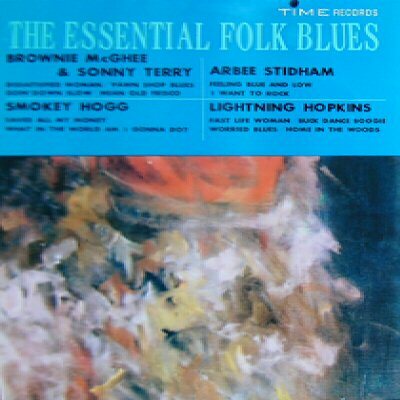 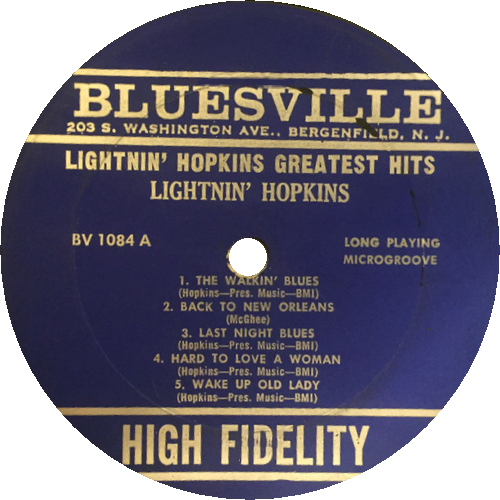 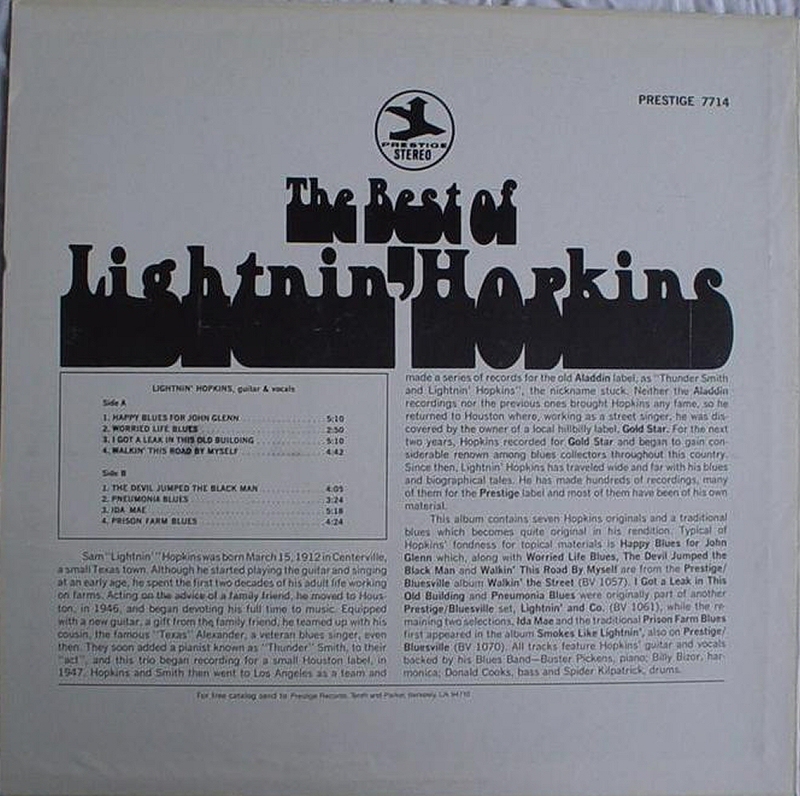 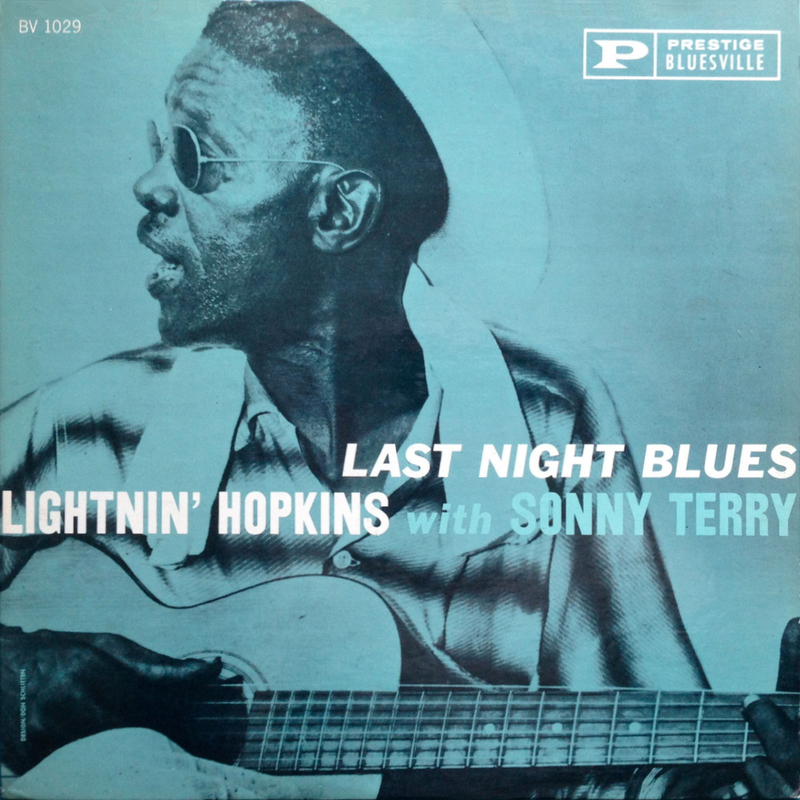 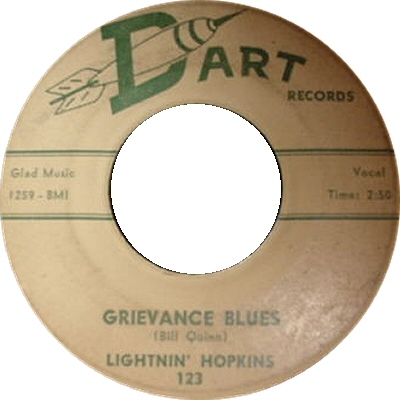 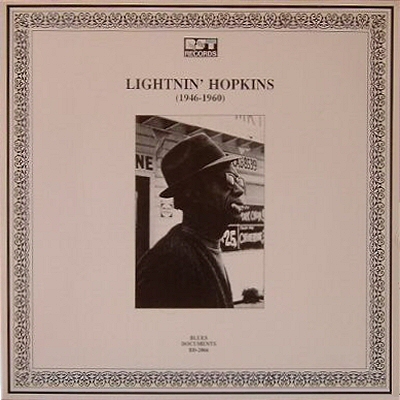 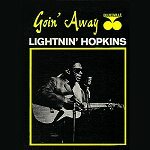 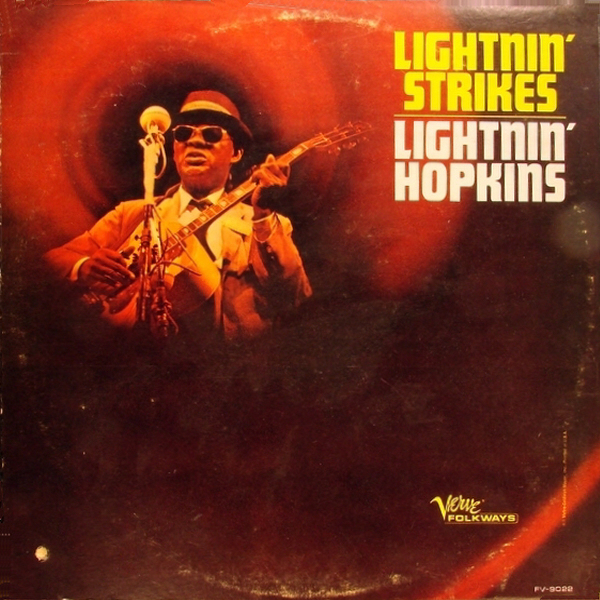 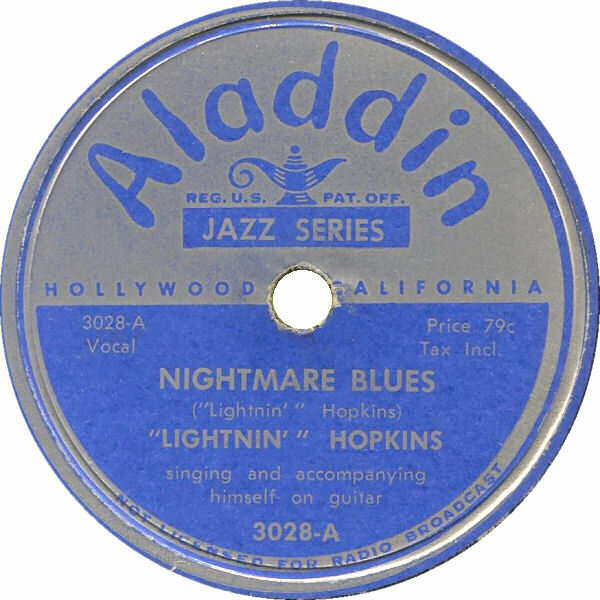 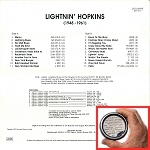 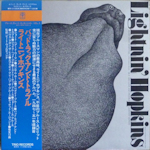 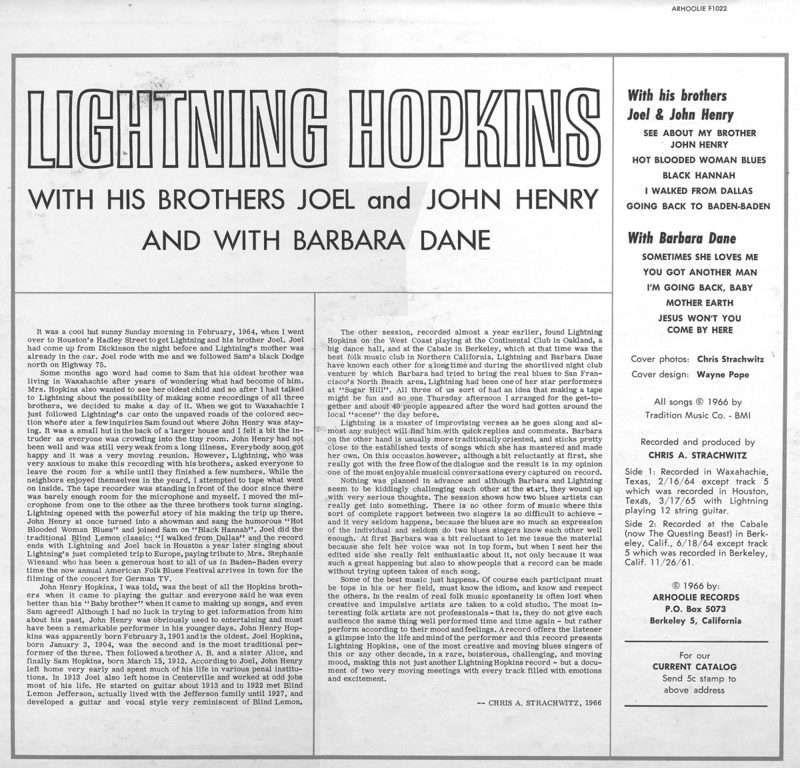 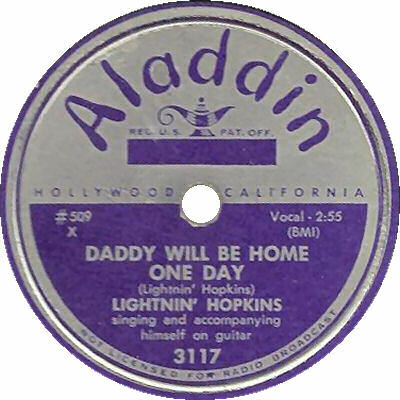 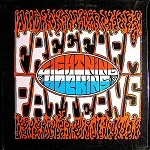 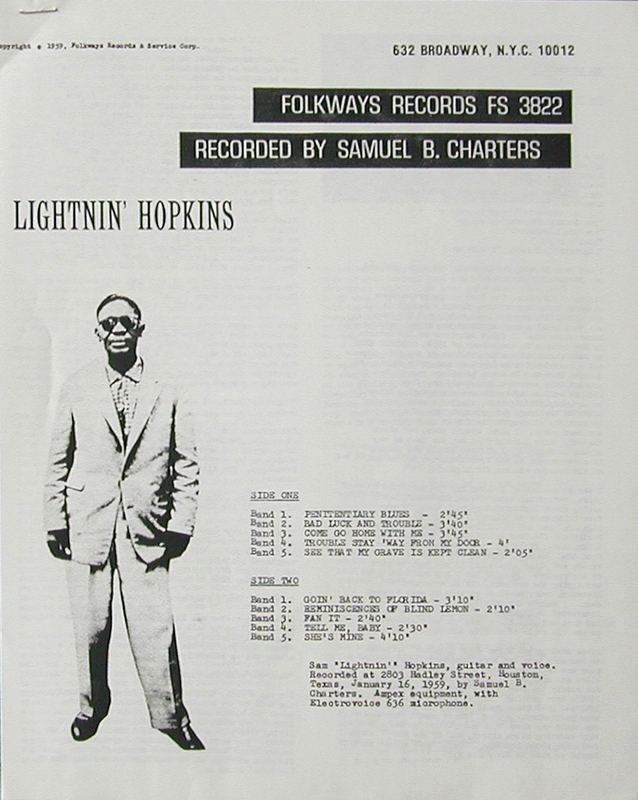 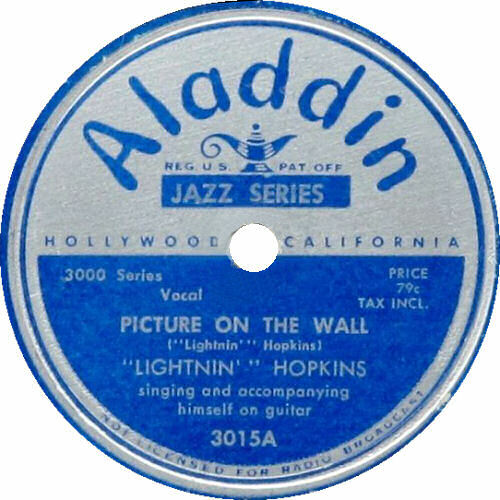 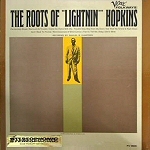 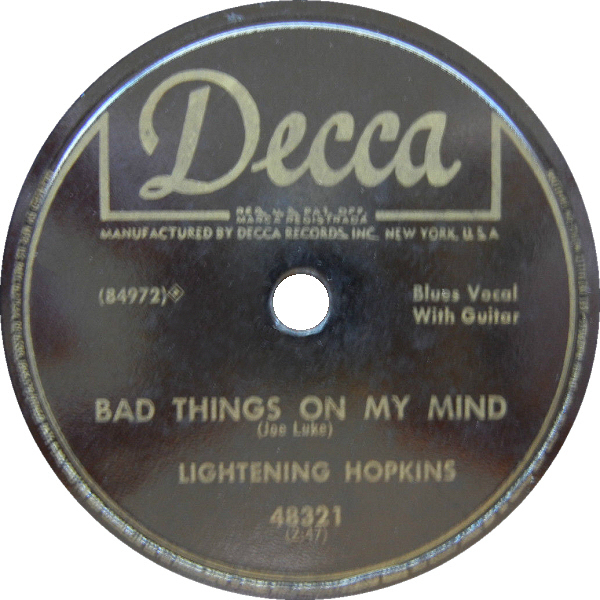 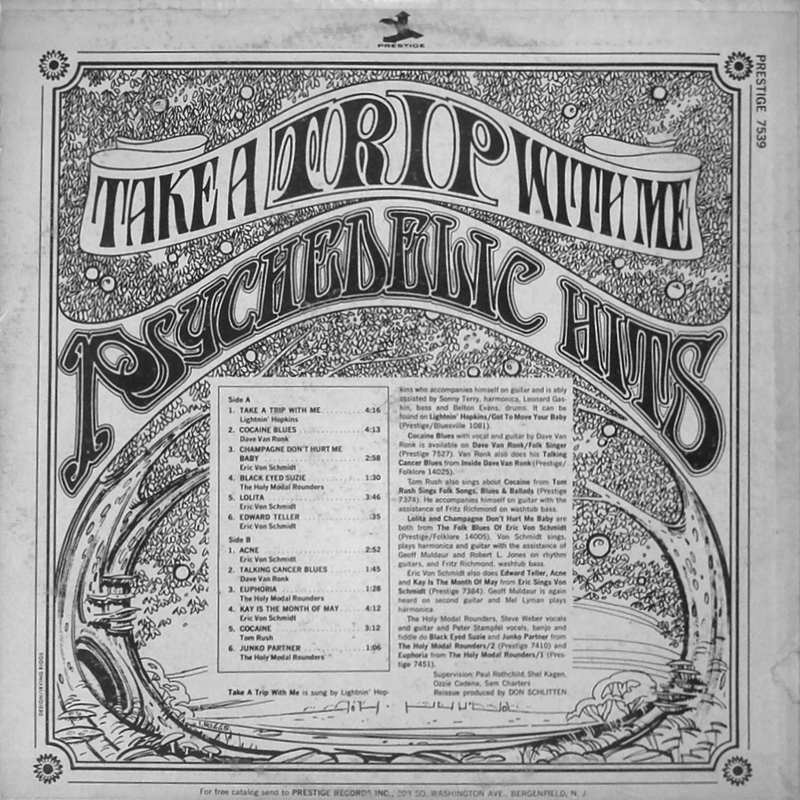 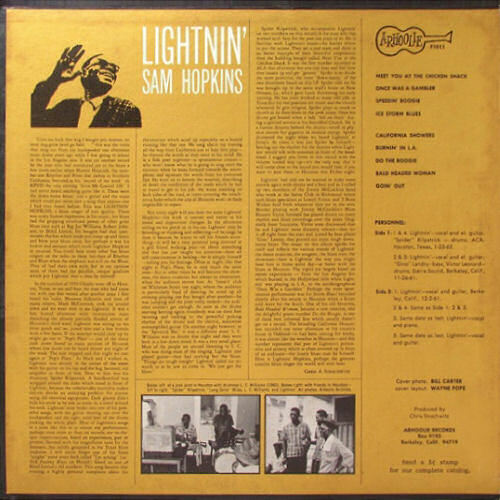 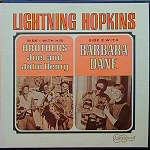 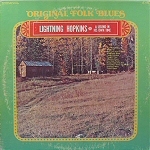 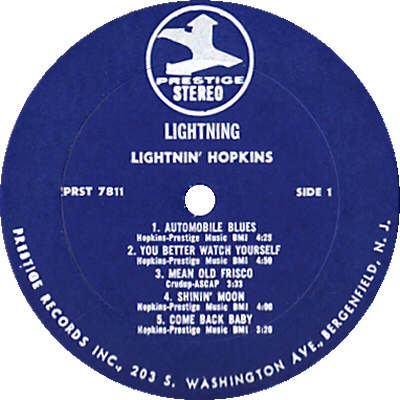 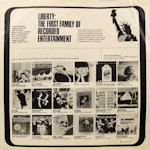 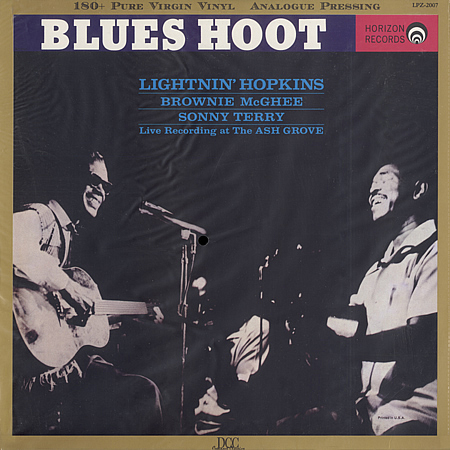 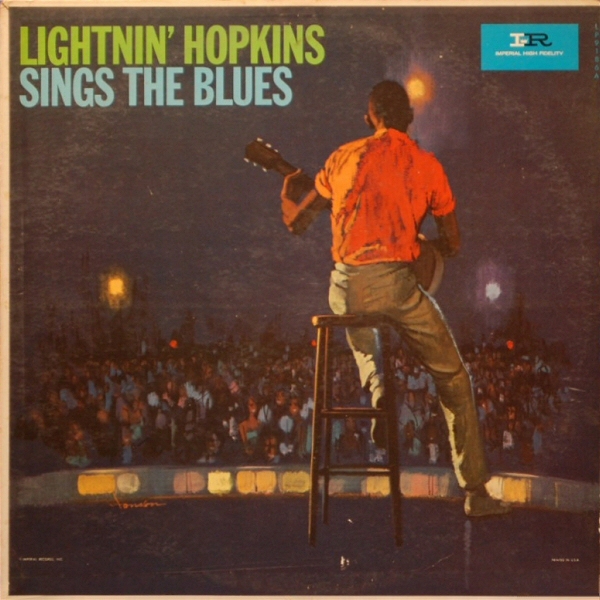 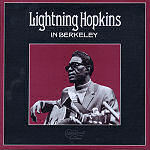 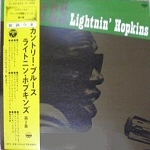 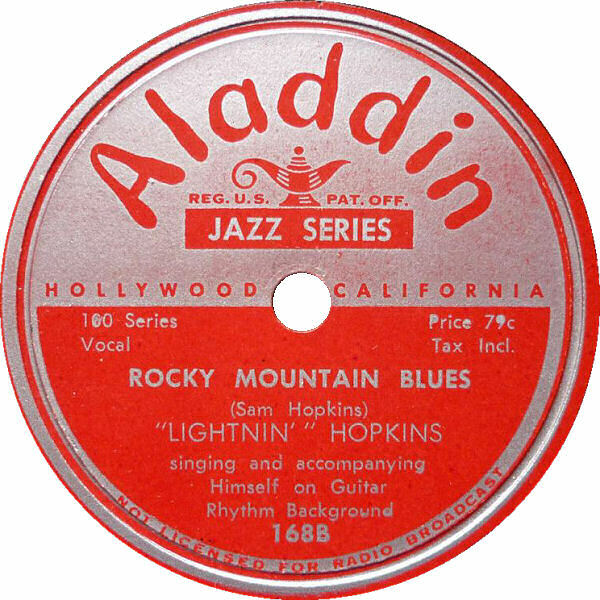 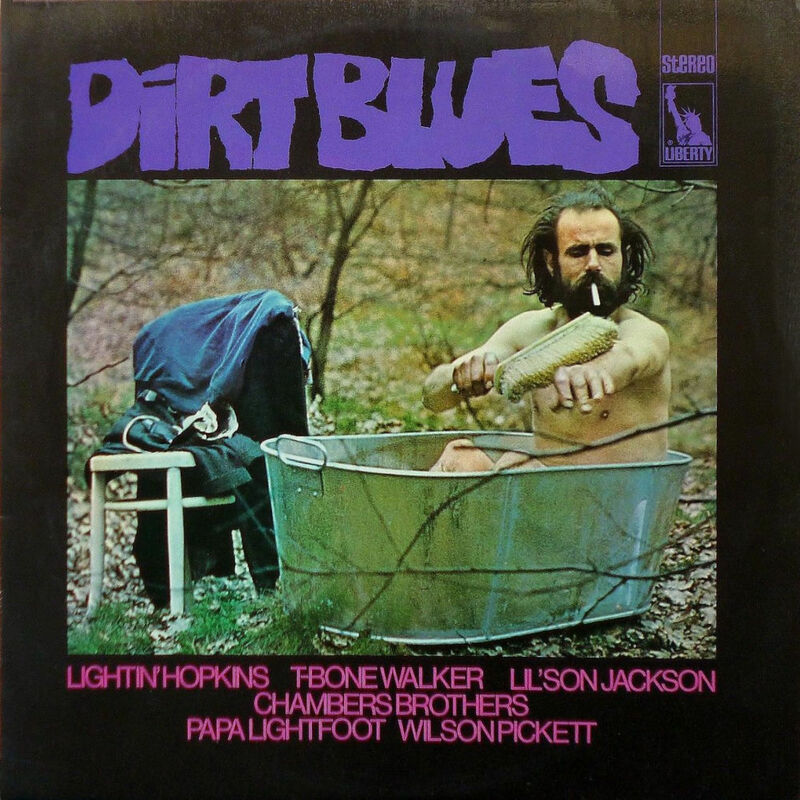 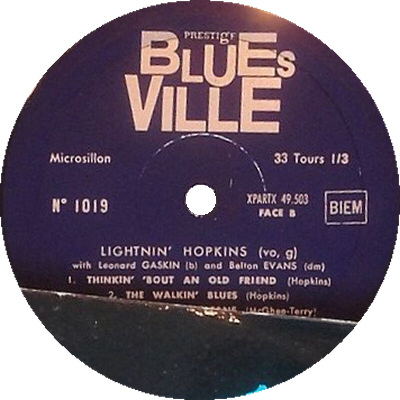 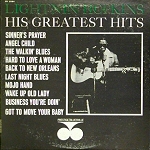 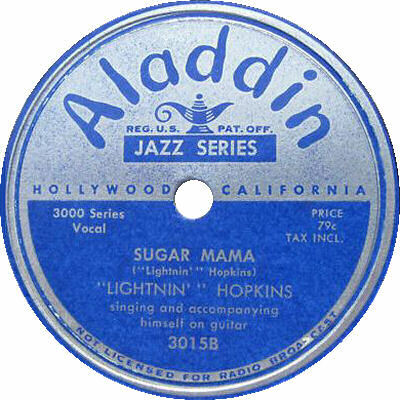 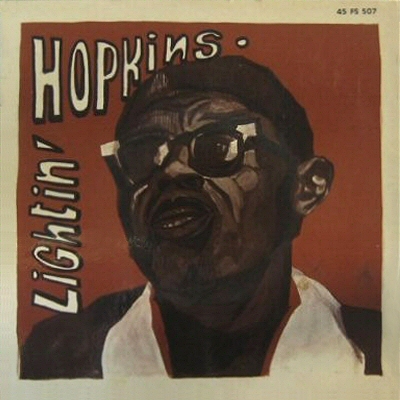 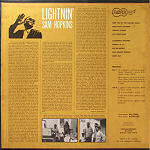 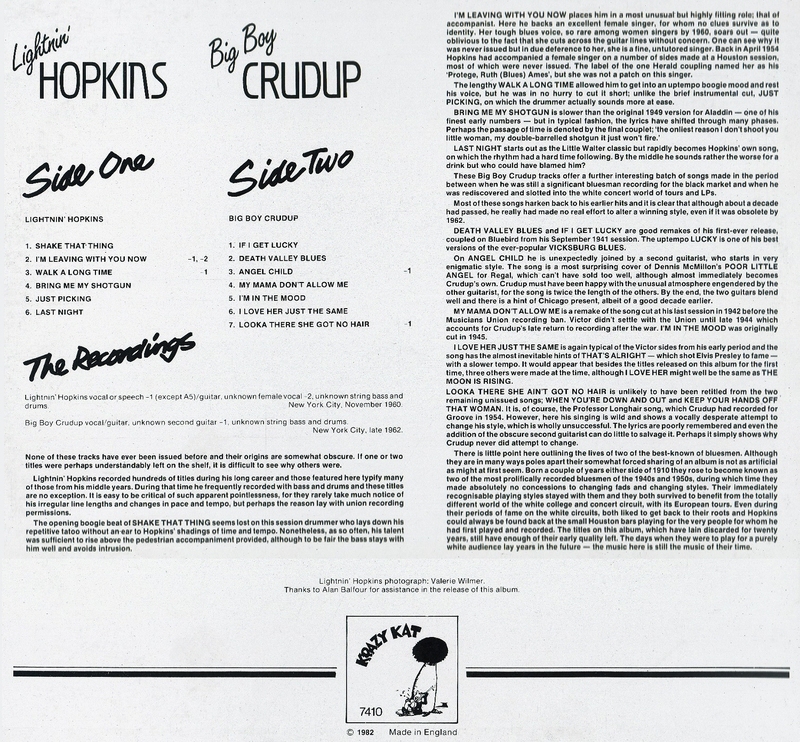 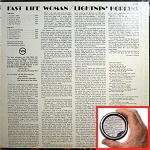 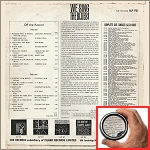 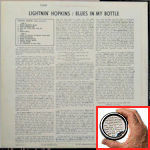 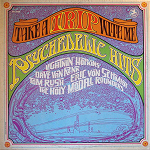 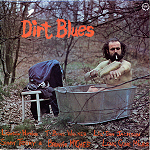 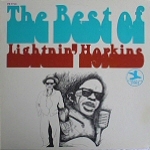 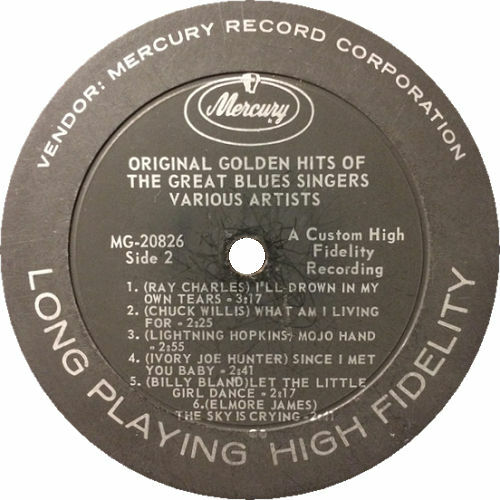 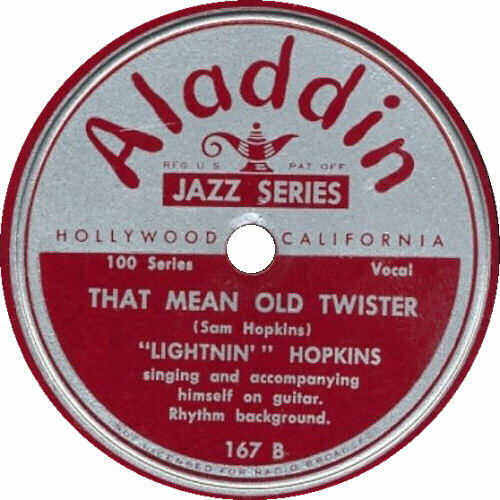 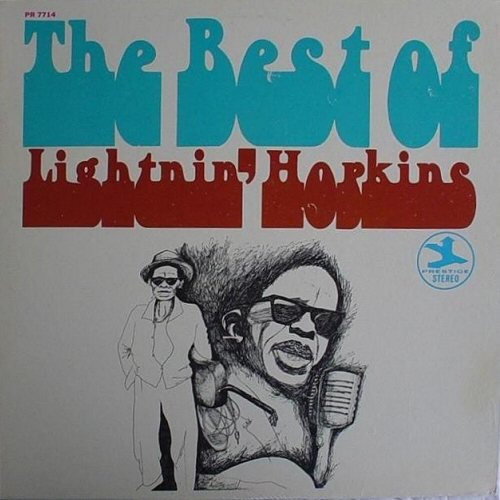 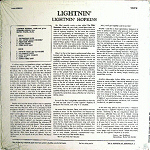 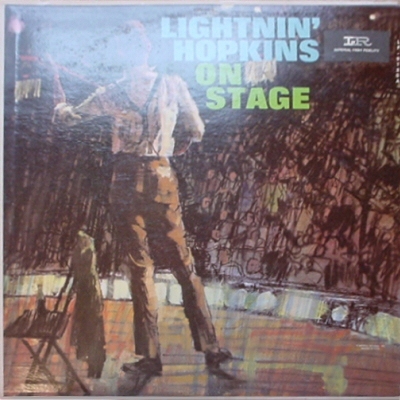 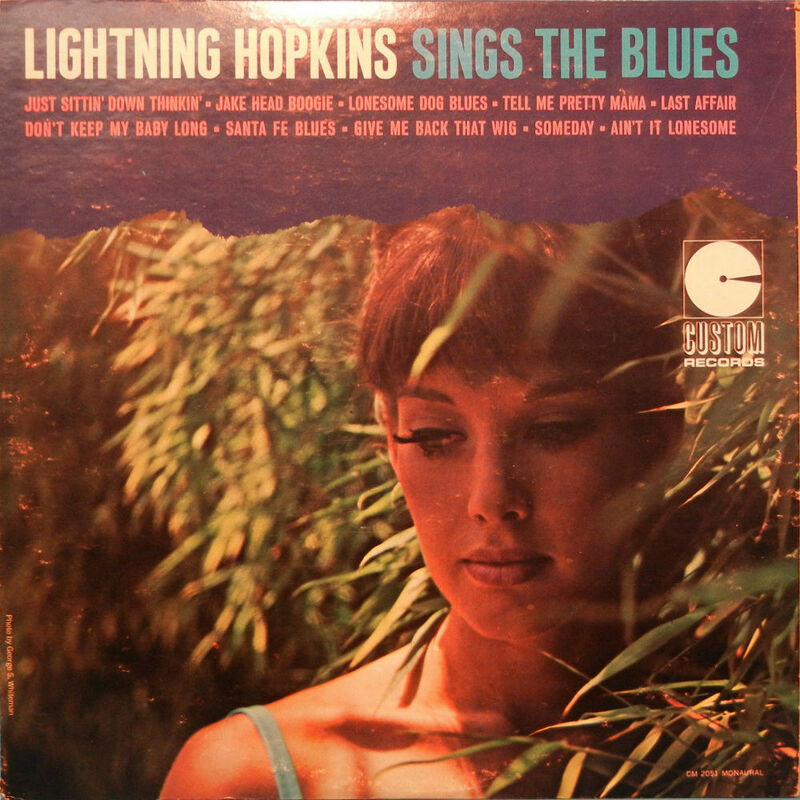 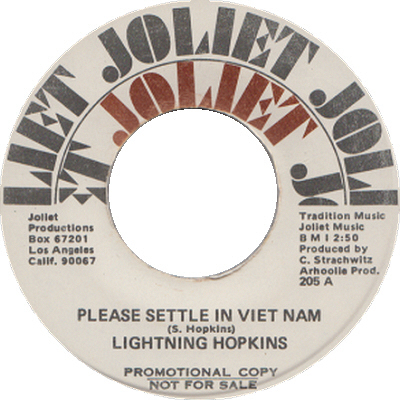 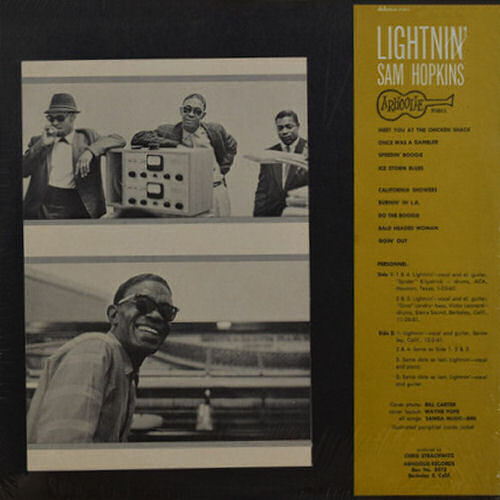 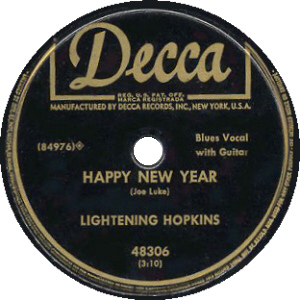 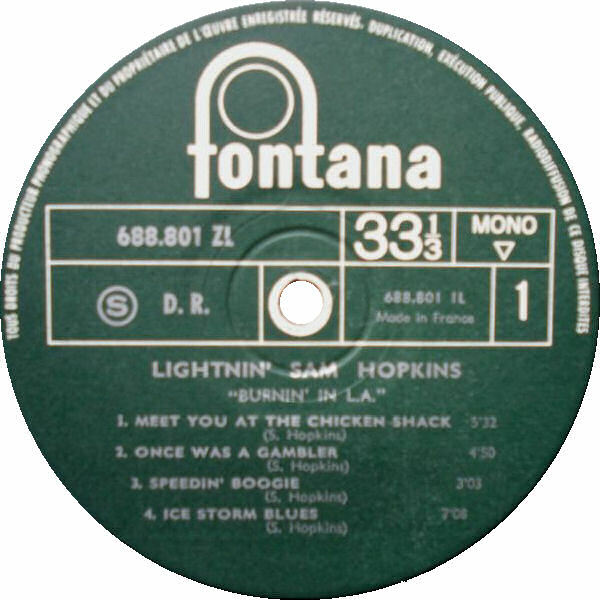 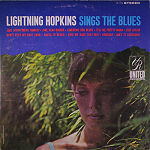 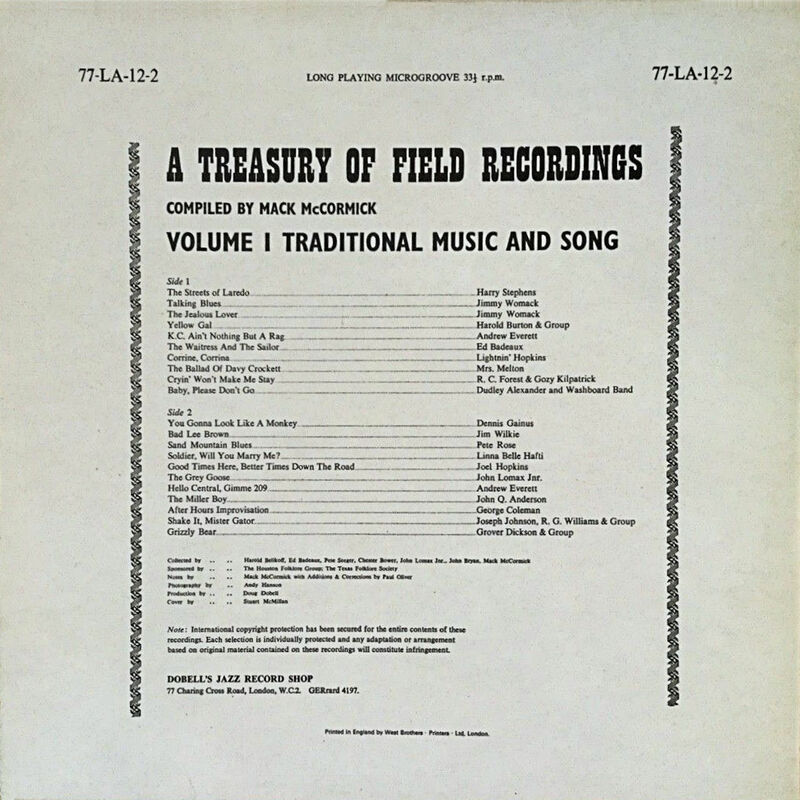 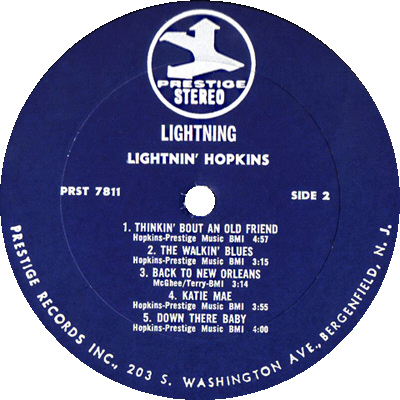 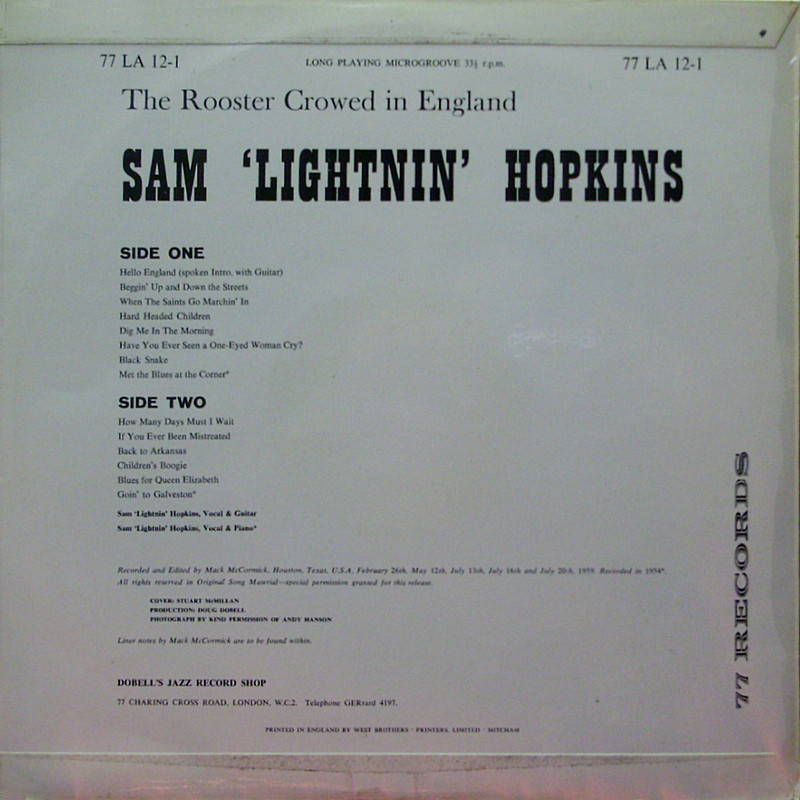 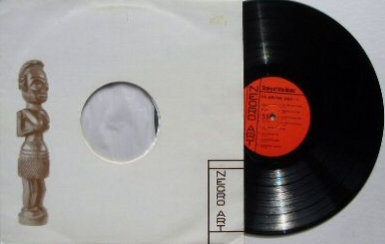 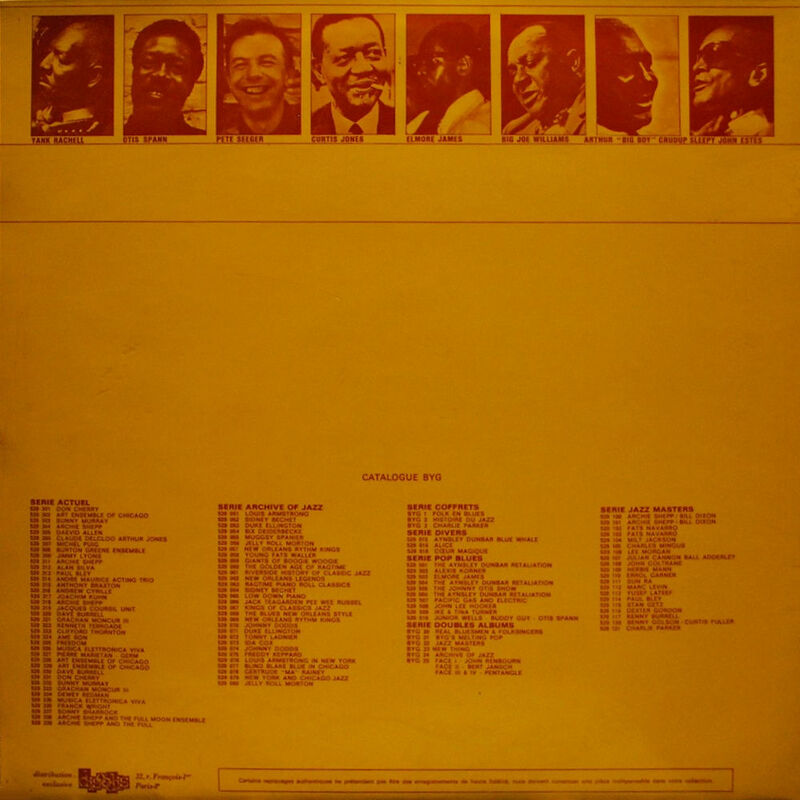 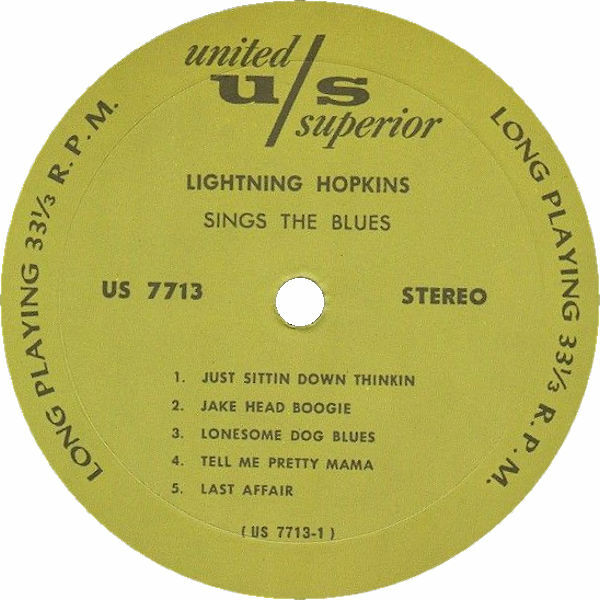 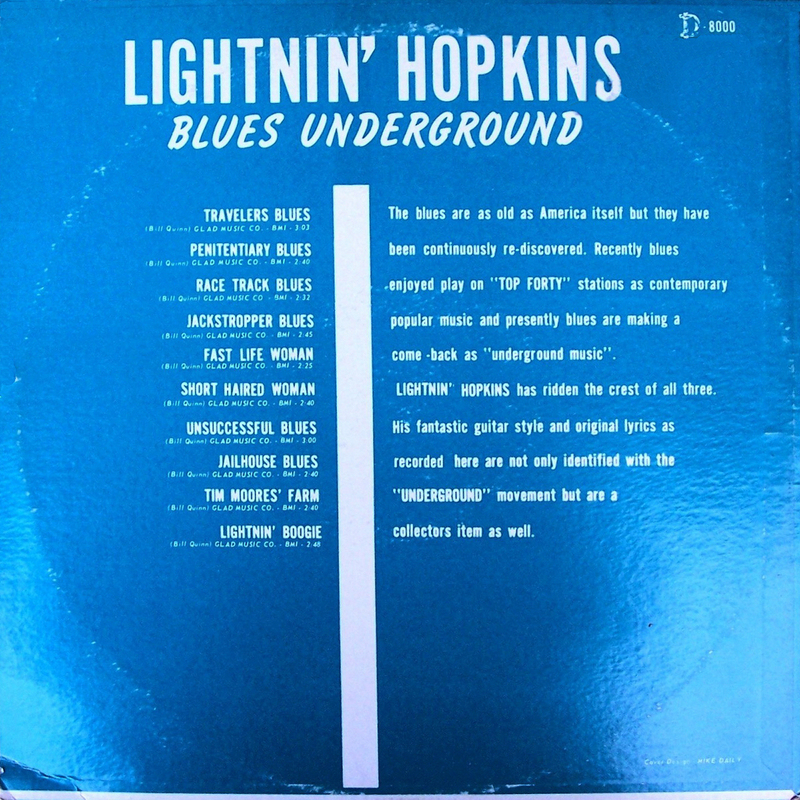 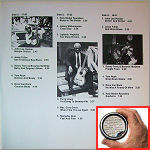 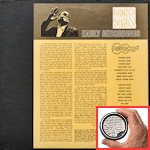 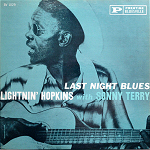 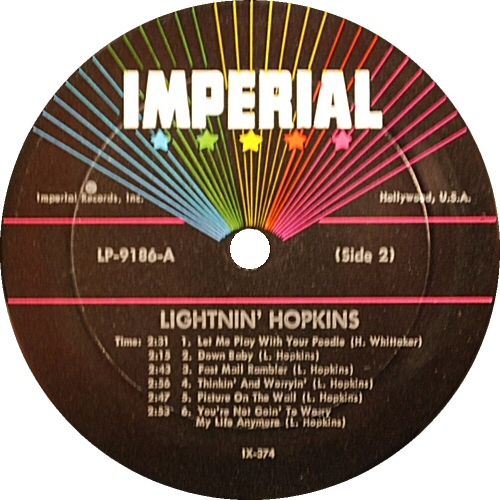 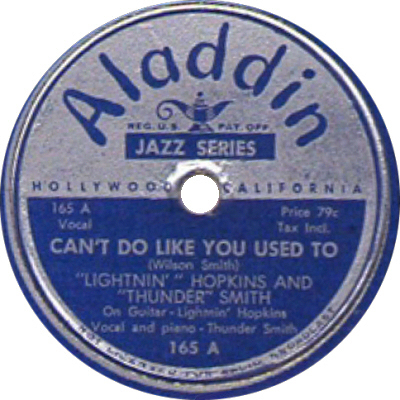 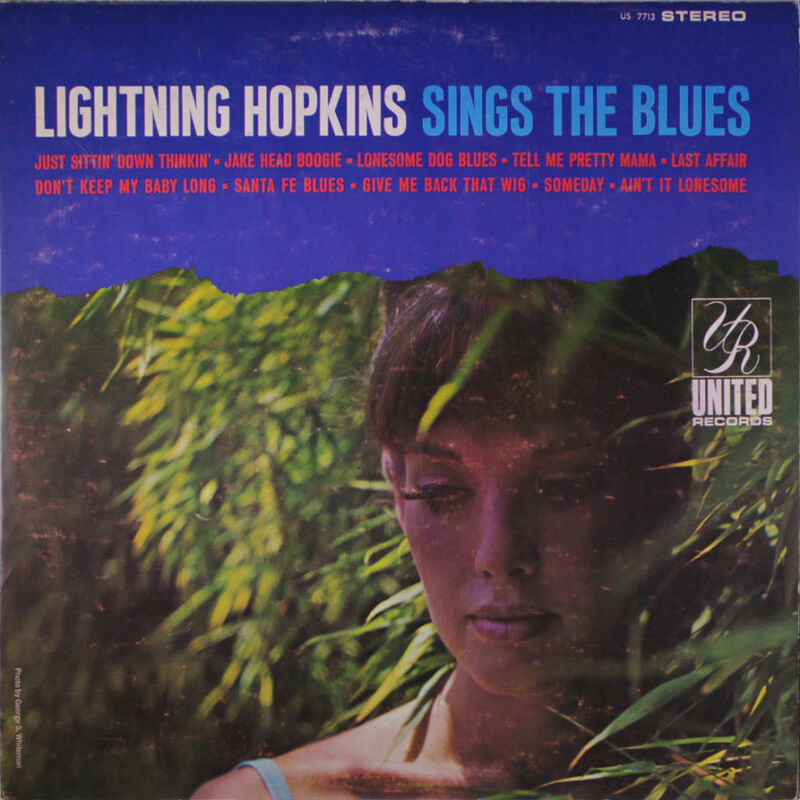 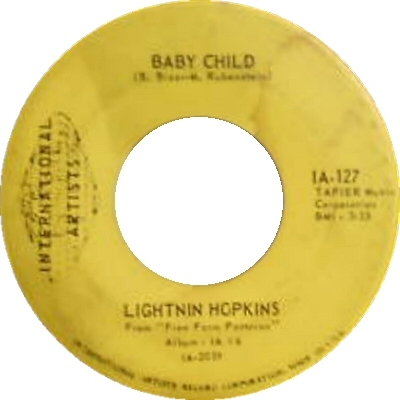 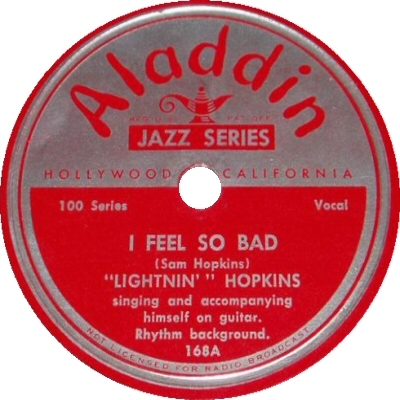 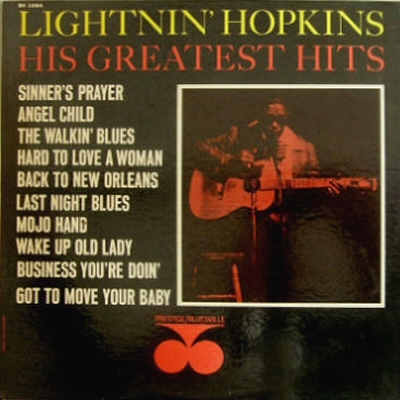 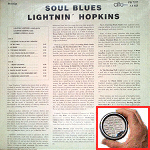 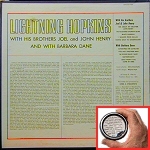 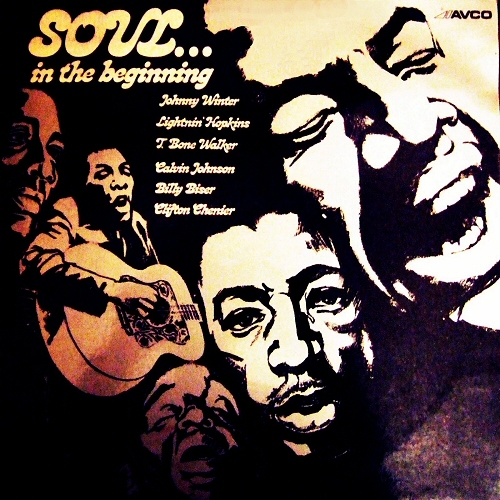 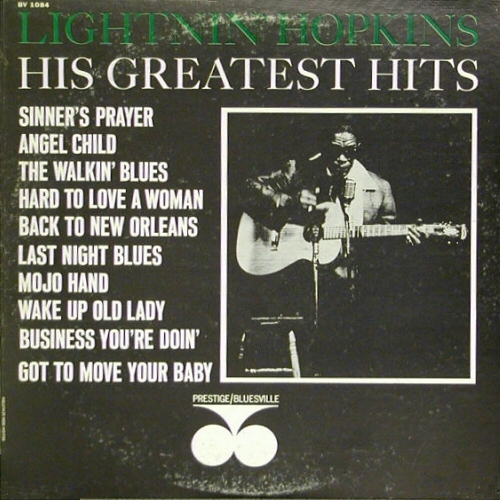 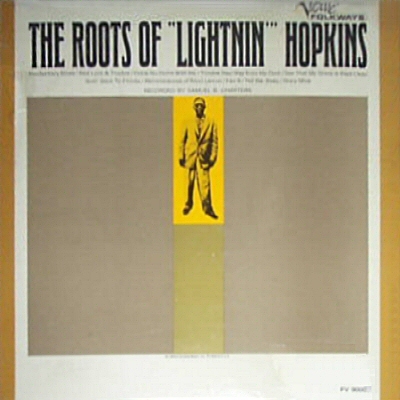 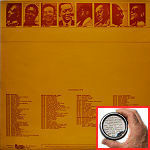 "Early Recordings"
"Lightin Hopkins - The Hippie? 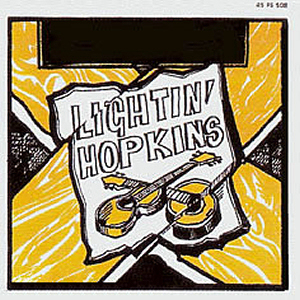 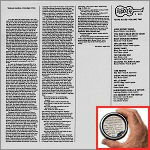 No not really - Just plain LIGHTIN - Loved by the Hippies - and non Hippies - A symbol of freedom to everyone who loves music. 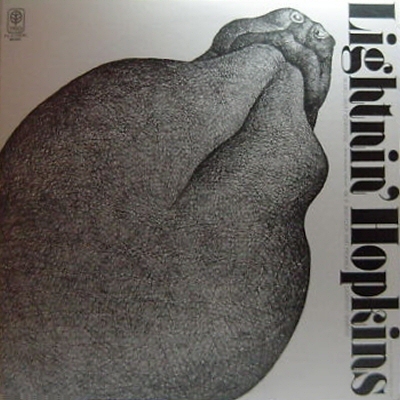 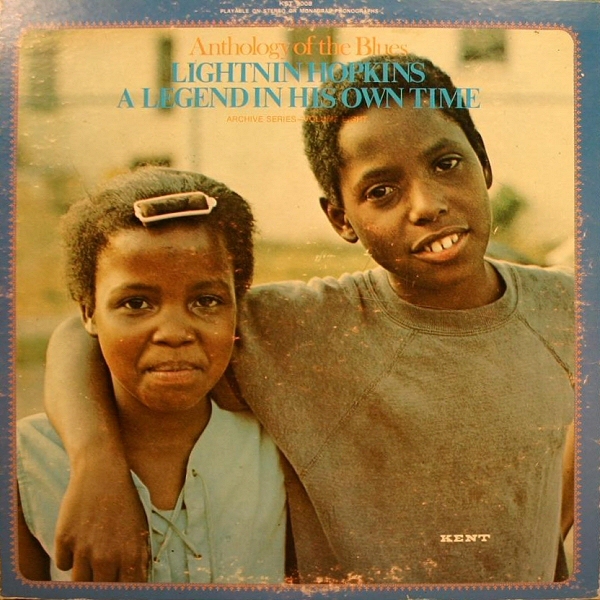 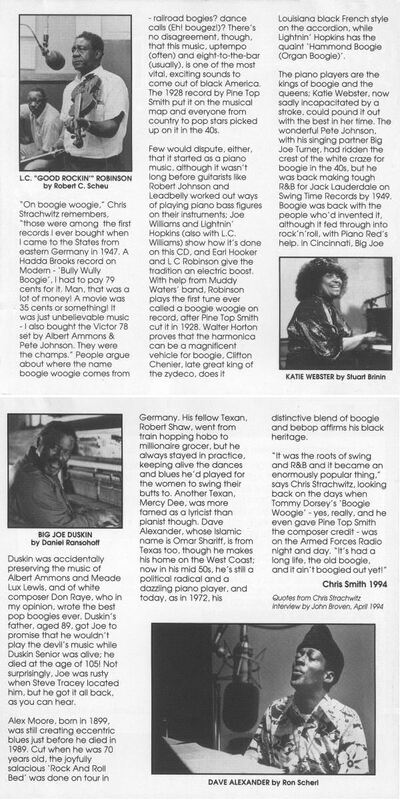 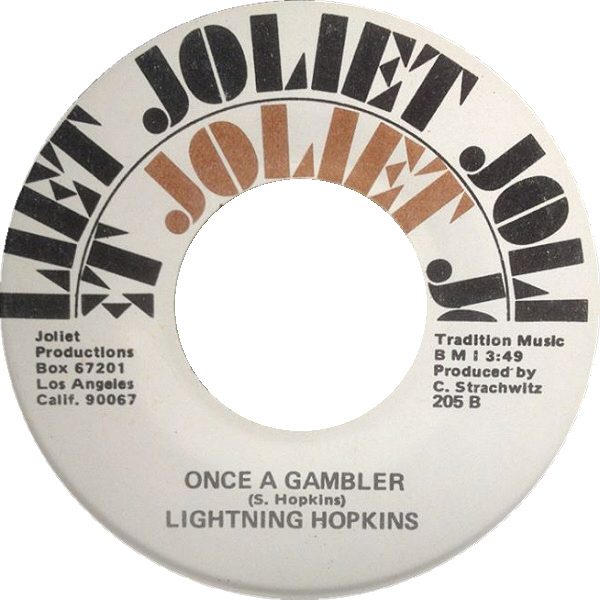 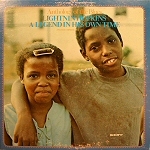 All my life in the recording world I have heard of Lightin Hopkins - A real legend of music. 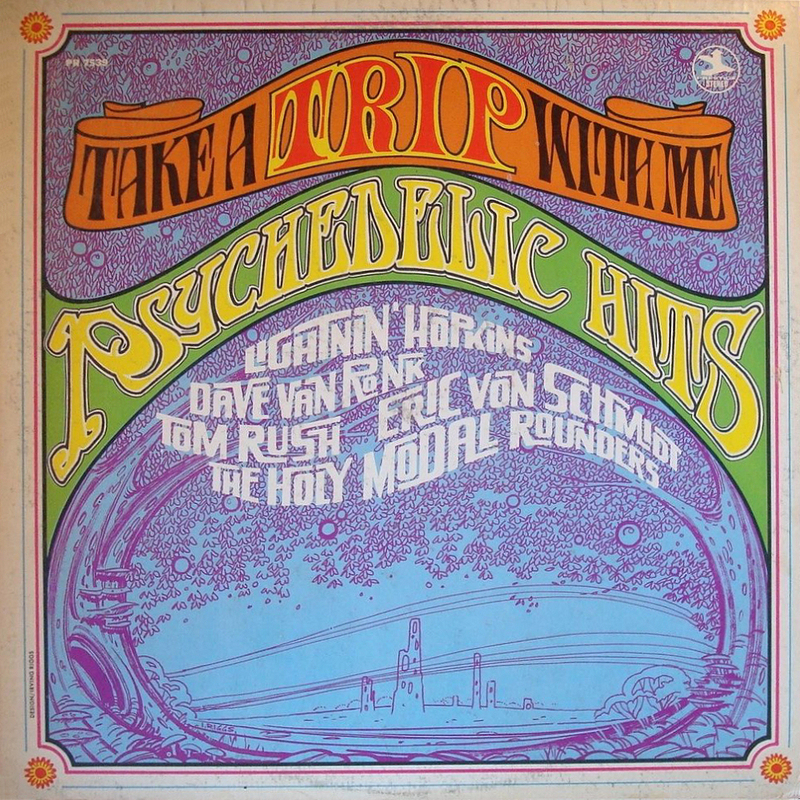 Last year while visiting the Haight-Ashbury District, San Francisco, I picked up three boys that were hitching a ride downtown. 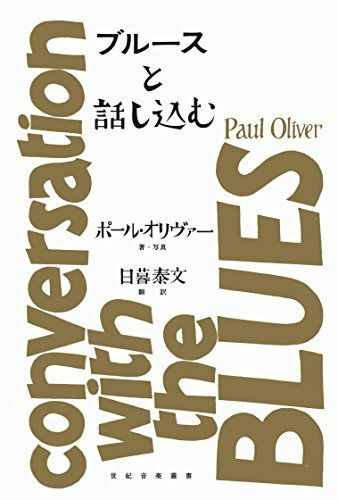 In the conversation with one of them he told me he had come from Boston, sold everything he owned to go to San Francisco. Everything he had except his Lightin Hopkins albums. 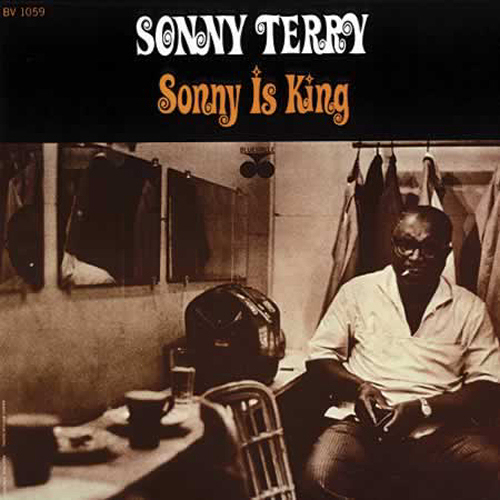 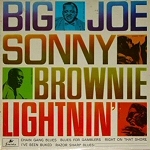 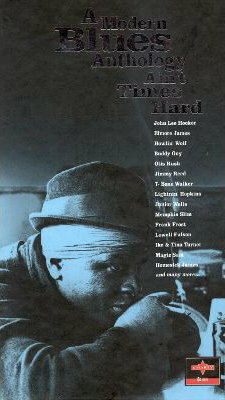 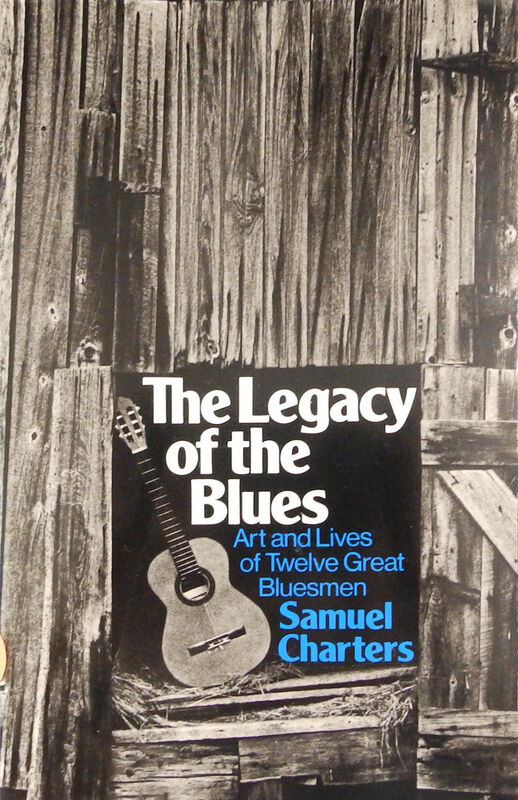 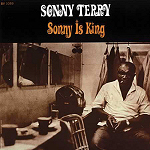 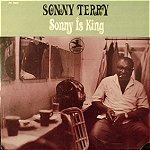 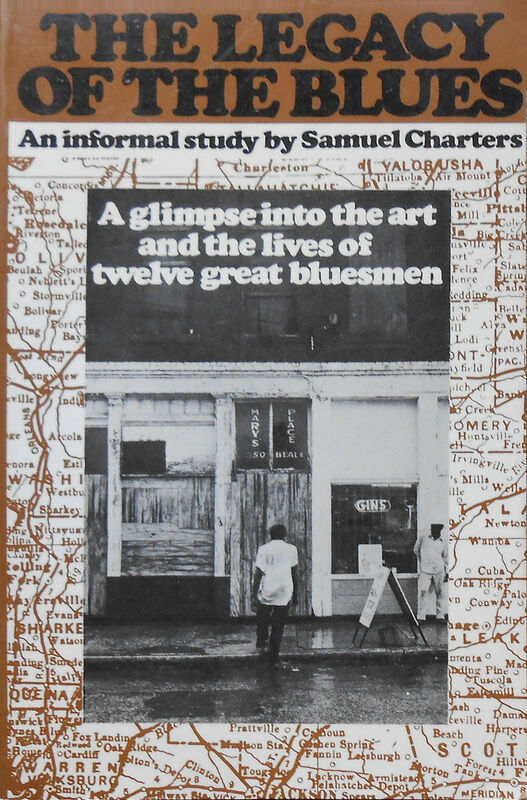 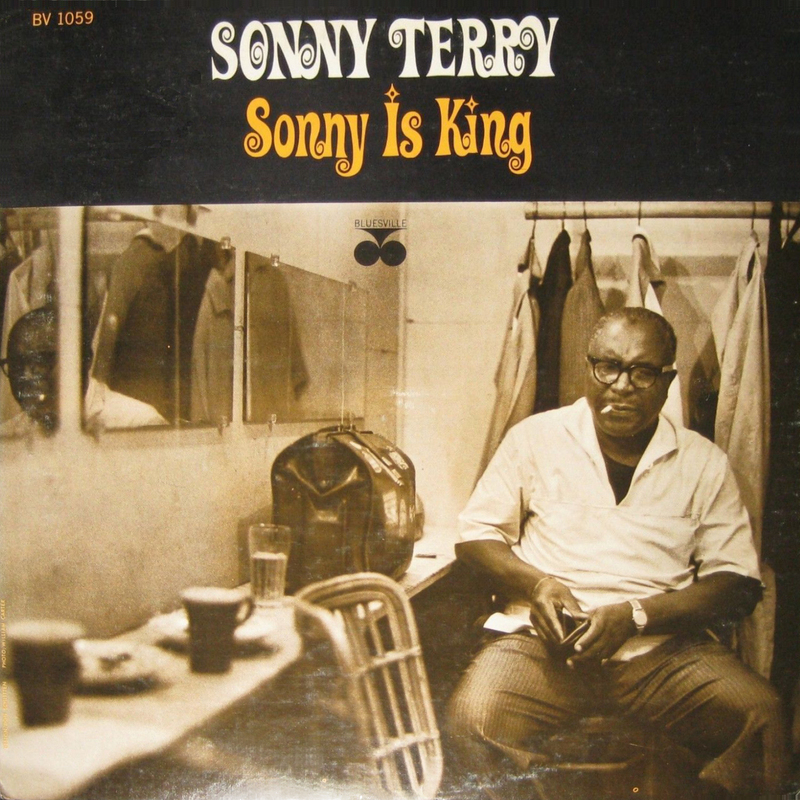 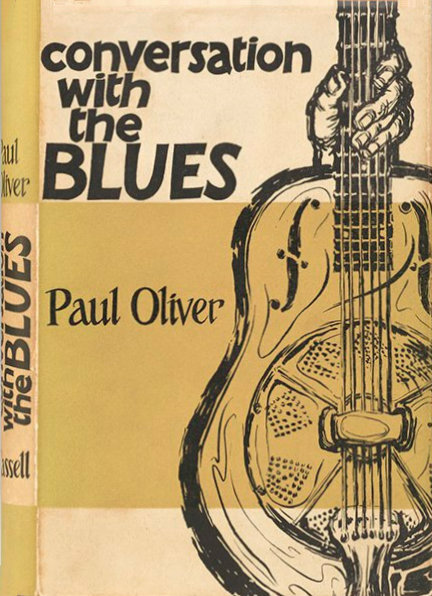 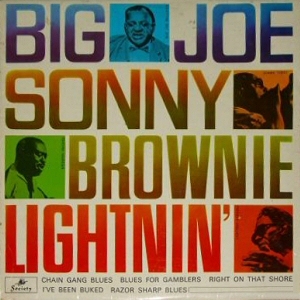 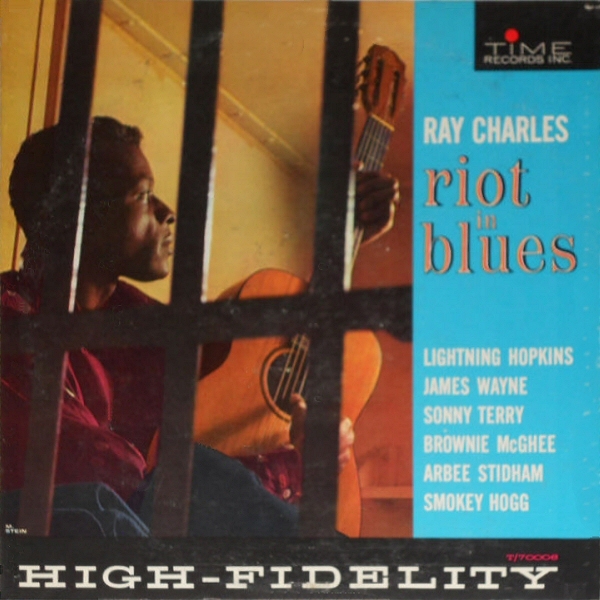 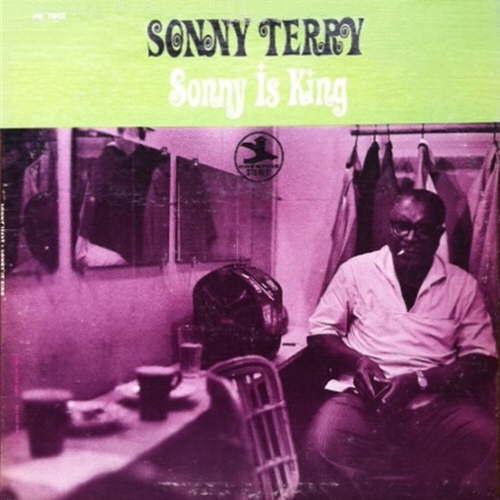 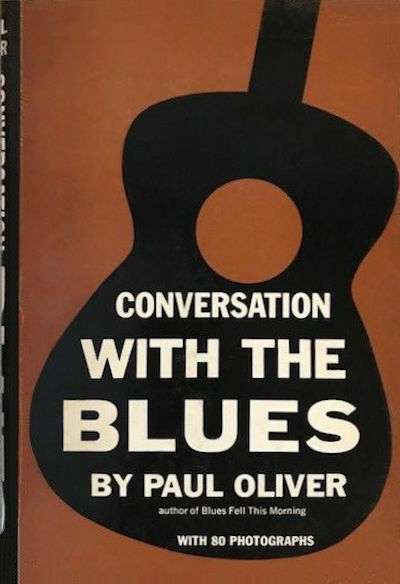 He played Guitar with a band and had learned blues listening to all the Lightin Hopkins albums he could buy. Recently while in New York City at a club in the village I listened to antoher singer - guitarrist preform. 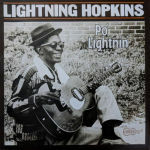 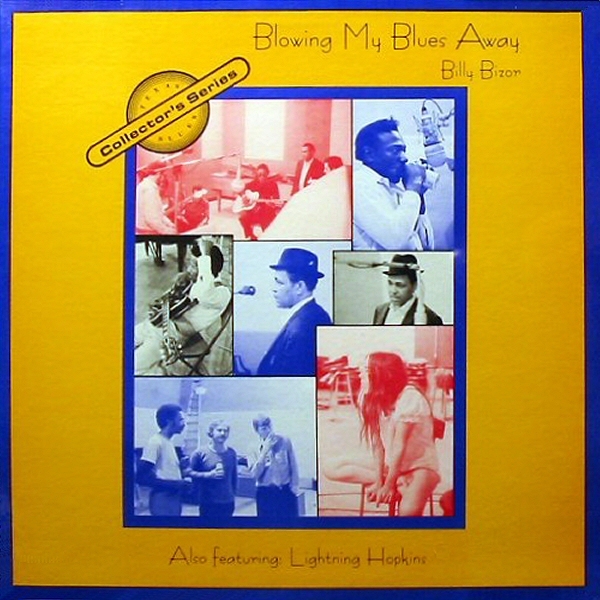 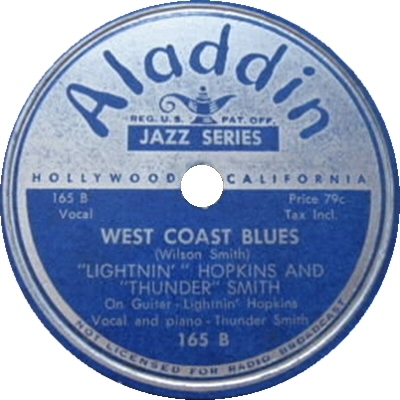 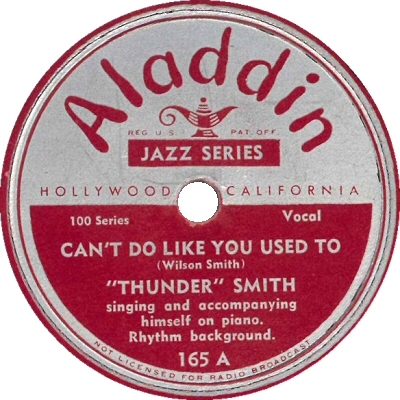 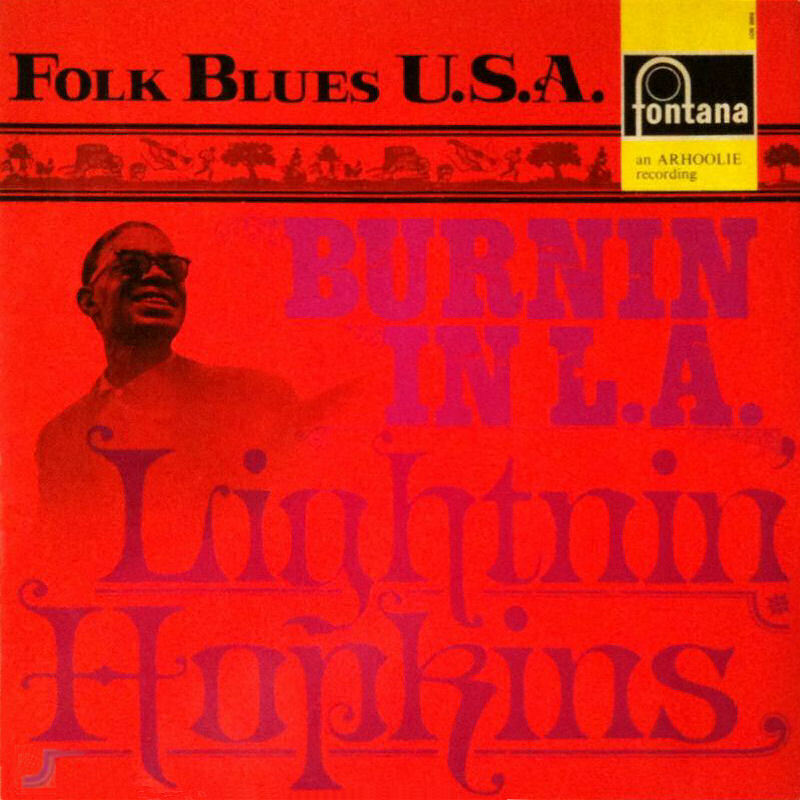 Halfway thru his act he broke into his version of Lightin Hopkins blues - guitar licks he said that he had studied at the foot of a master - "Lightin Hopkins". 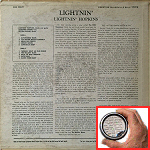 It is no wonder, having never met Lightin, that in January this year when Mansel Rubenstein, one of Lightin's closest friends called me and asked if I would like to record him- I literally jumped at the chance to go to the studio with the legend LIGHTIN HOPKINS. 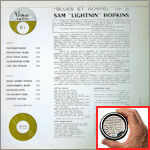 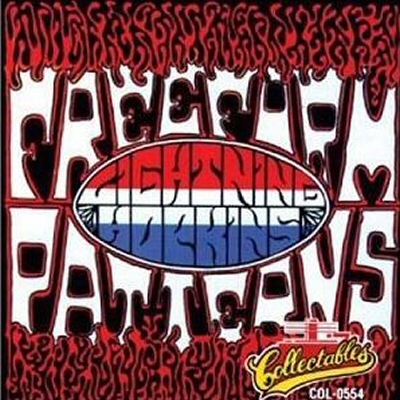 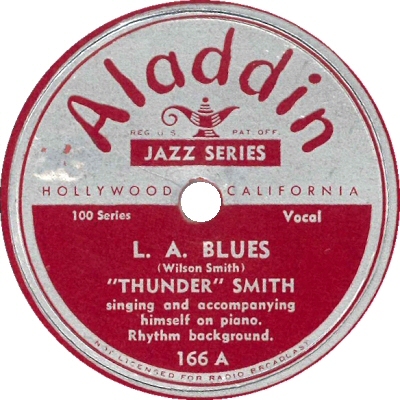 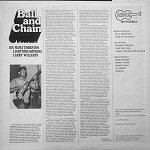 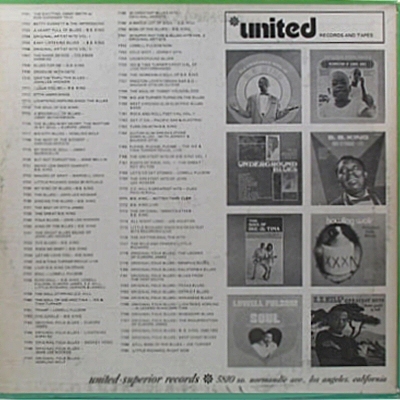 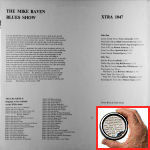 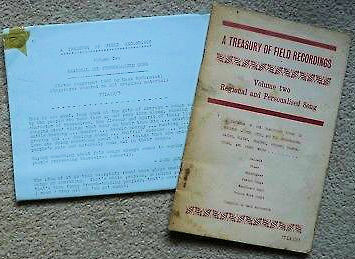 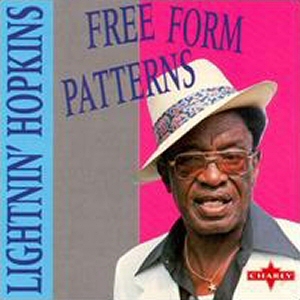 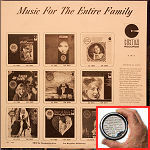 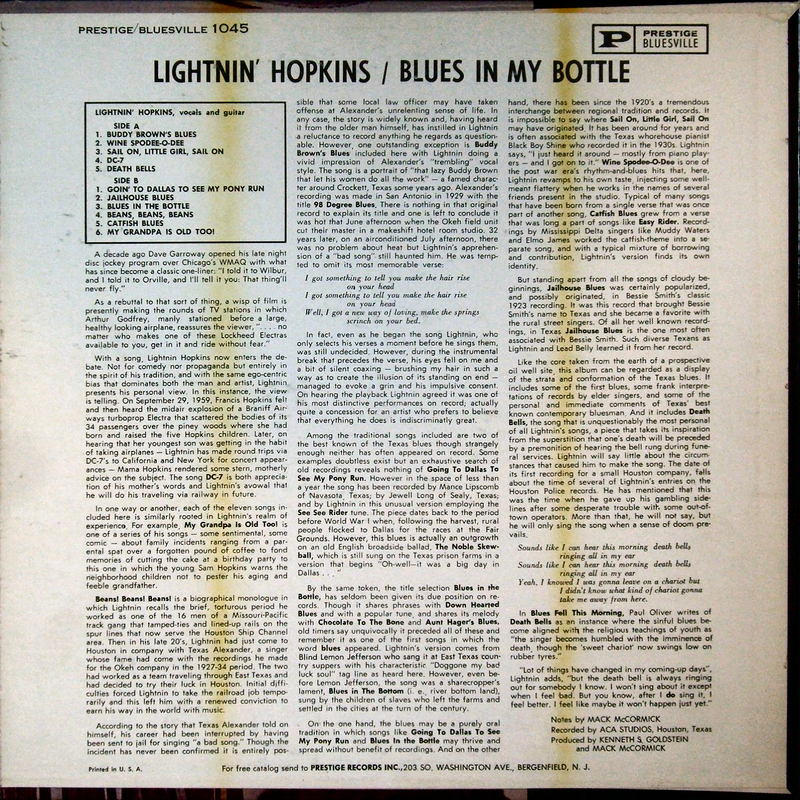 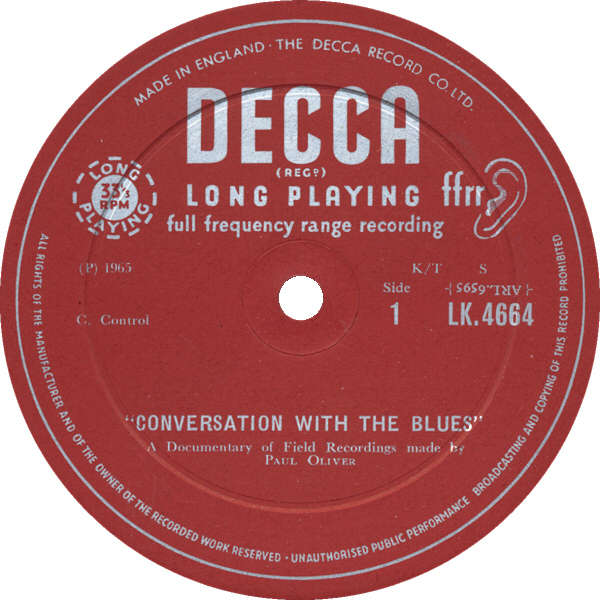 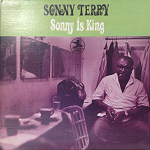 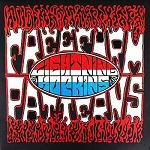 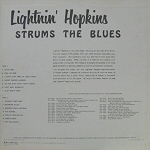 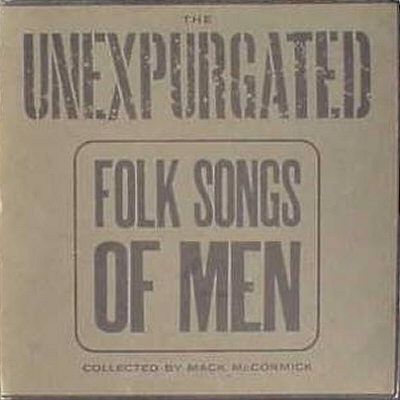 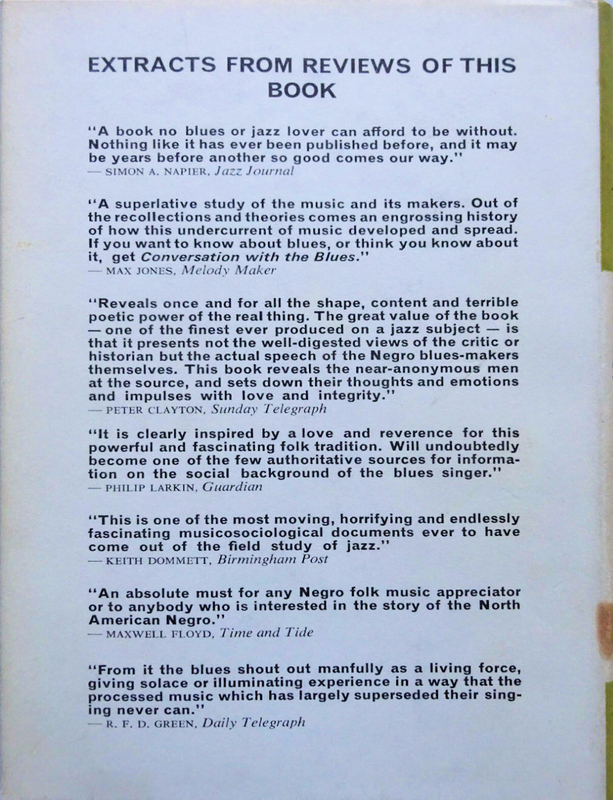 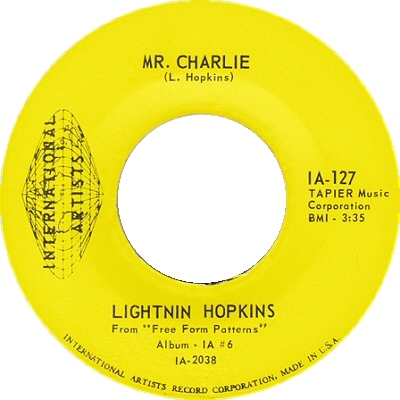 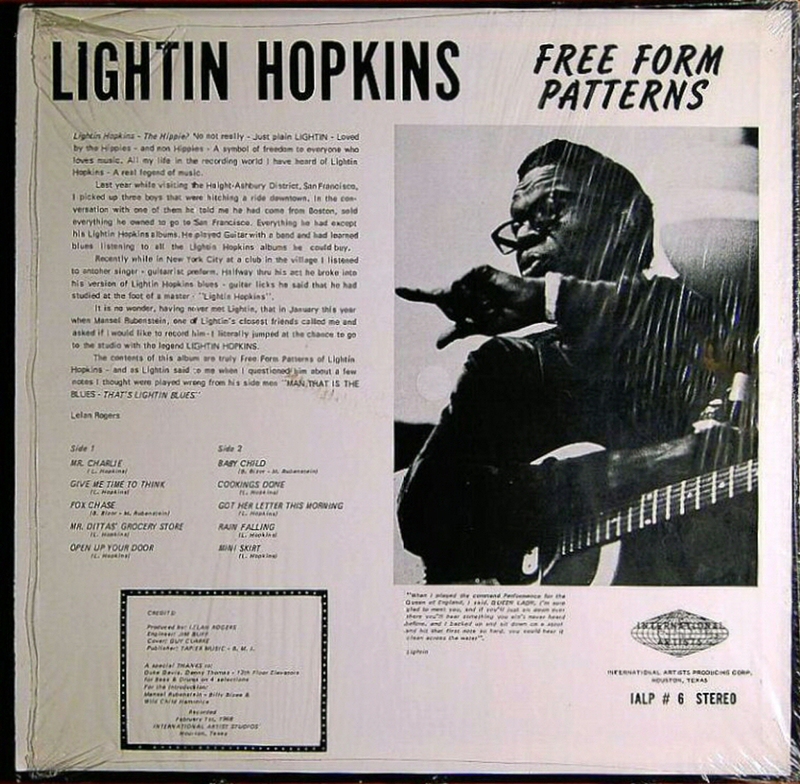 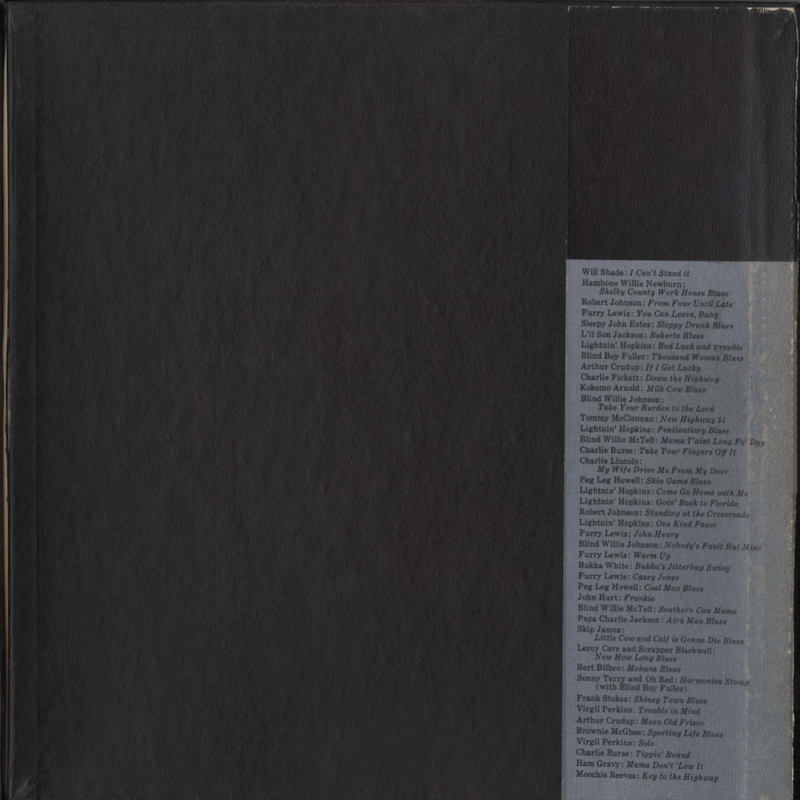 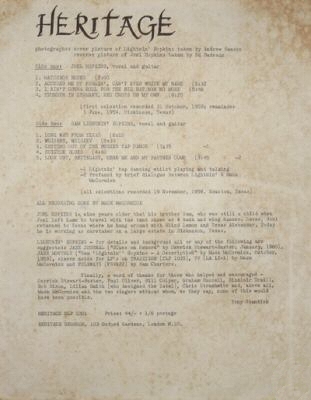 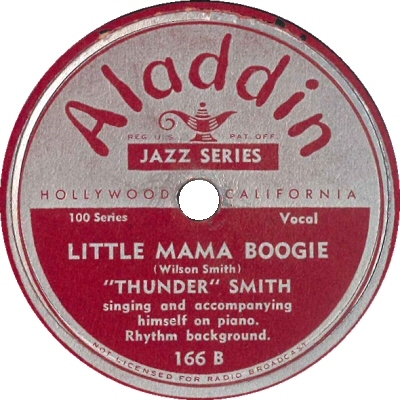 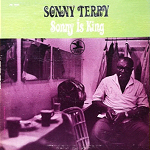 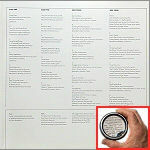 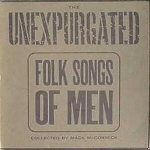 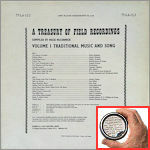 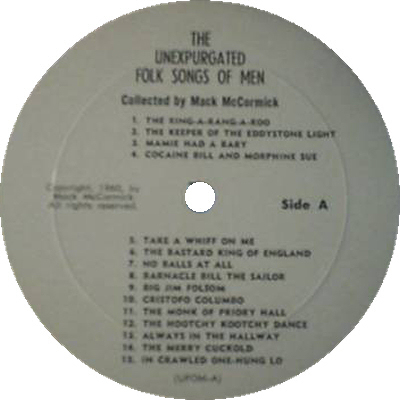 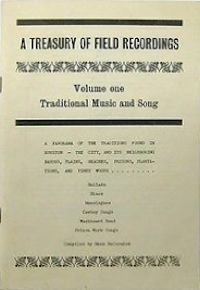 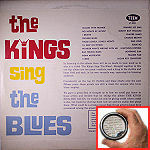 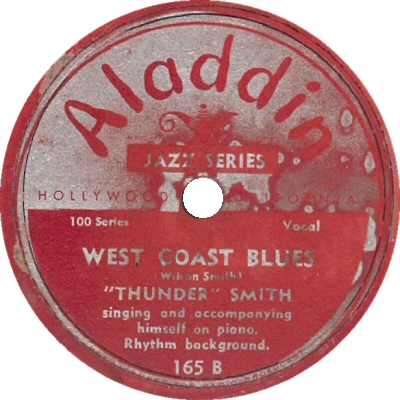 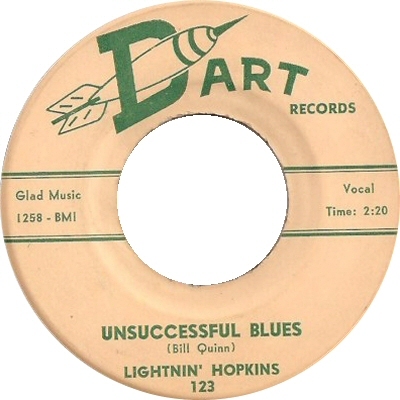 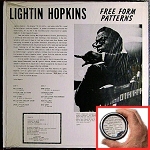 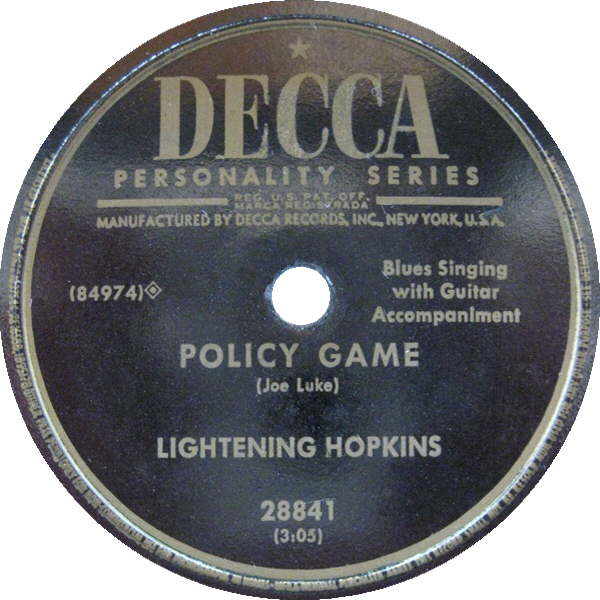 The contents of this album are truly Free Form Patterns of Lightin Hopkins - and as Lightin said to me when I questioned him about a few notes I thought were played wrong from his side men "MAN THAT IS THE BLUES - THAT'S LIGHTIN BLUES"
"When I played the command Performance for the Queen of England. 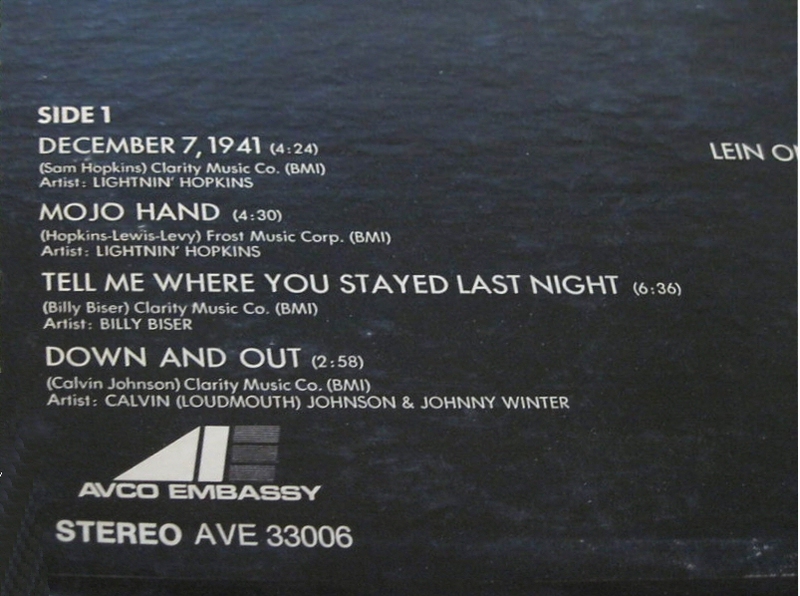 I said, QUEEN LADY, I'm sure glad to meet you. 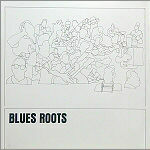 and if you'll just sit down over there you'll hear something you ain't never heard before. 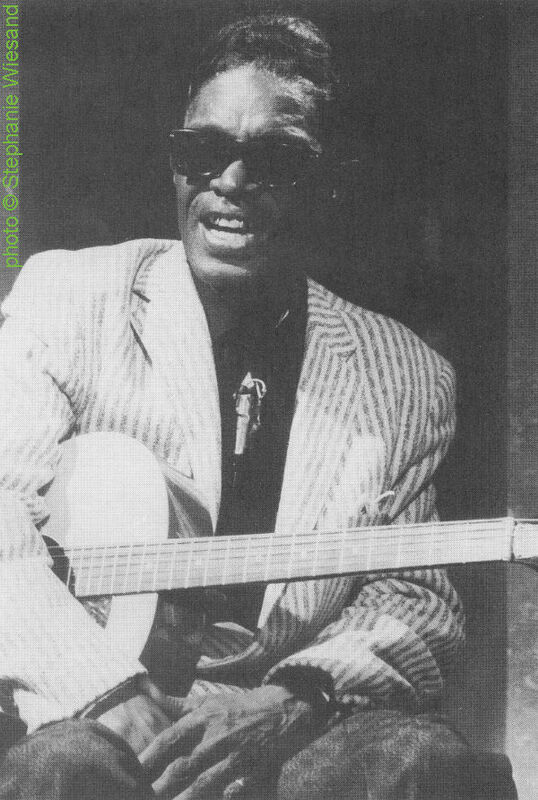 and I backed up and sit down on a stool and hit that first note so hard, you could hear it clean across the water". 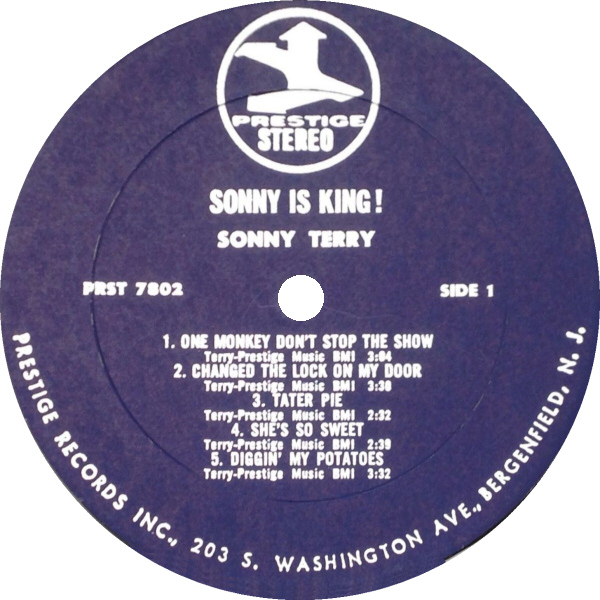 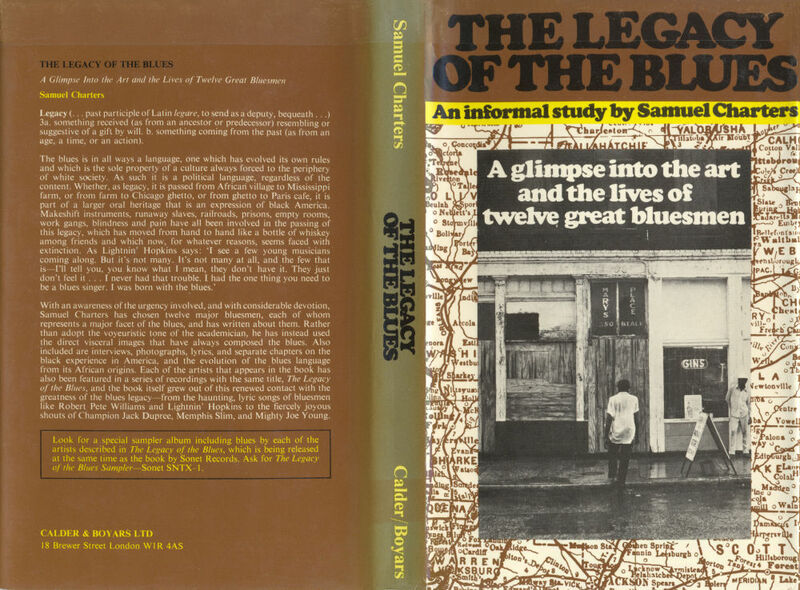 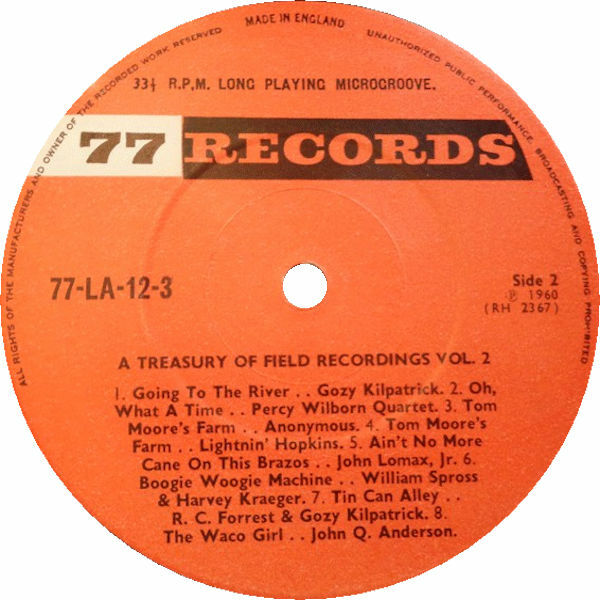 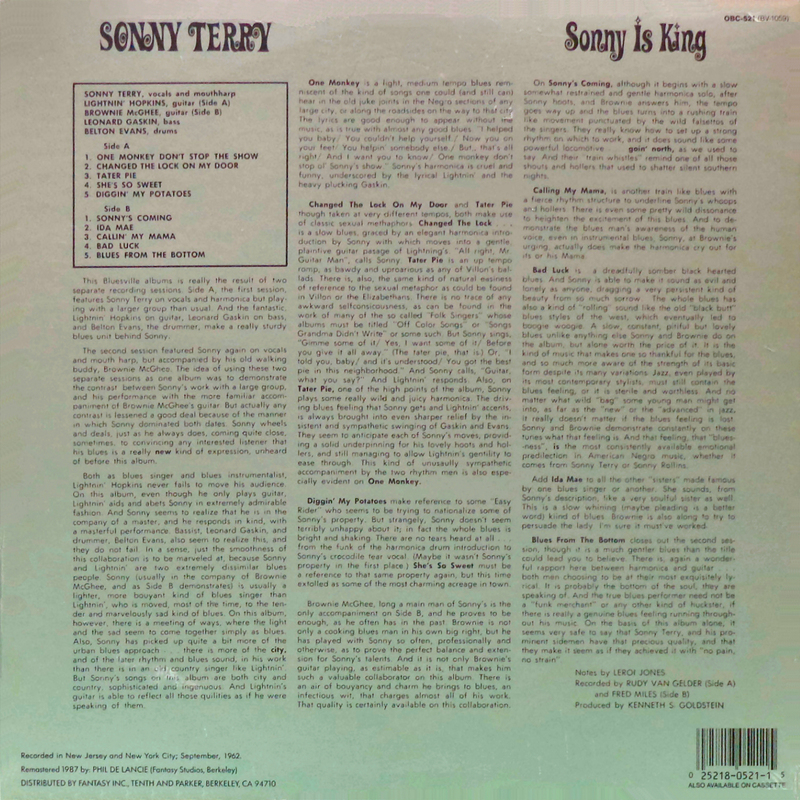 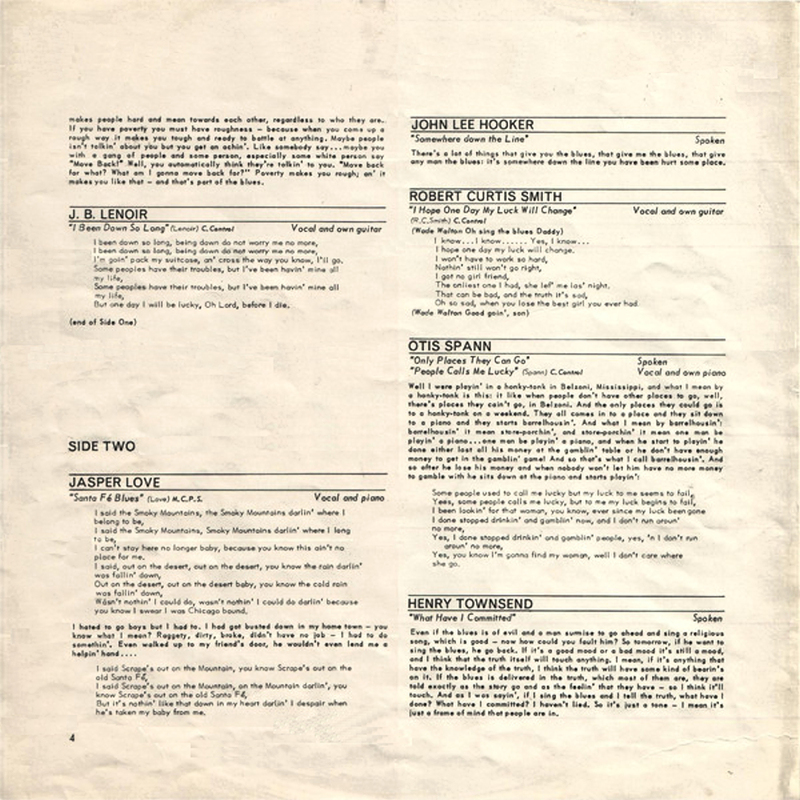 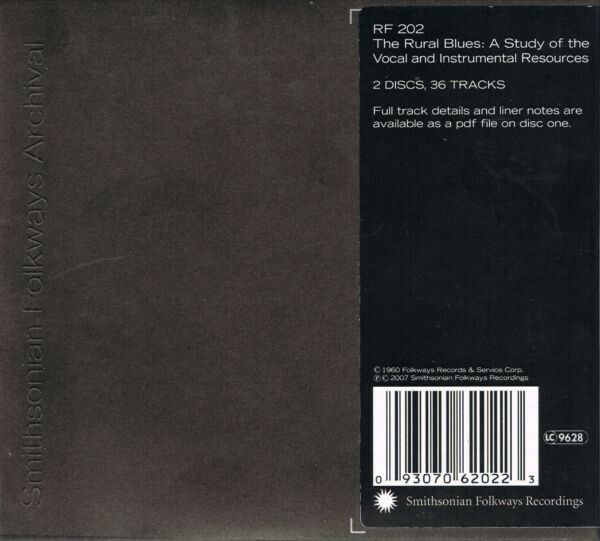 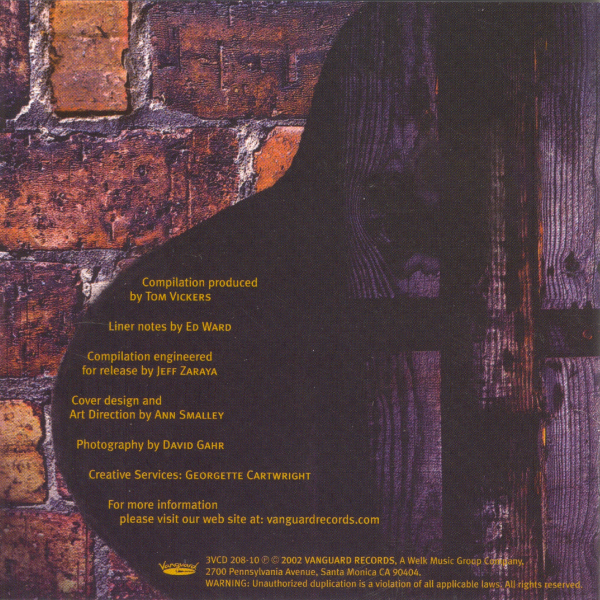 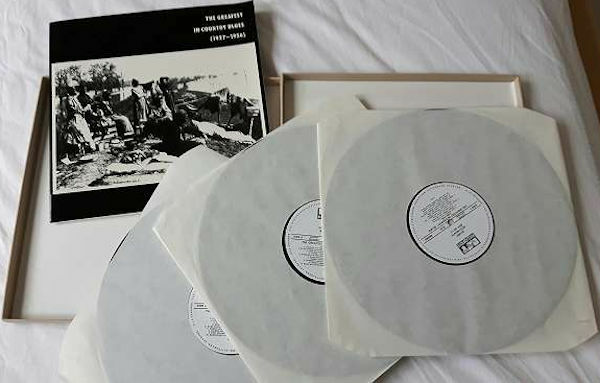 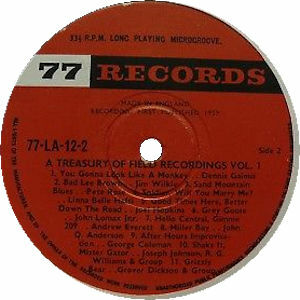 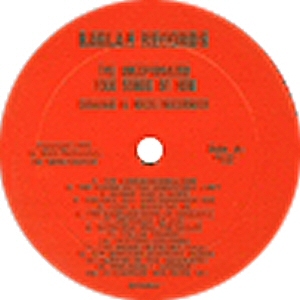 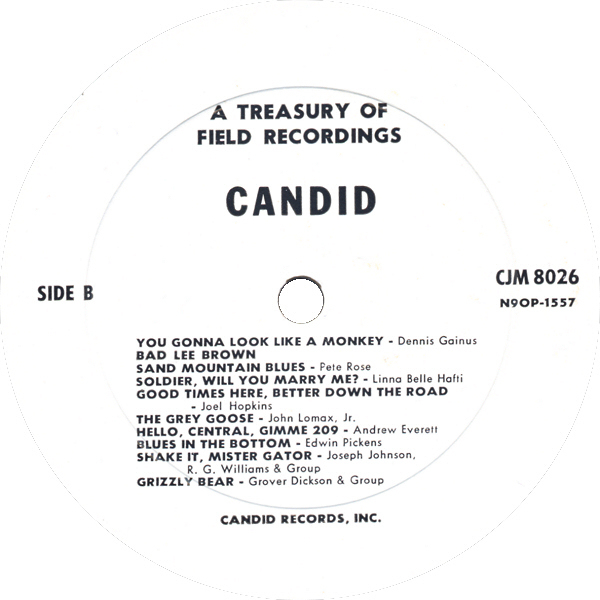 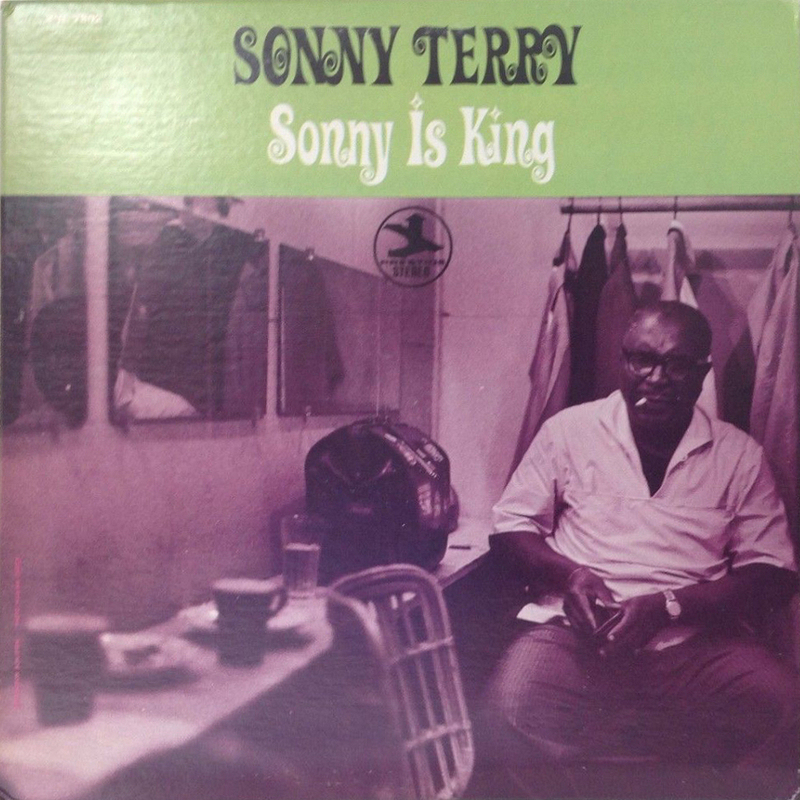 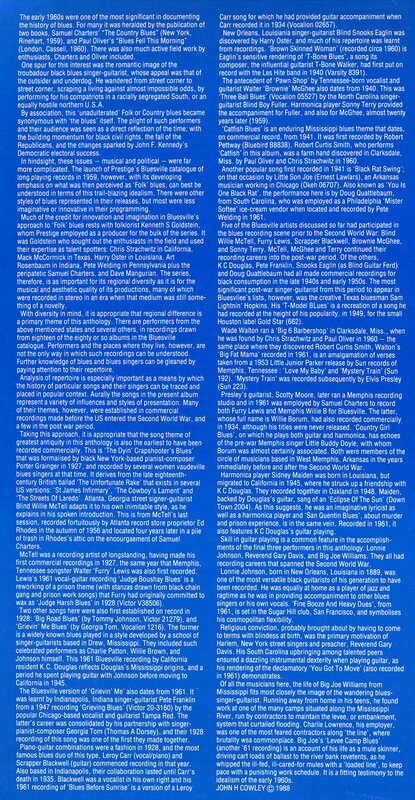 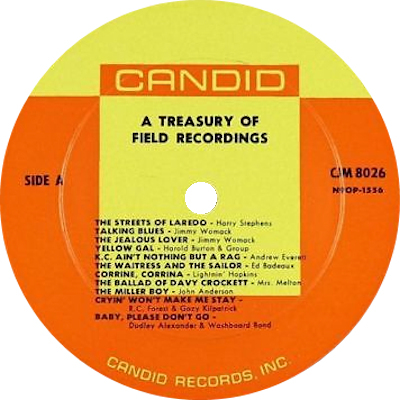 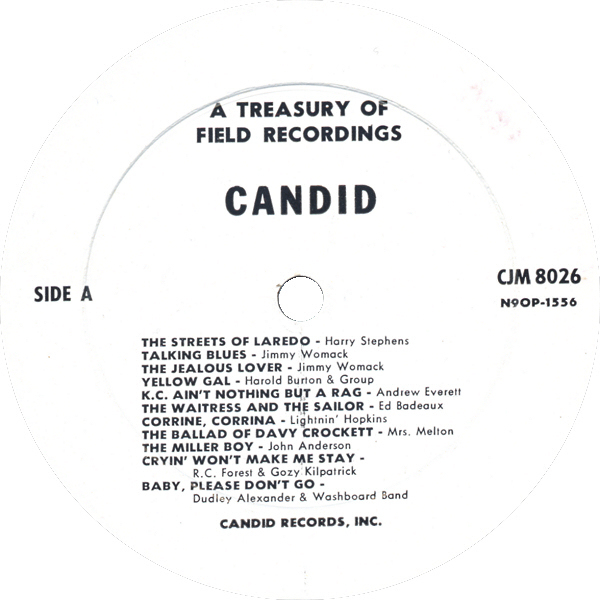 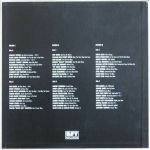 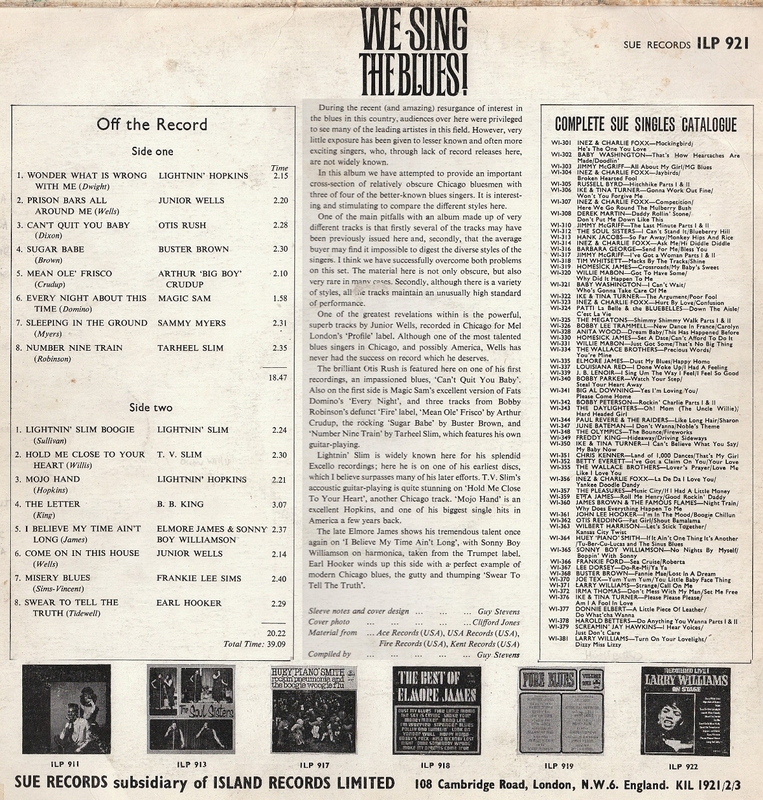 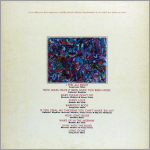 (=) Westside WESD 228 (UK 2001) "Fishing Clothes: The Jewel Recordings 1965-69"
(=)Sonet 986 925-8 (EU 2005) "The Sonet Blues Story"
(=) Sonet SNTCD 1 (1989) "The Legacy Of The Blues Maxi Sampler"
= Tradition/Rykodisc TCD 1014 (1996) "Big Joe Williams & Friends: Have Mercy!" 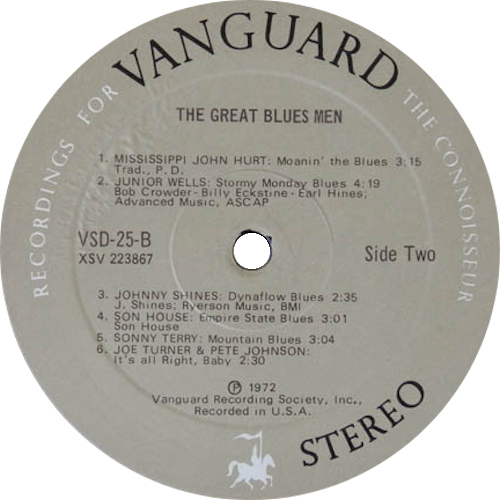 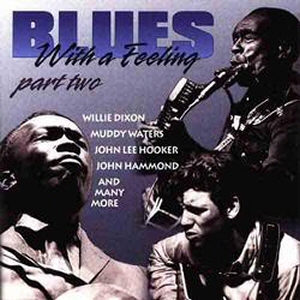 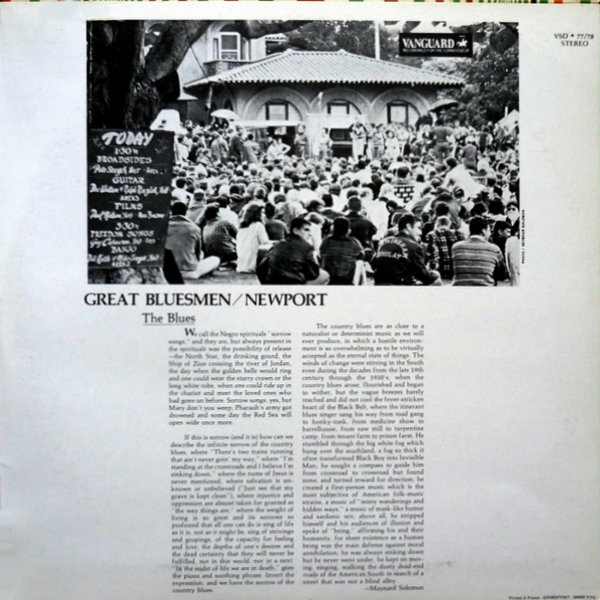 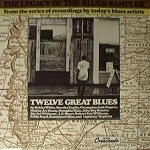 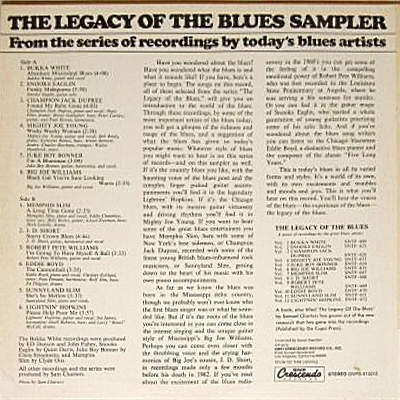 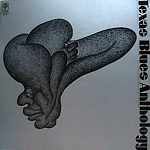 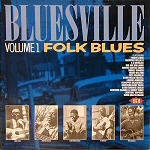 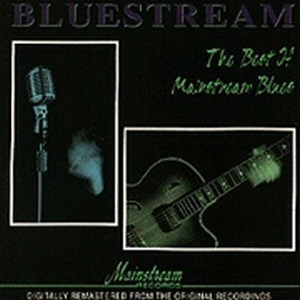 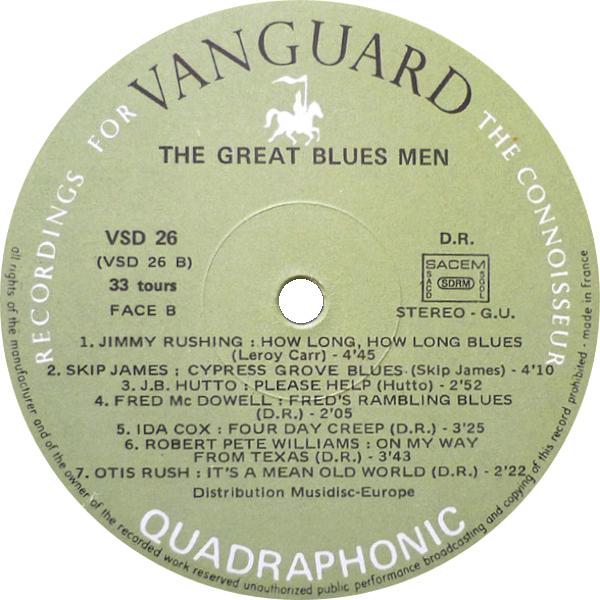 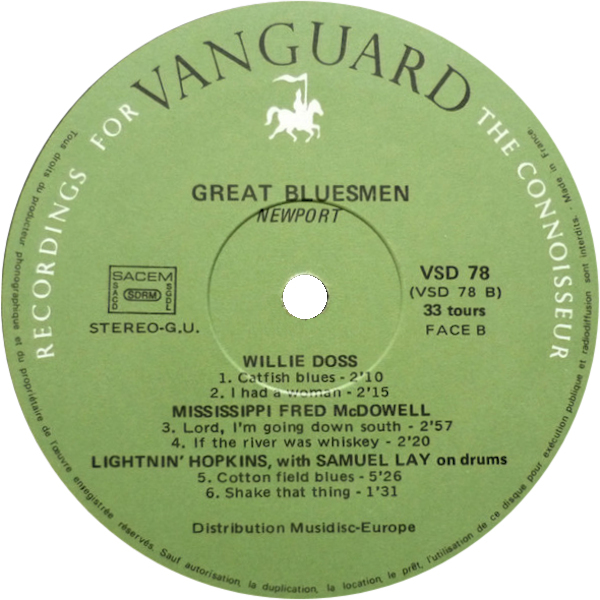 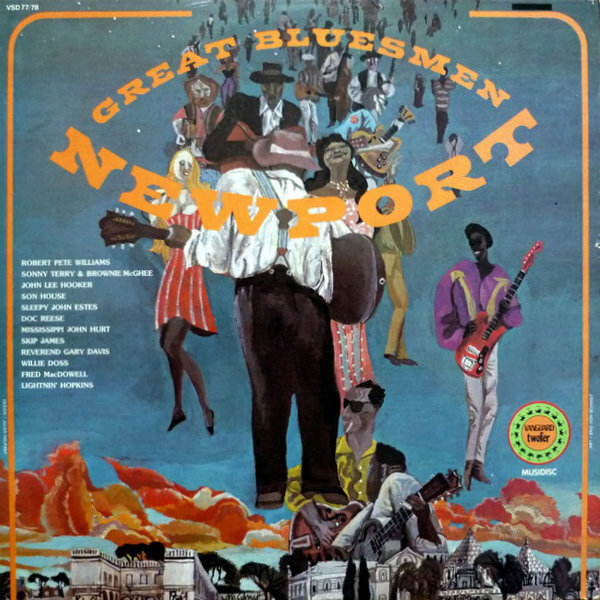 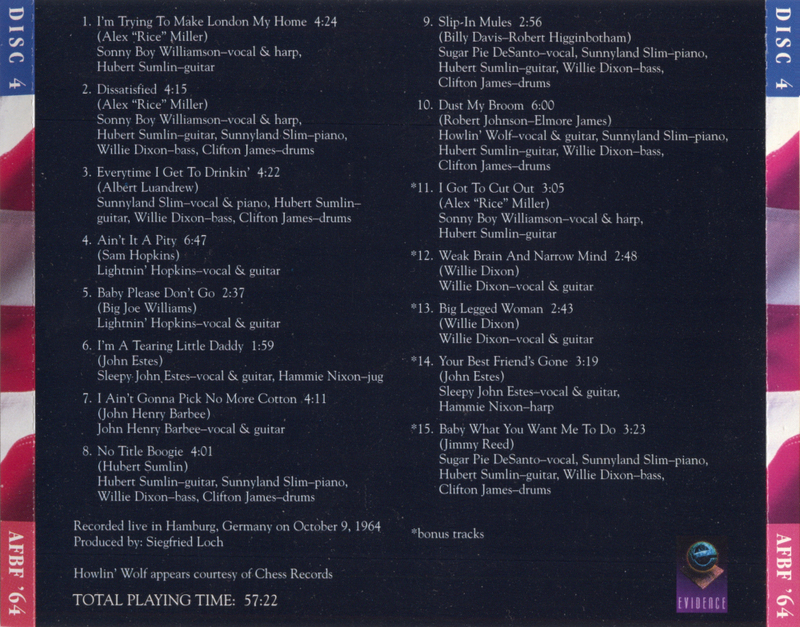 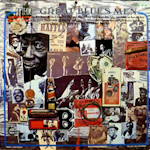 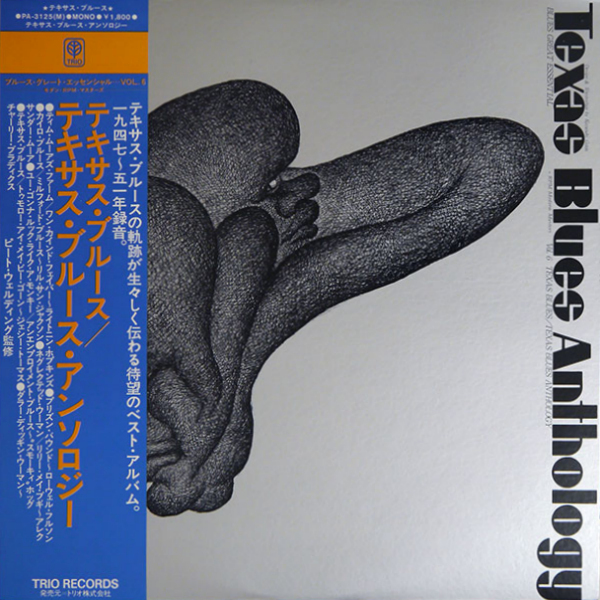 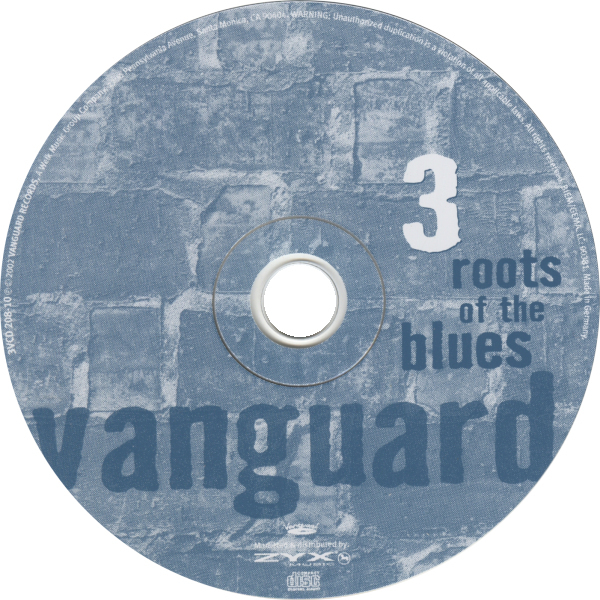 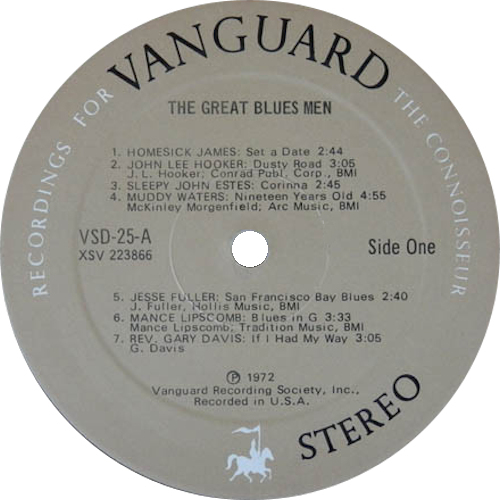 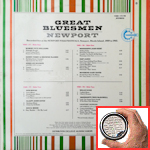 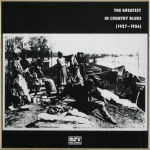 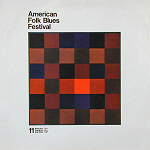 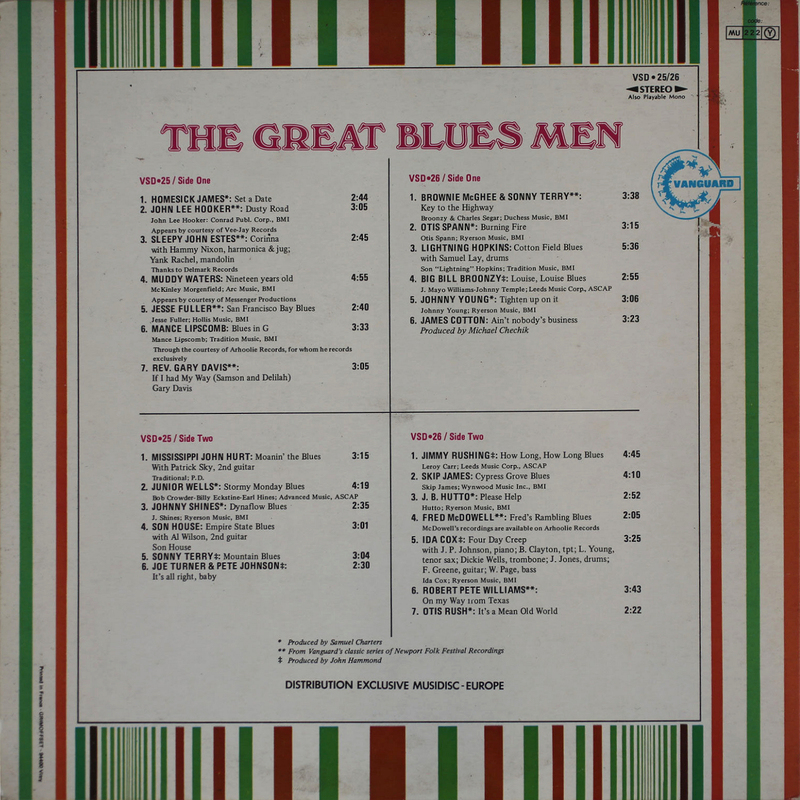 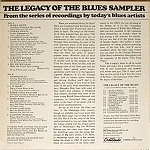 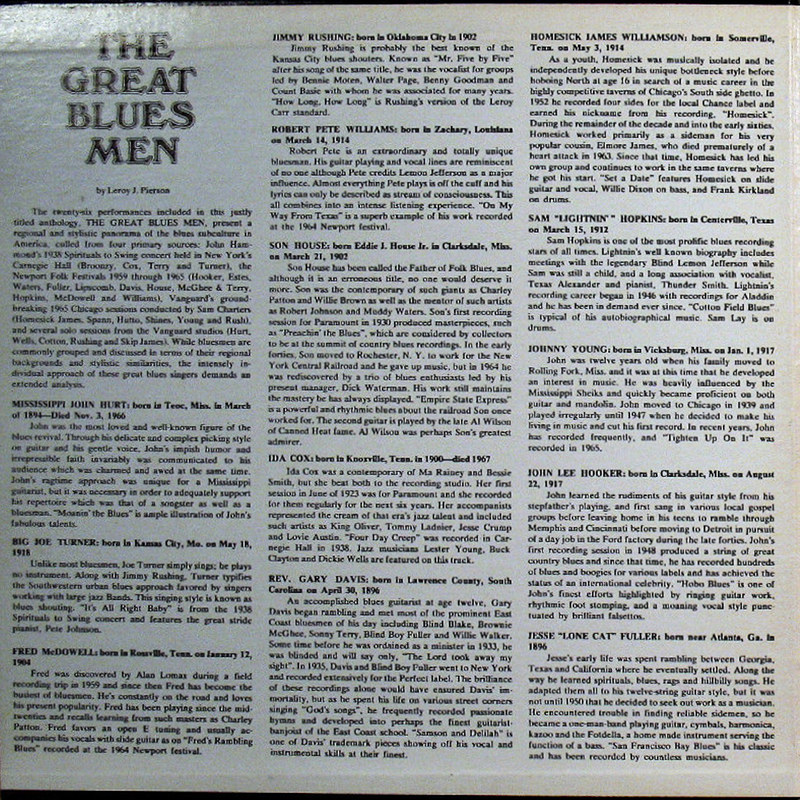 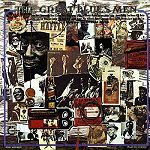 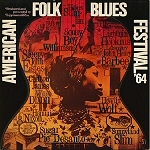 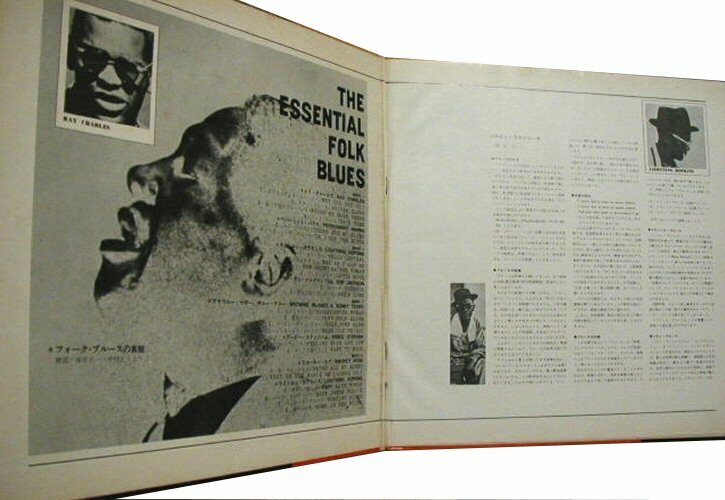 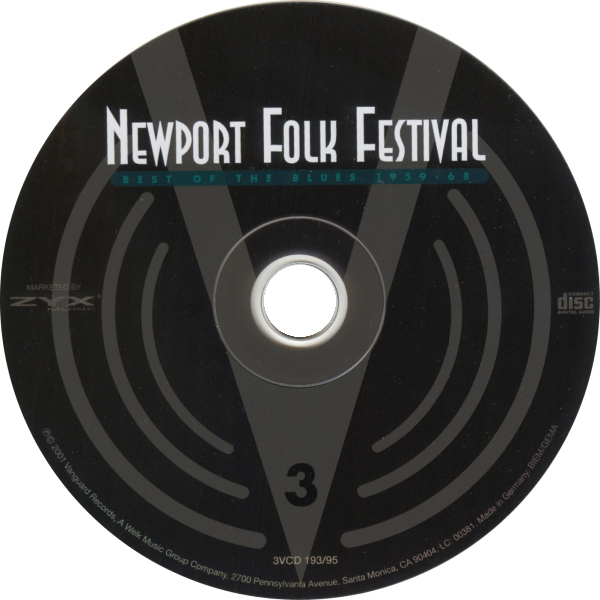 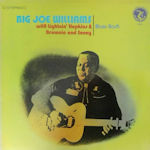 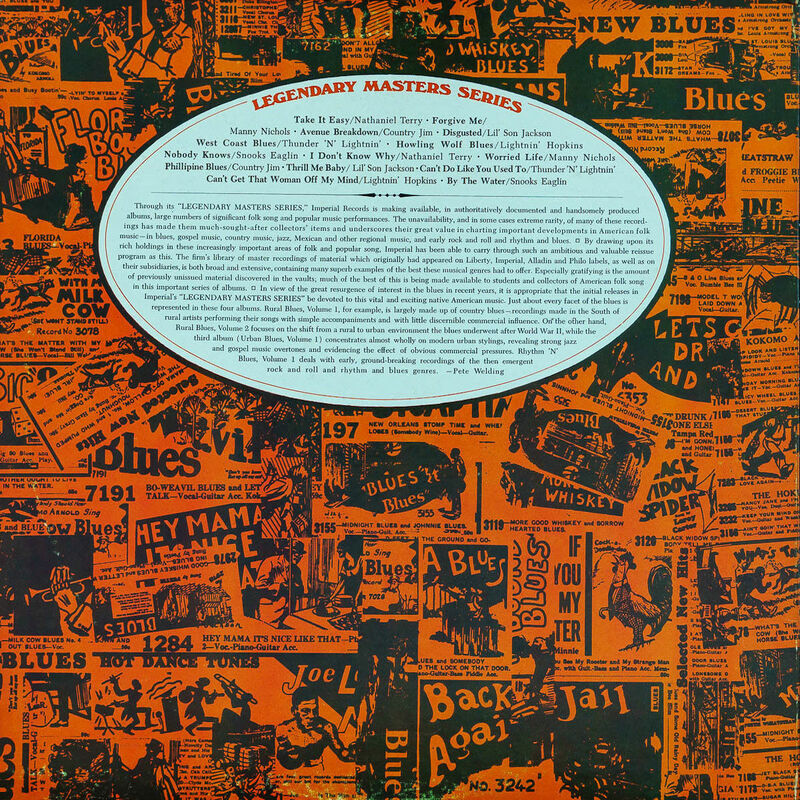 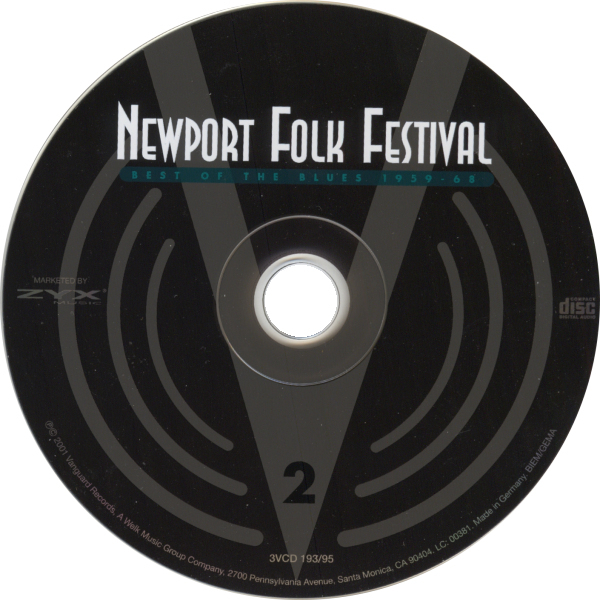 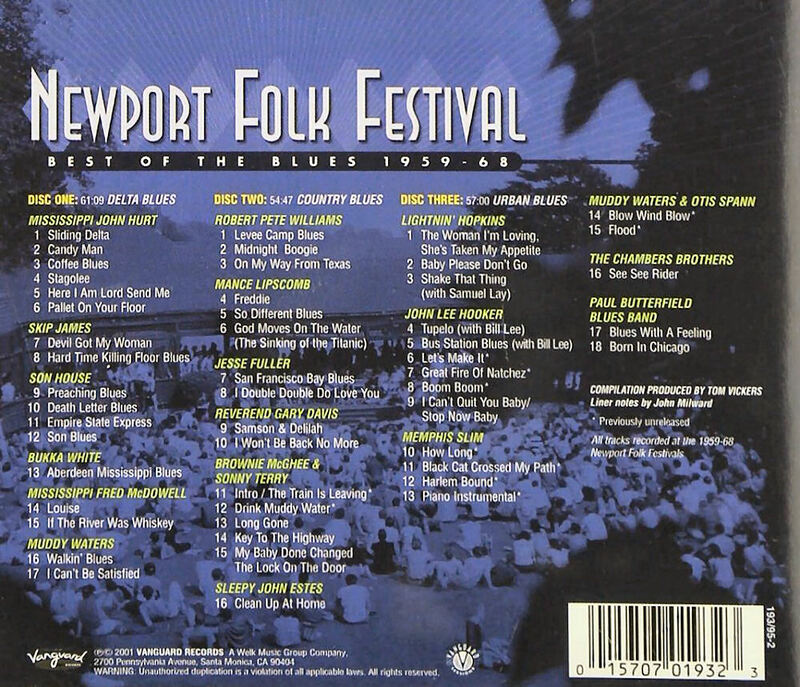 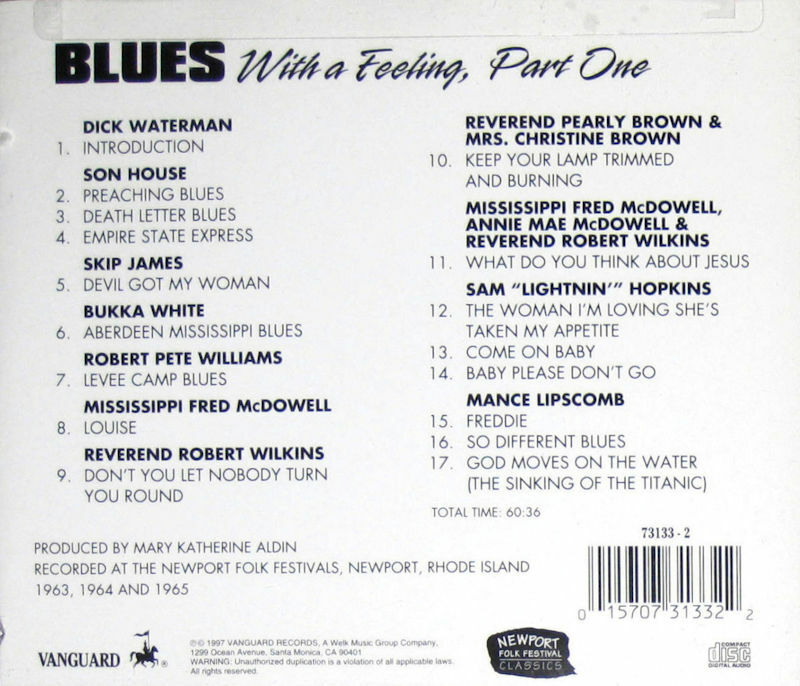 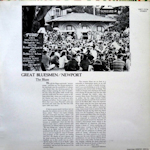 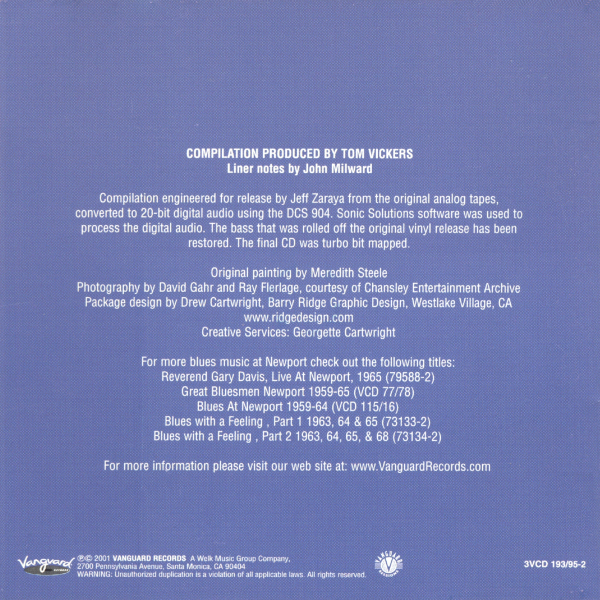 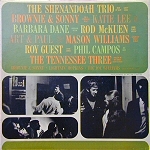 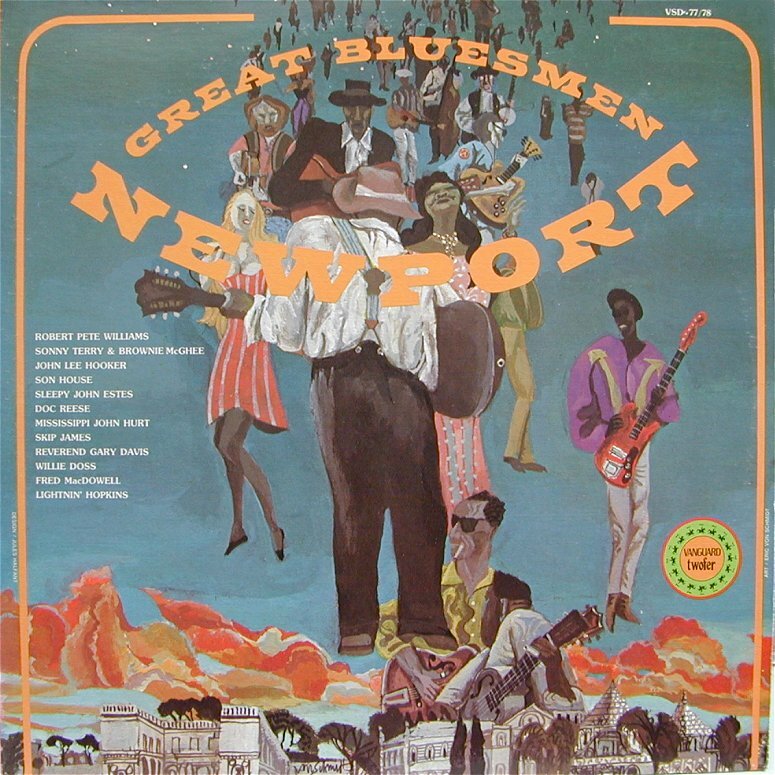 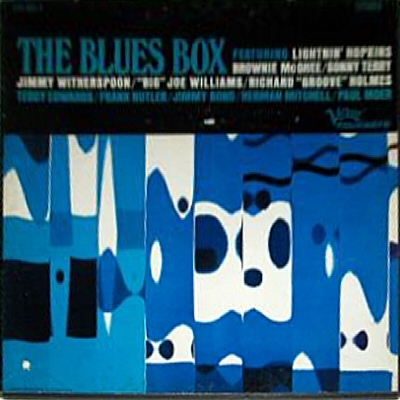 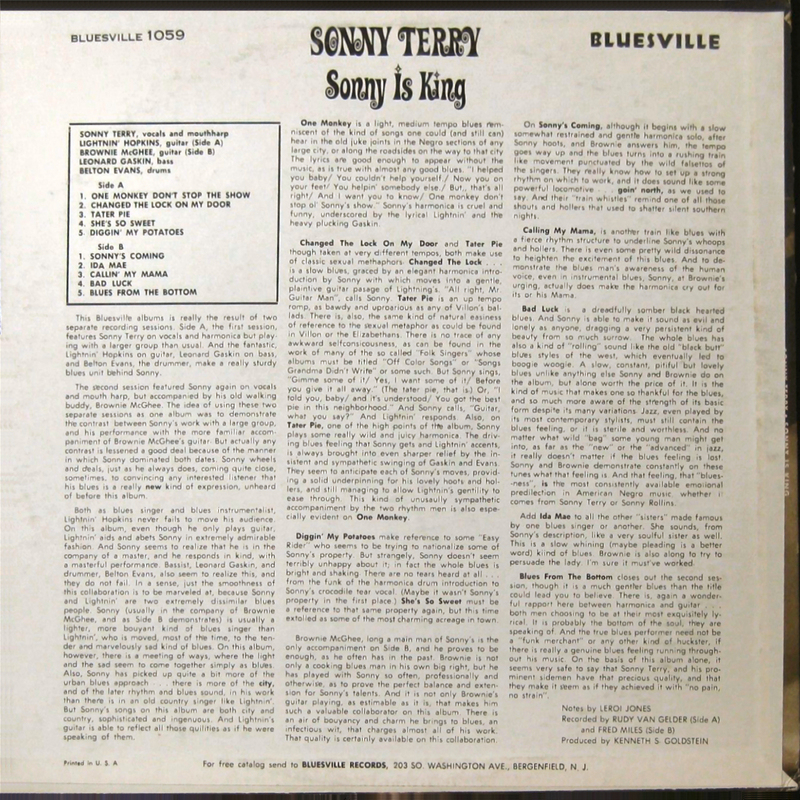 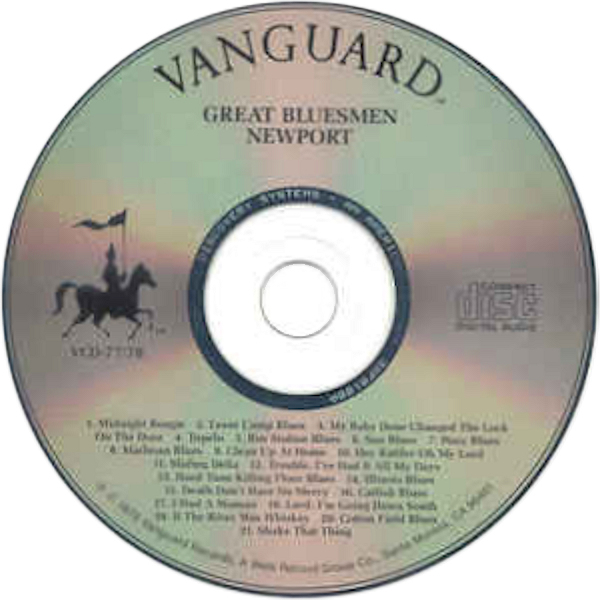 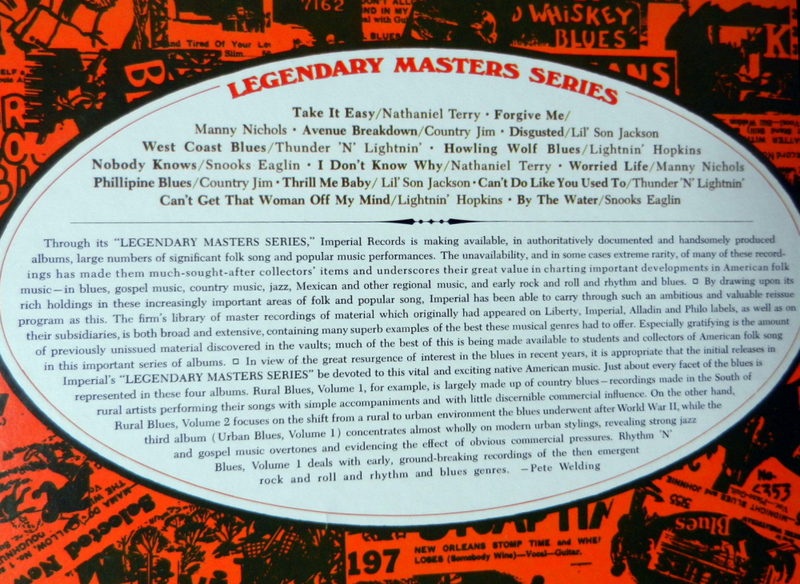 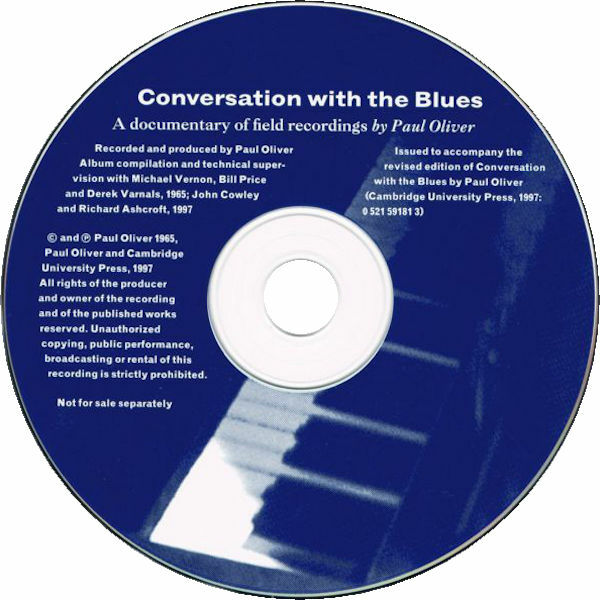 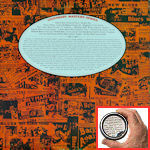 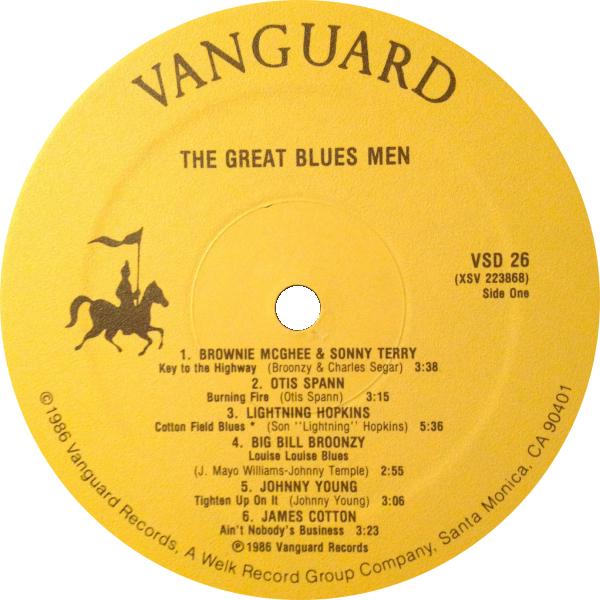 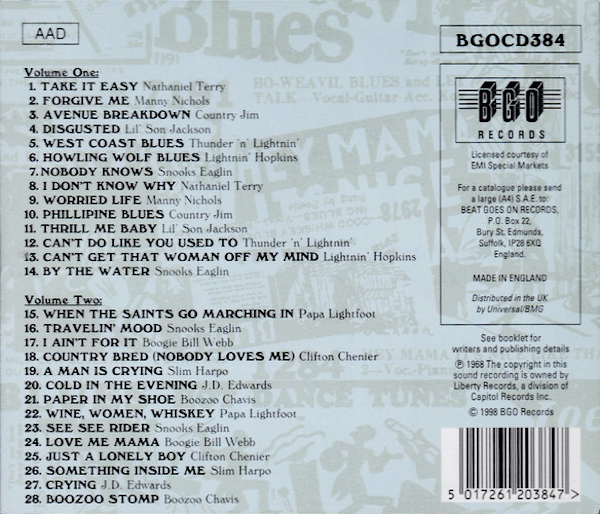 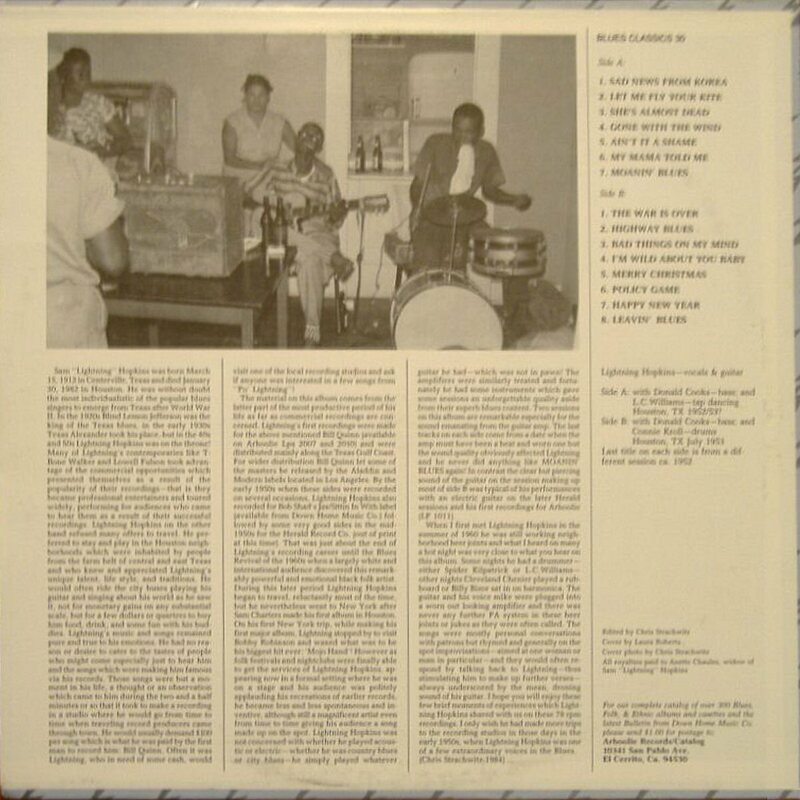 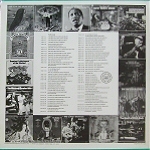 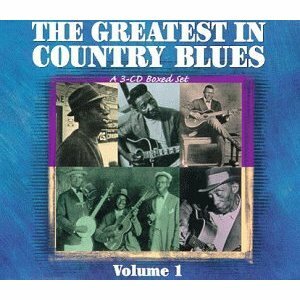 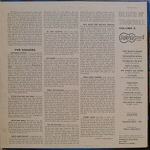 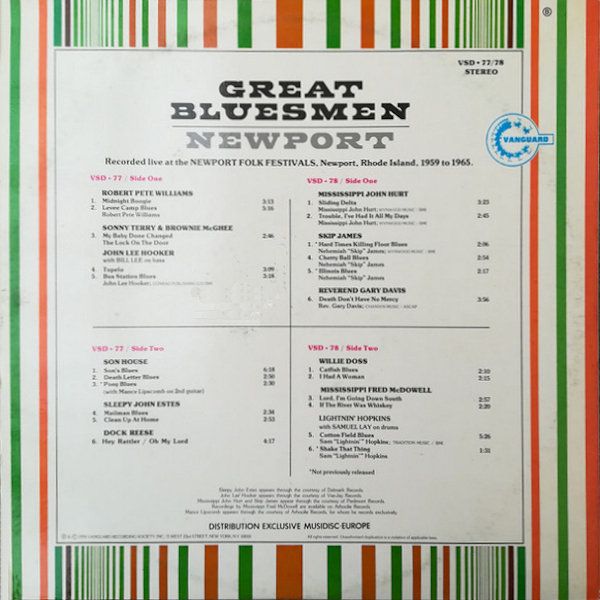 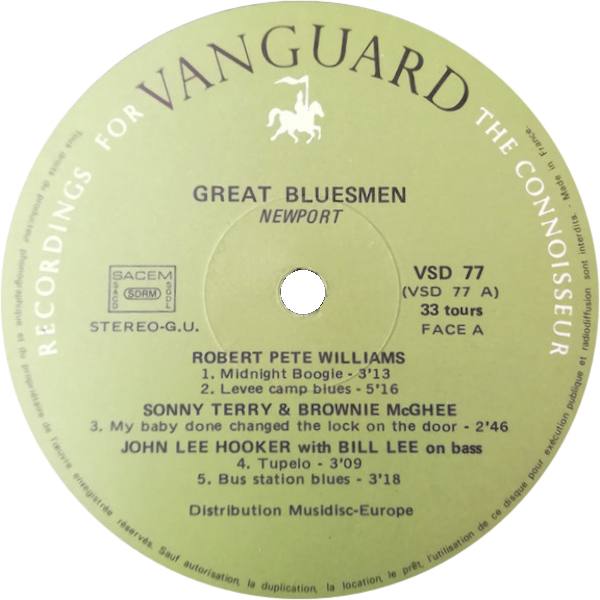 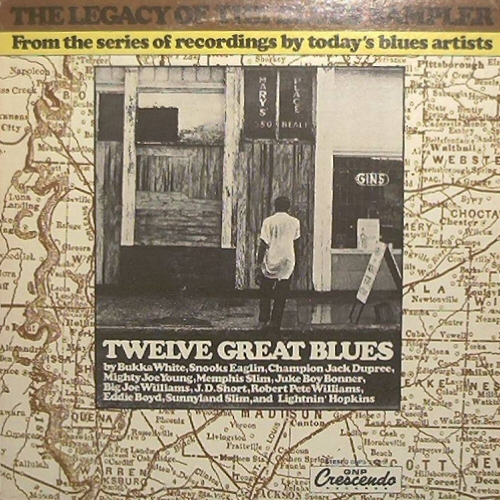 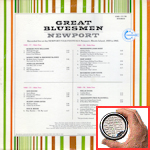 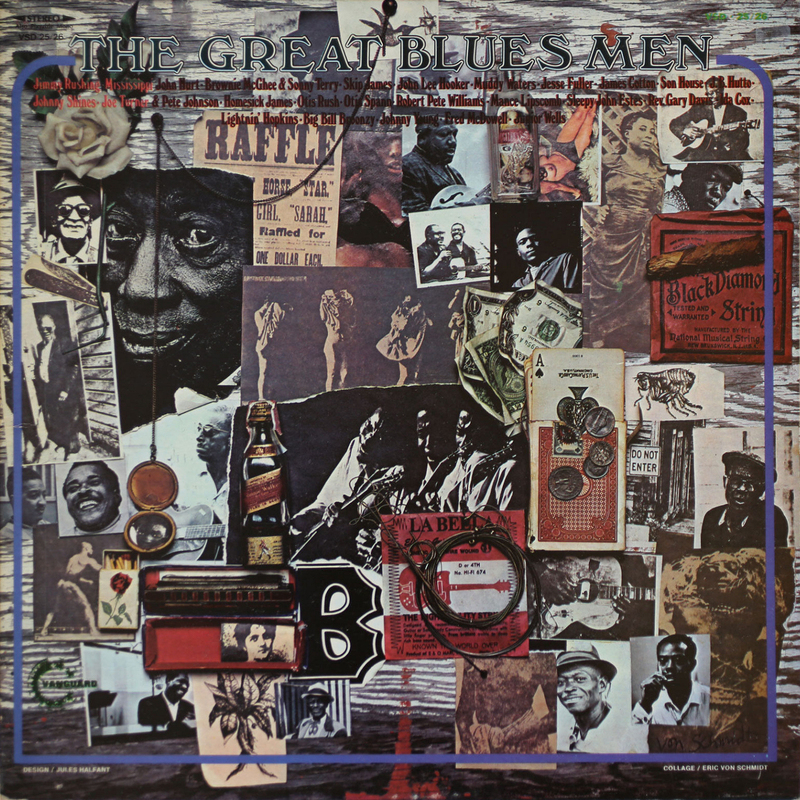 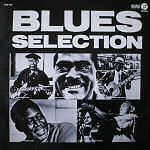 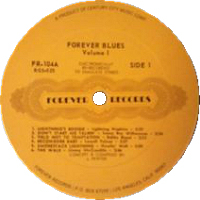 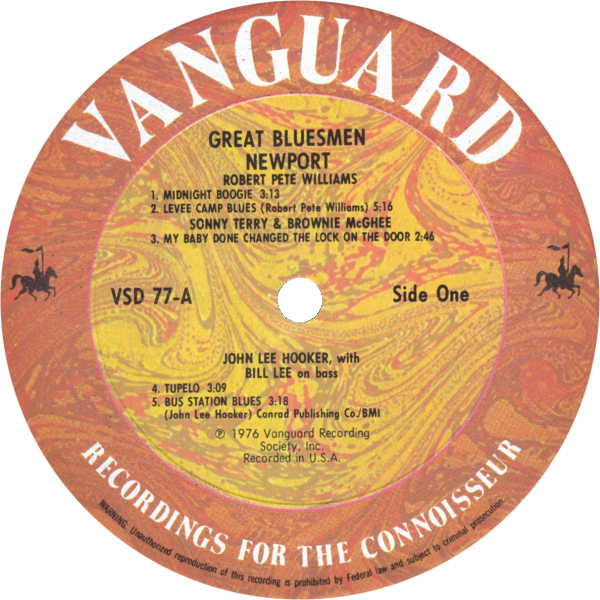 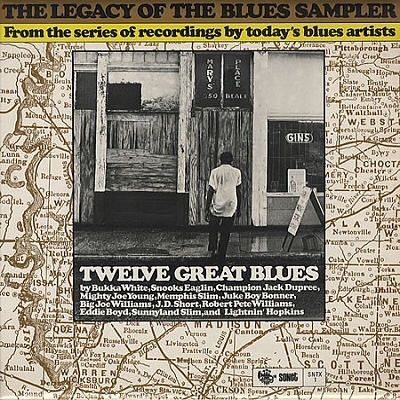 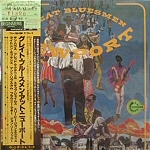 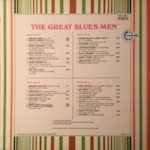 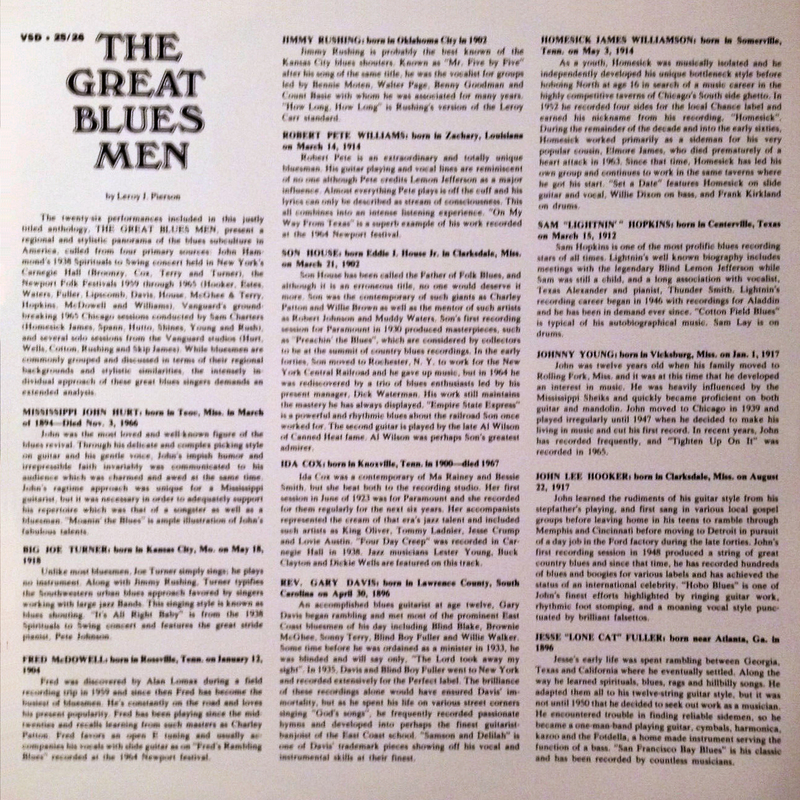 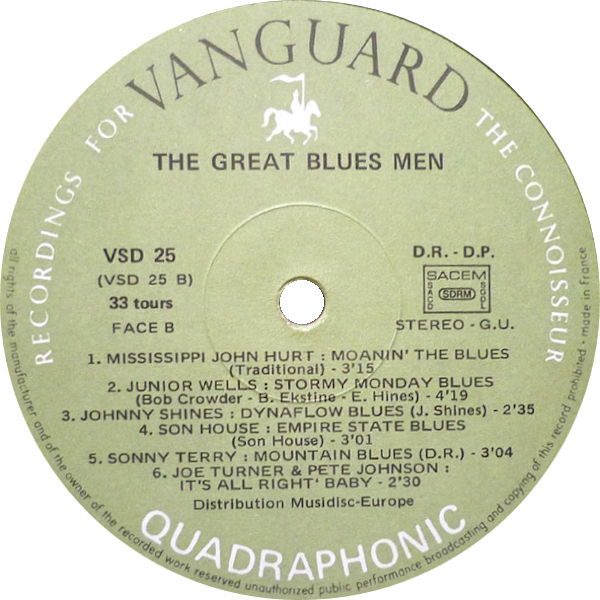 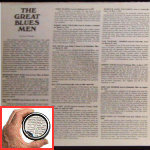 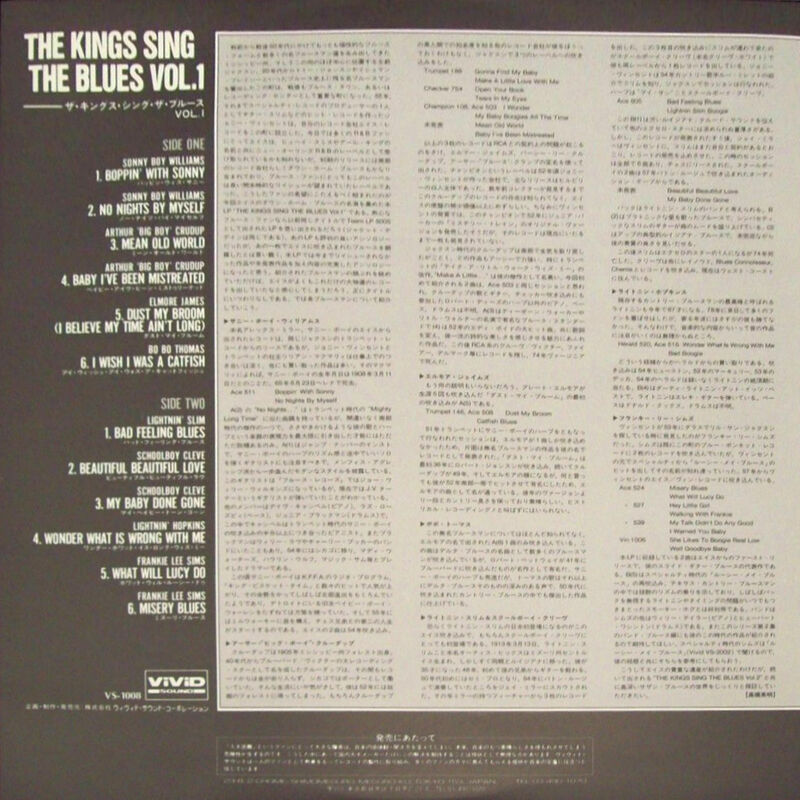 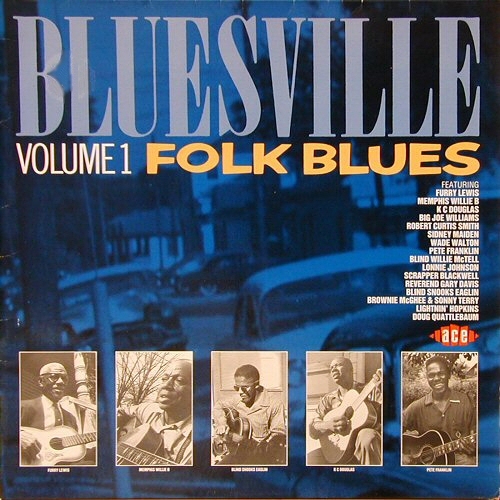 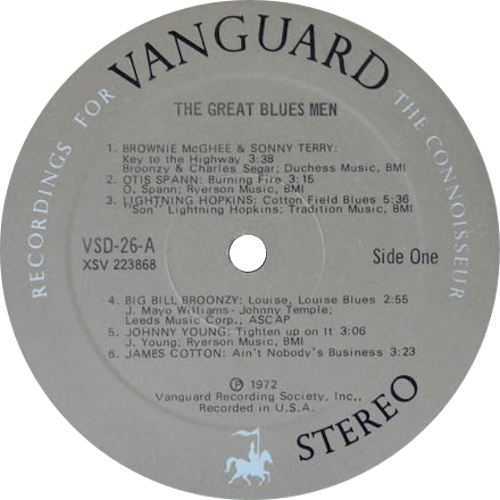 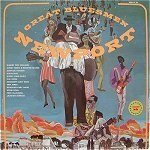 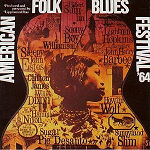 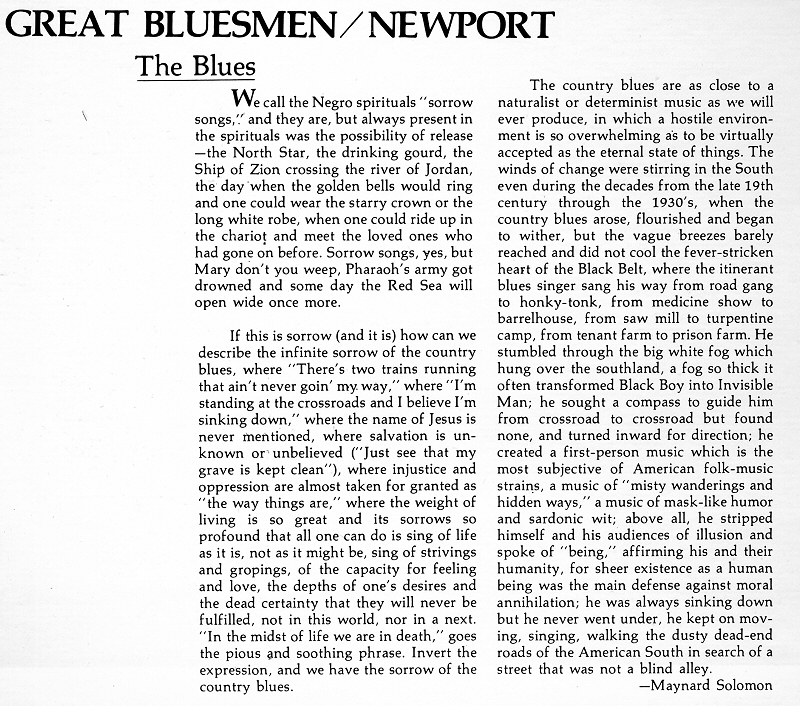 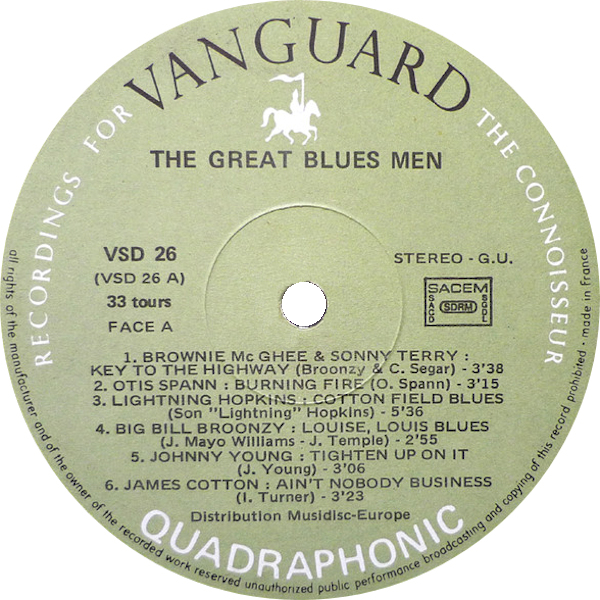 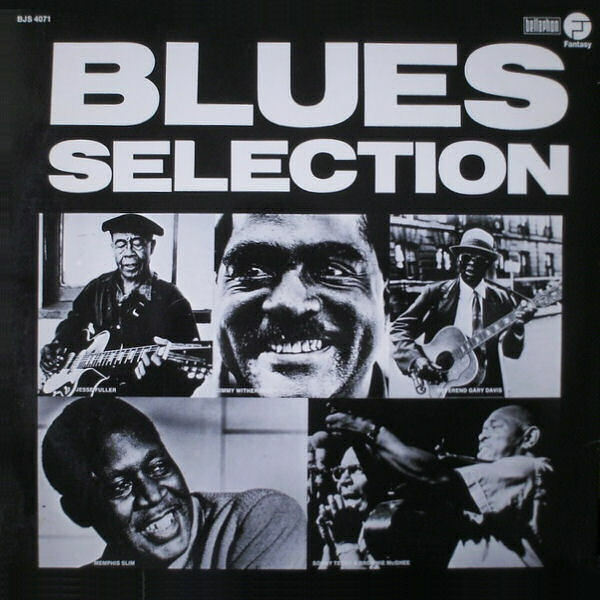 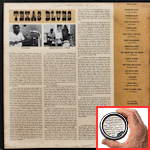 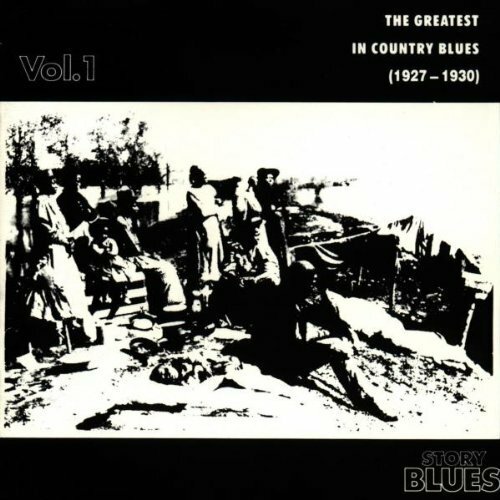 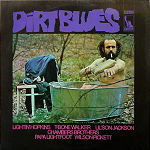 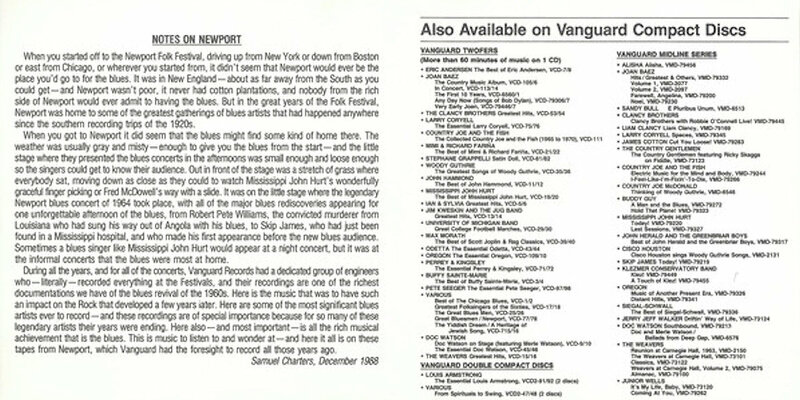 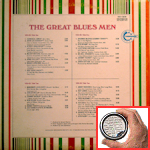 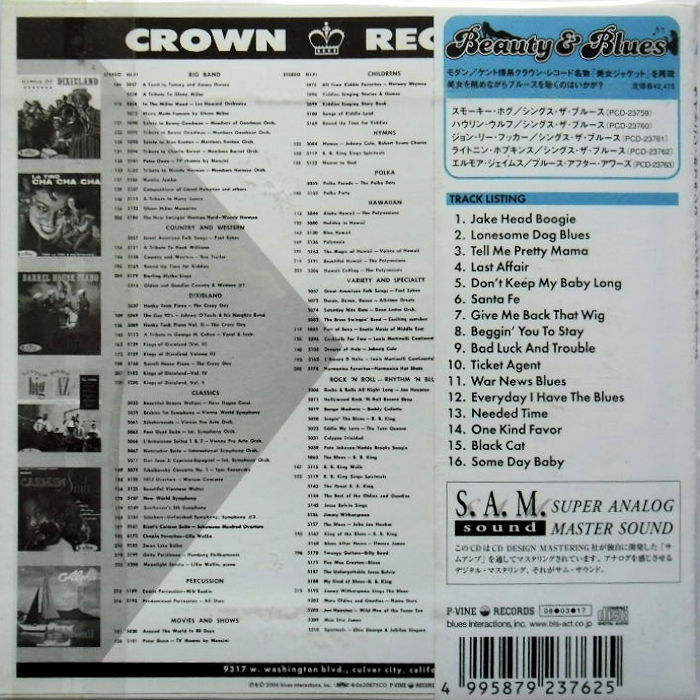 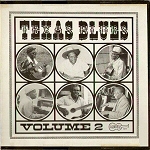 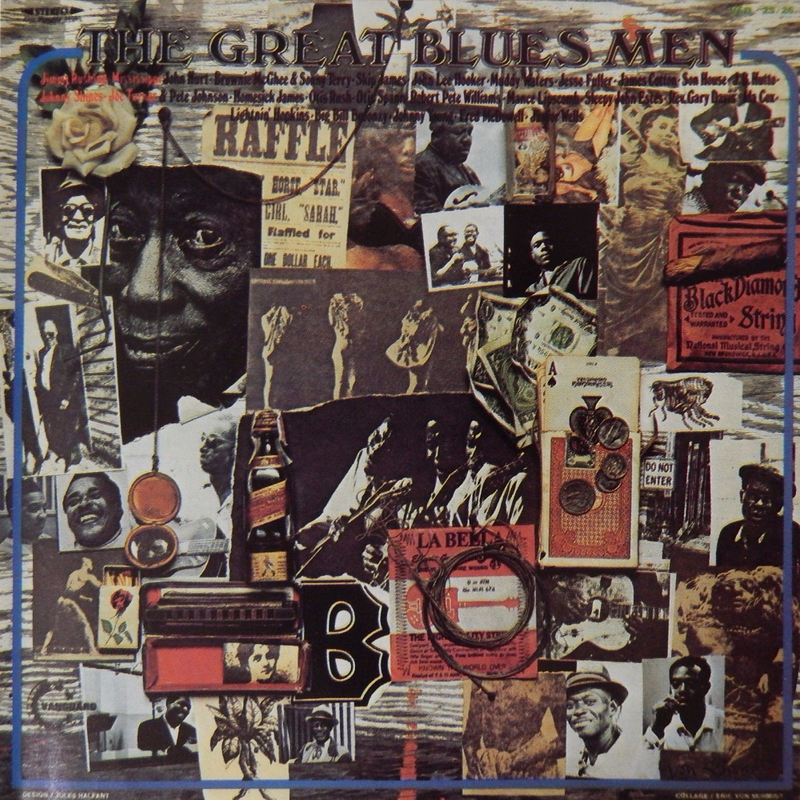 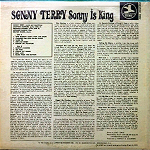 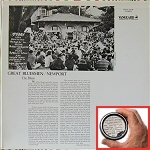 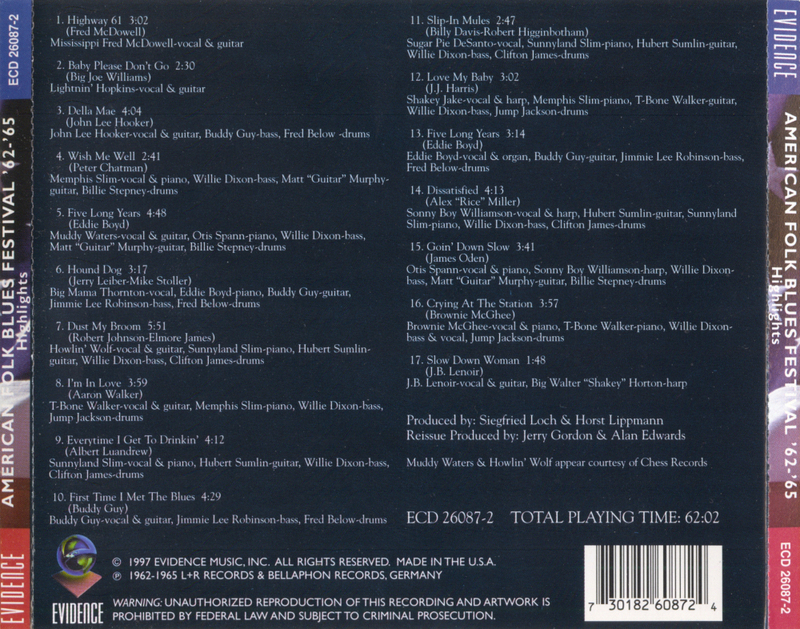 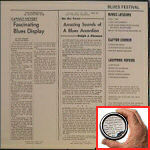 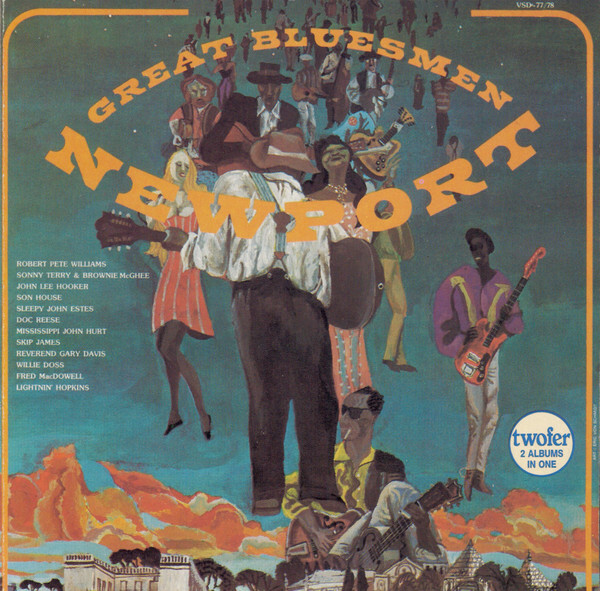 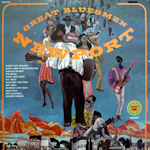 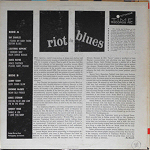 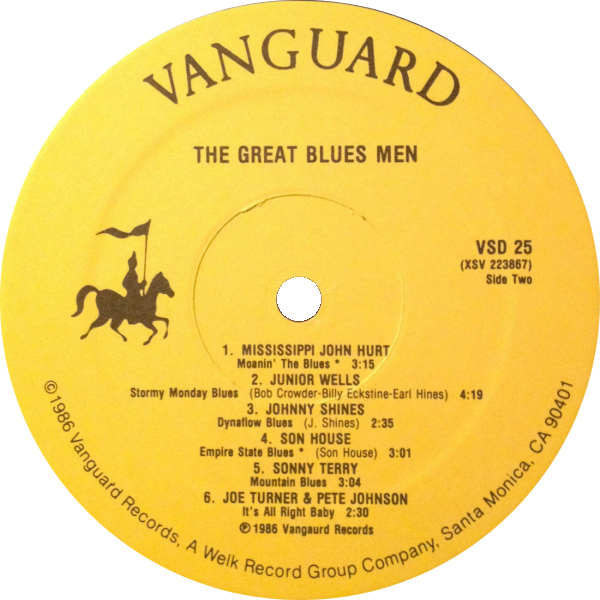 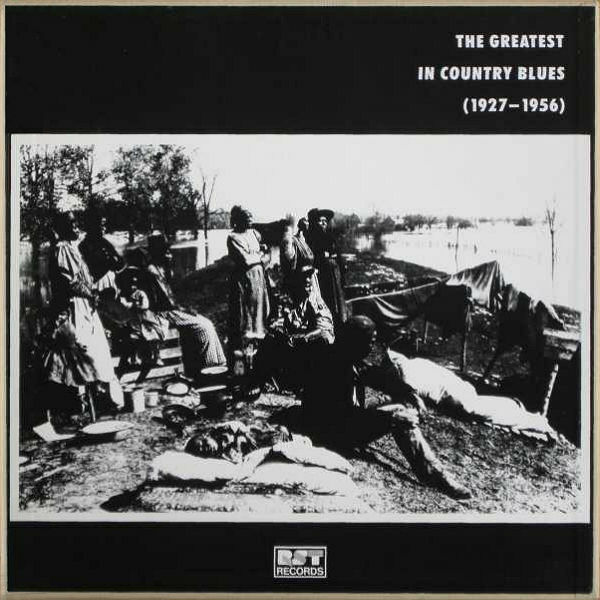 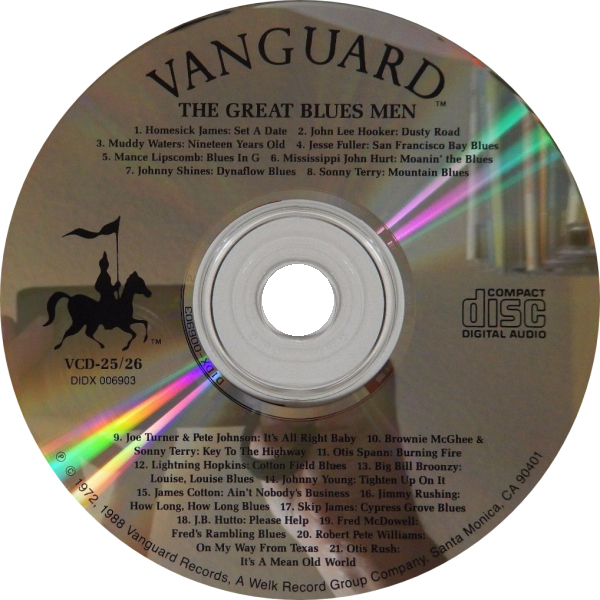 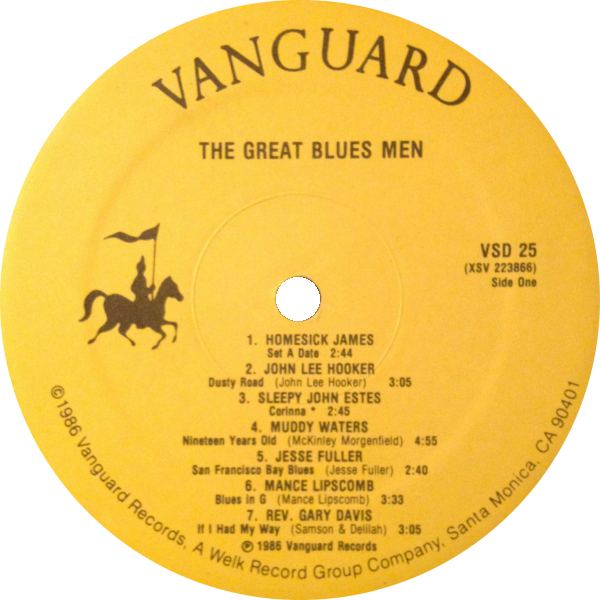 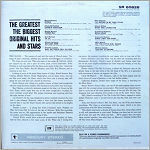 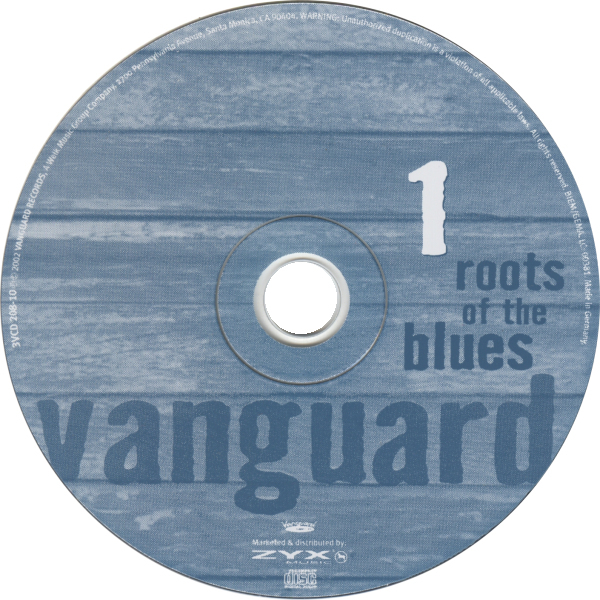 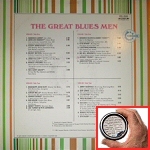 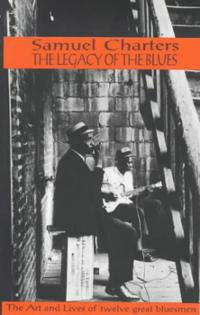 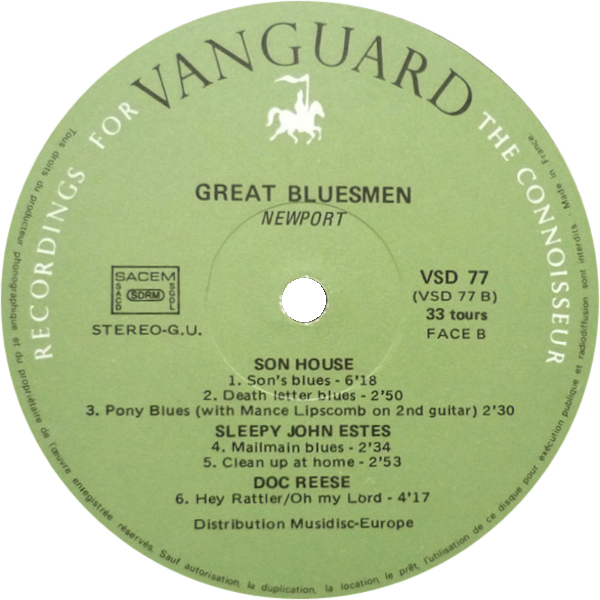 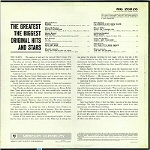 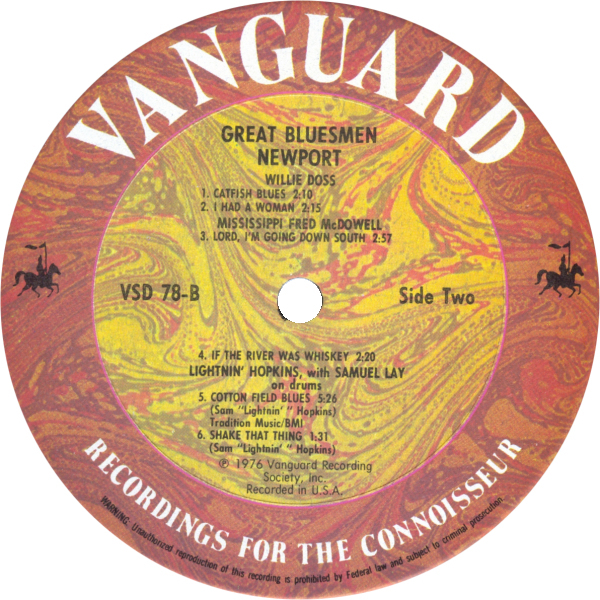 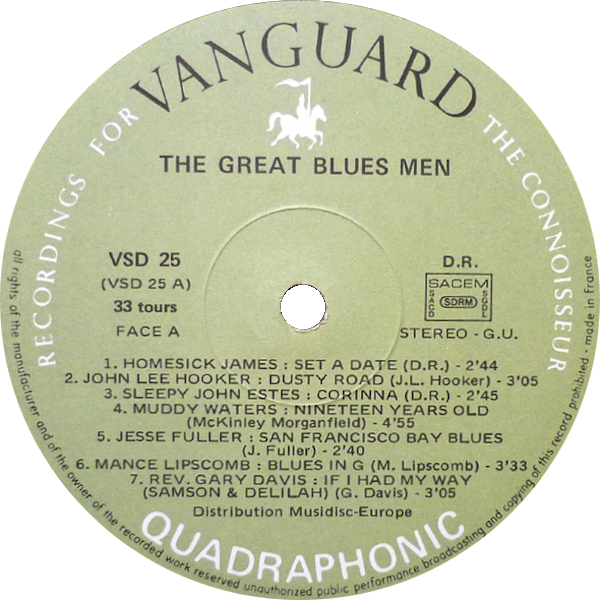 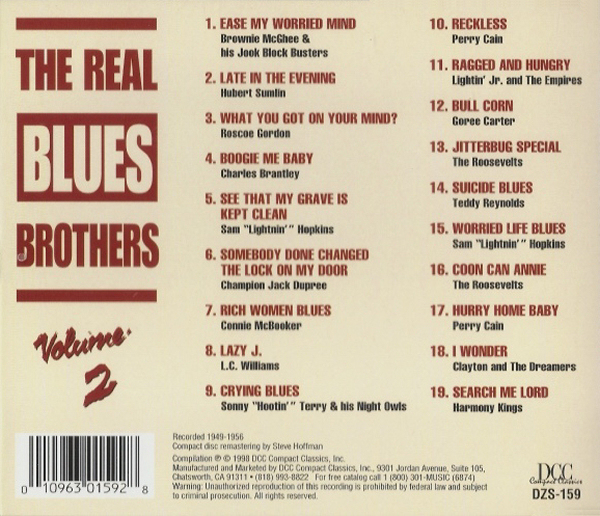 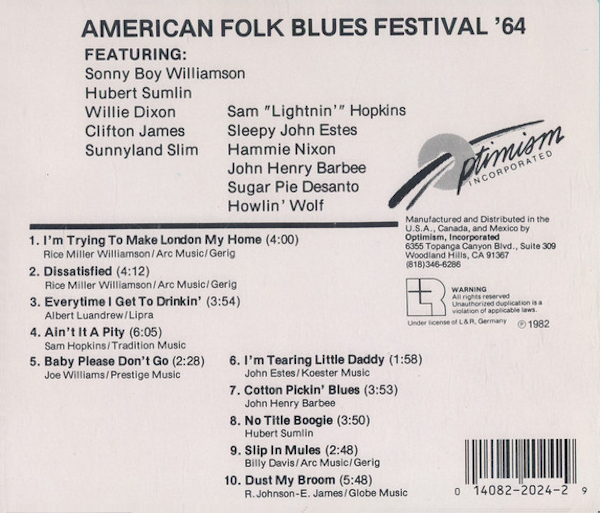 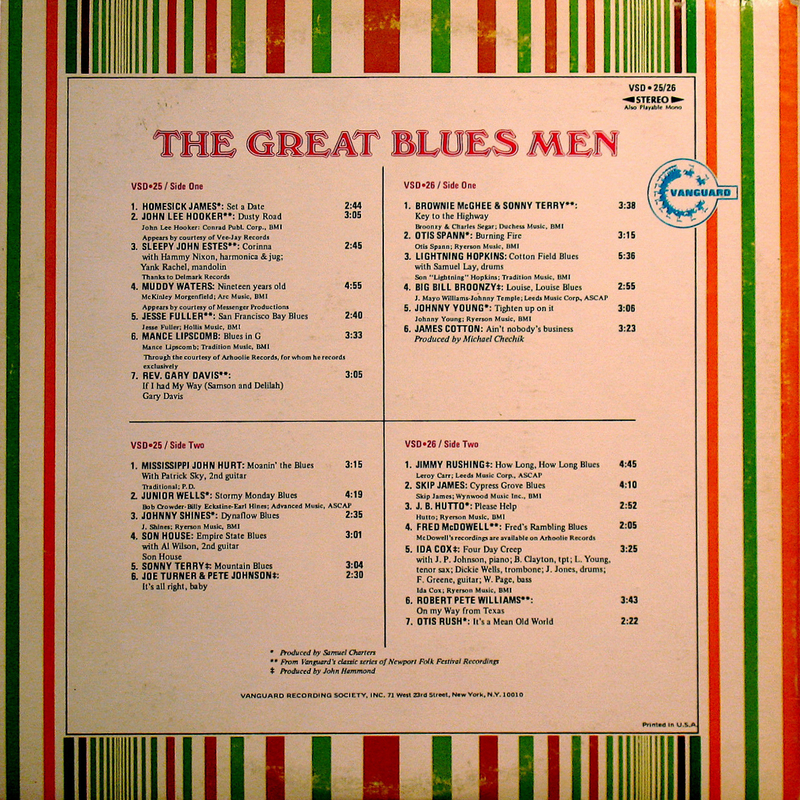 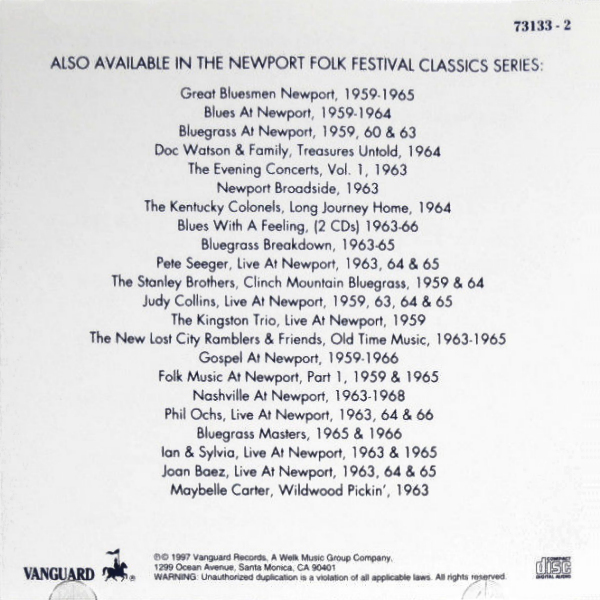 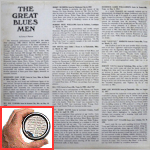 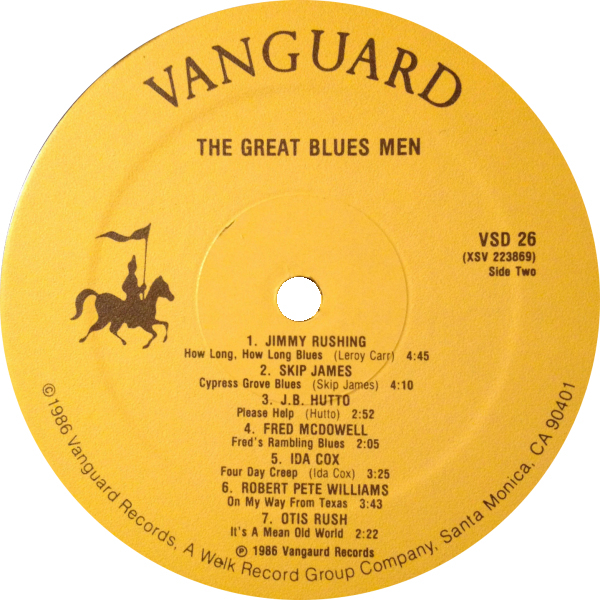 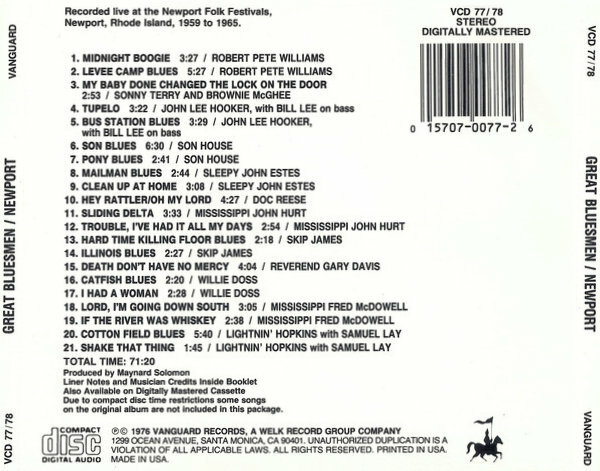 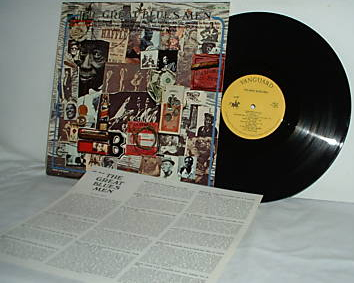 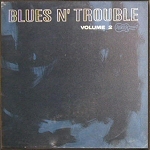 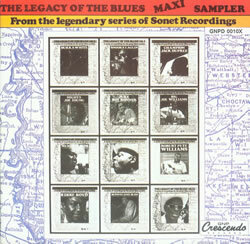 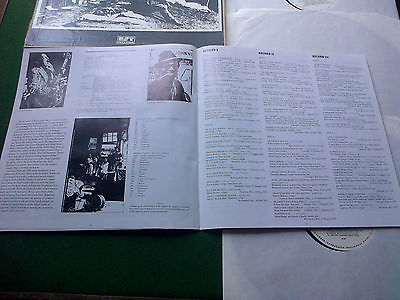 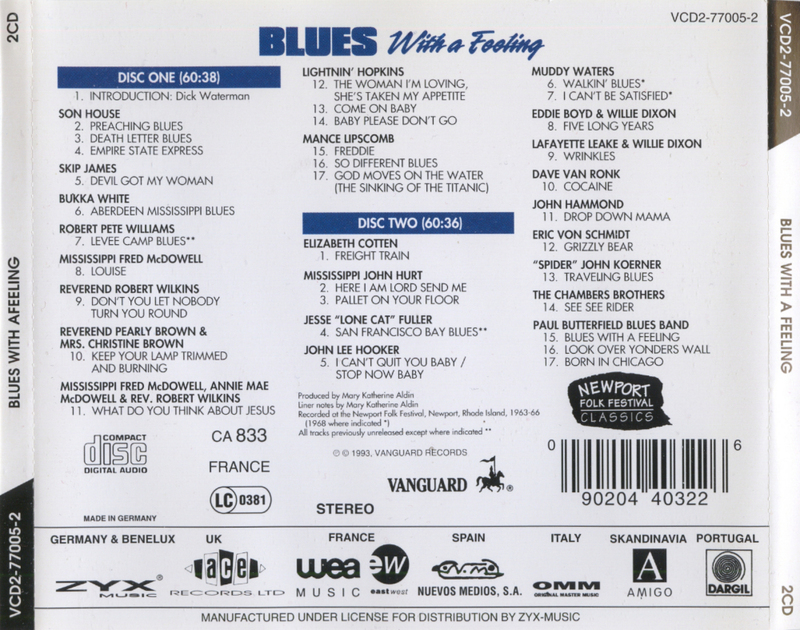 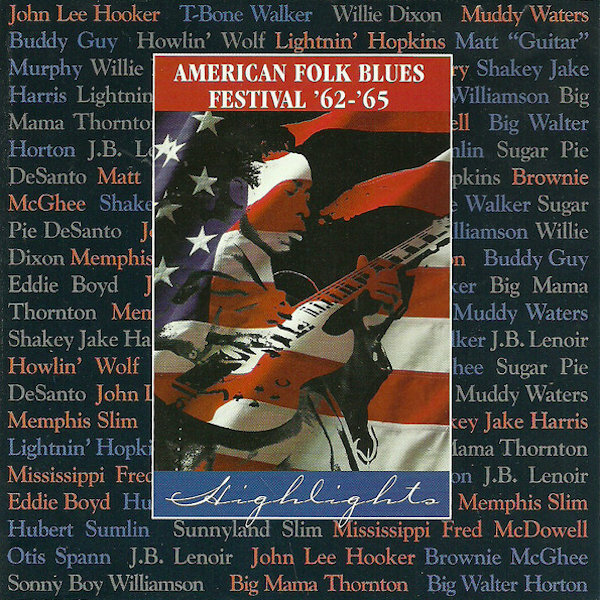 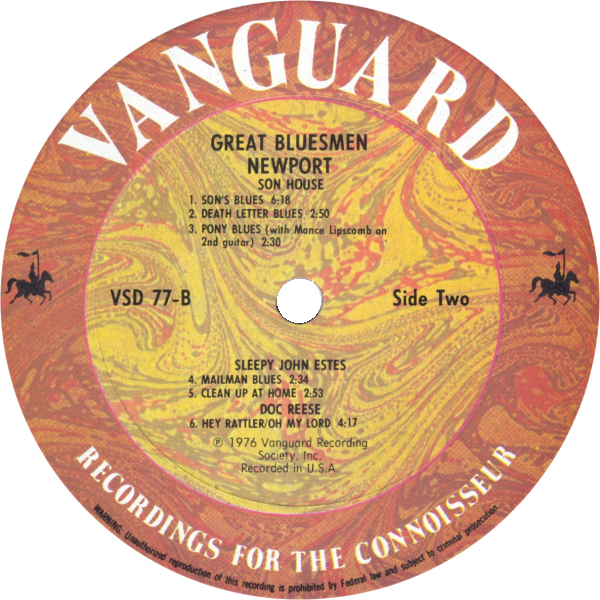 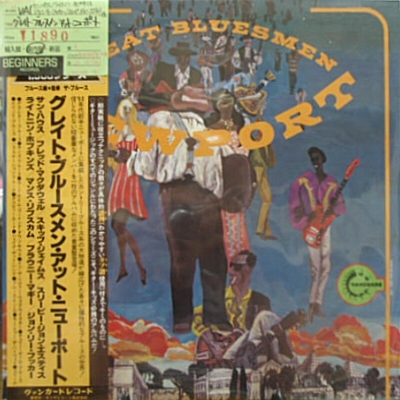 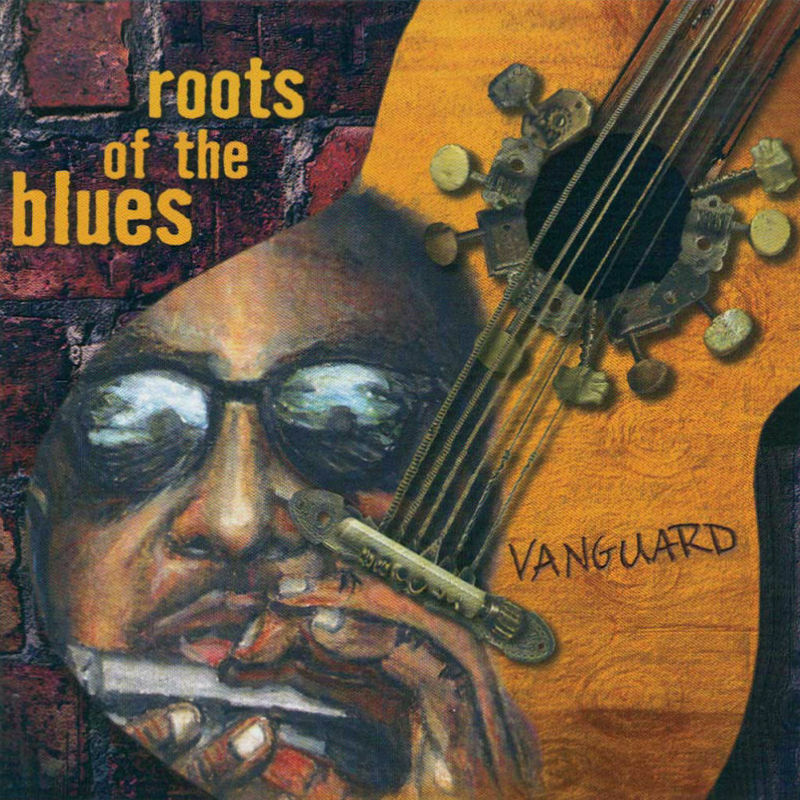 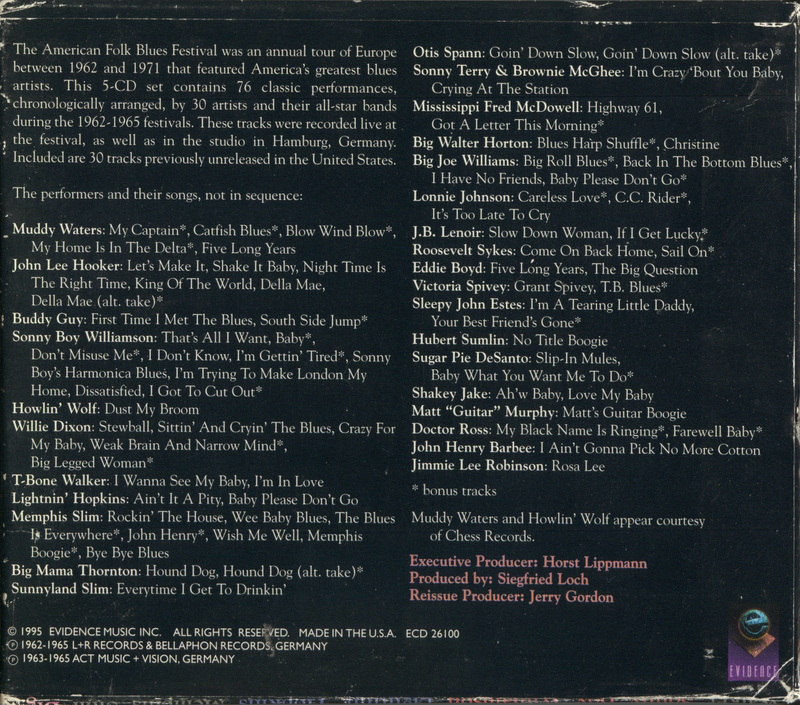 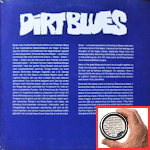 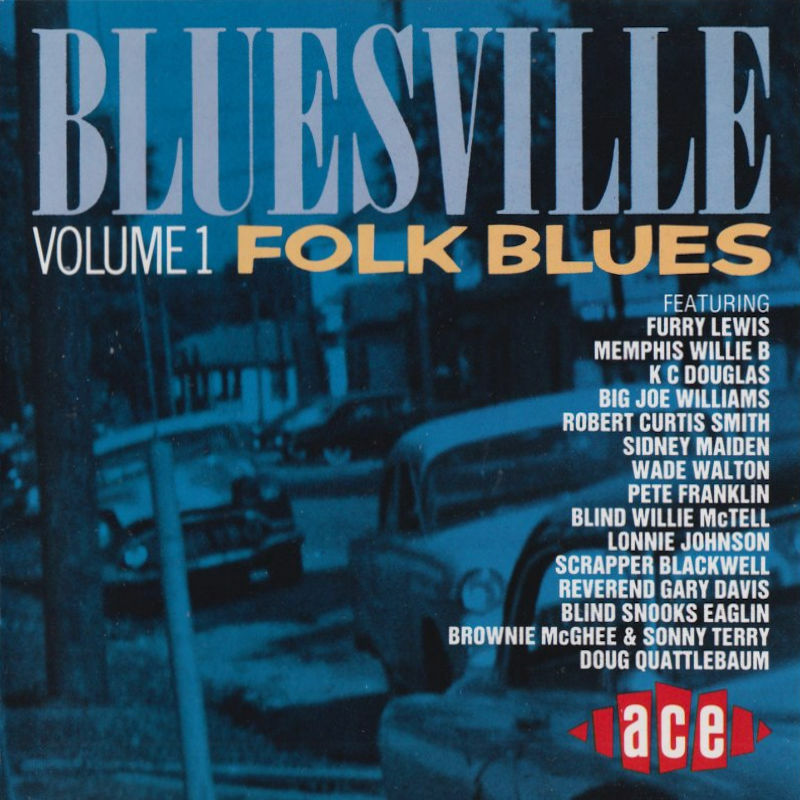 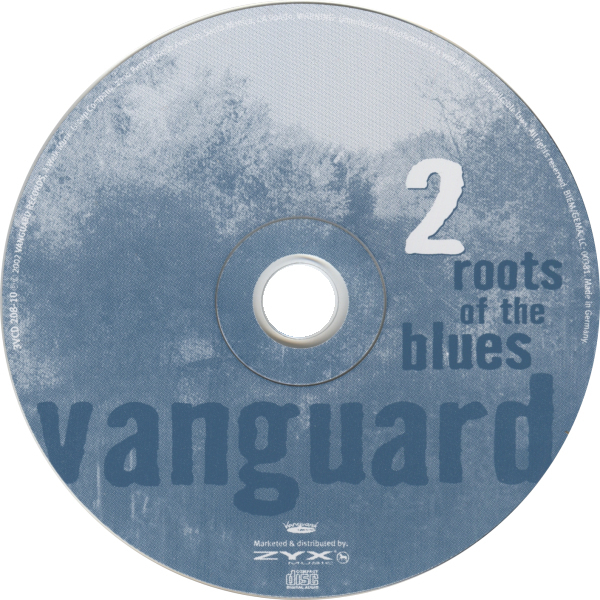 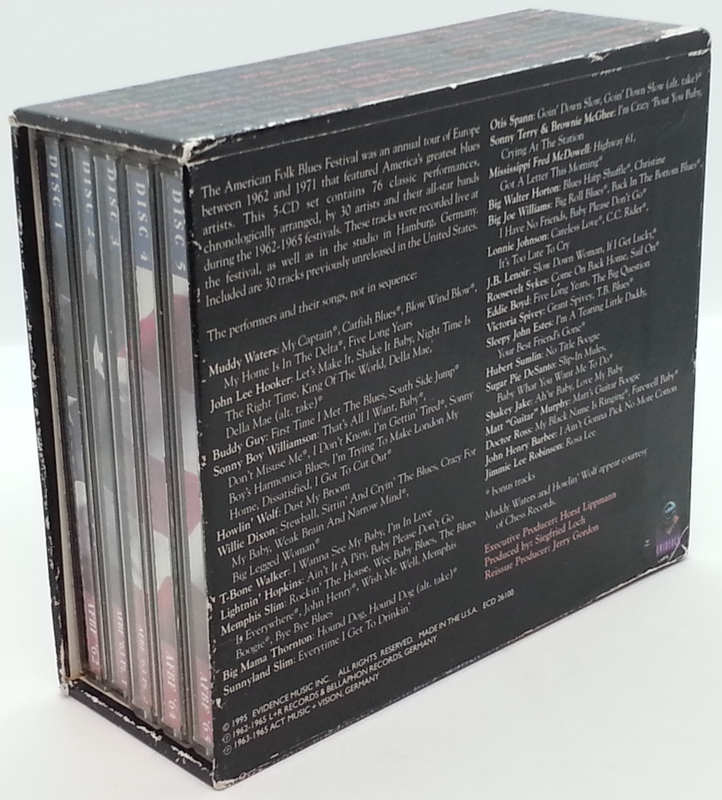 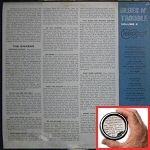 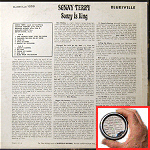 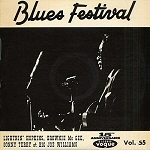 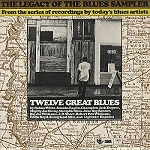 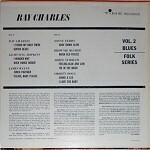 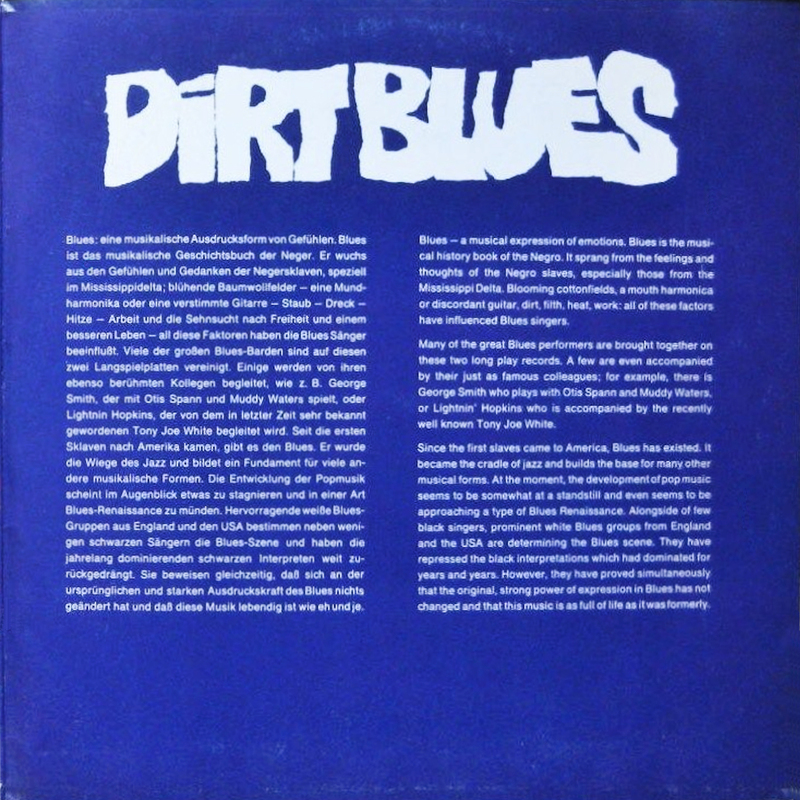 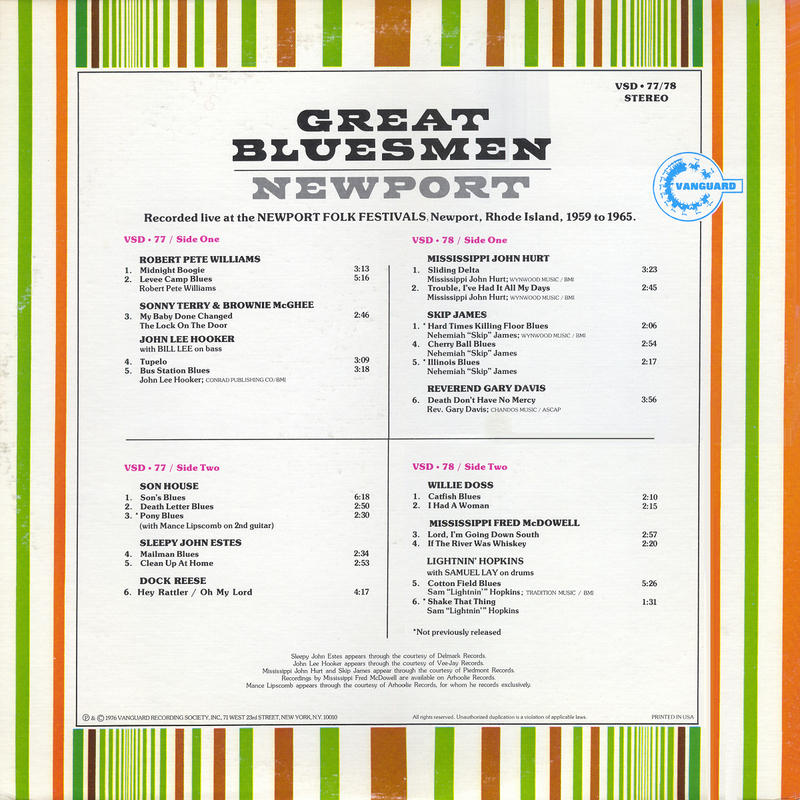 (=) Vanguard CD 77/78 (US 1989) (2 LPs on 1 CD) °° "Great Bluesmen At Newport 1959-1965"
39 1988 Bluesville Vol. 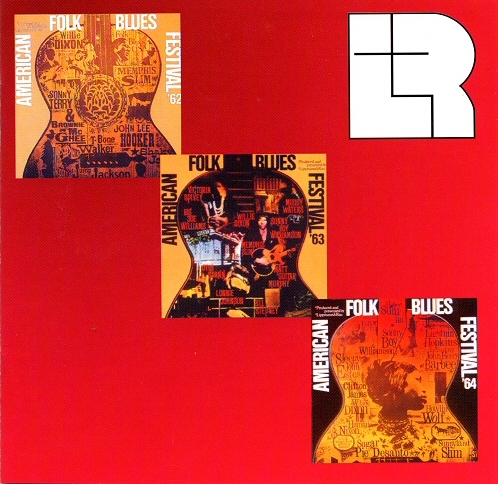 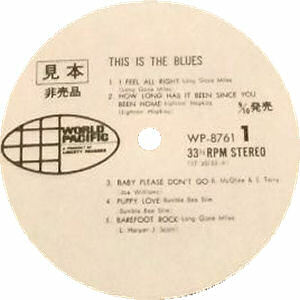 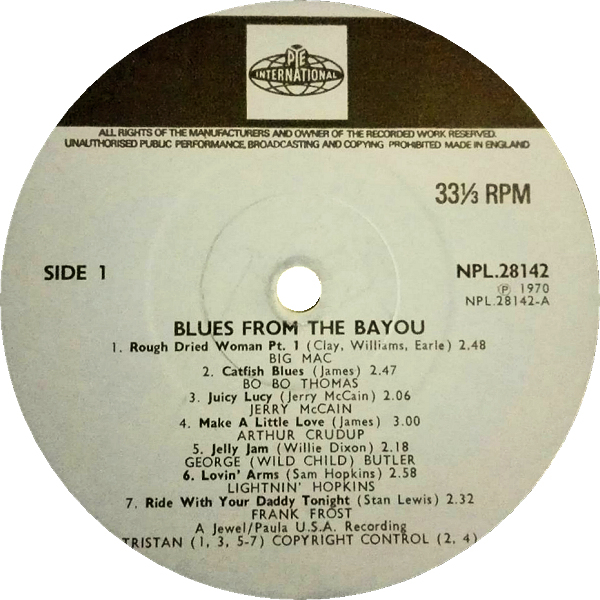 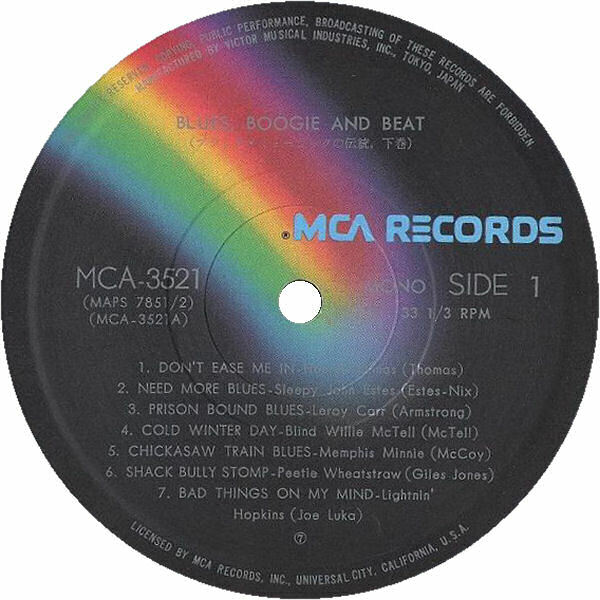 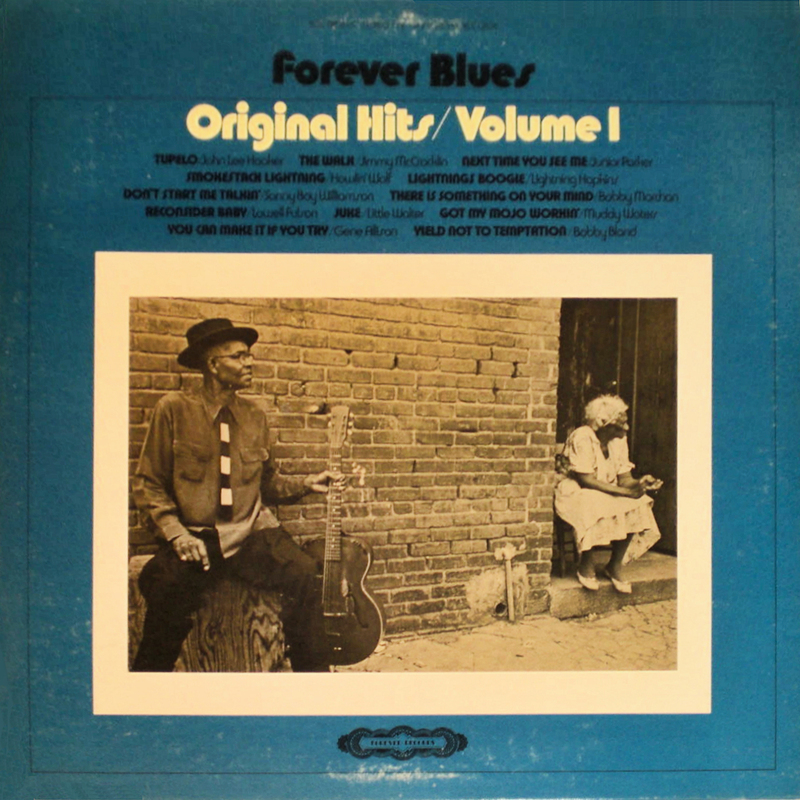 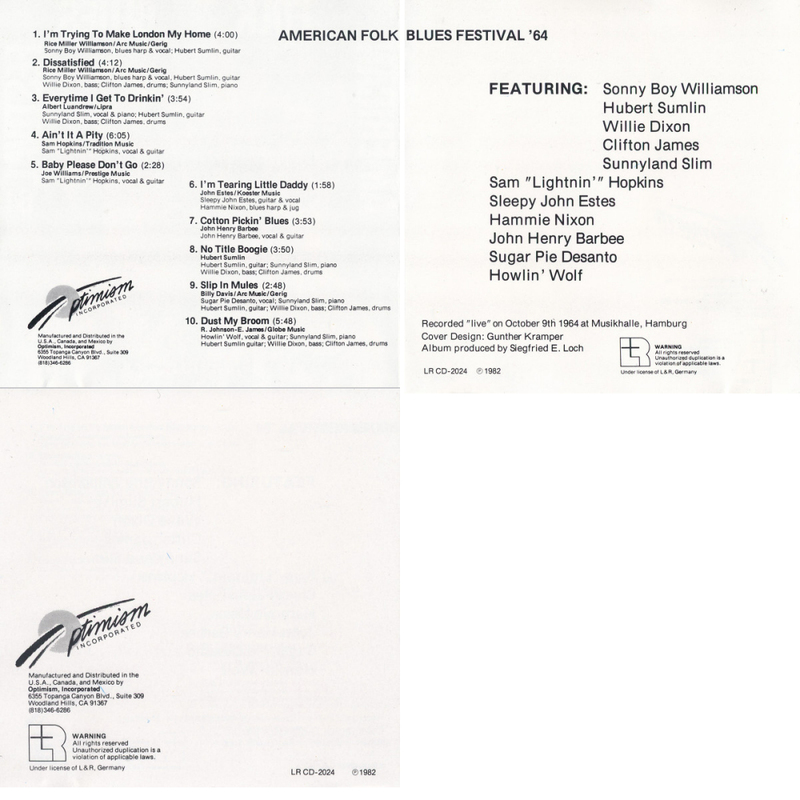 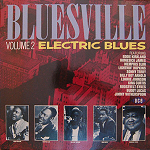 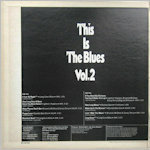 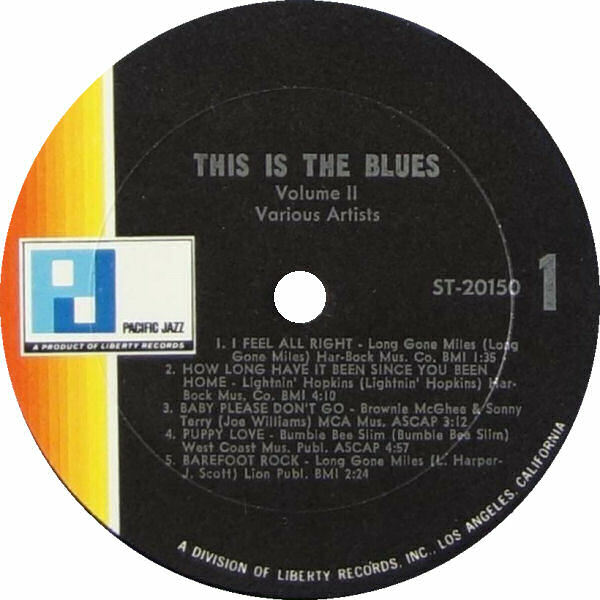 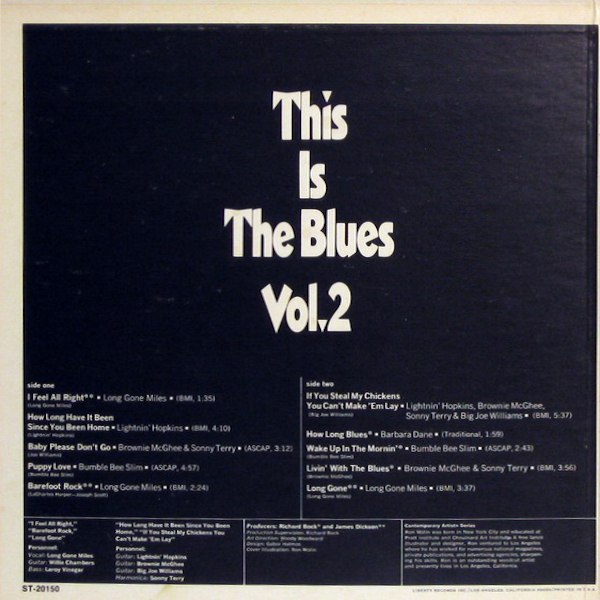 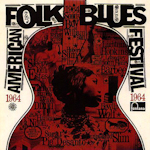 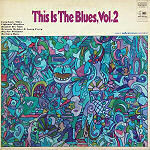 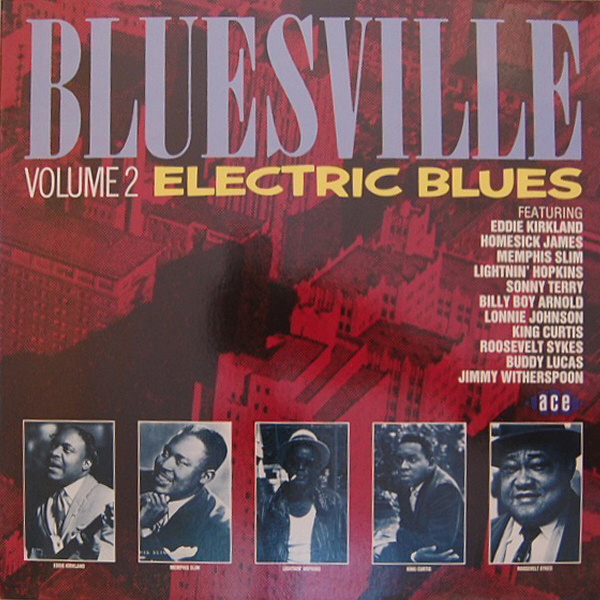 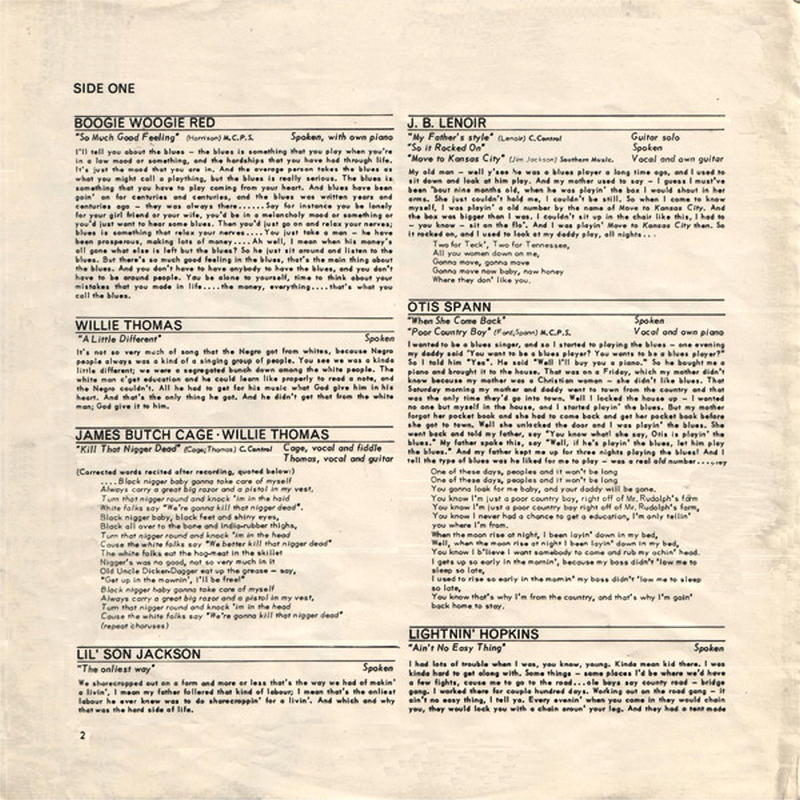 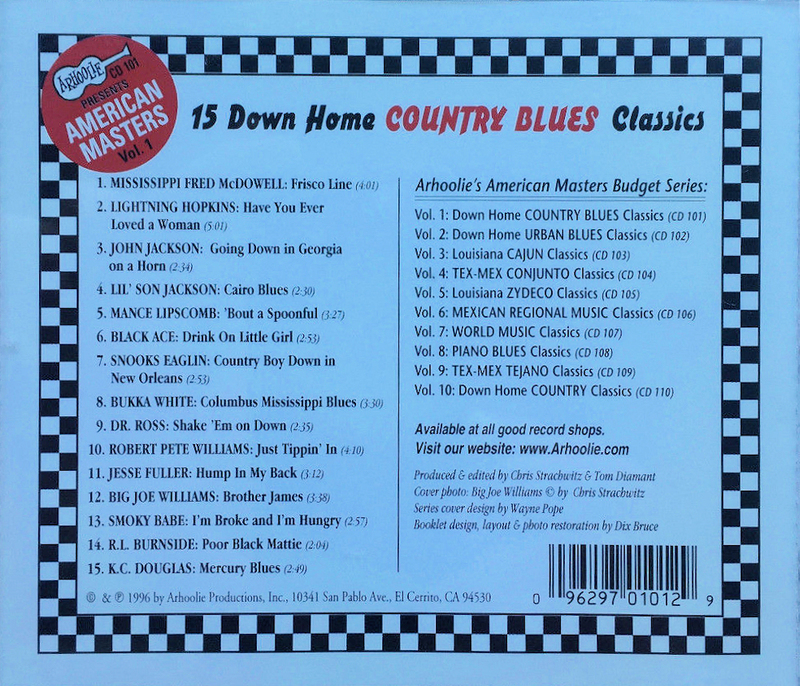 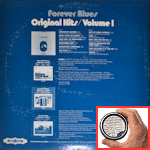 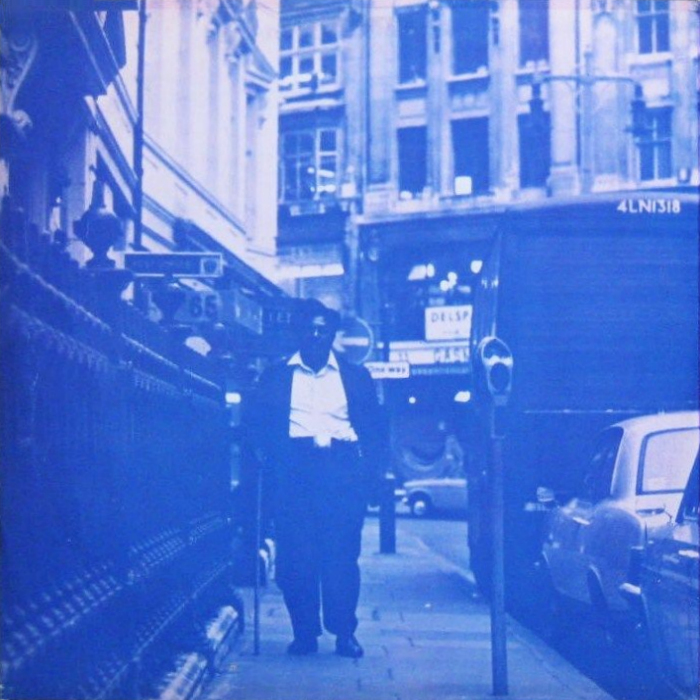 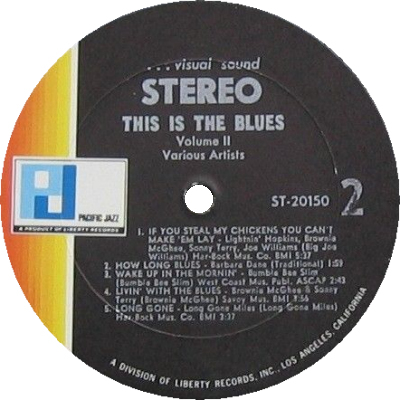 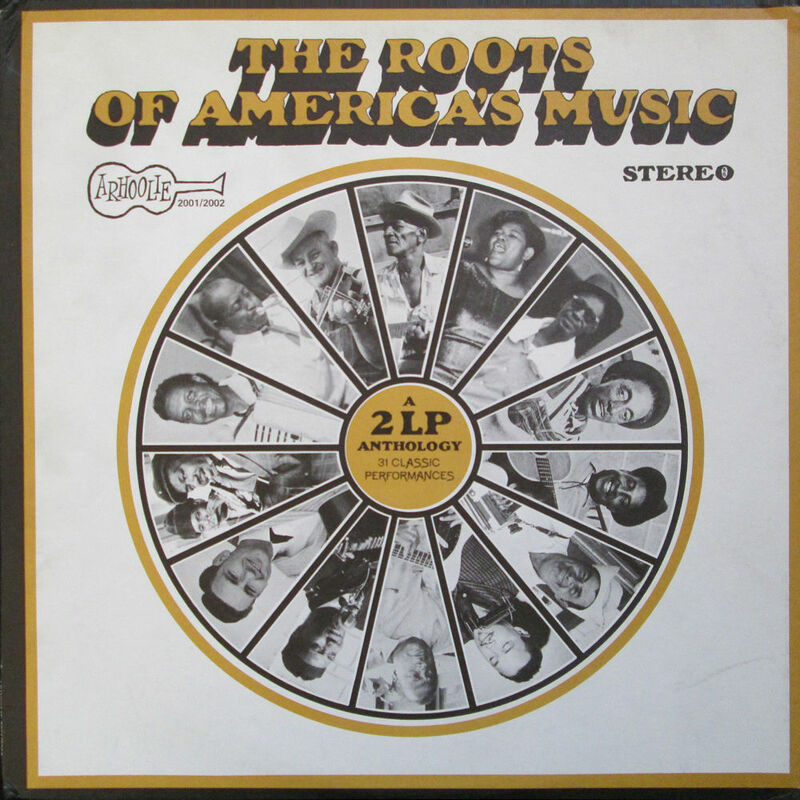 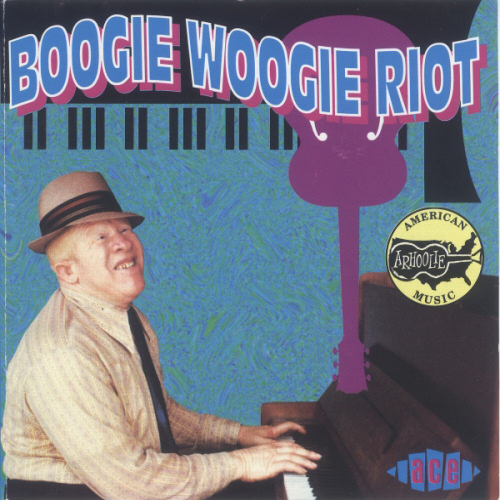 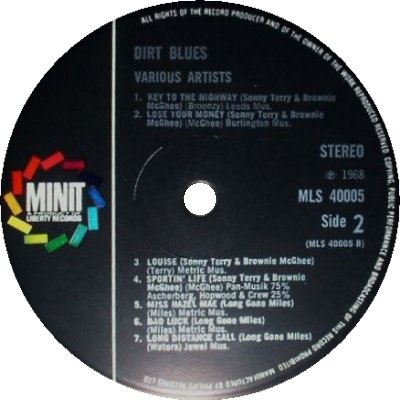 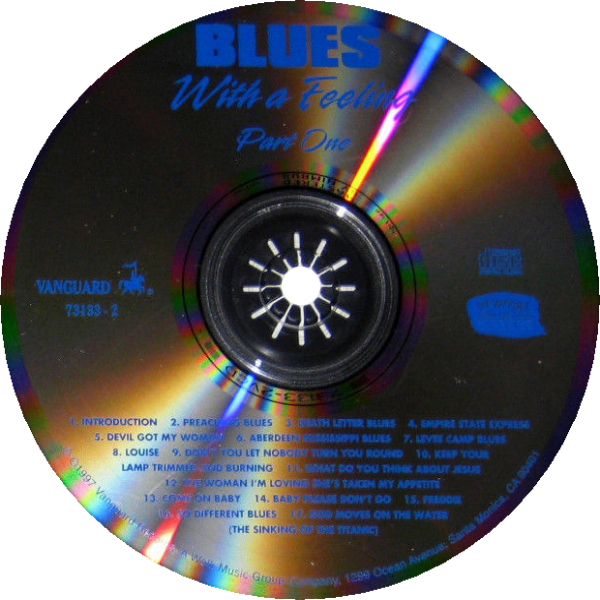 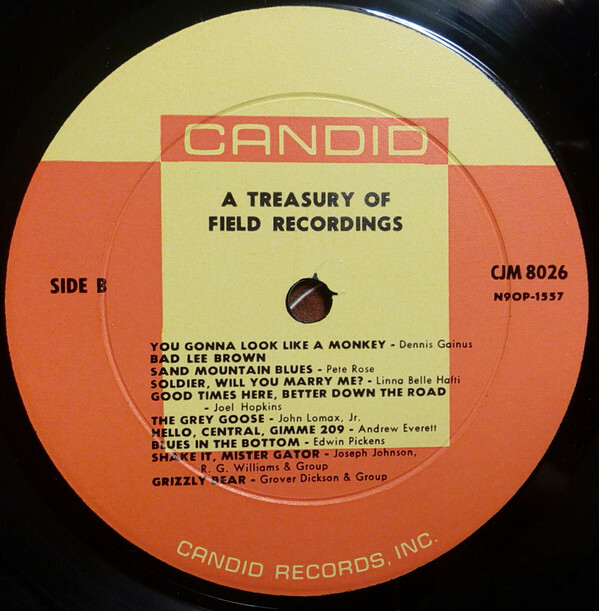 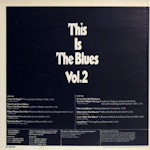 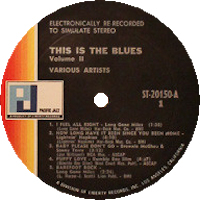 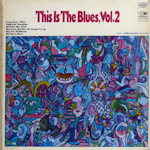 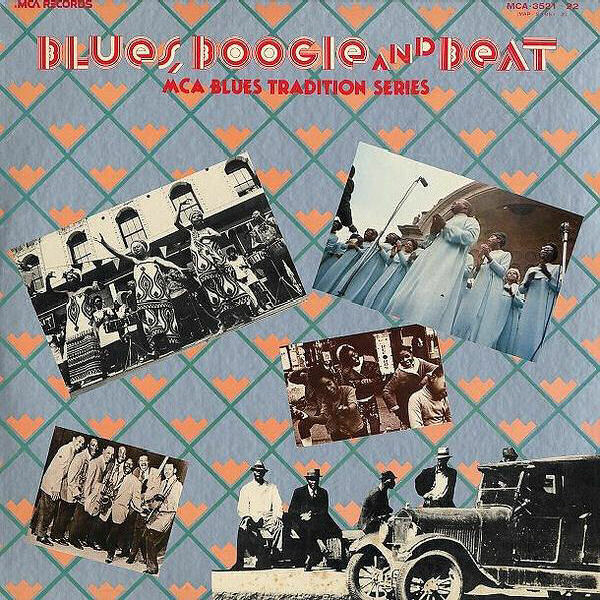 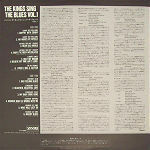 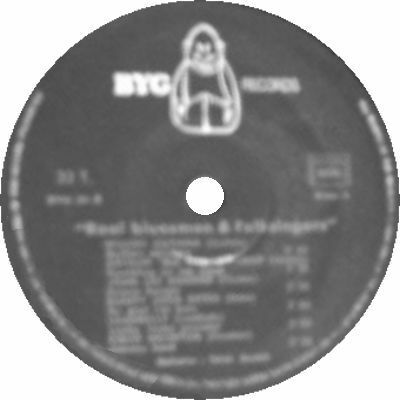 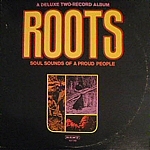 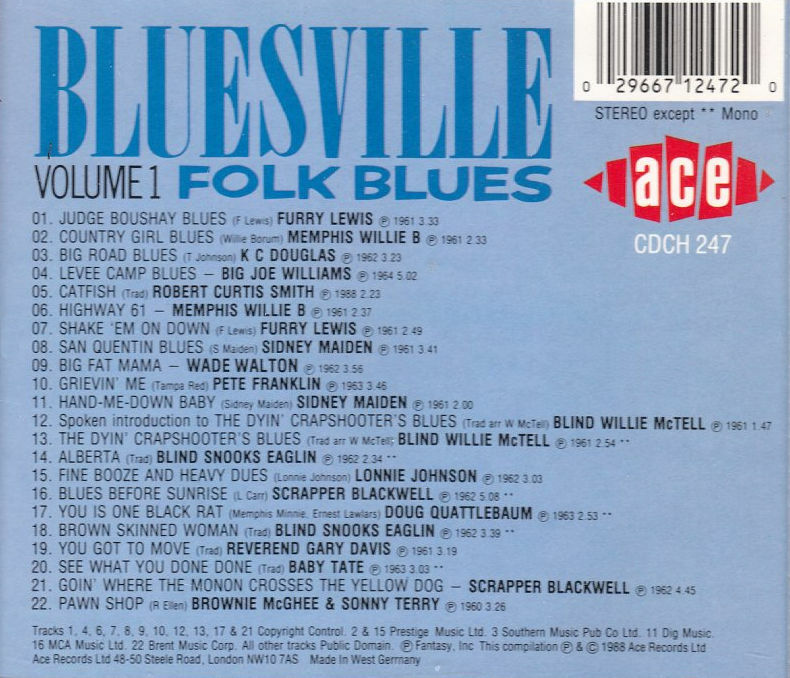 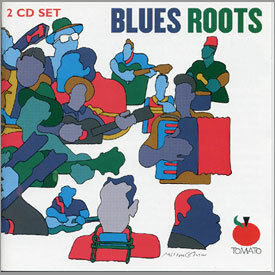 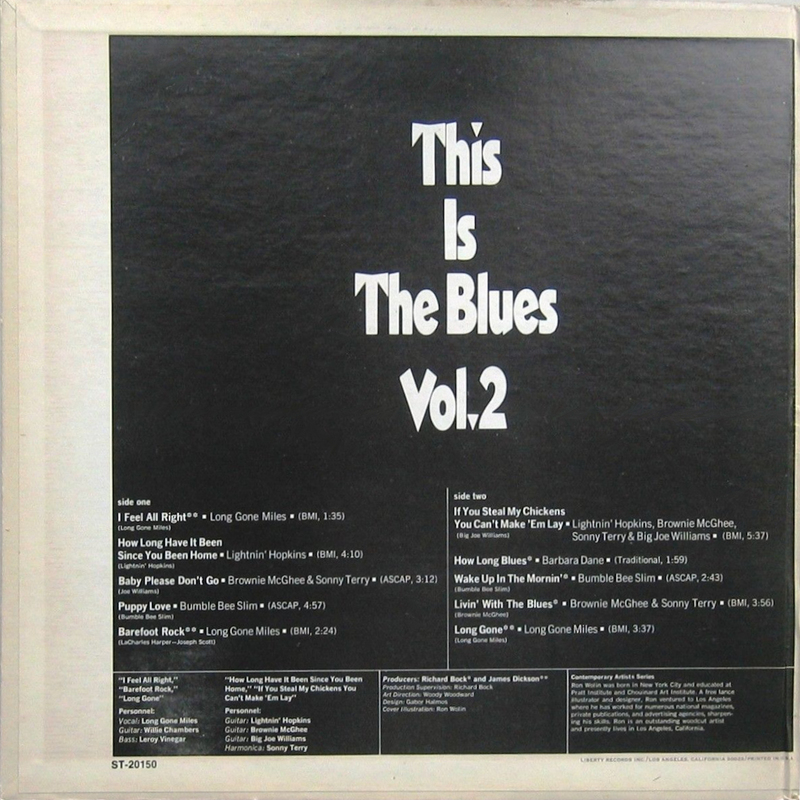 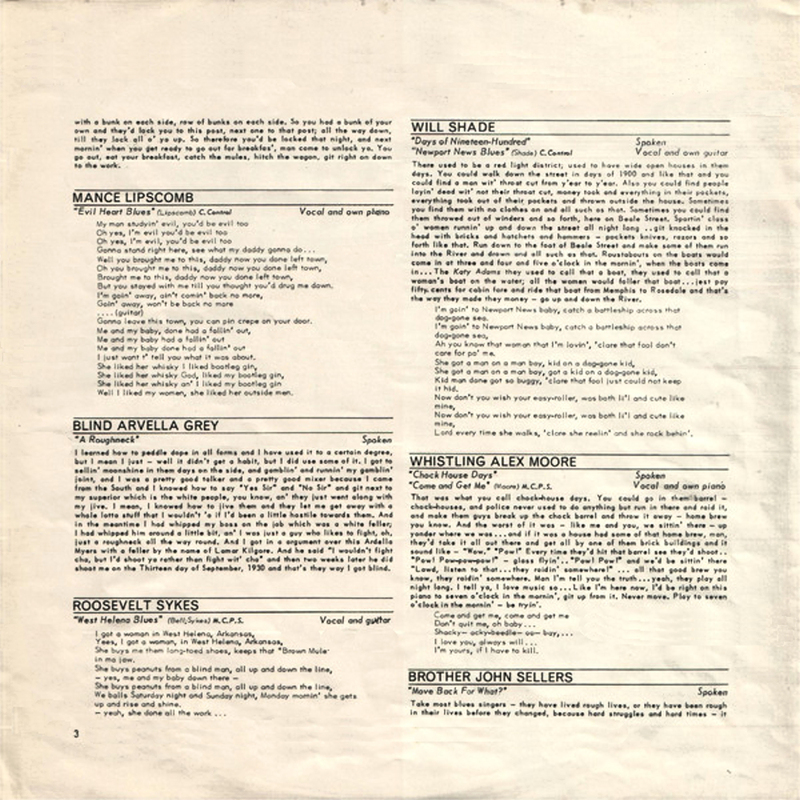 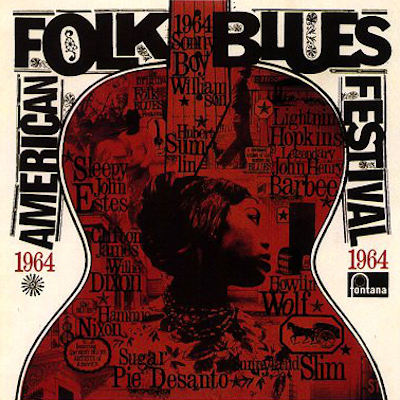 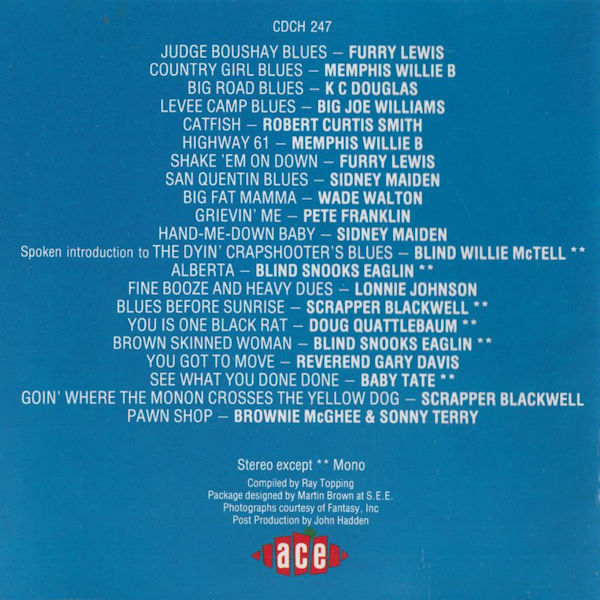 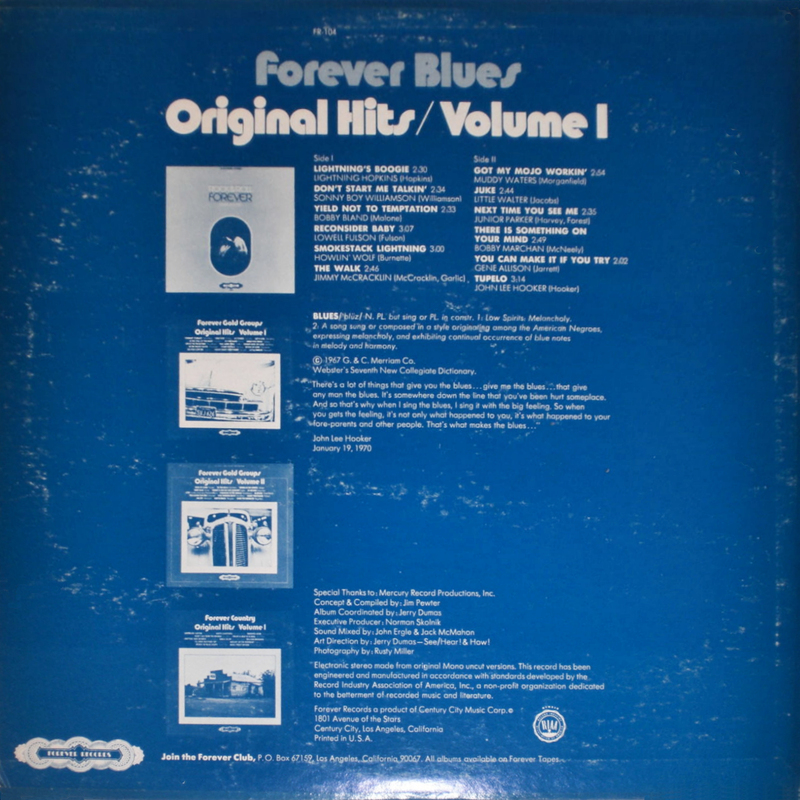 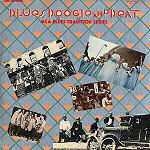 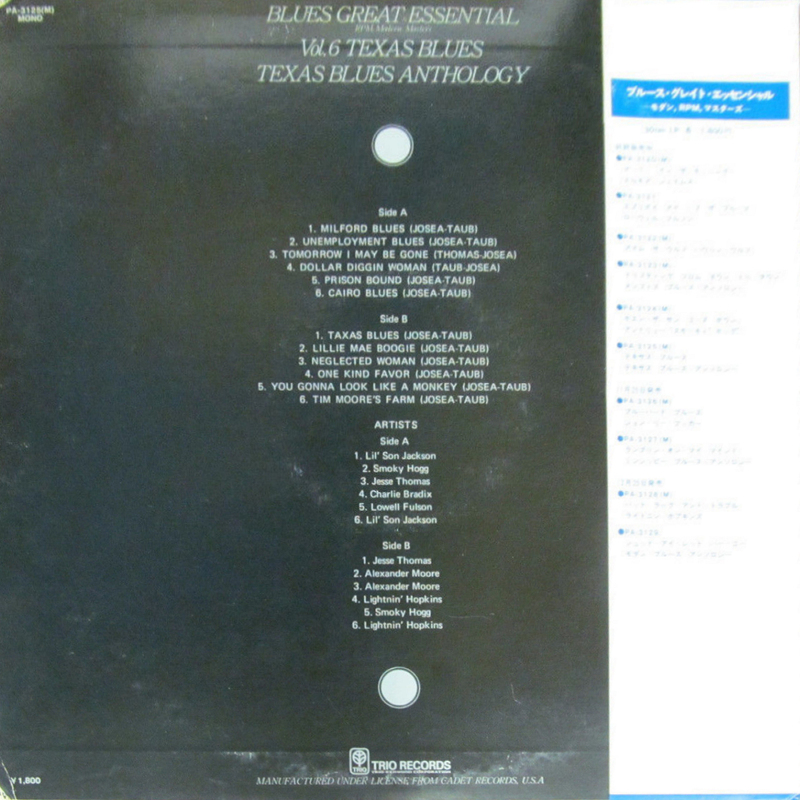 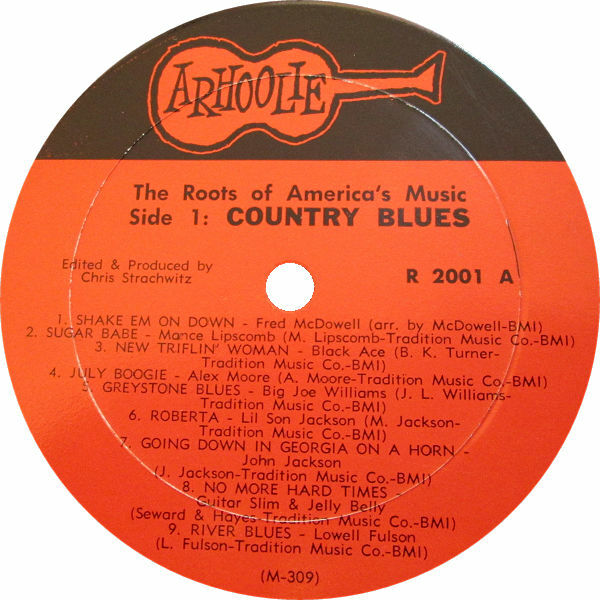 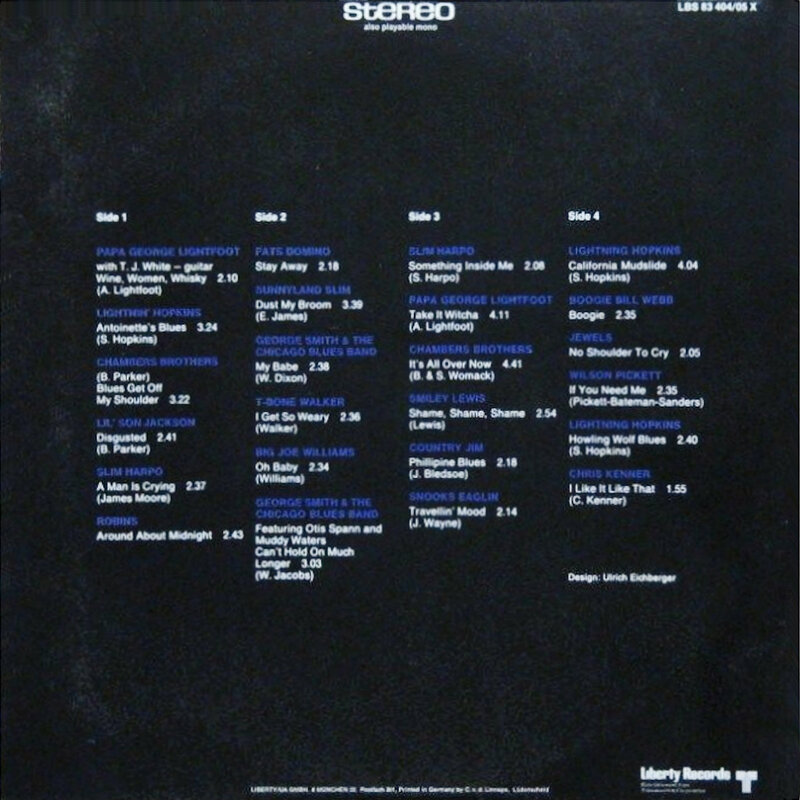 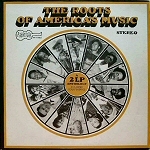 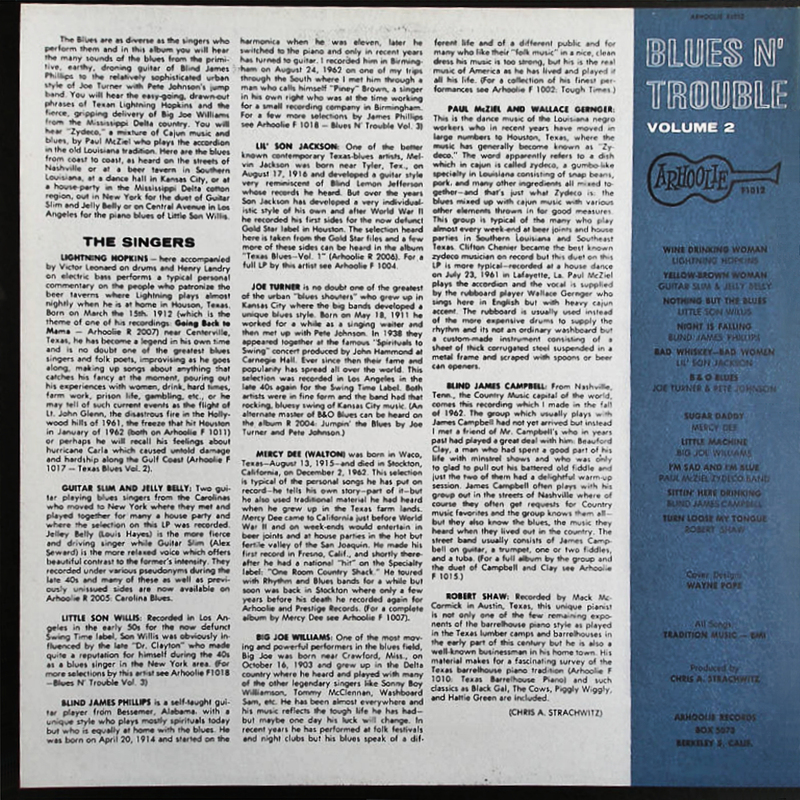 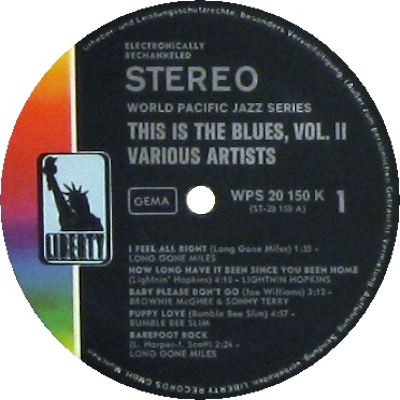 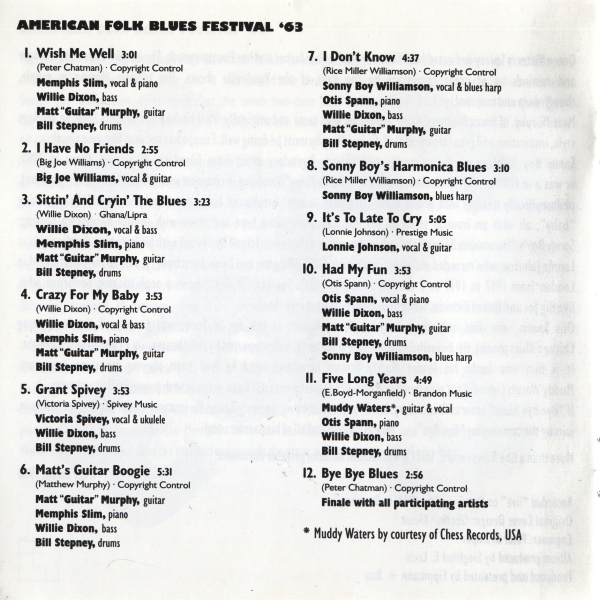 1 "Folk Blues"
40 1988 Bluesville Volume 2 "Electric Blues"
Rosco Gordon - What You Got On Your Mind? 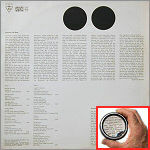 I.C. 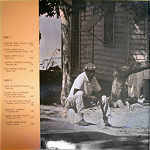 Williams - Lazy J. 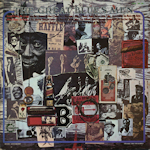 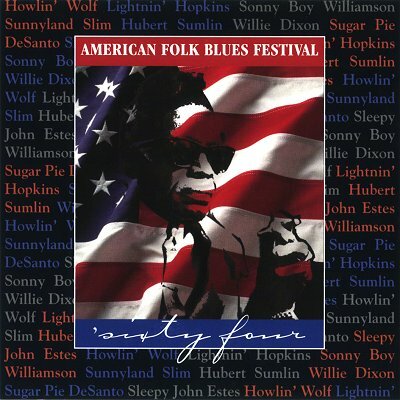 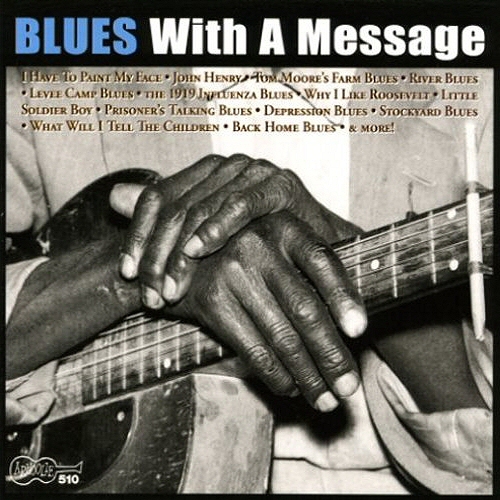 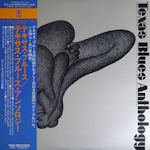 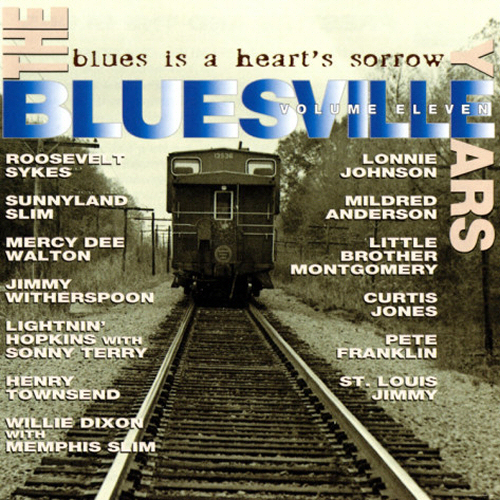 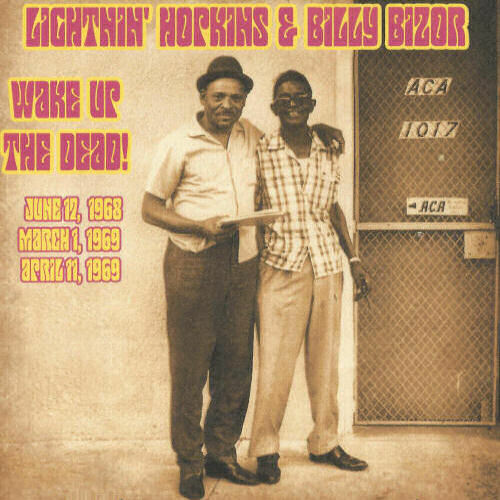 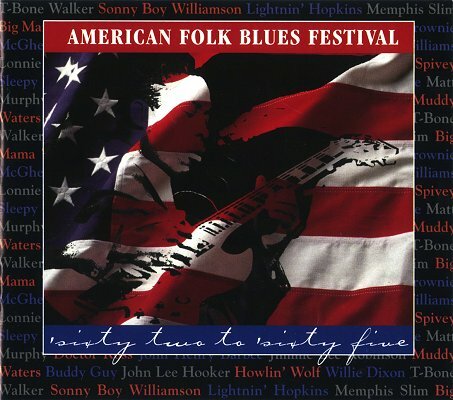 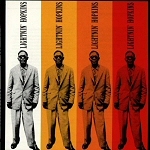 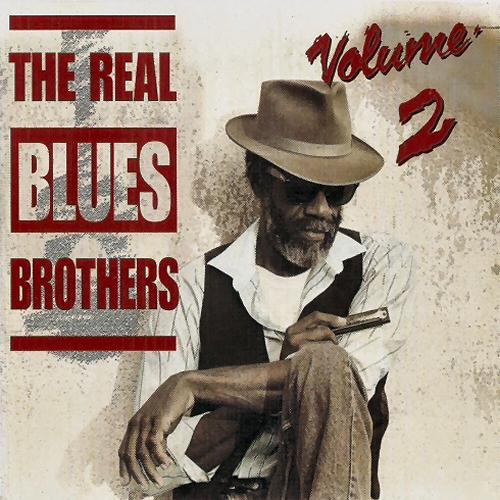 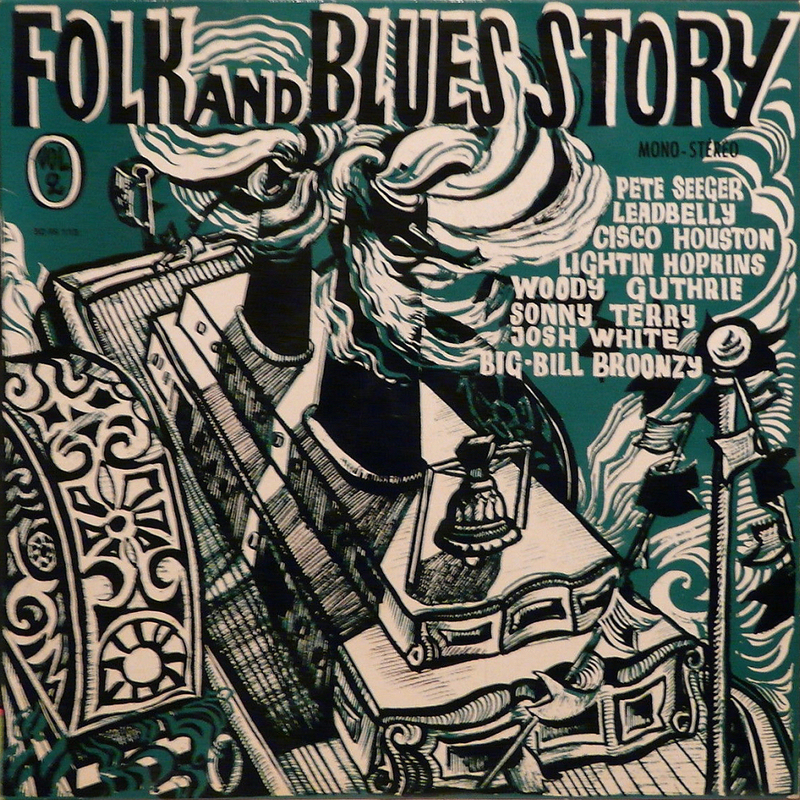 "Blues is A Heart's Sorrow"
58 2015 Lightnin' Hopkins & Billy Bizor: Wake Up The Dead! 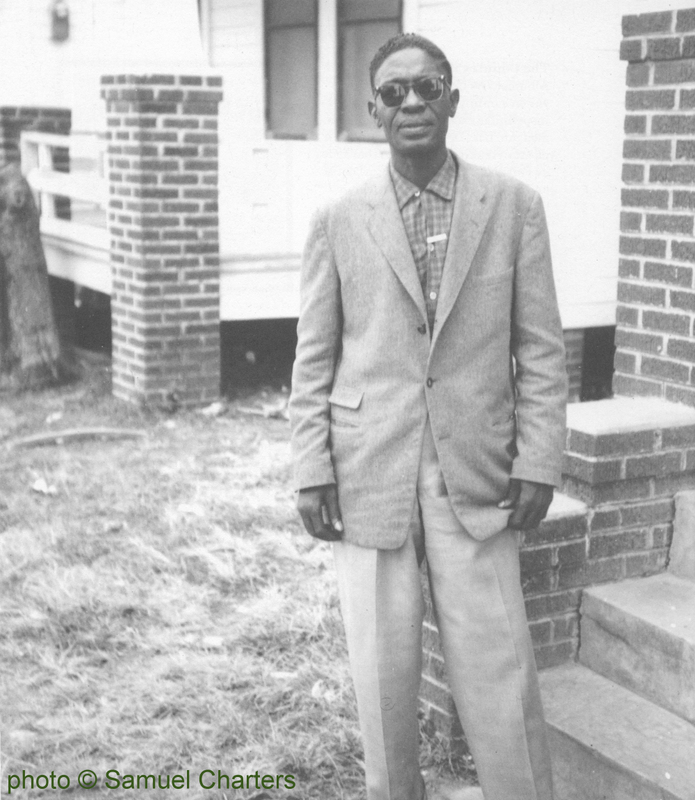 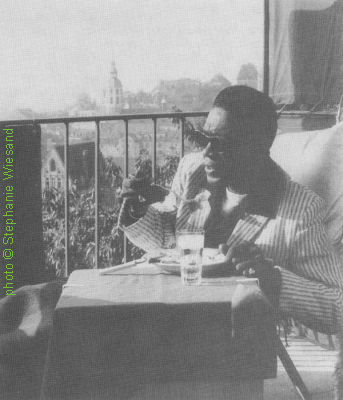 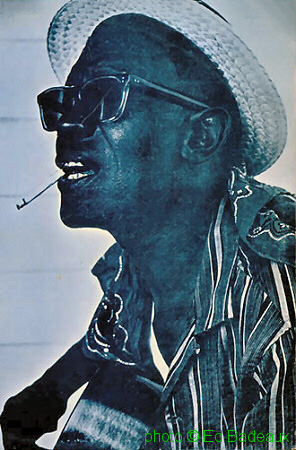 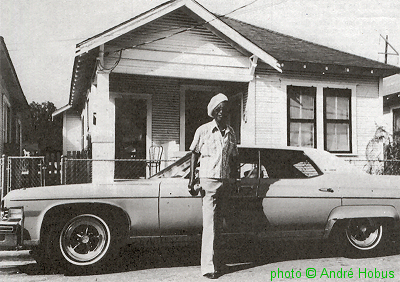 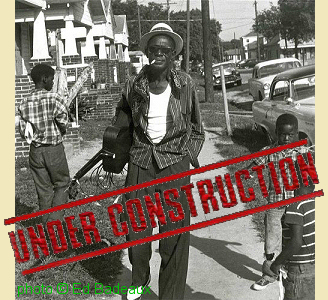 Photo used for the front cover of Folkways LP FS 3822 (US 1959) "Lightnin' Hopkins"
Lightnin' Hopkins with his "automobile"
It has been suggested that this is "most likely a Buick LeSabre or Electra 225, Its a 72-74"
source: Back cover of Arhoolie LP F 1011 "Lightnin' Sam Hopkins"